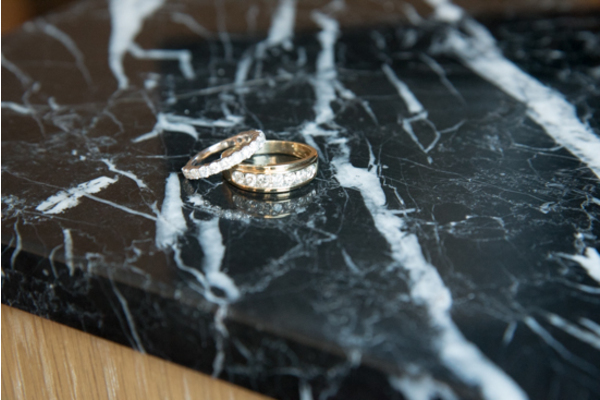 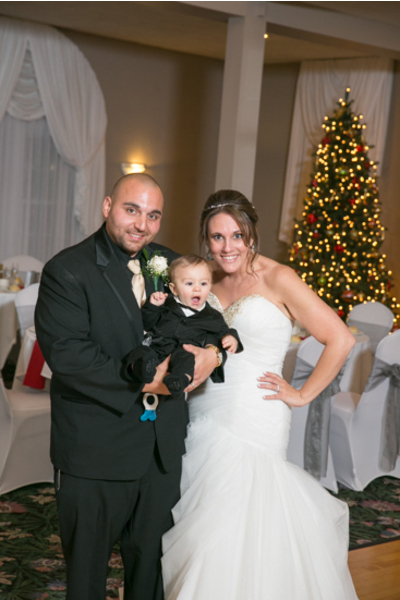 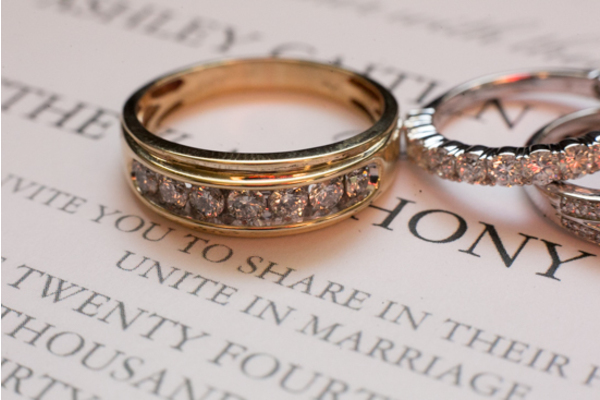 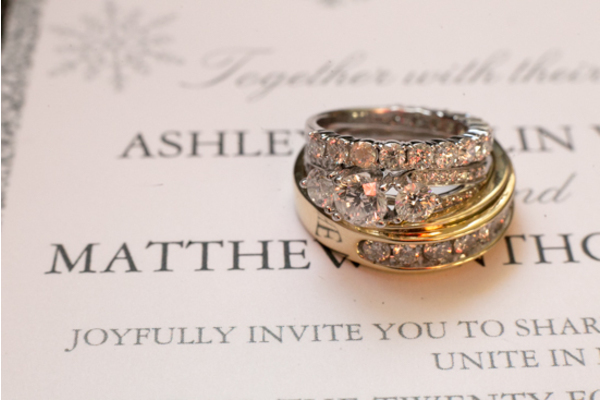 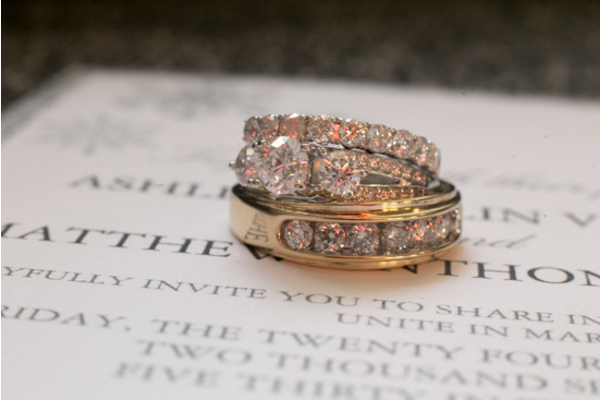 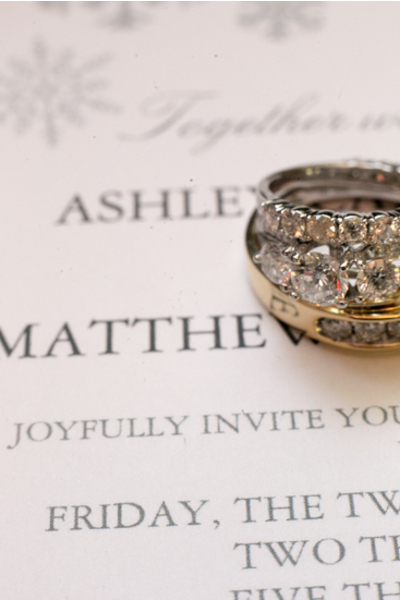 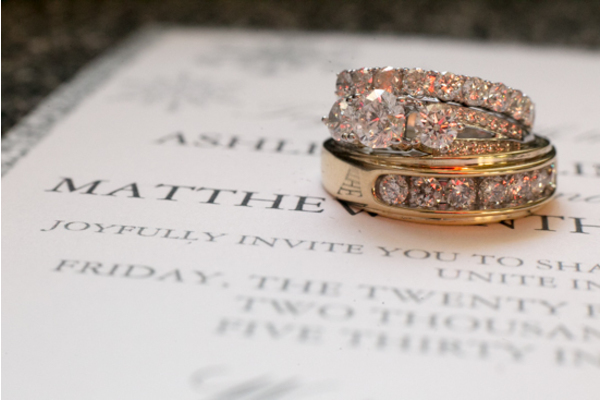 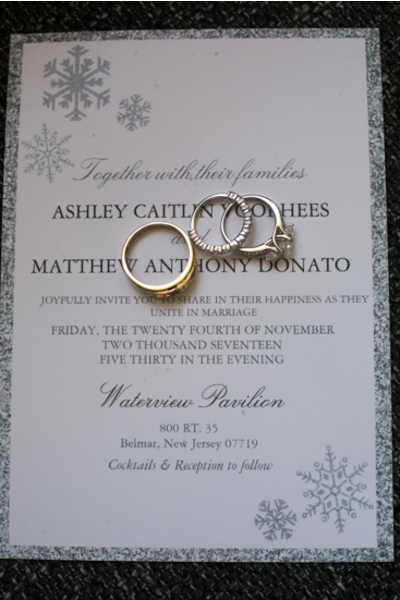 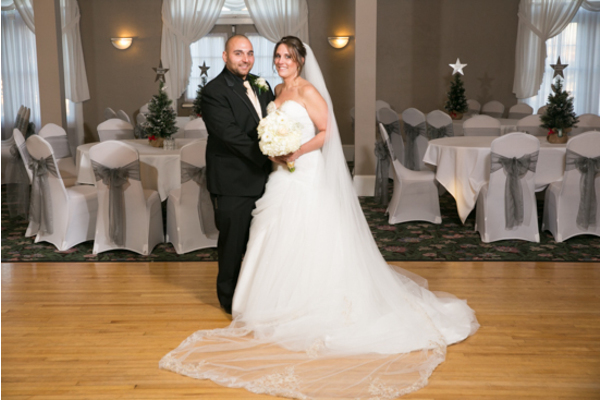 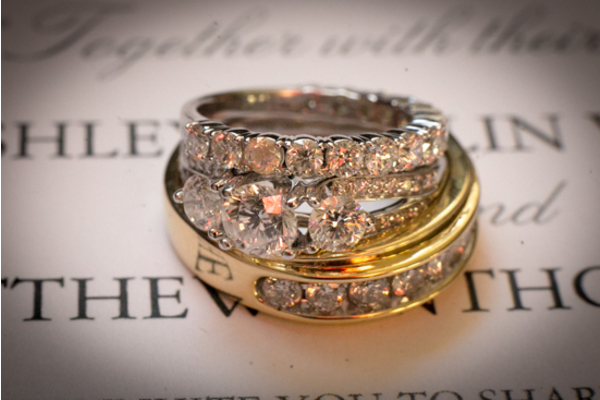 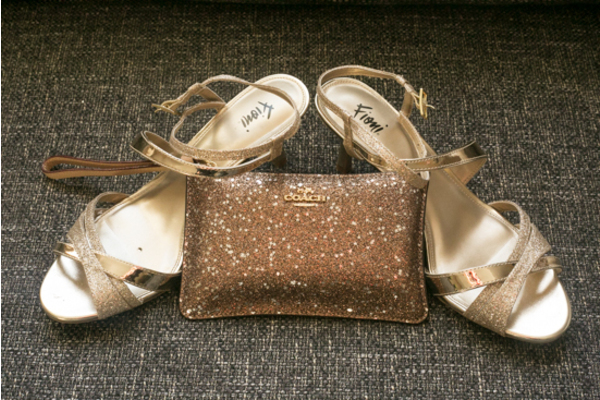 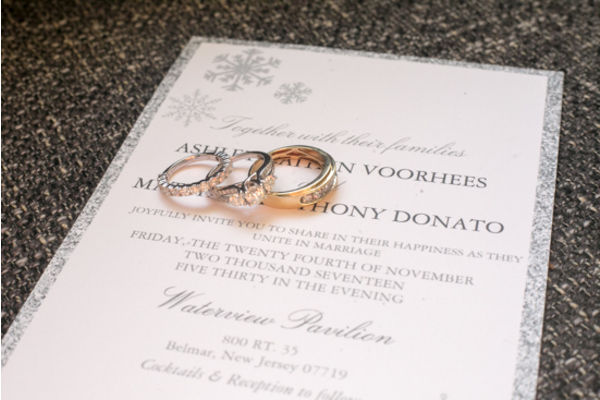 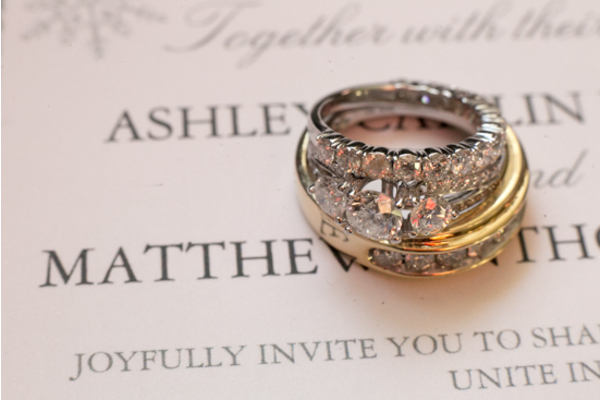 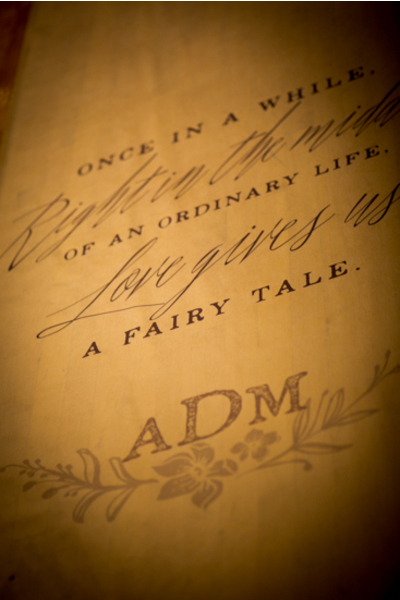 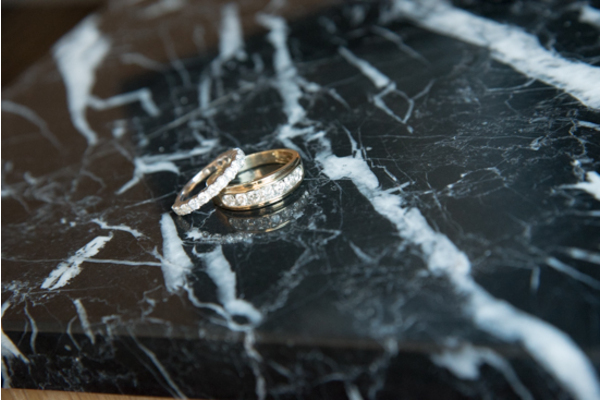 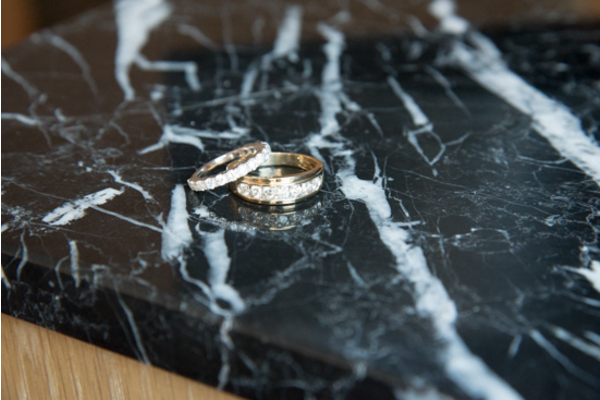 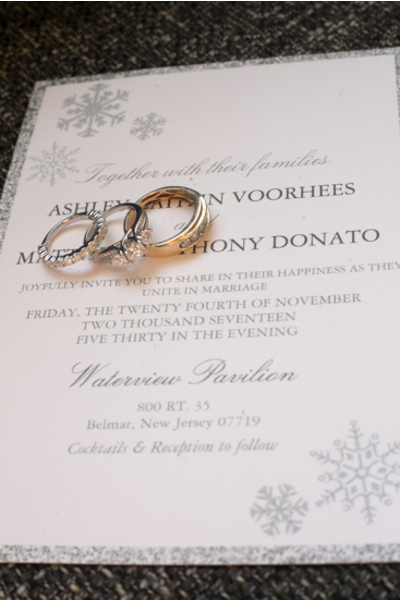 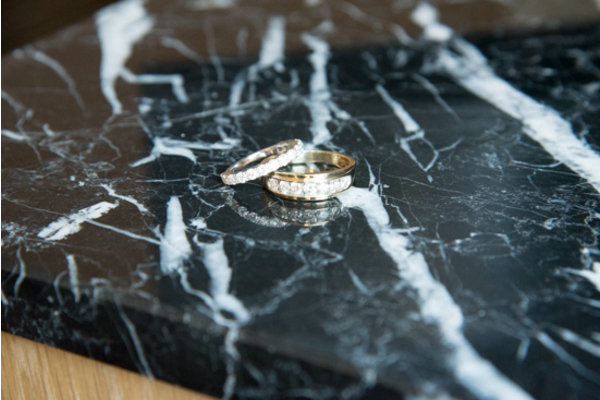 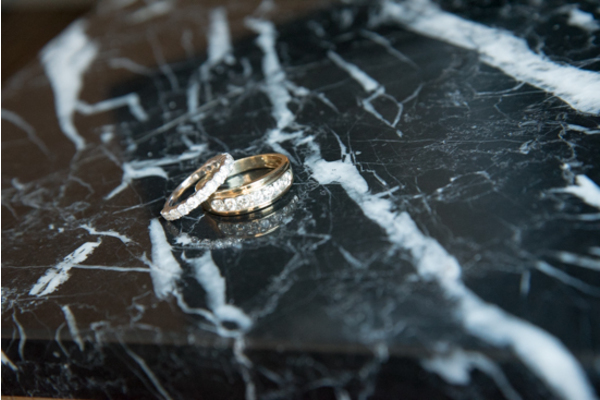 Congratulations to Ashley and Matt in celebrating their marriage this past holiday season! 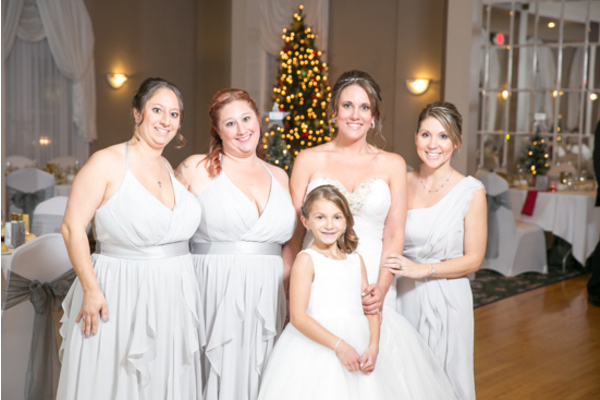 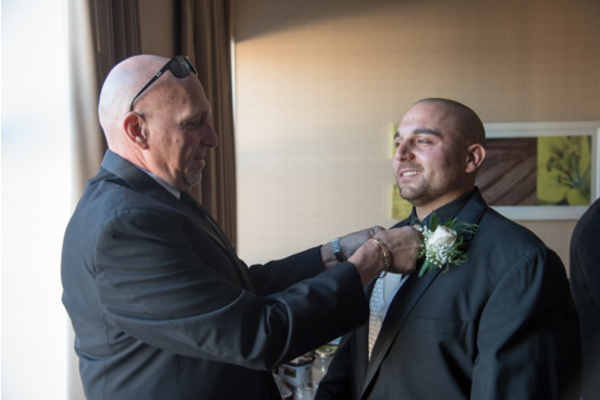 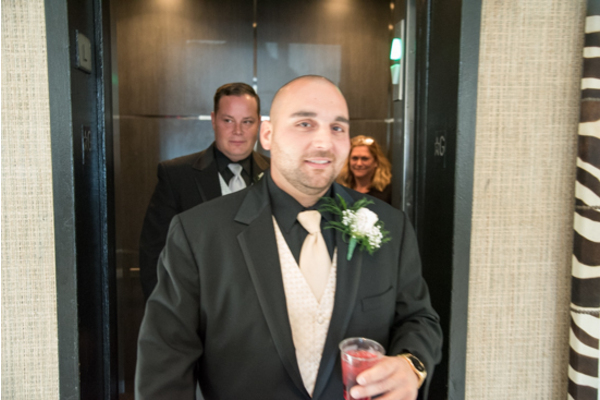 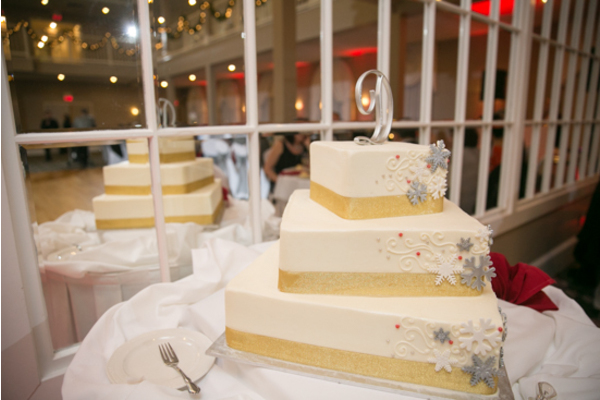 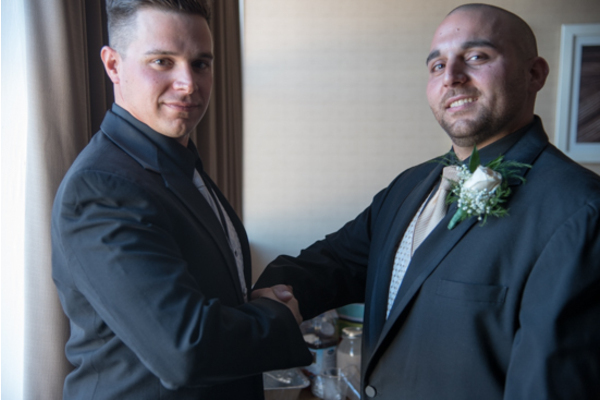 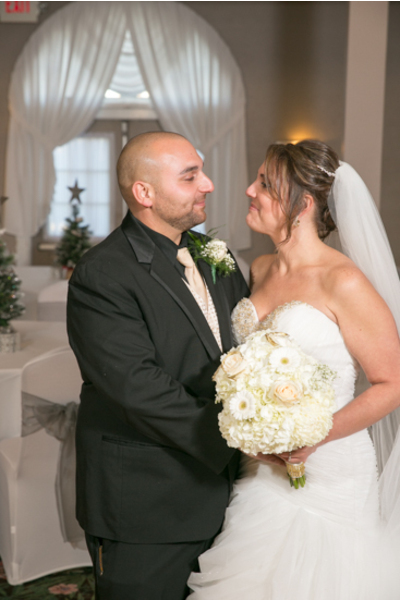 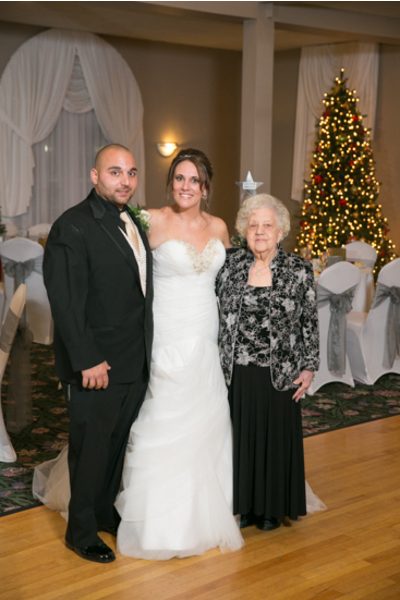 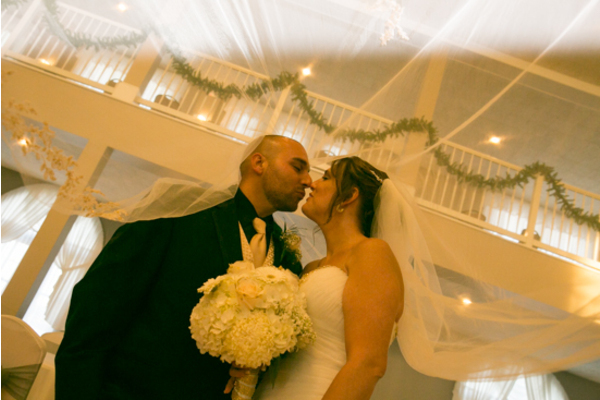 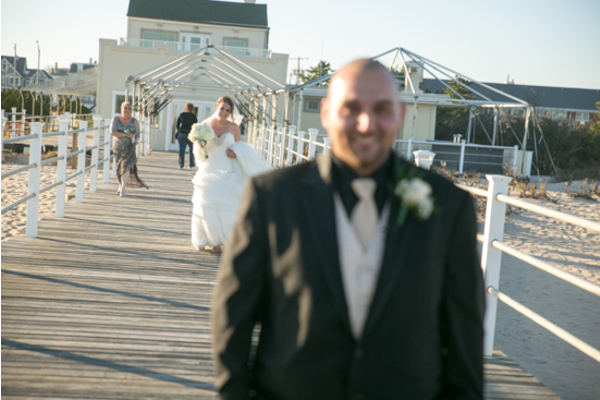 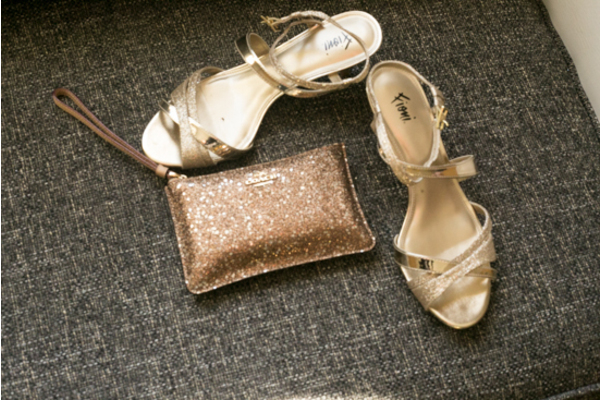 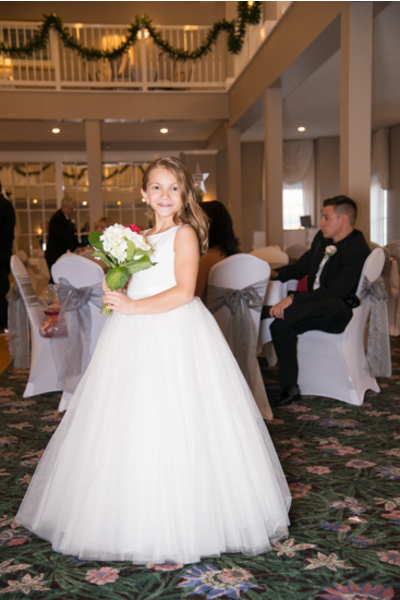 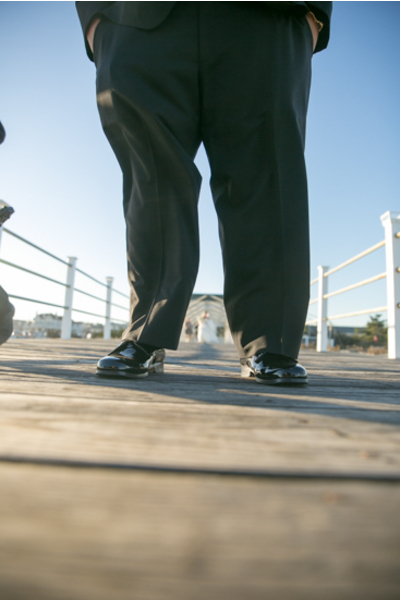 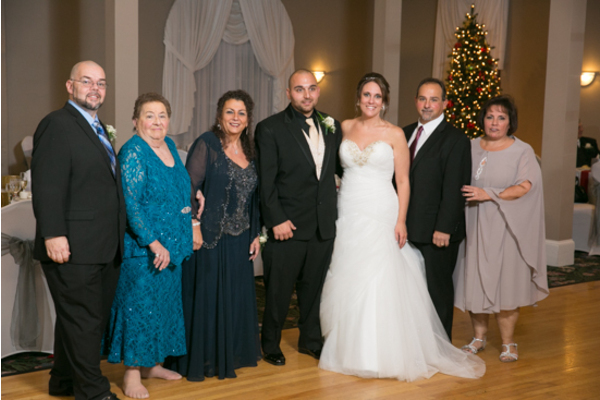 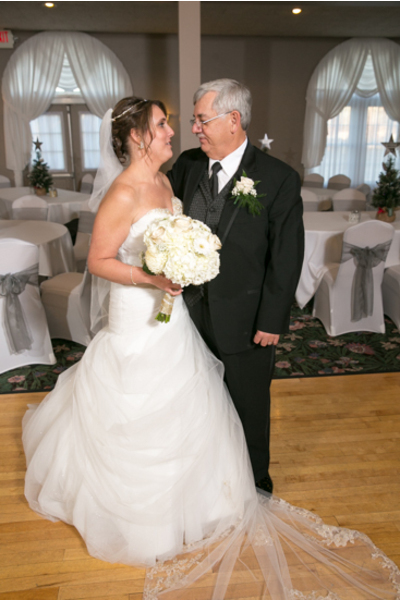 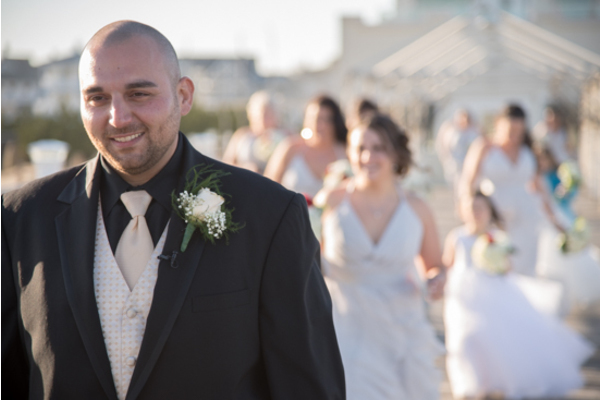 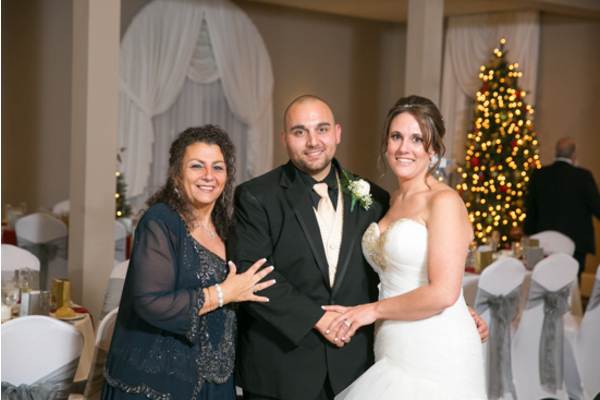 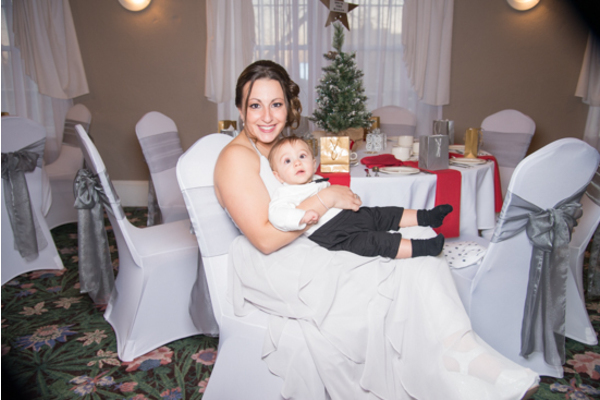 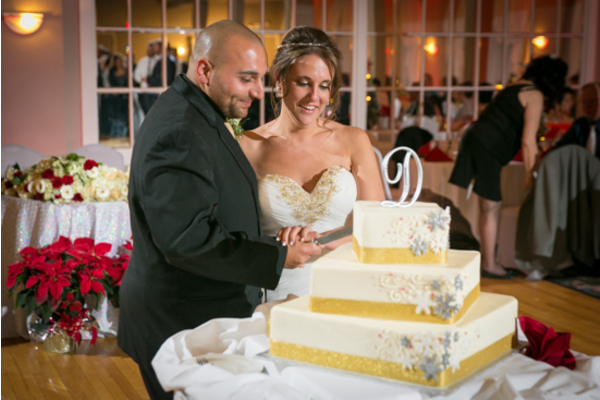 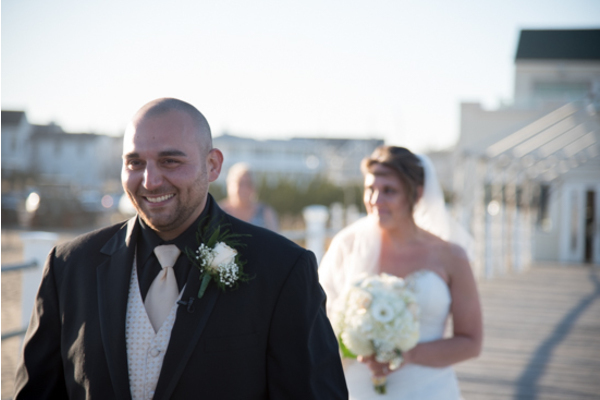 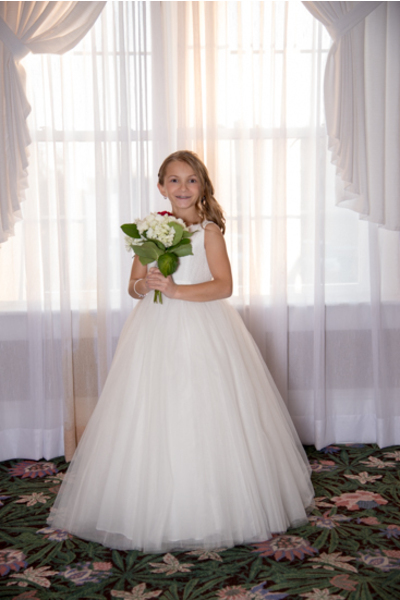 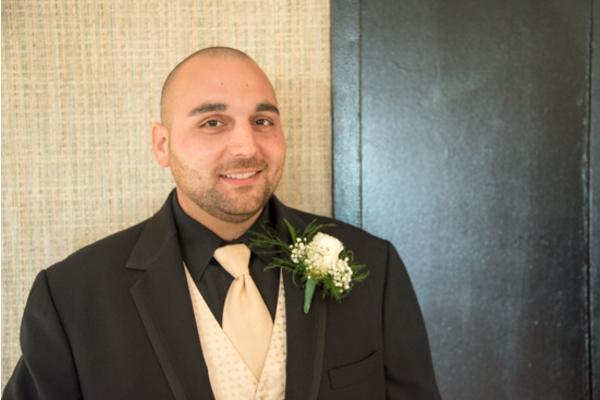 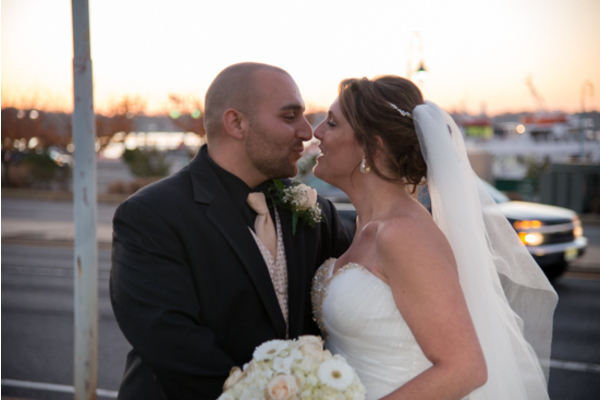 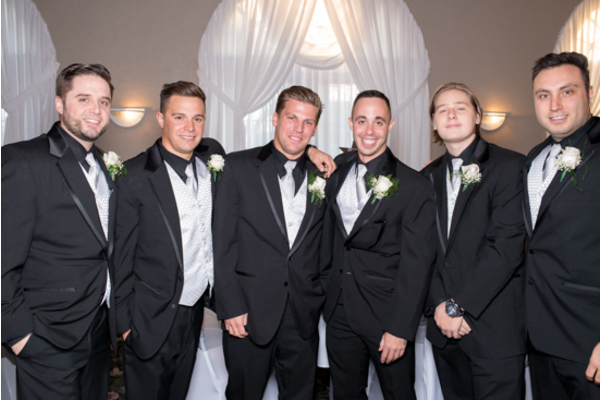 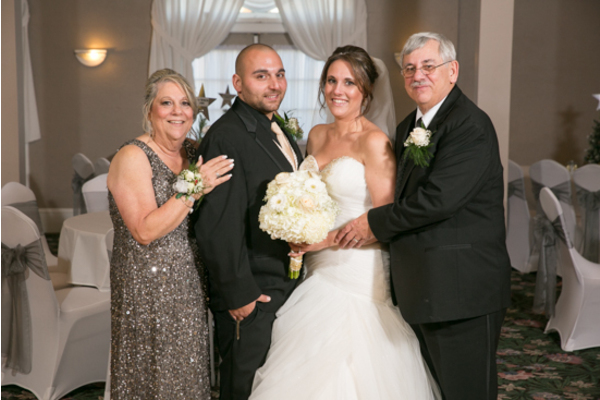 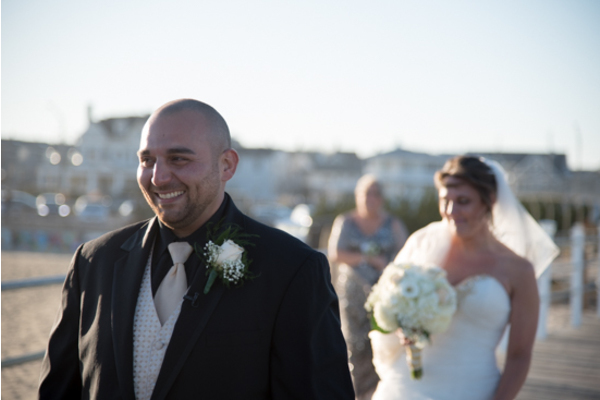 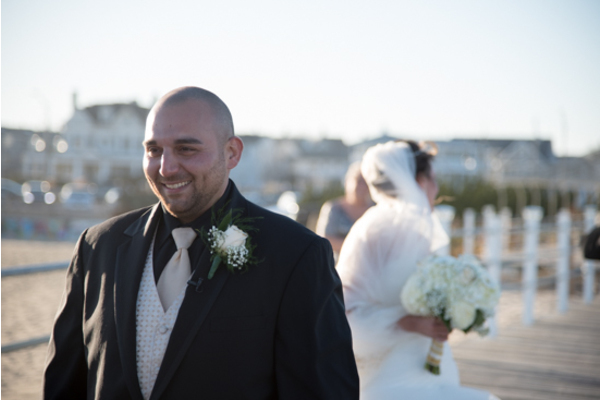 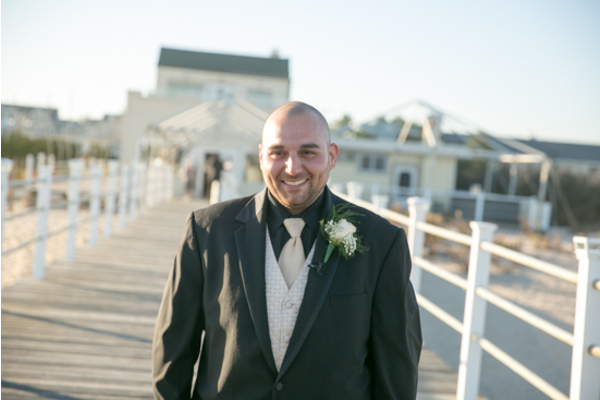 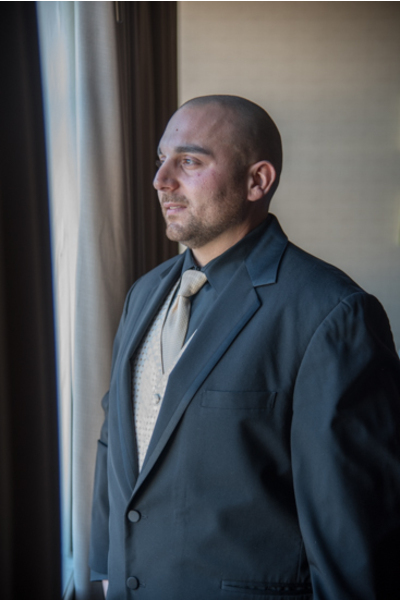 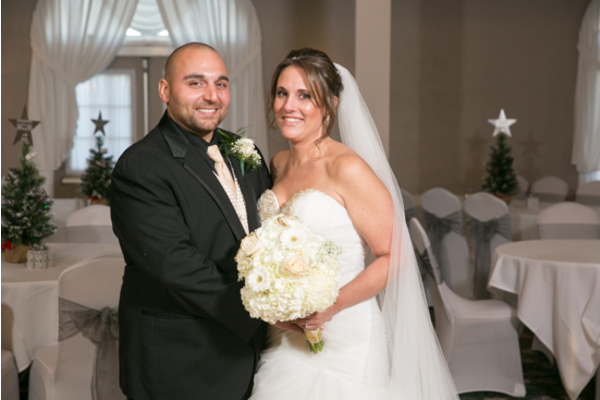 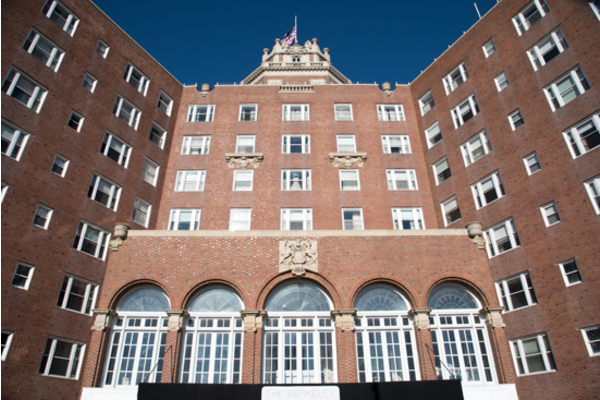 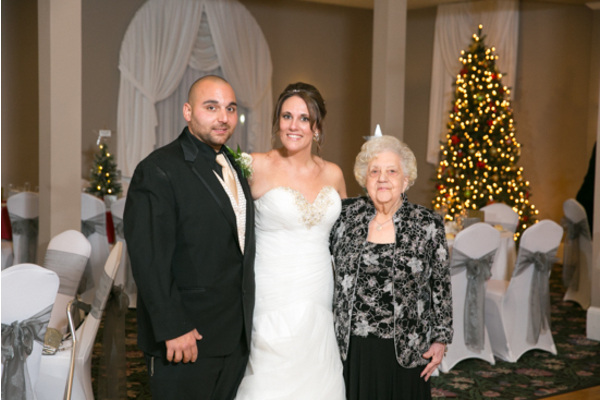 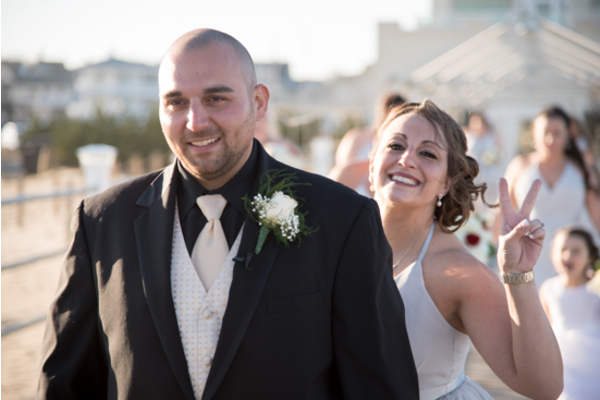 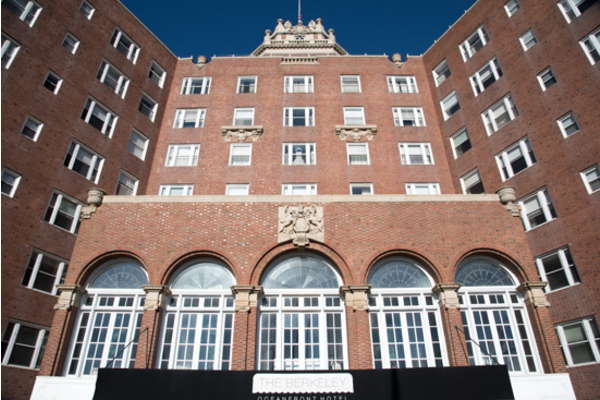 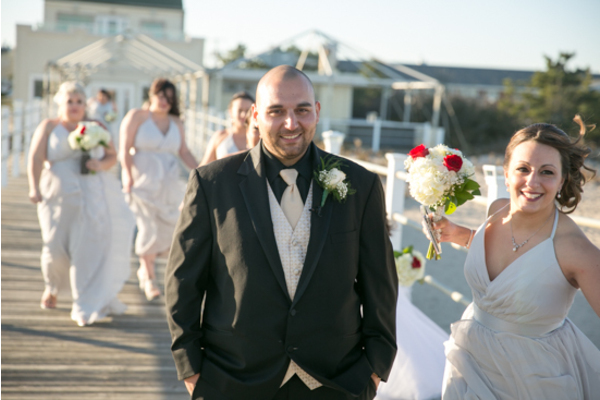 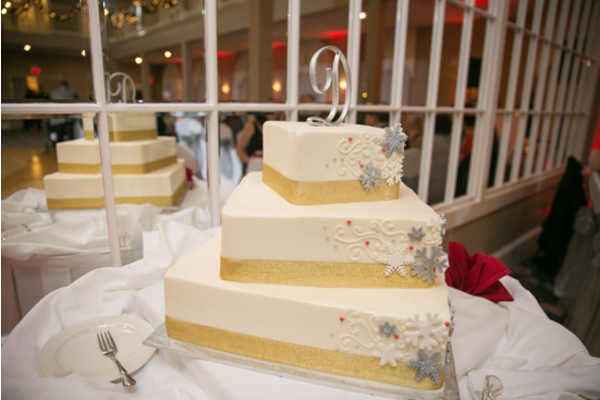 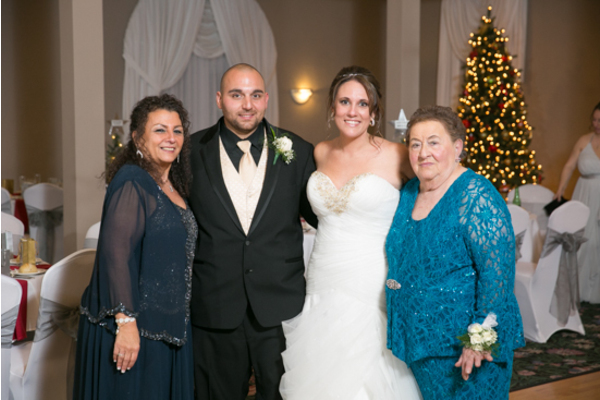 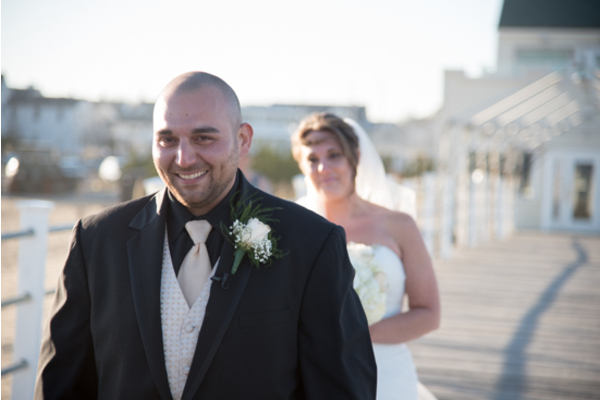 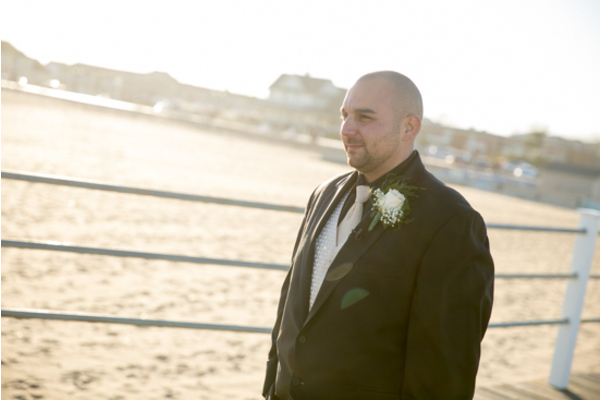 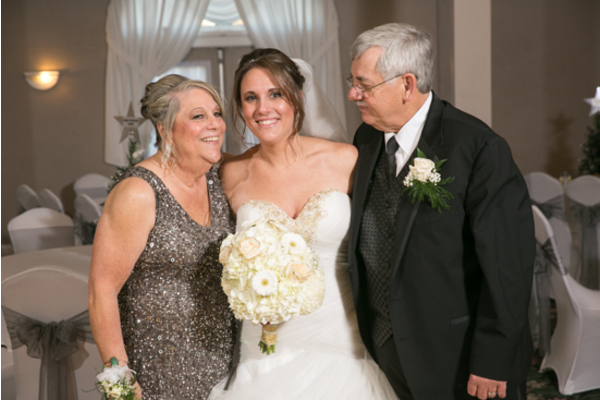 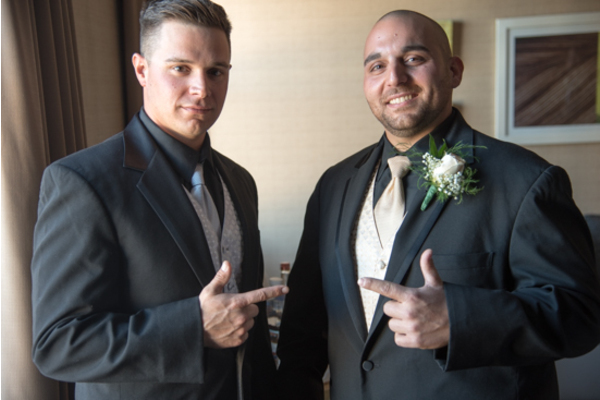 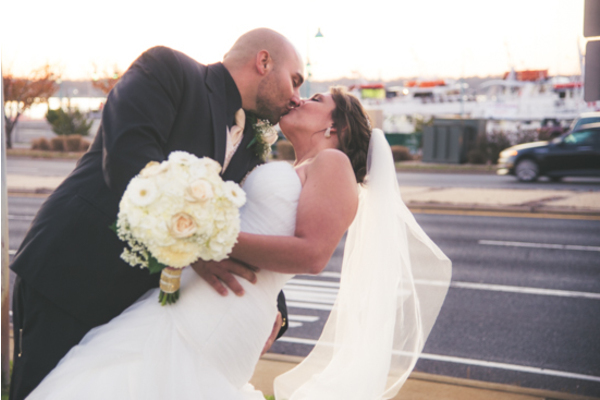 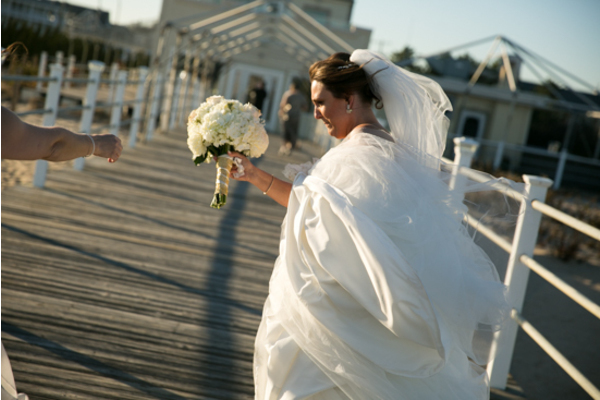 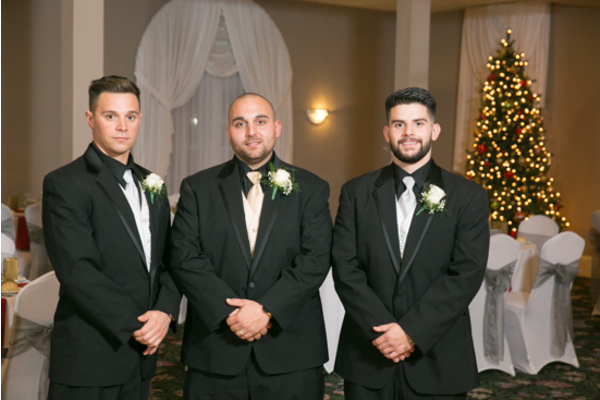 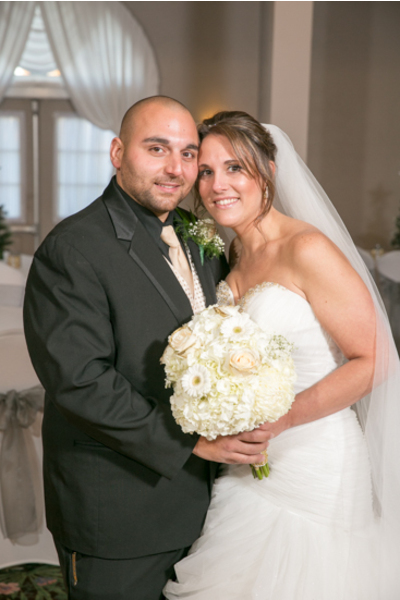 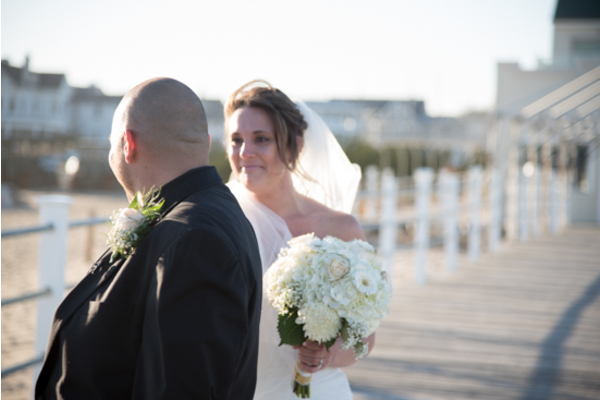 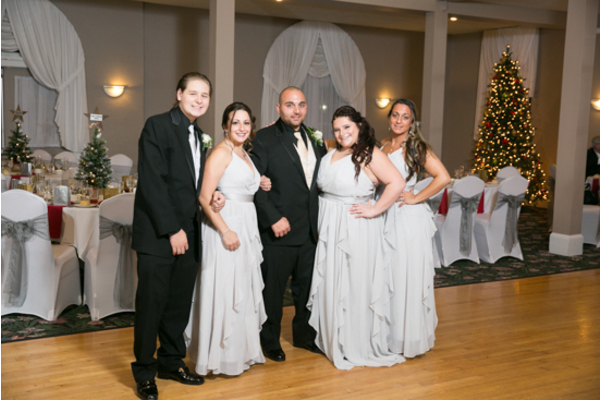 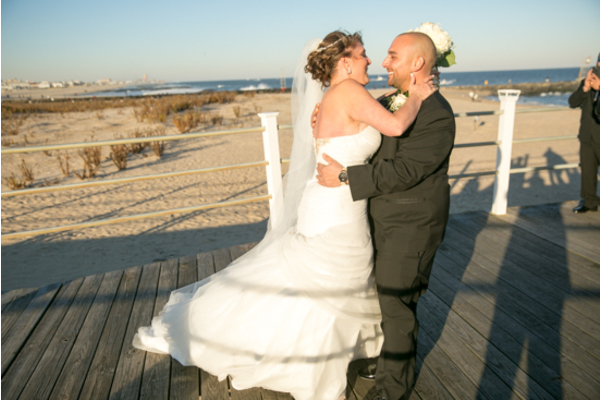 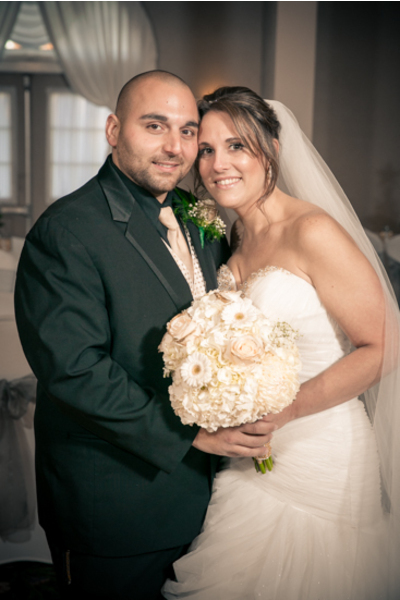 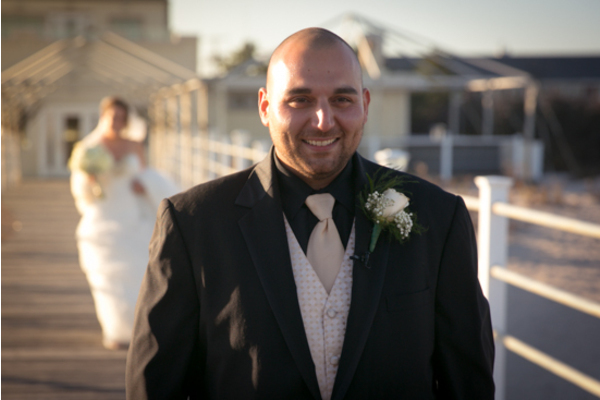 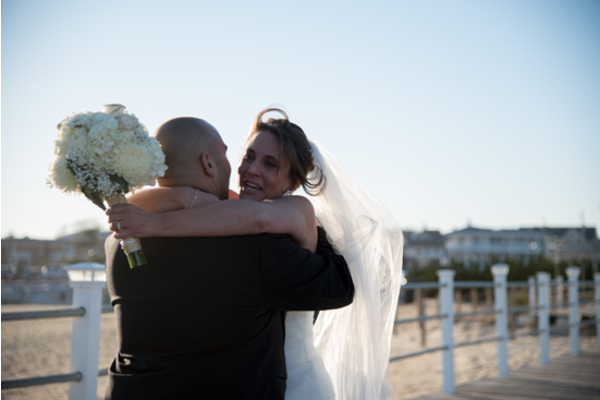 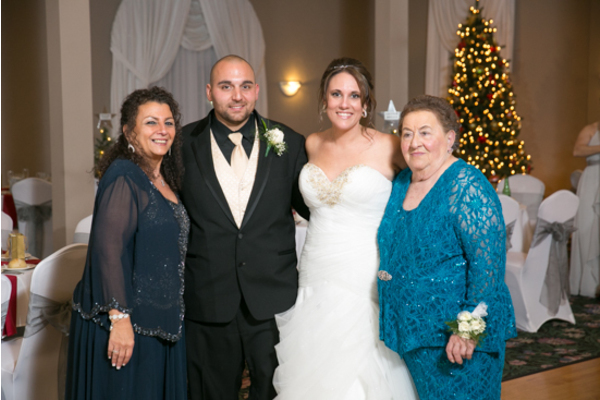 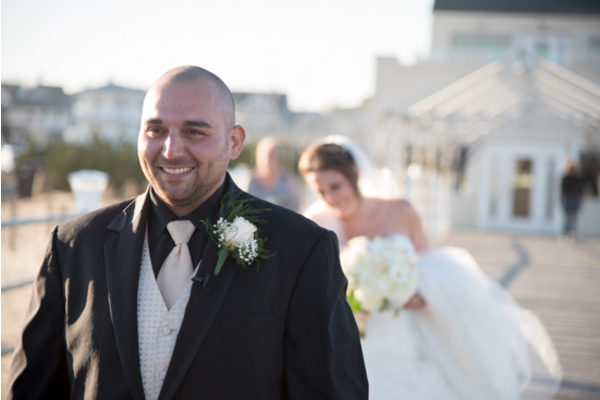 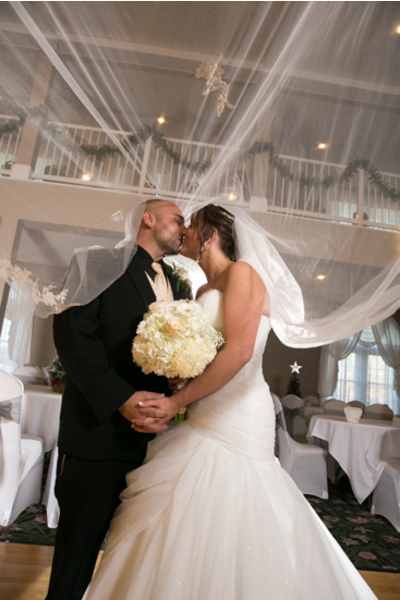 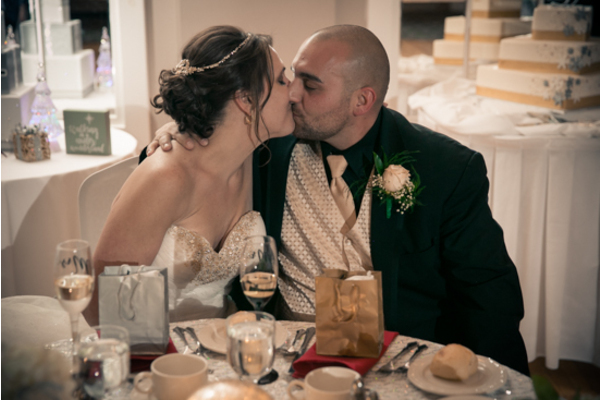 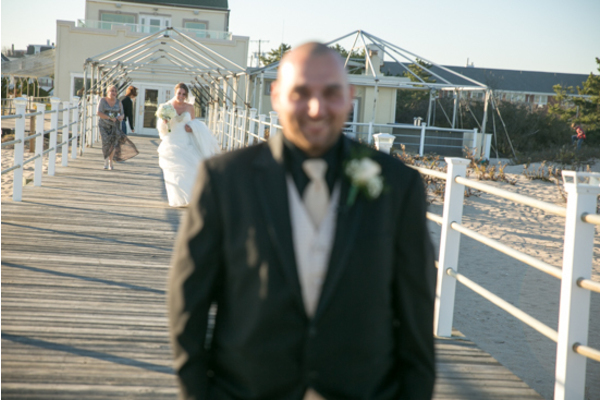 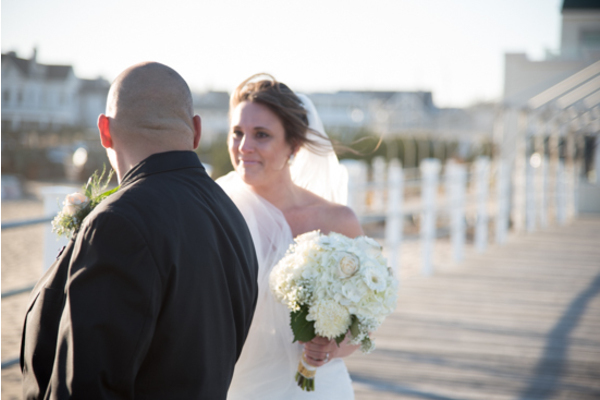 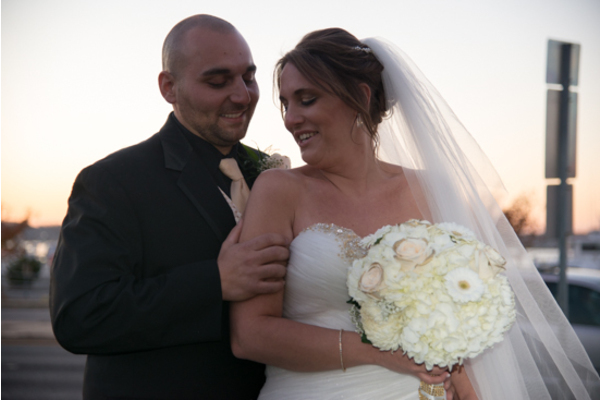 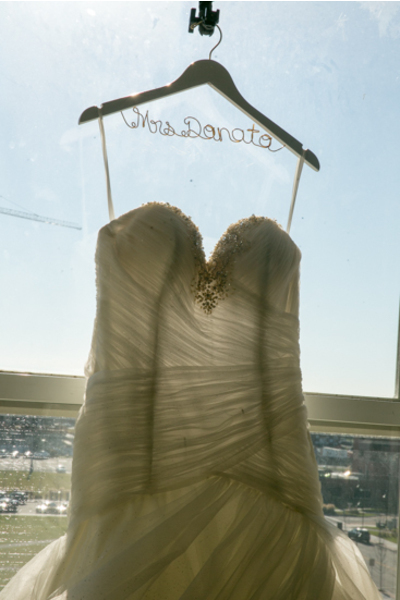 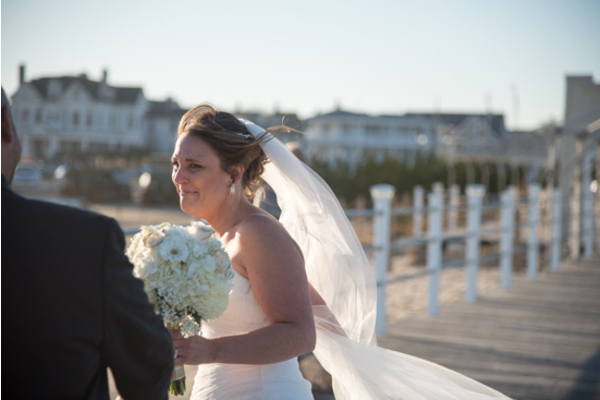 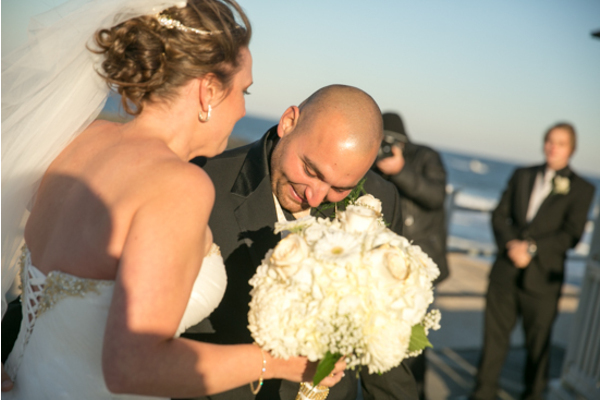 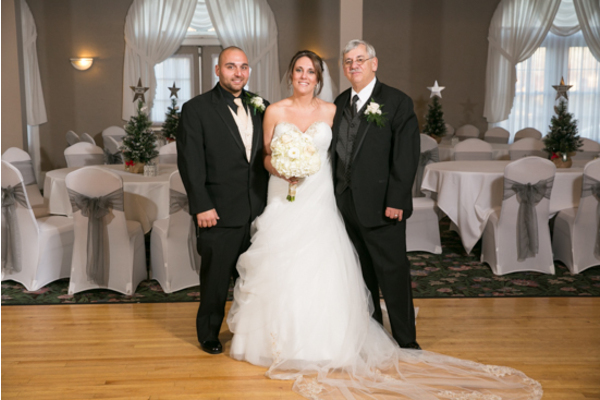 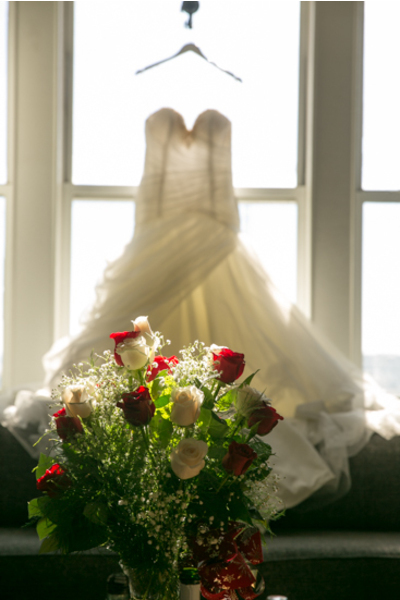 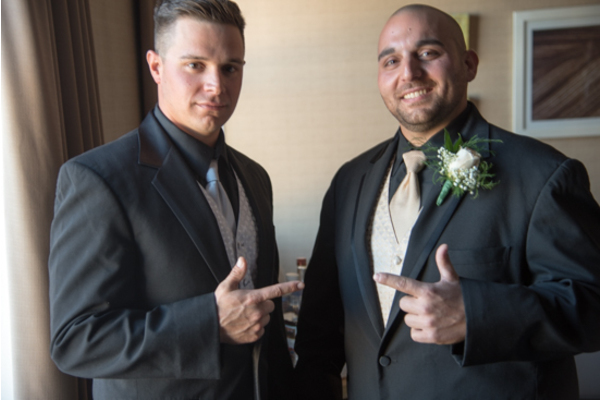 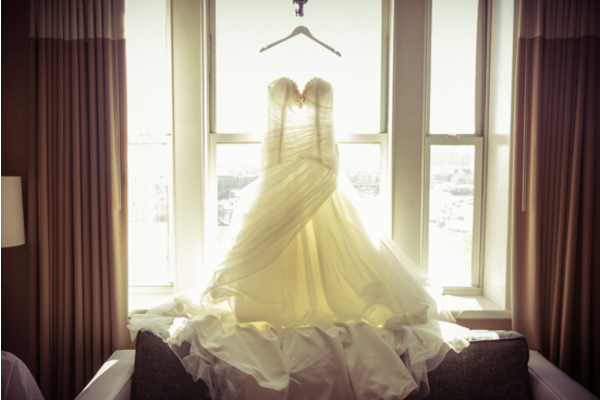 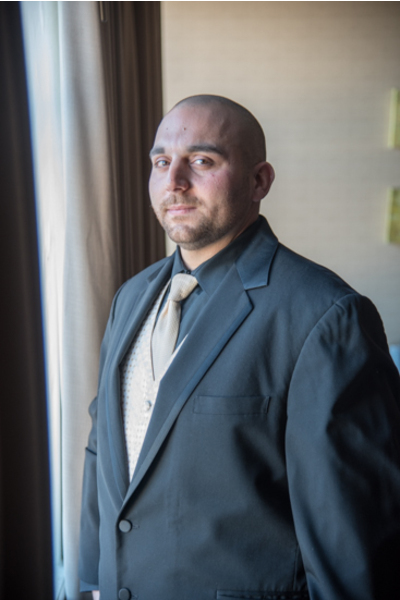 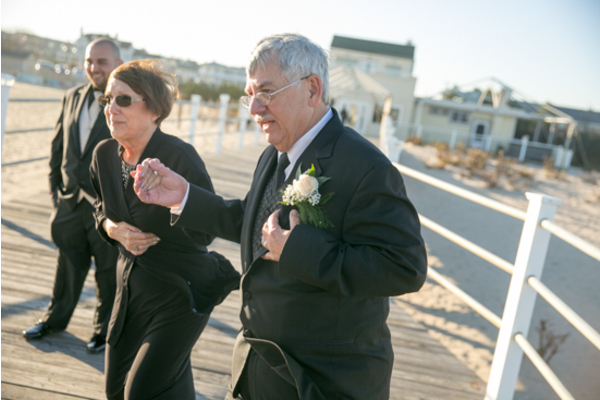 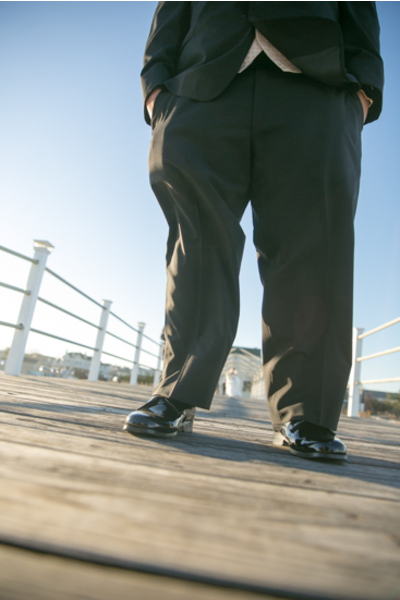 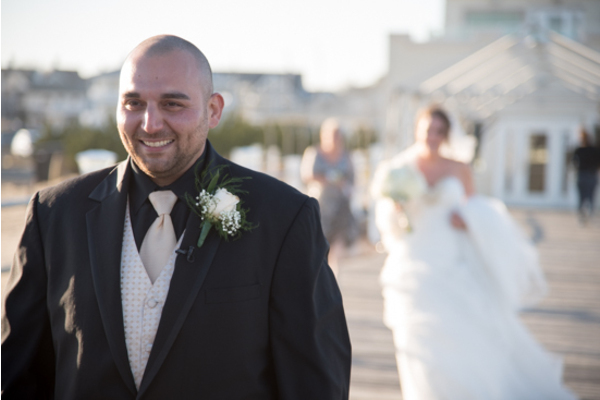 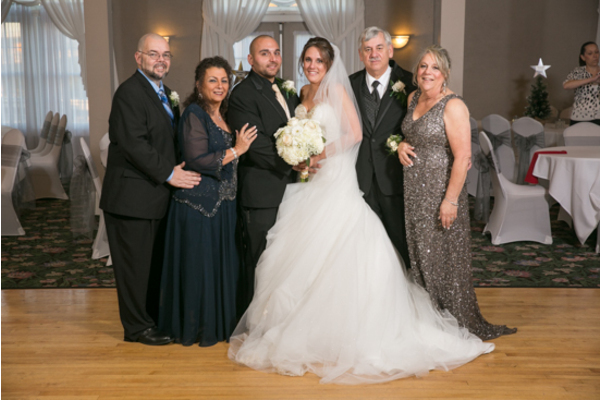 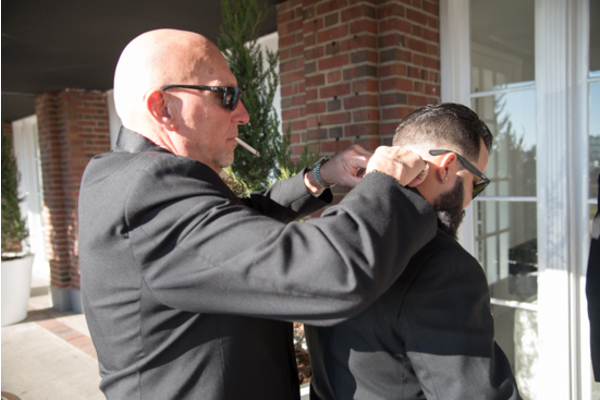 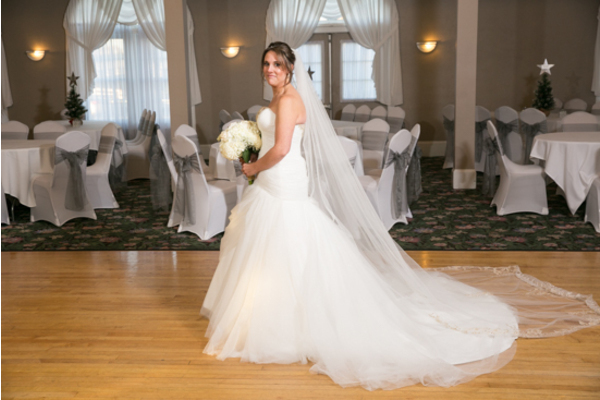 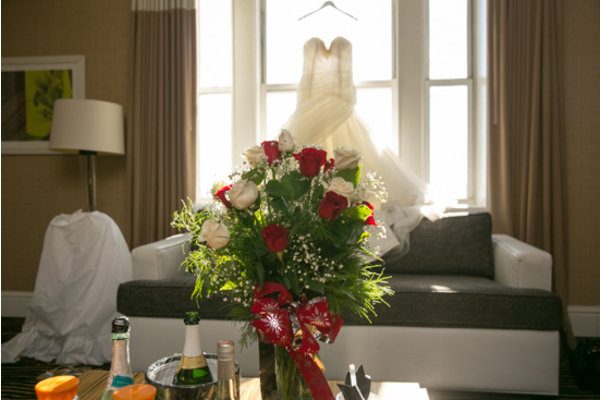 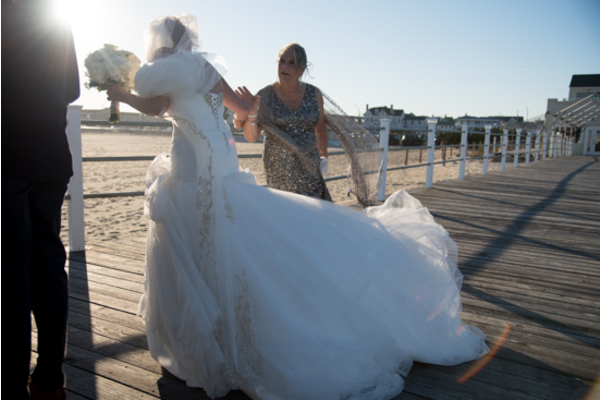 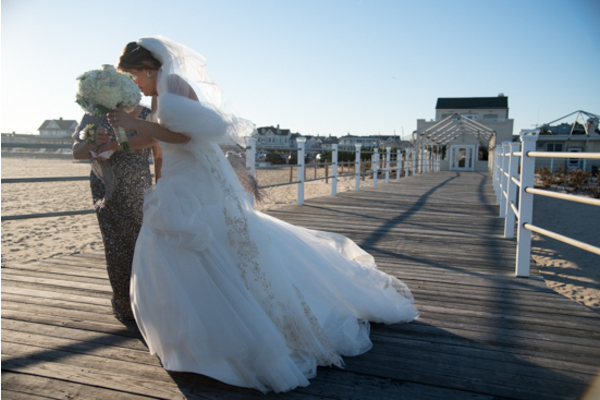 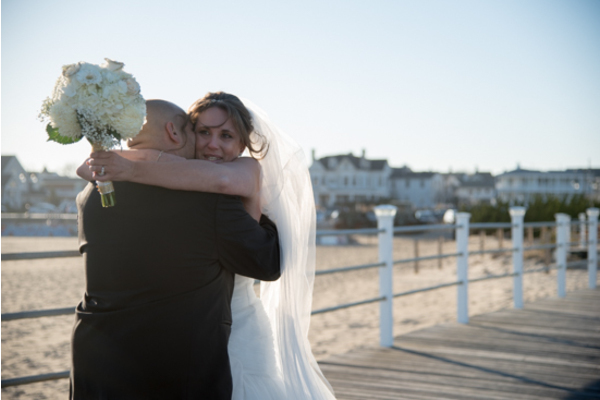 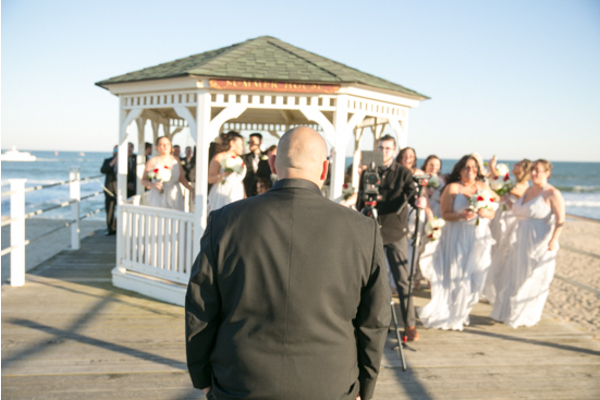 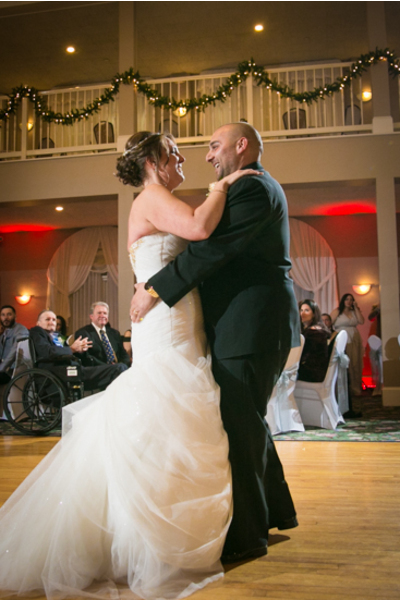 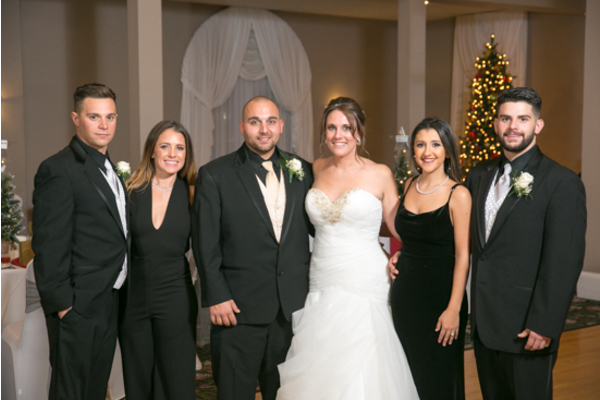 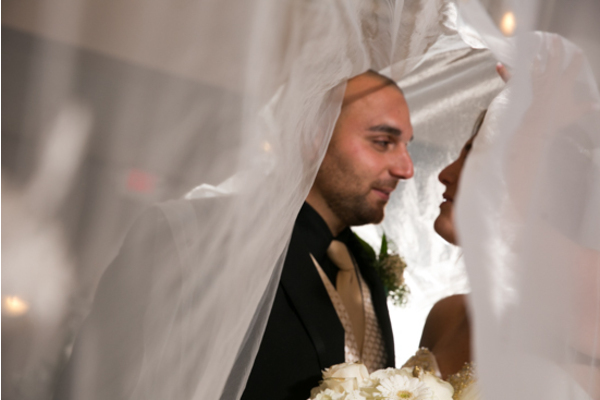 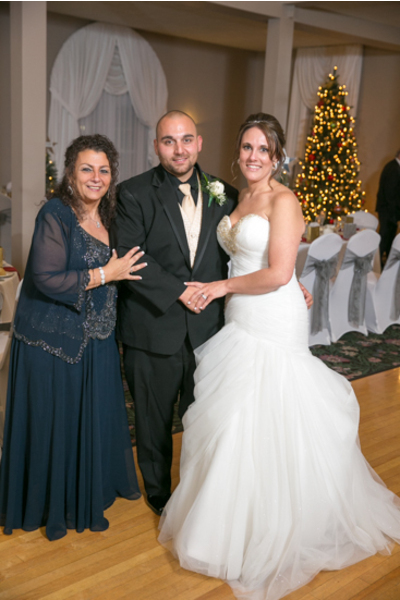 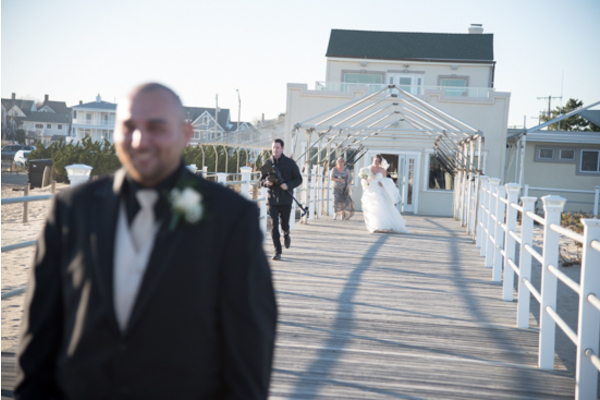 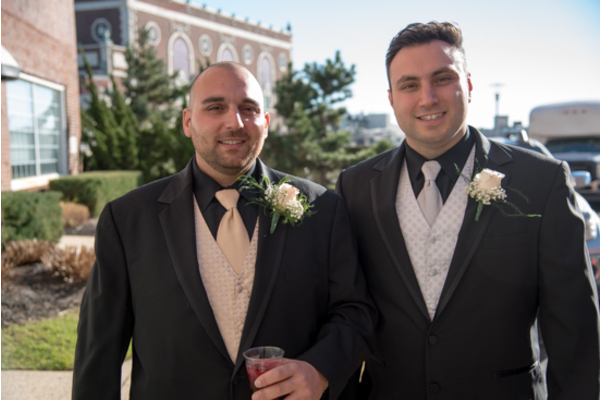 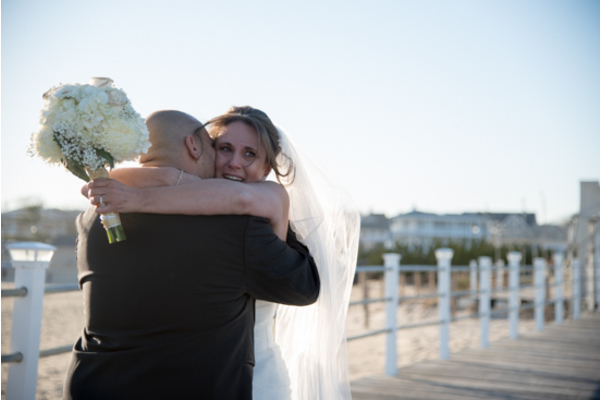 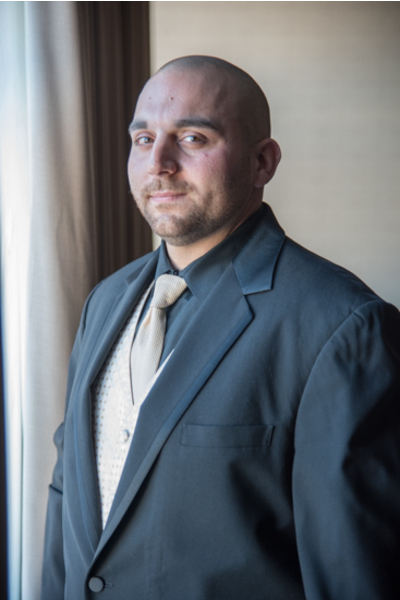 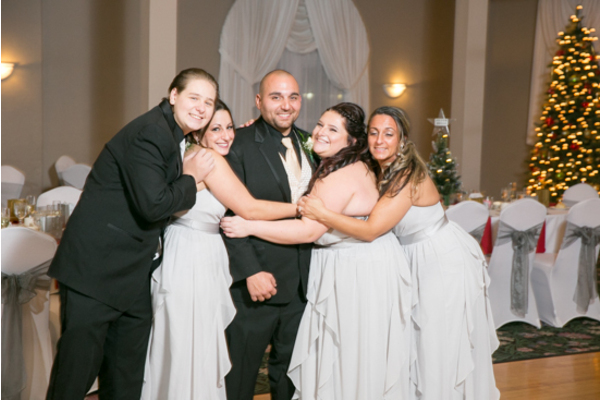 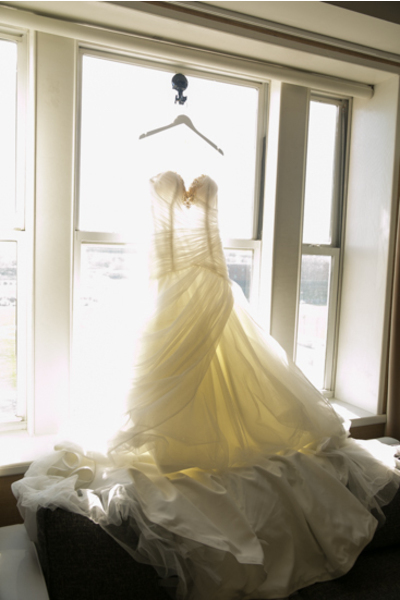 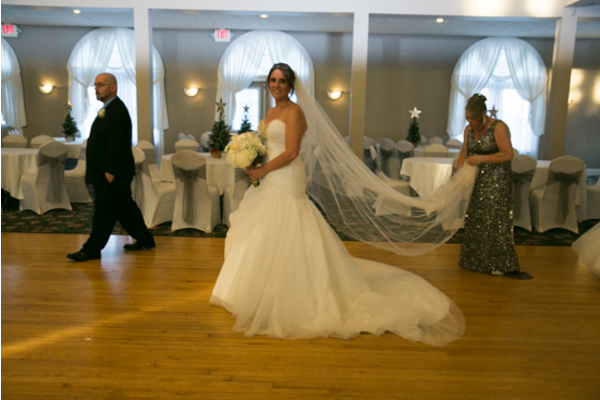 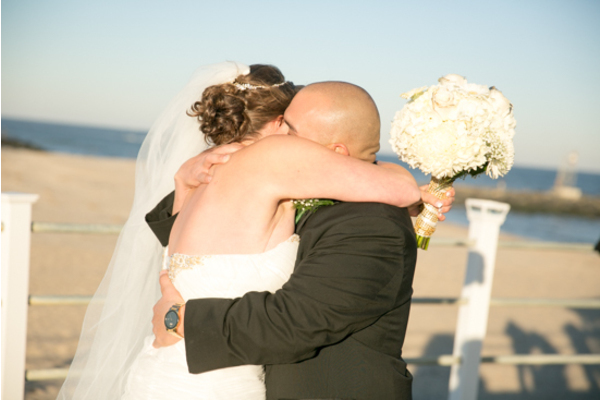 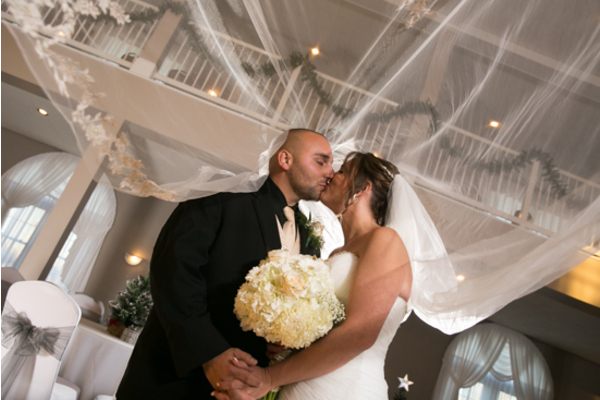 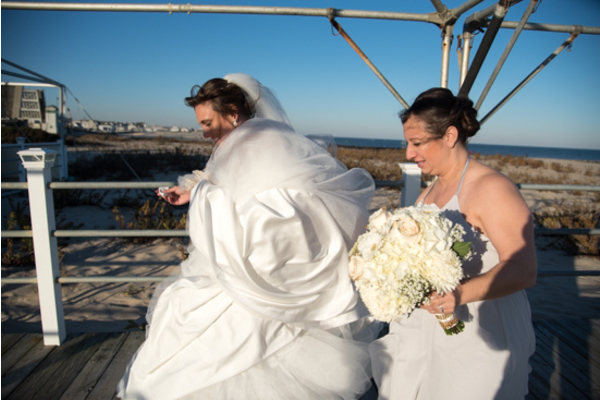 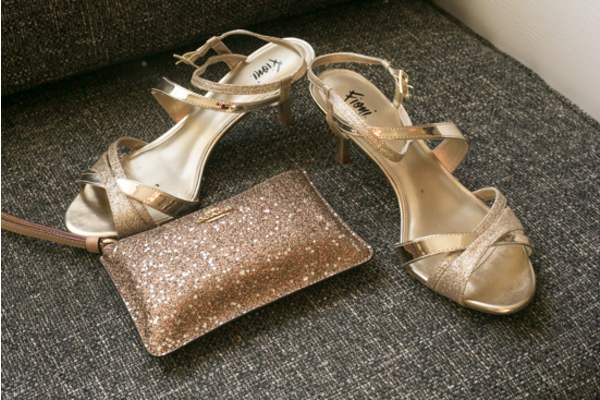 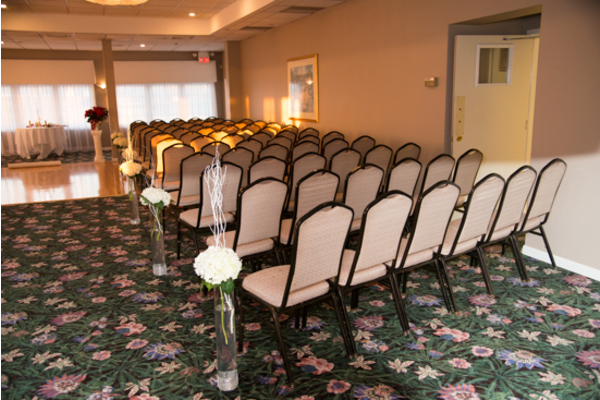 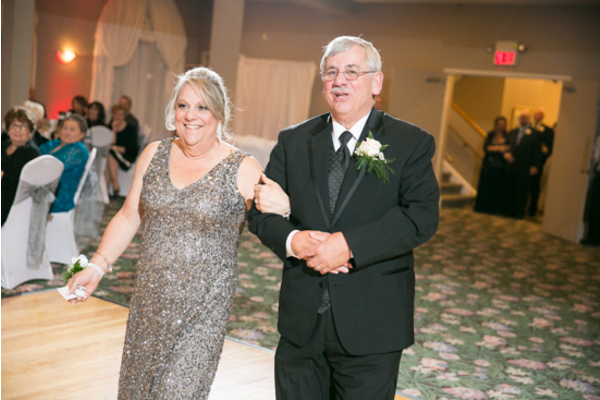 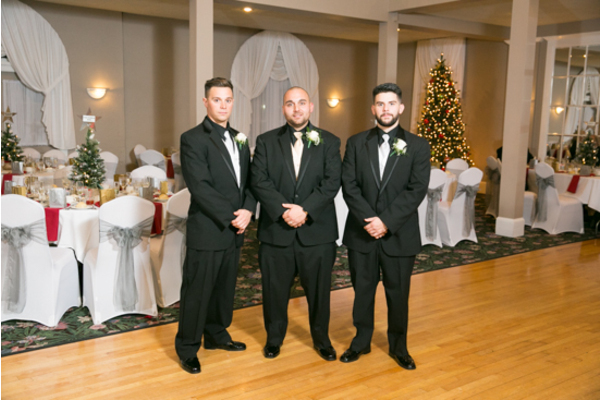 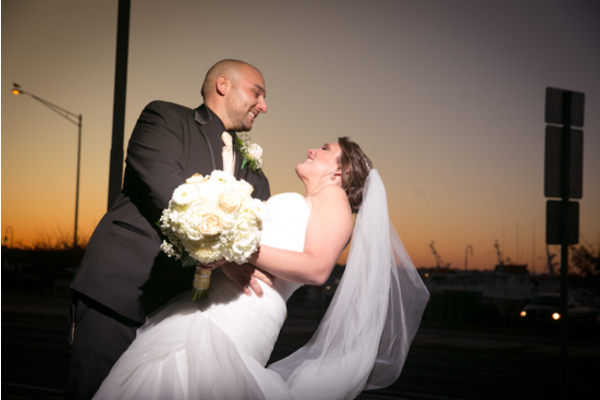 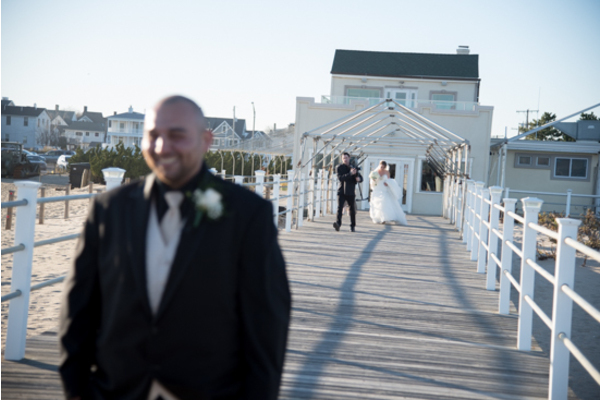 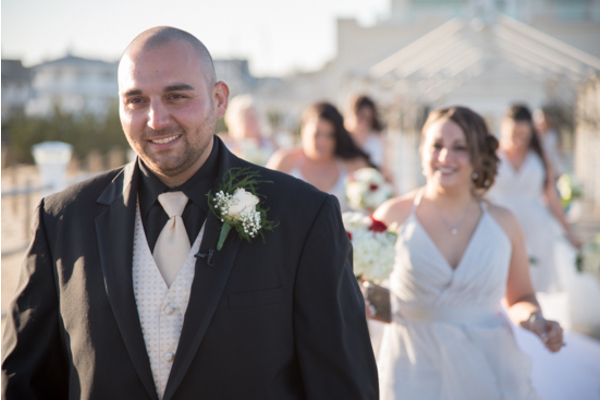 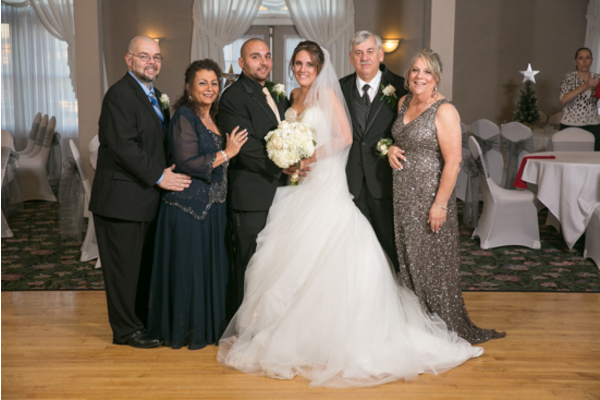 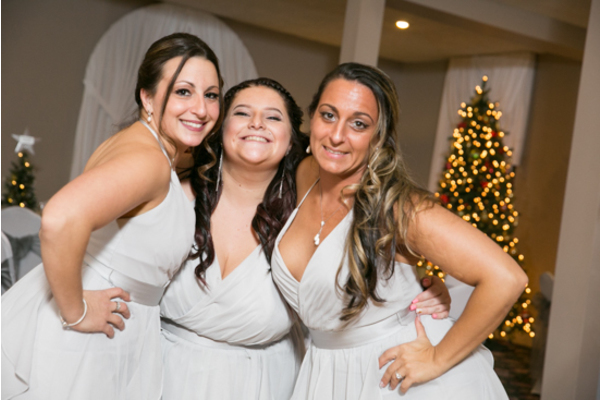 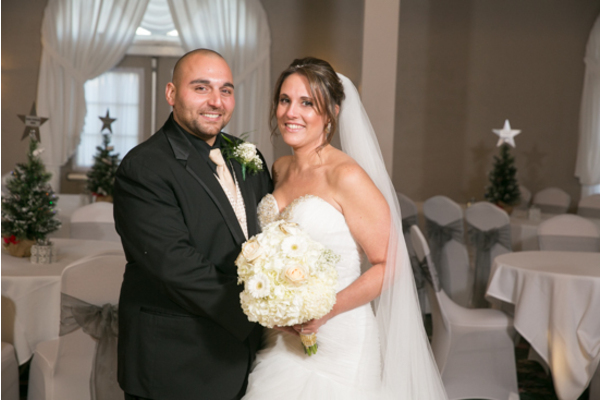 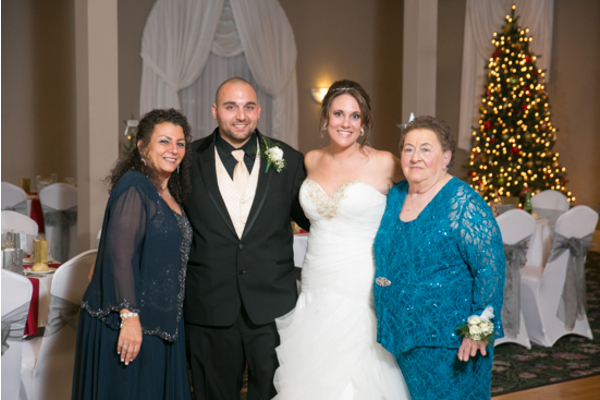 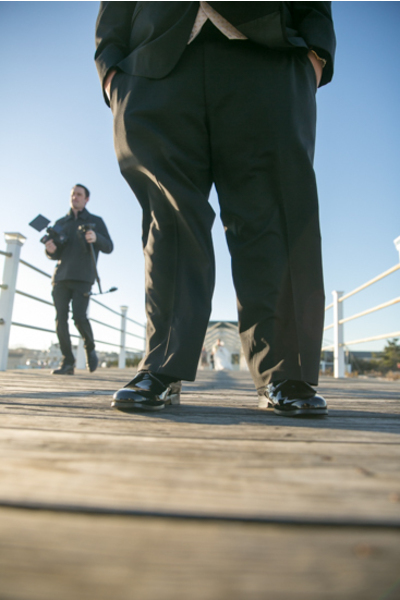 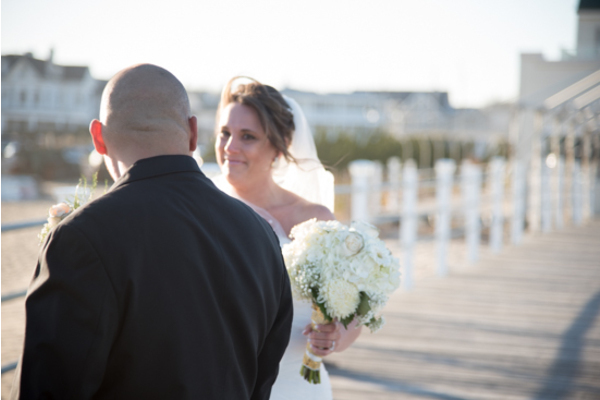 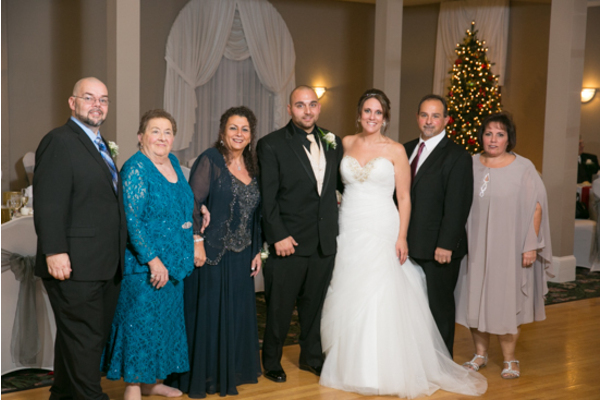 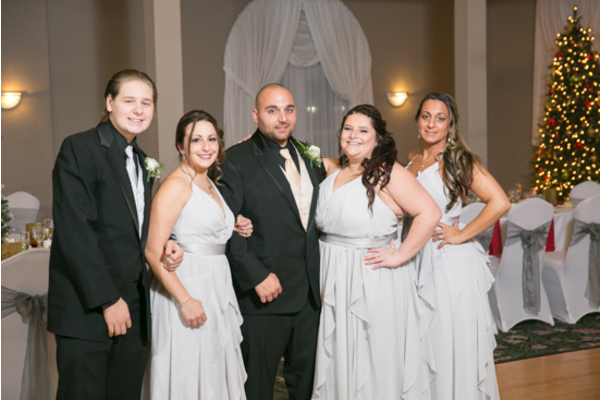 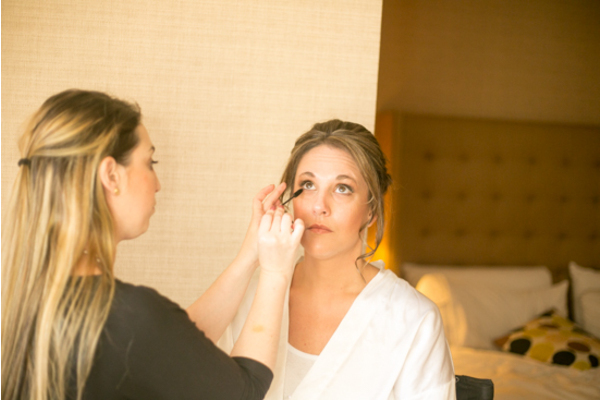 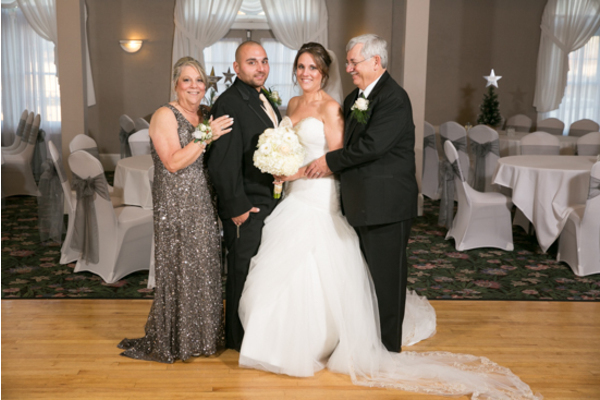 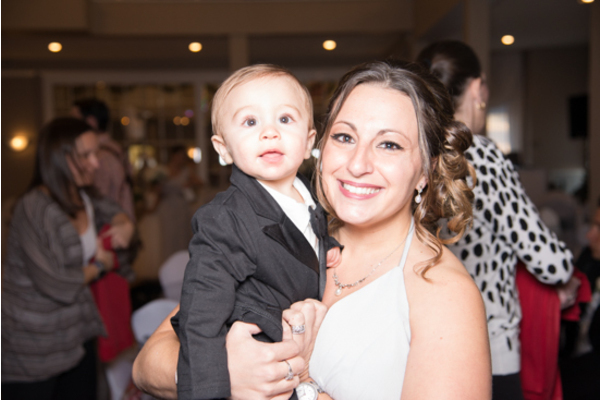 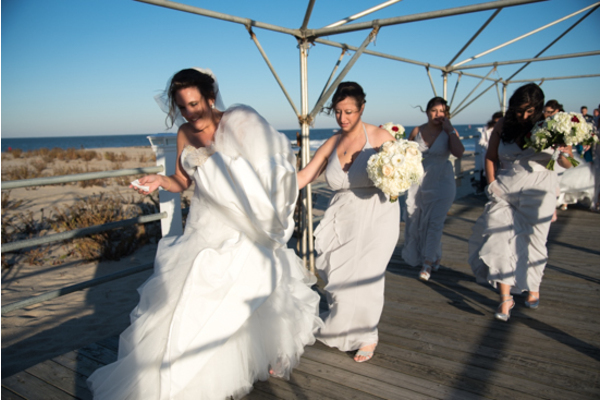 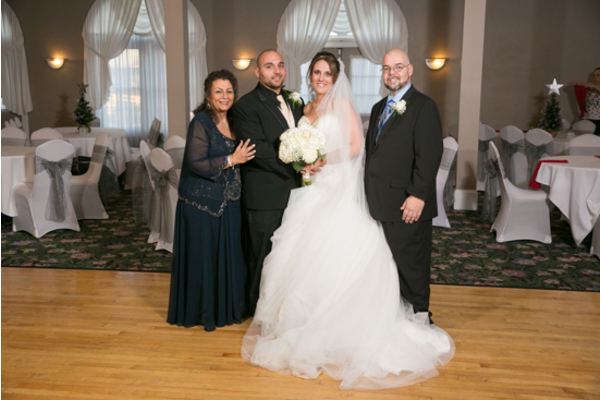 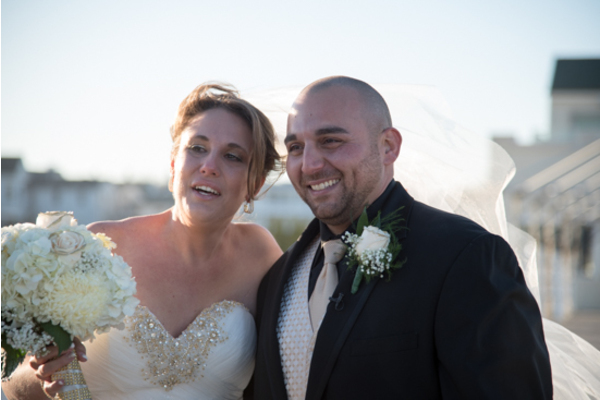 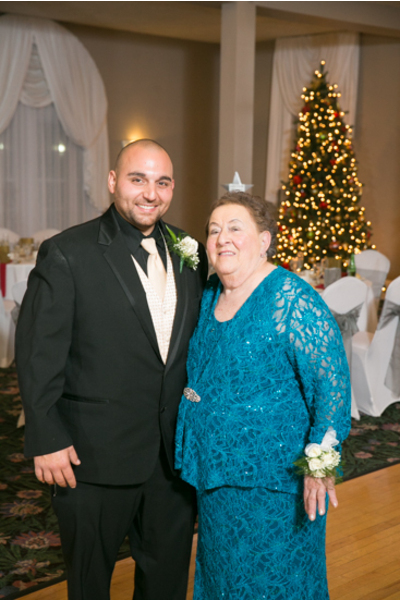 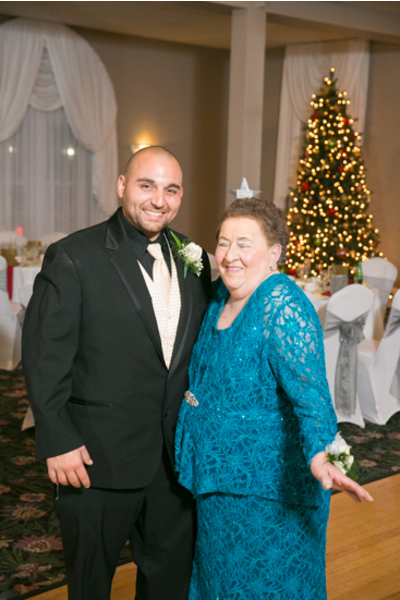 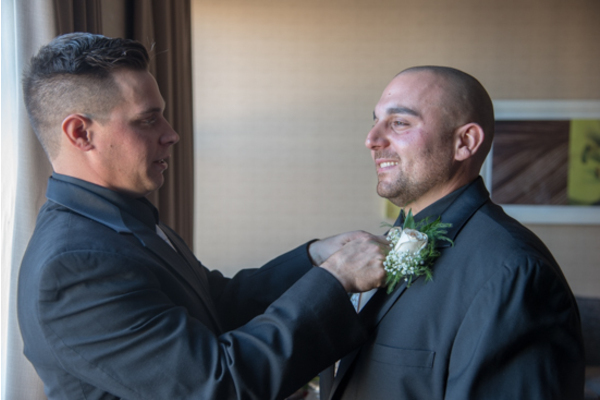 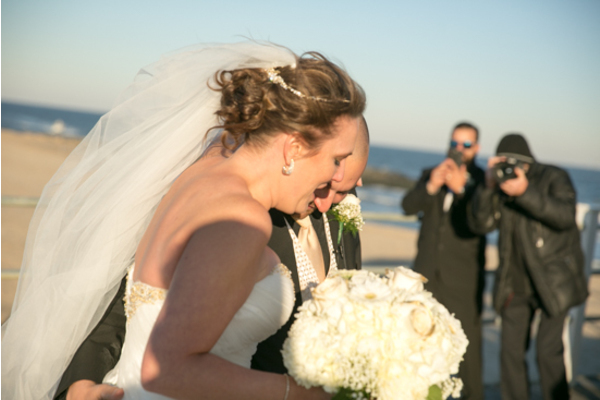 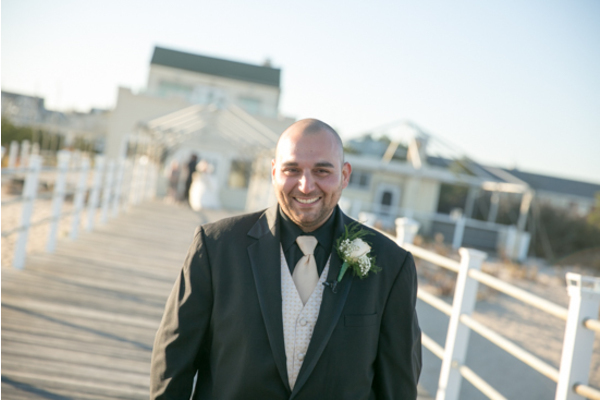 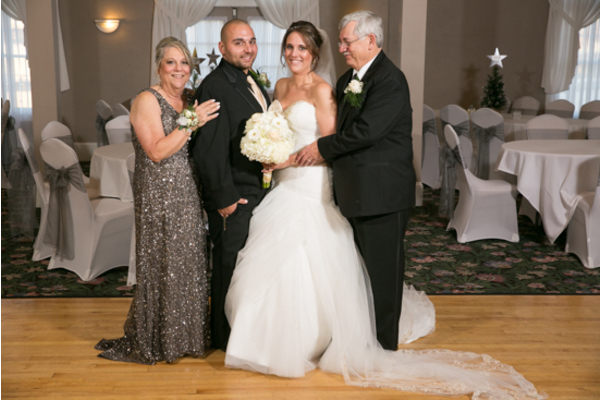 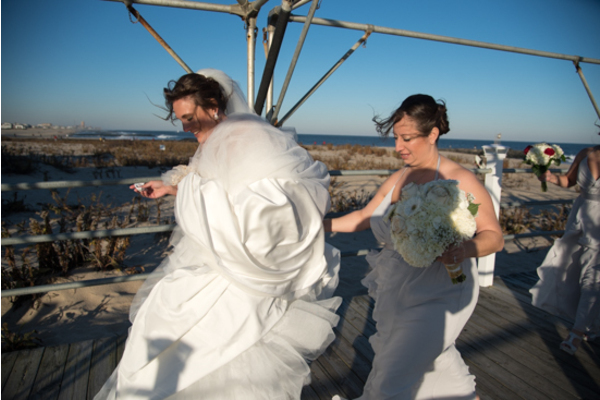 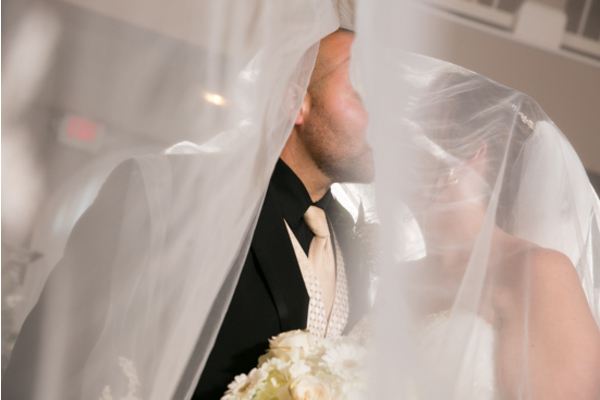 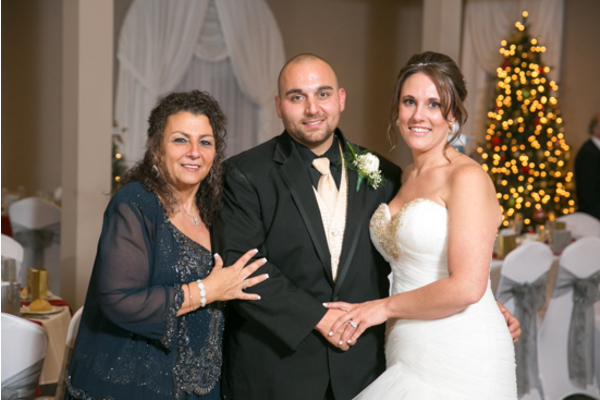 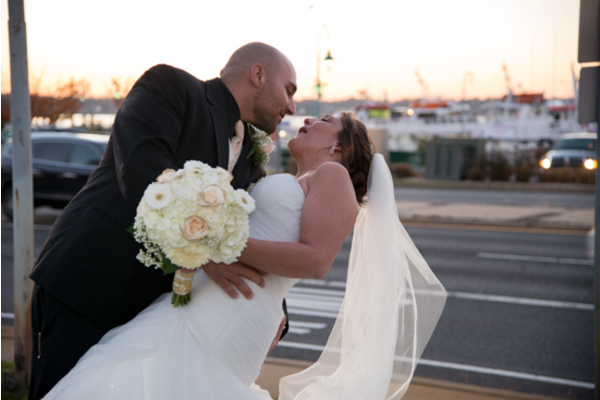 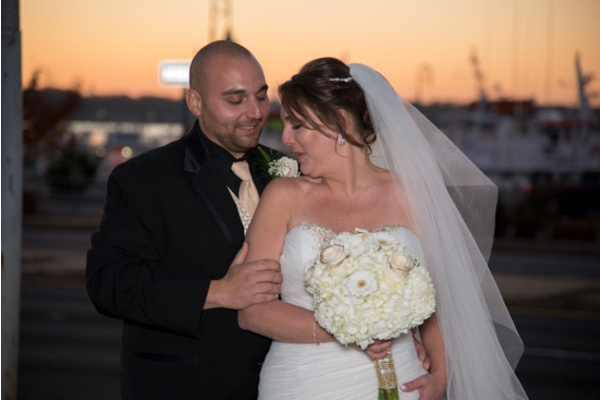 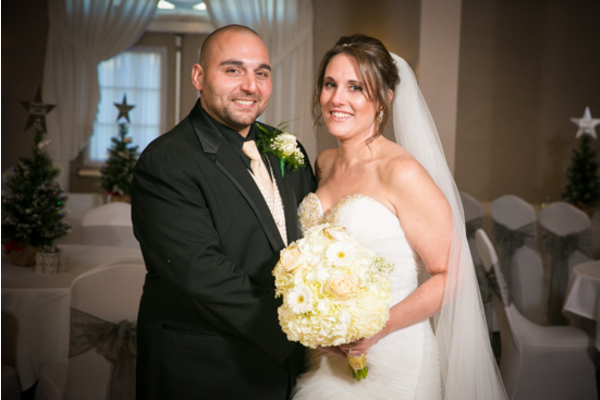 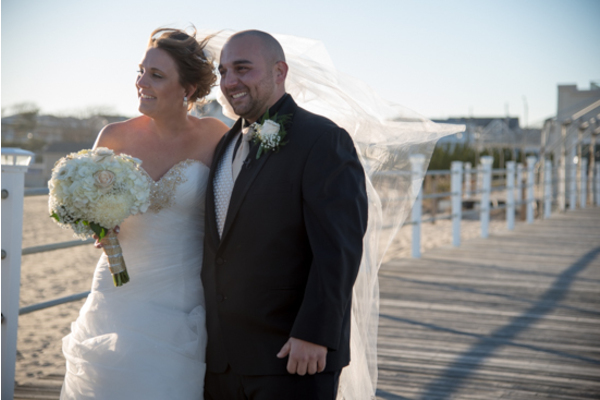 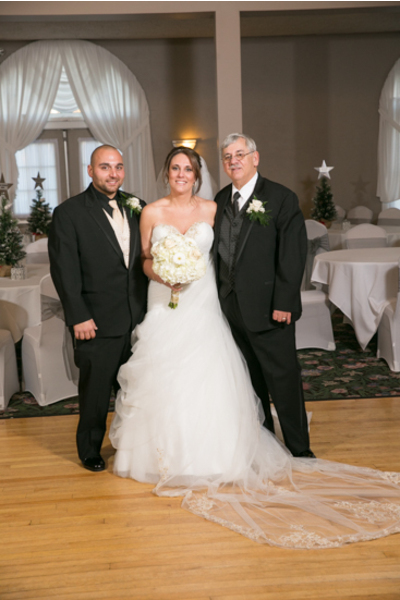 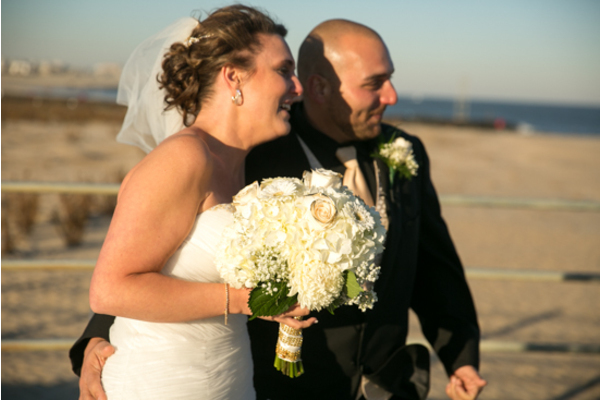 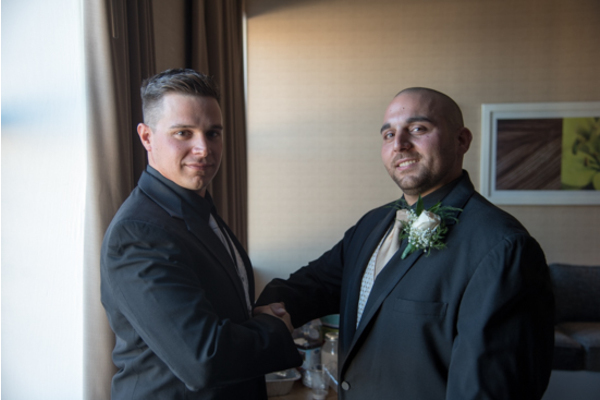 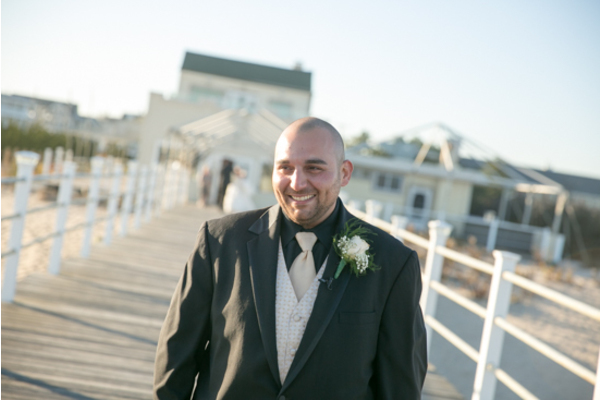 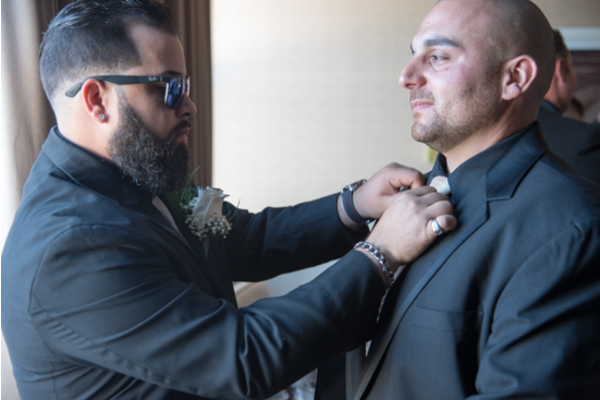 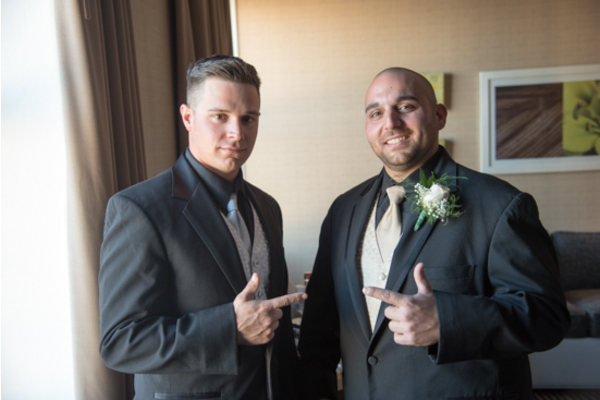 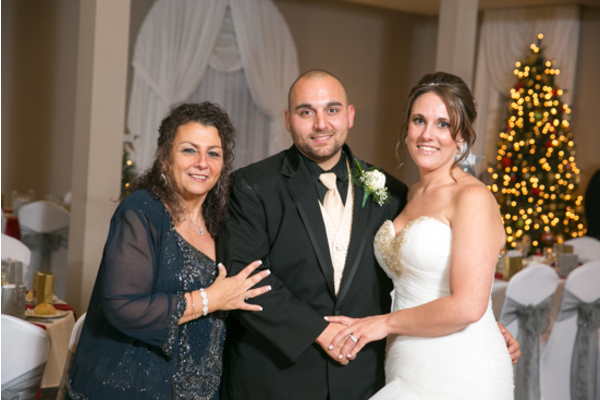 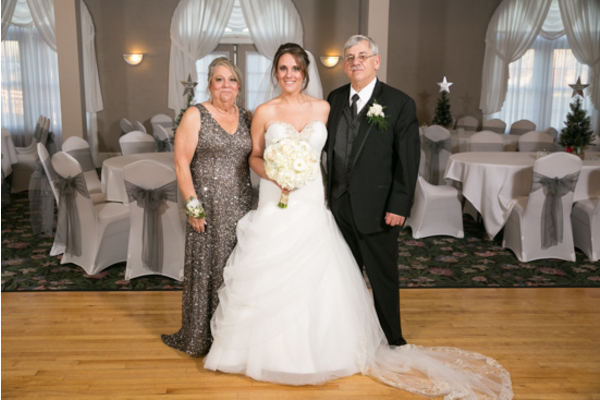 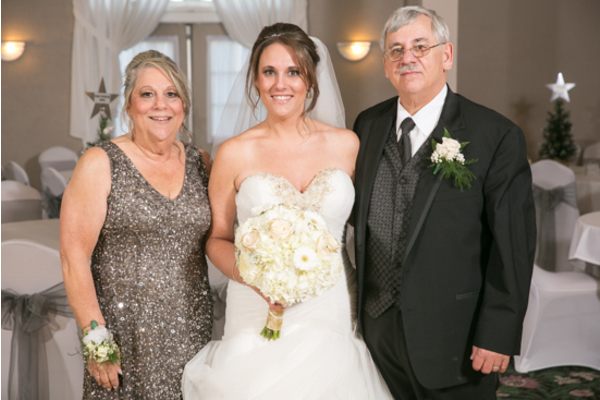 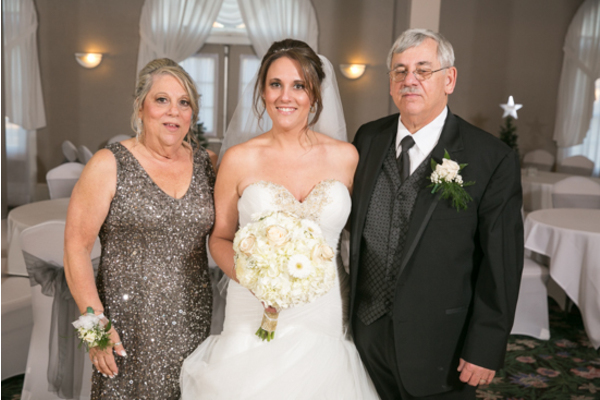 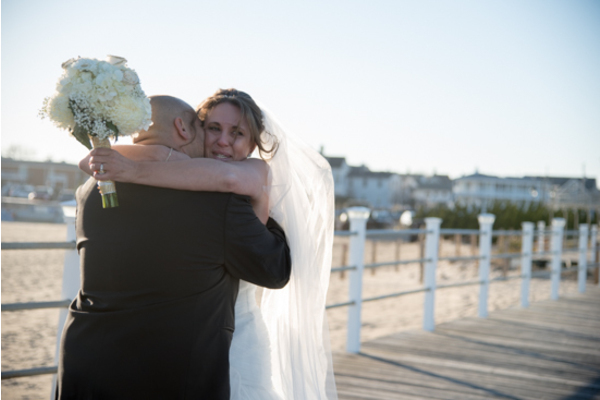 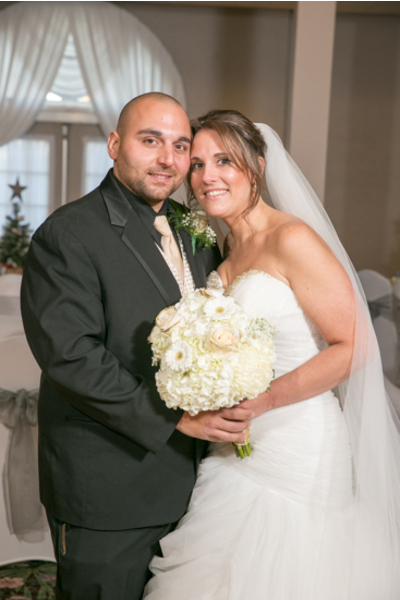 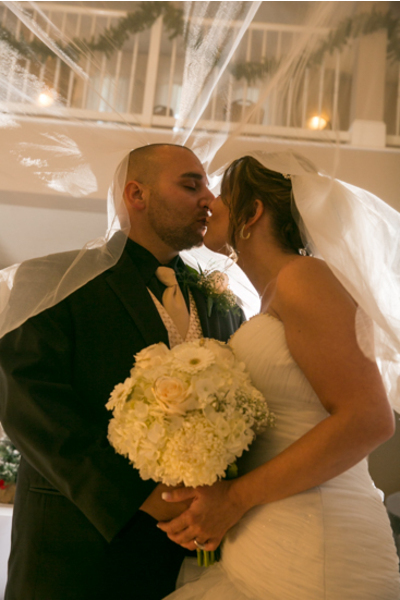 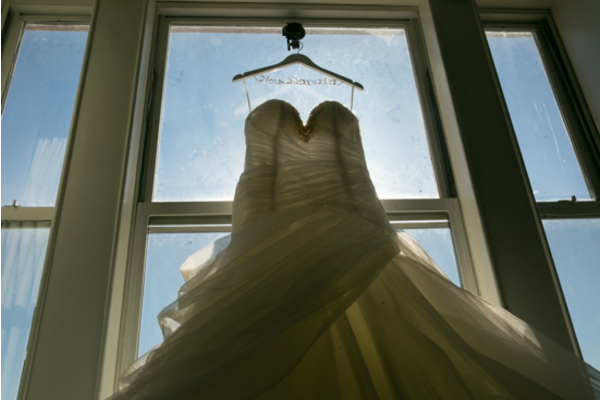 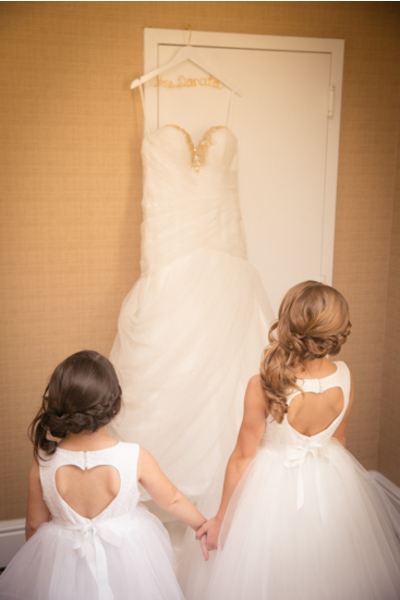 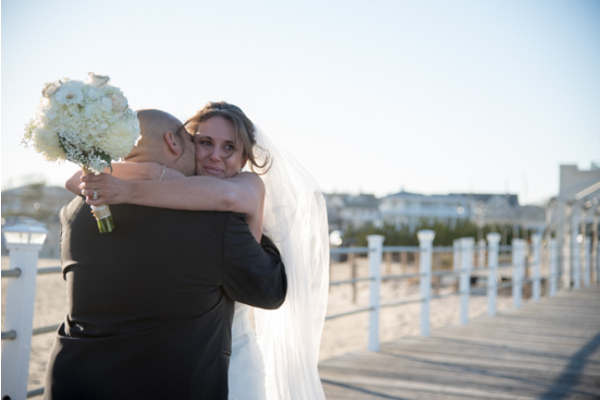 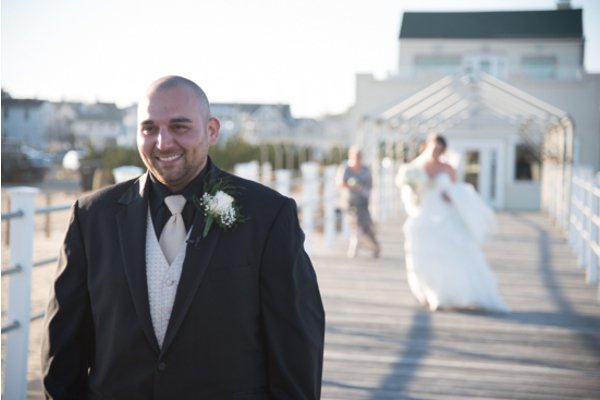 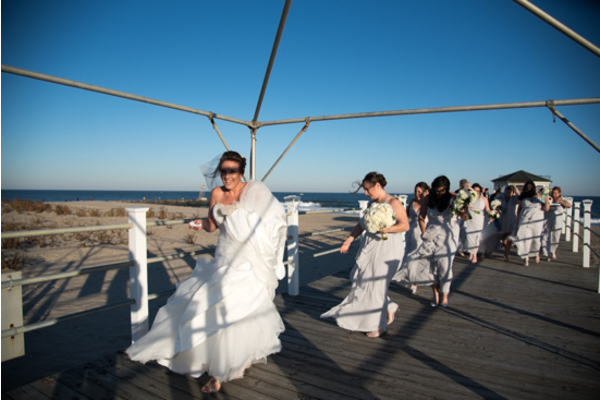 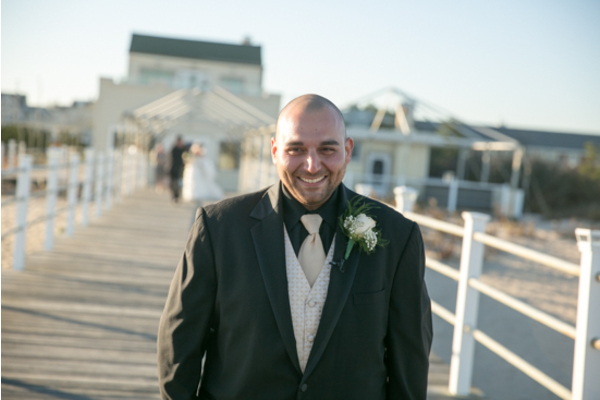 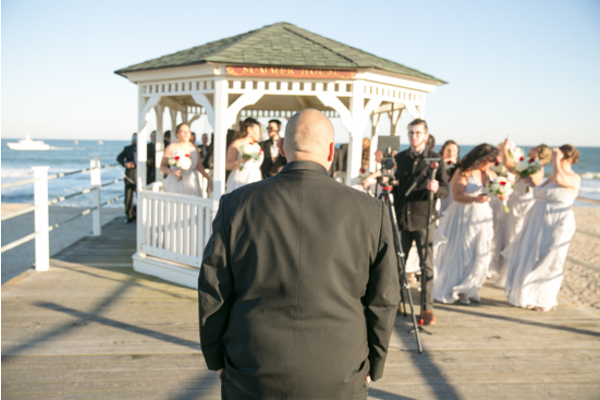 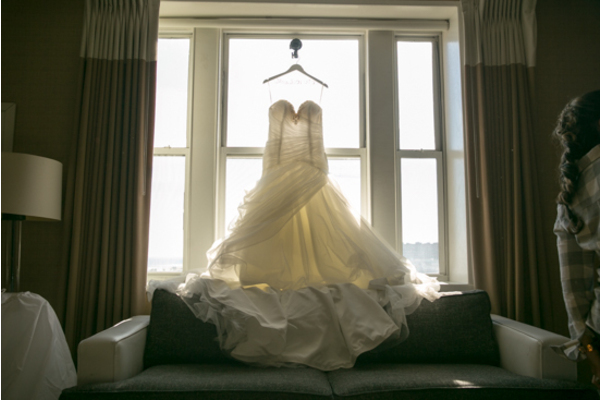 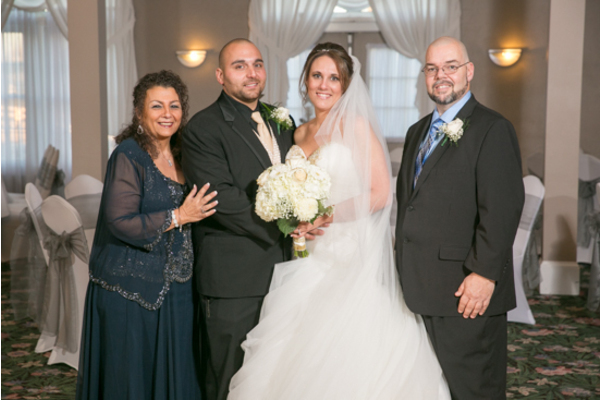 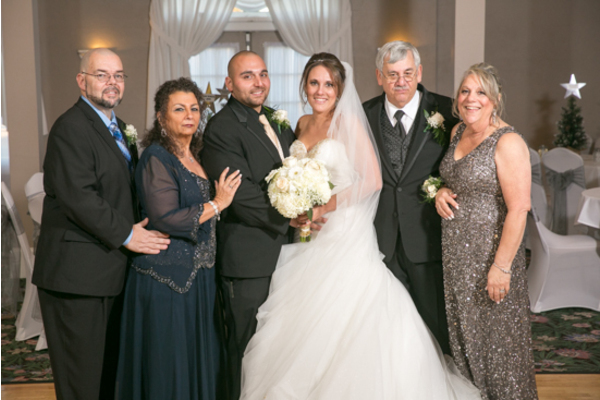 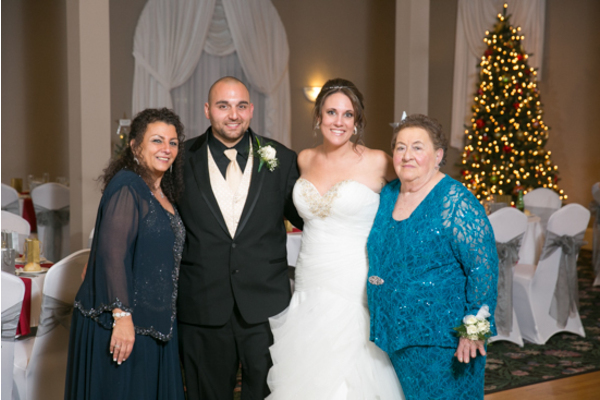 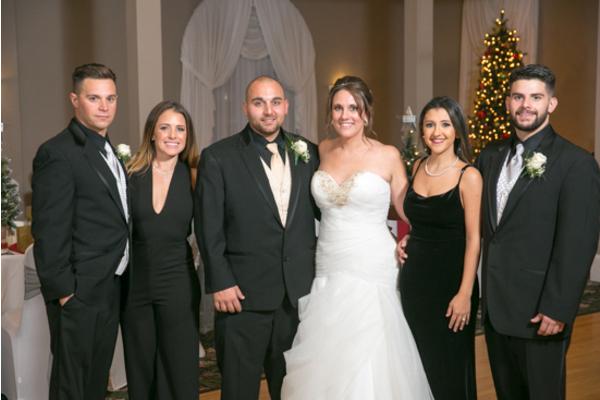 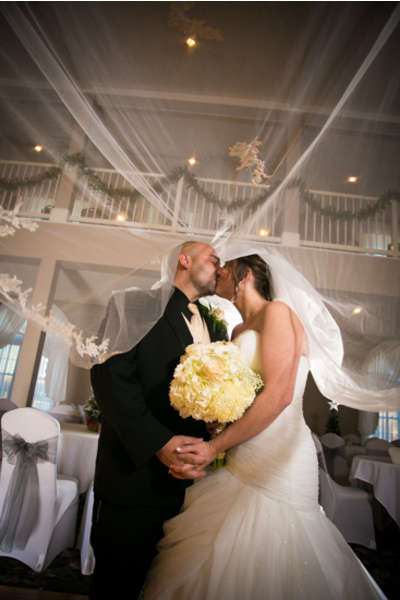 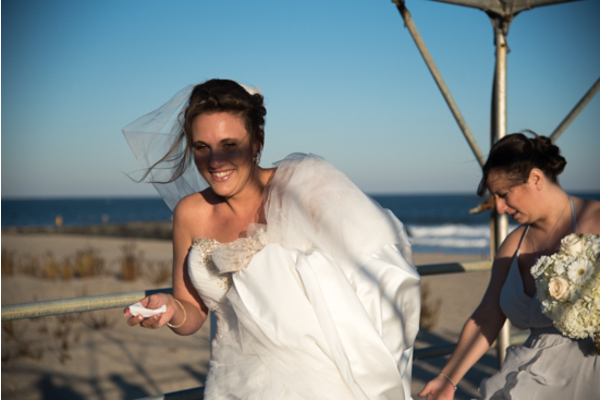 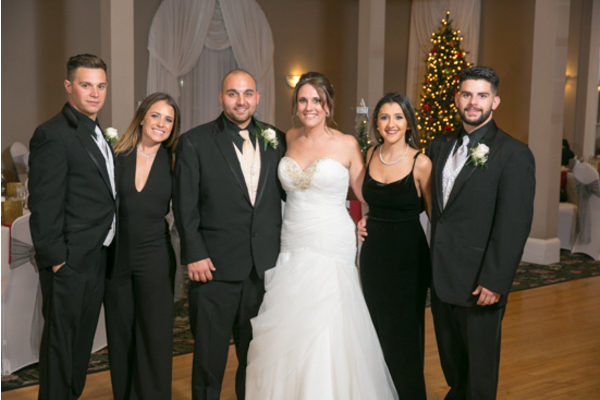 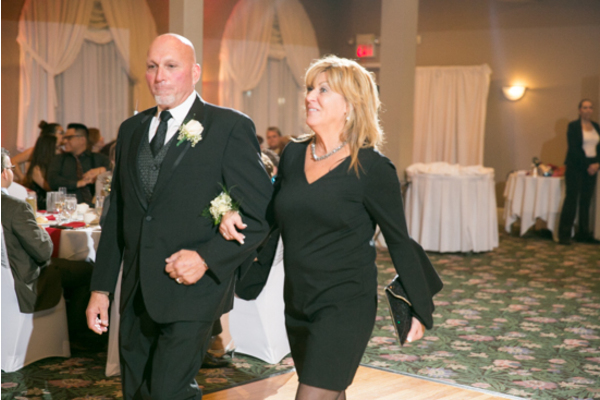 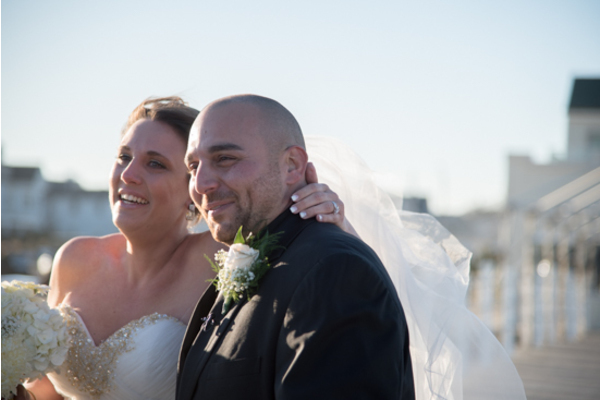 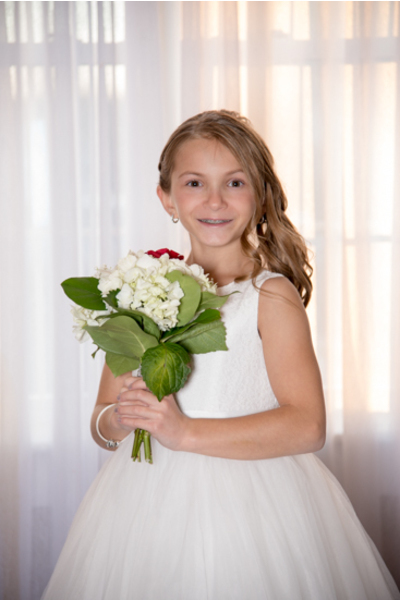 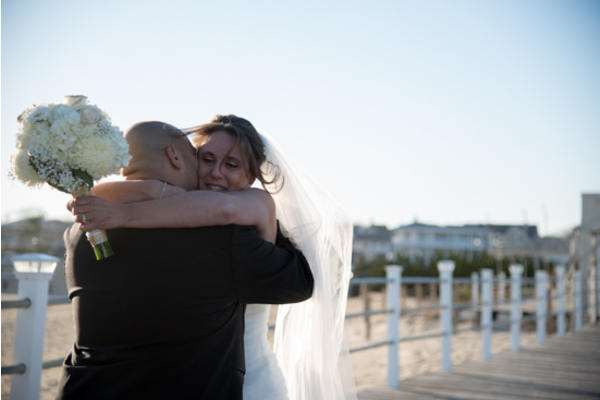 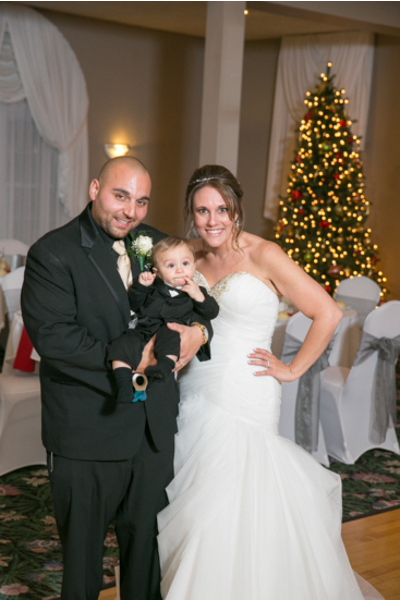 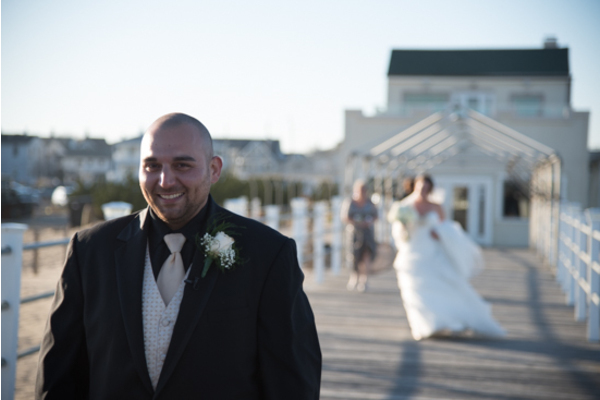 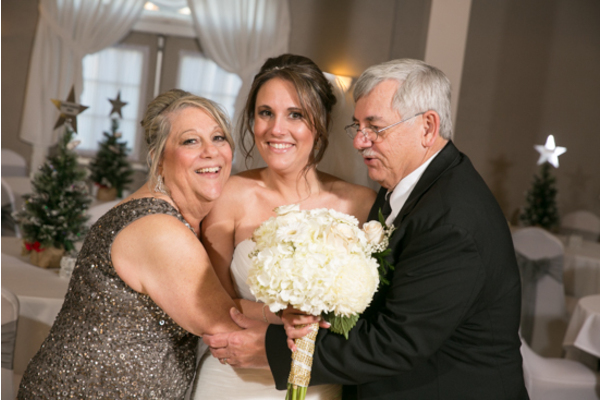 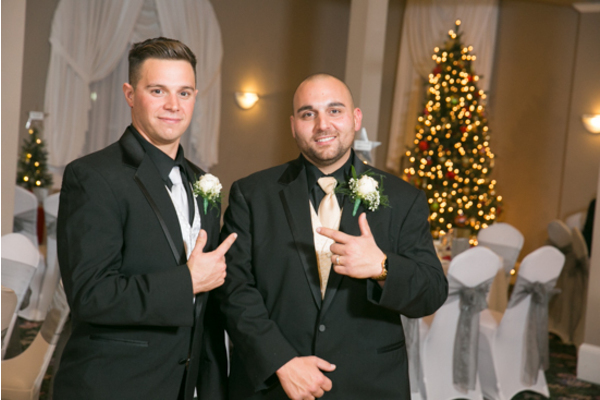 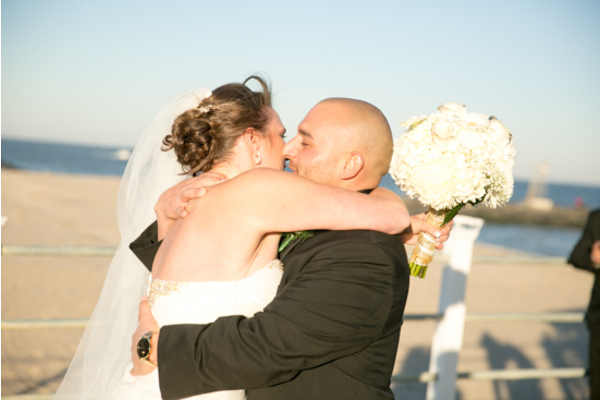 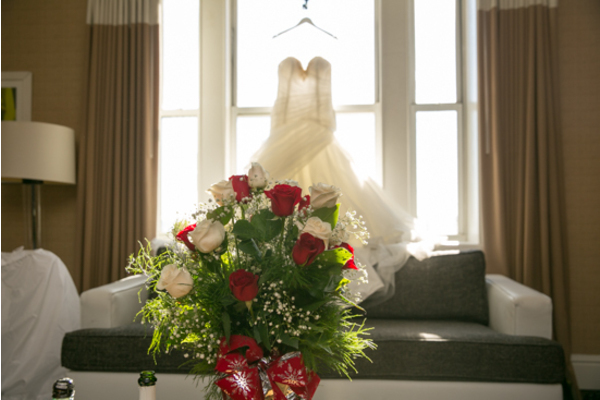 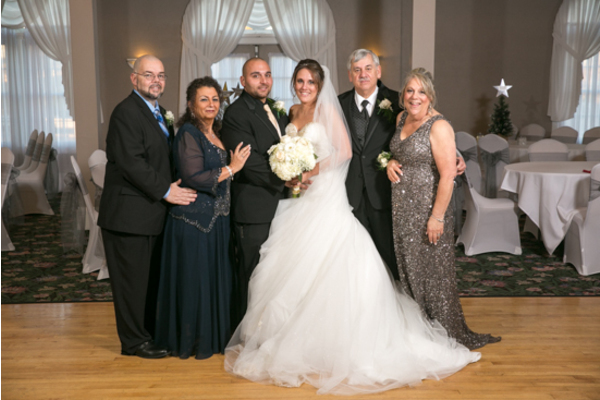 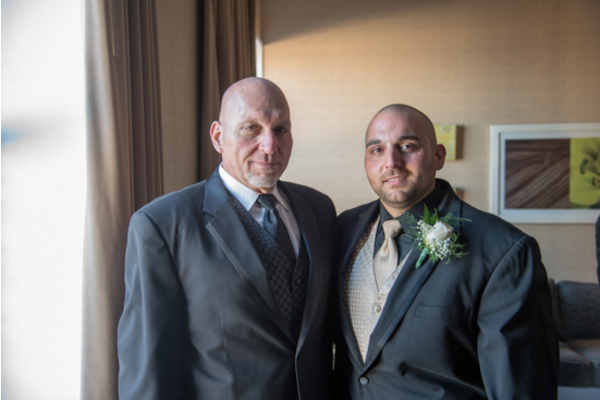 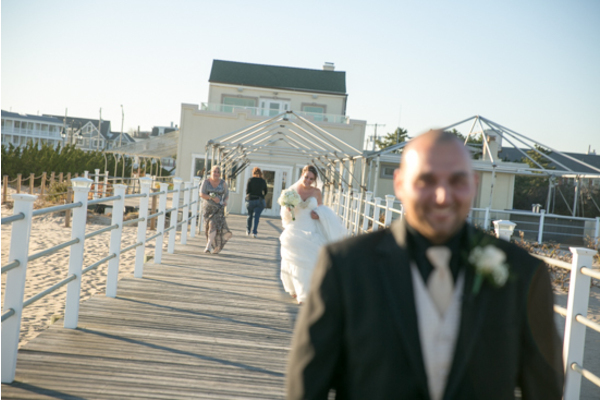 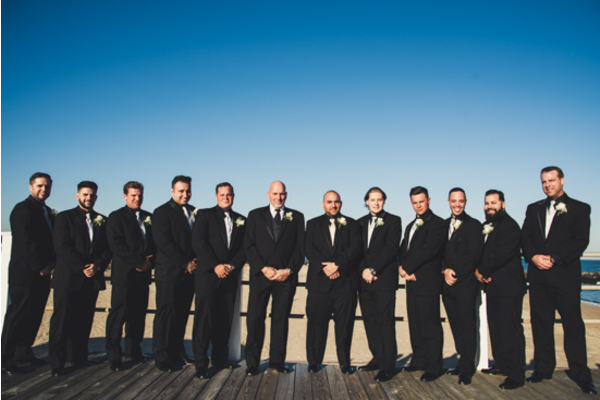 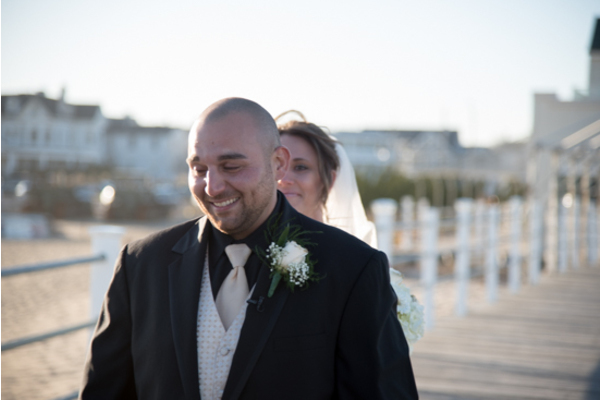 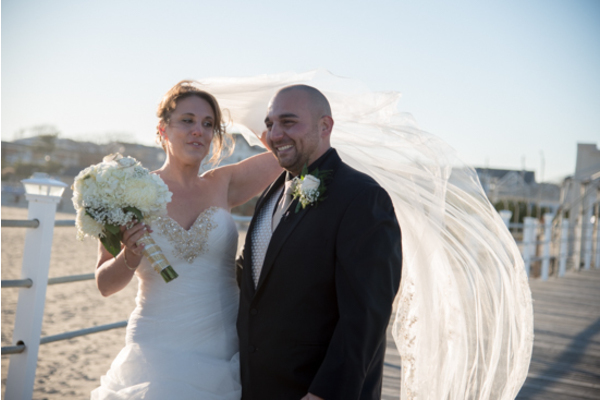 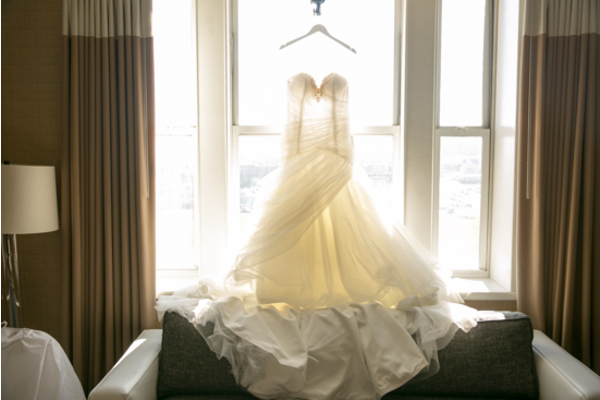 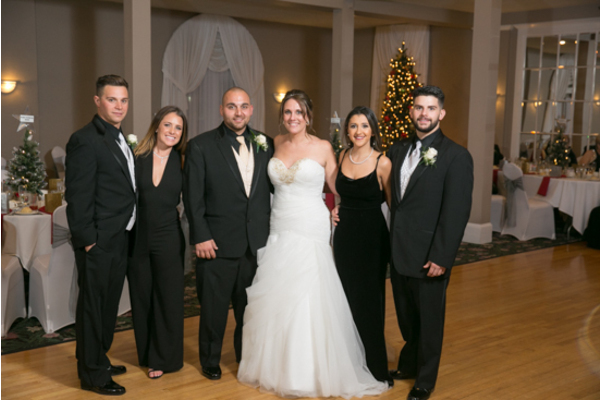 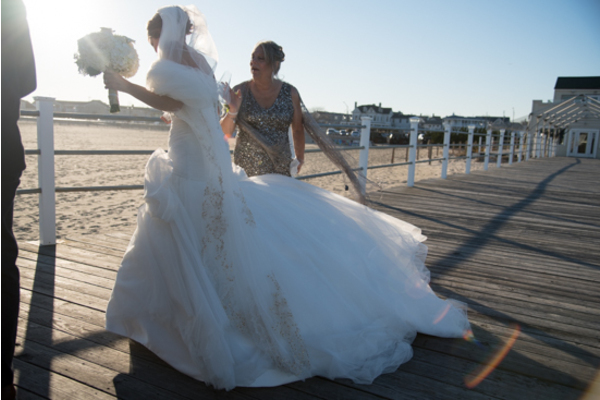 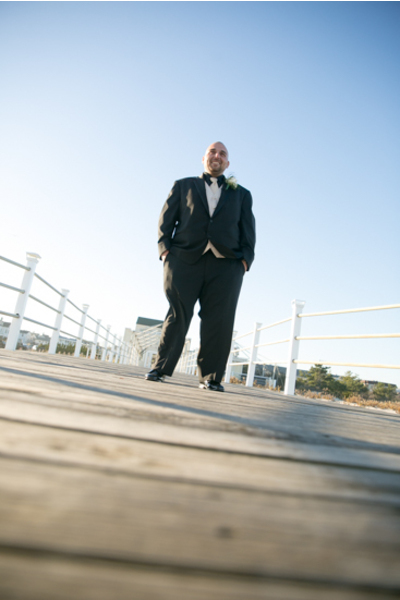 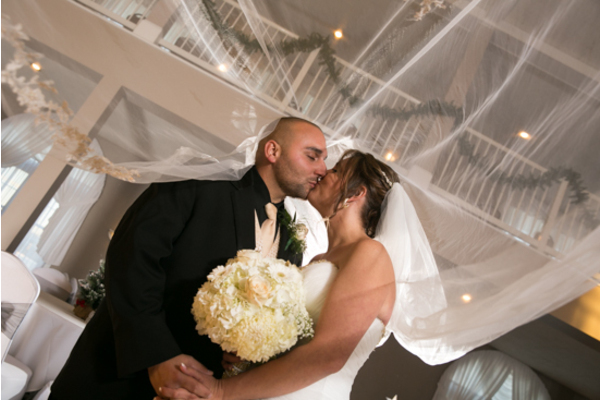 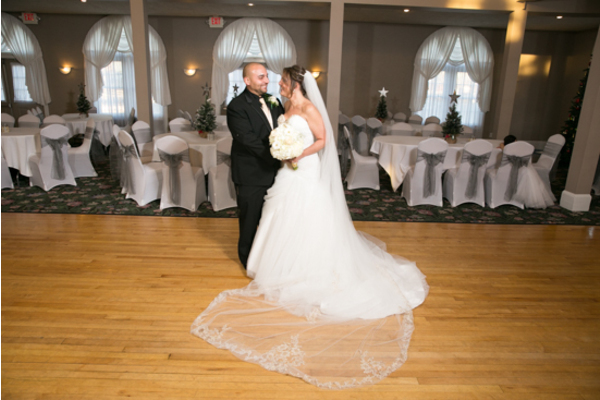 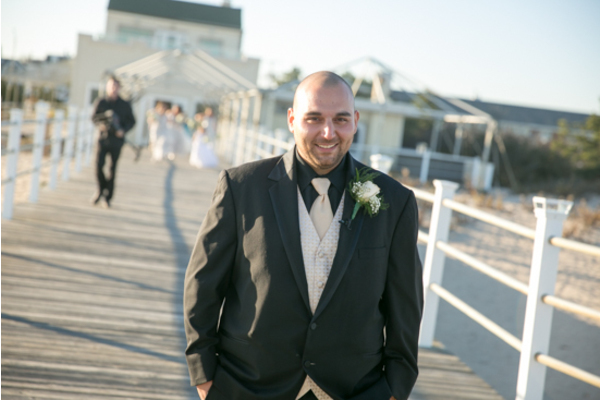 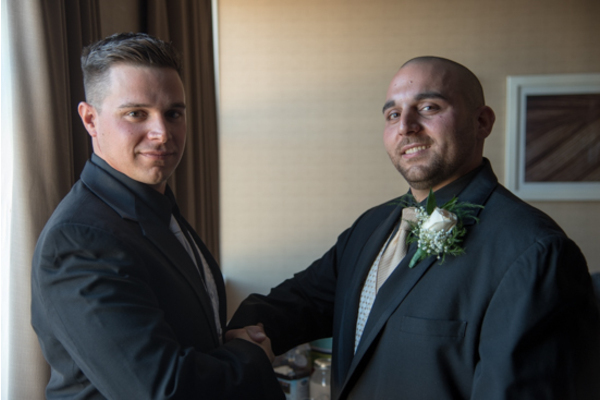 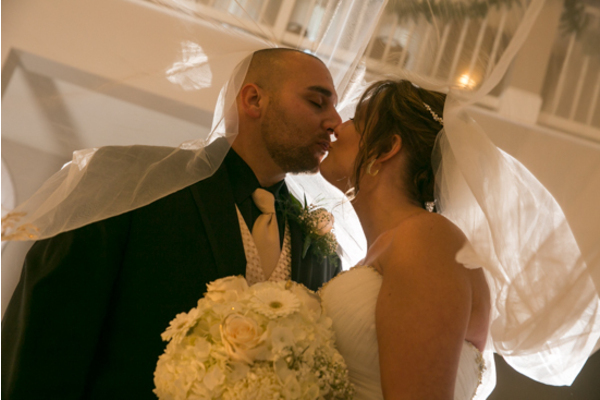 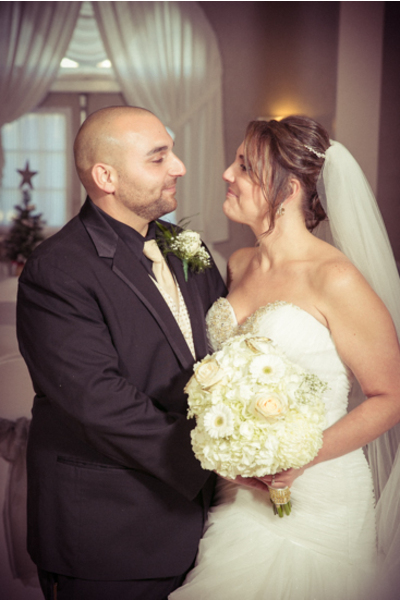 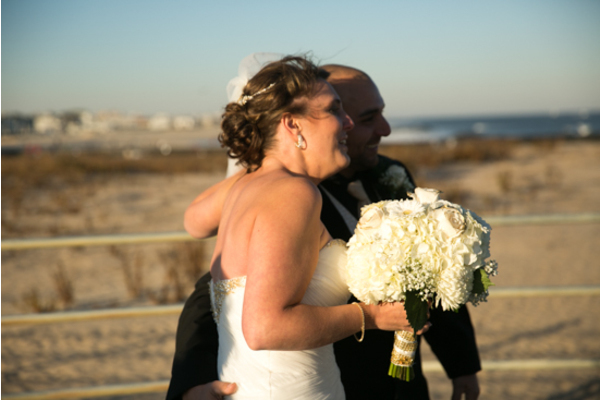 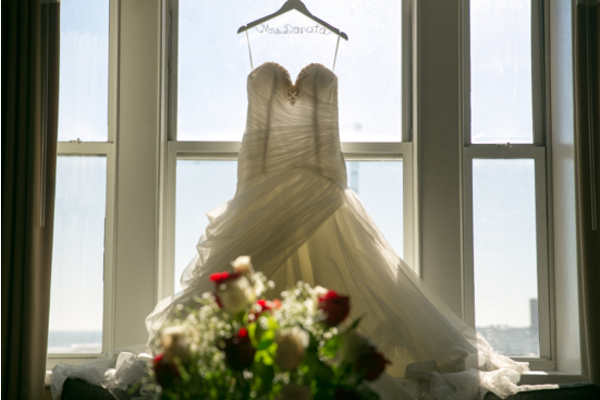 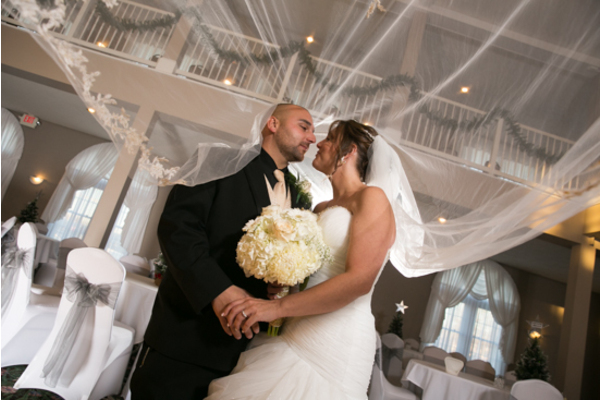 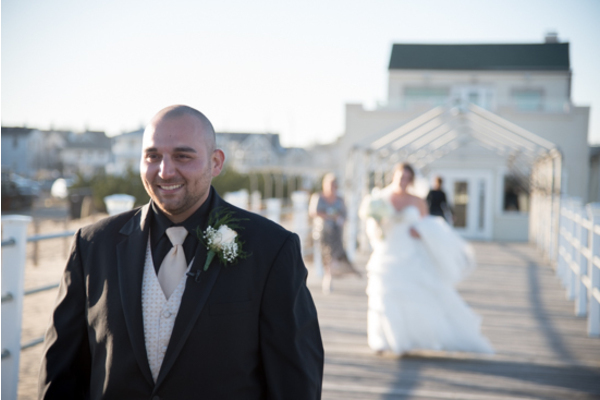 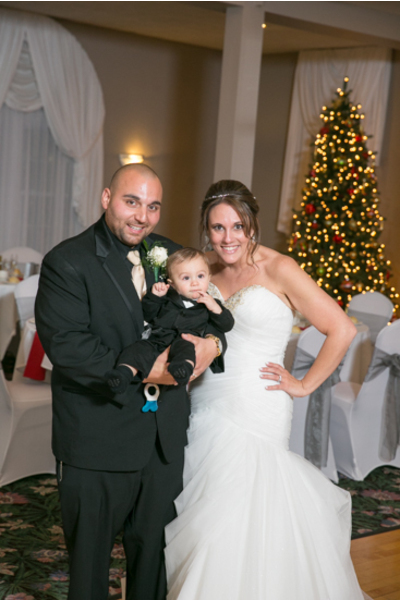 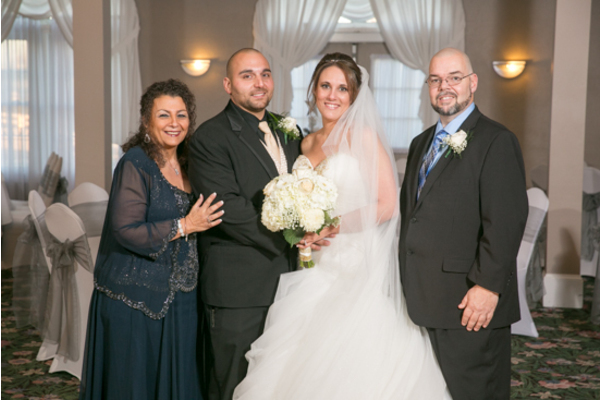 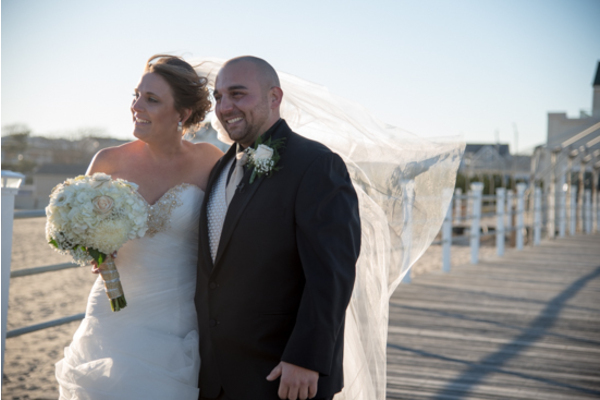 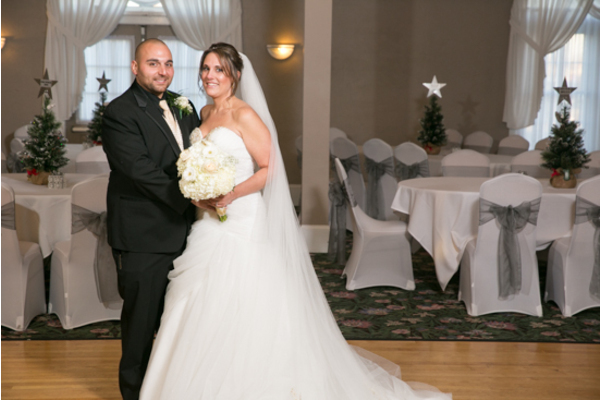 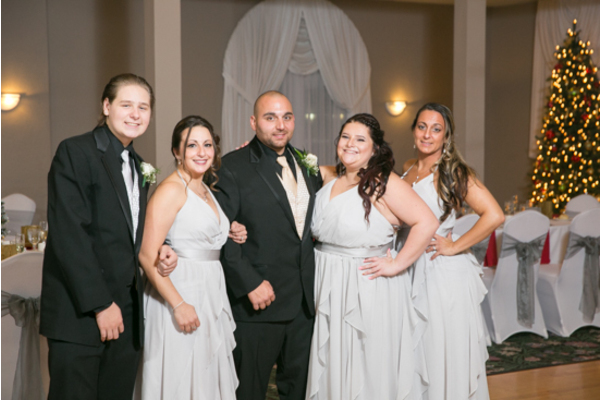 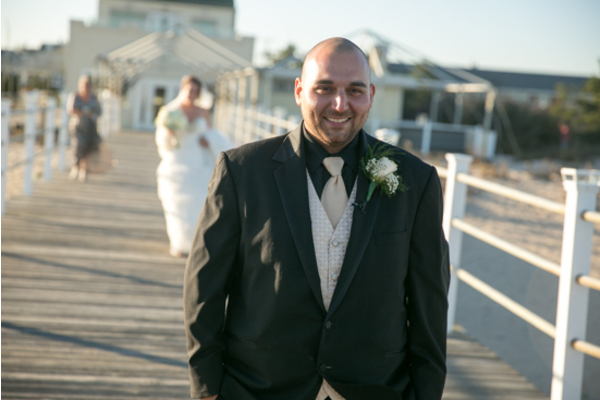 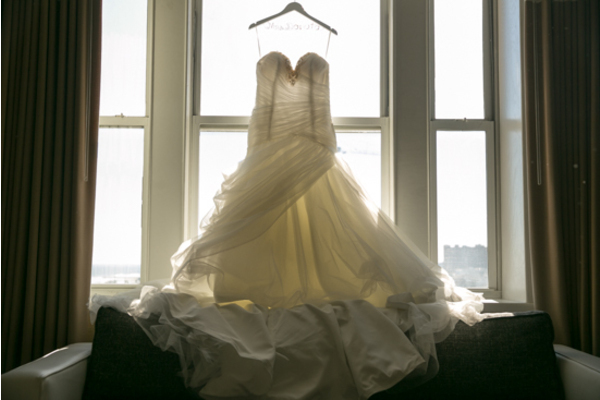 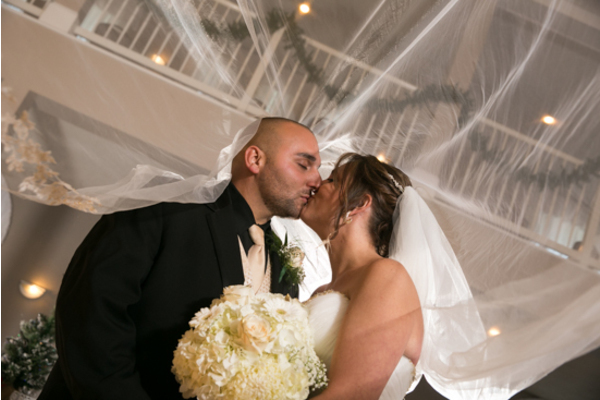 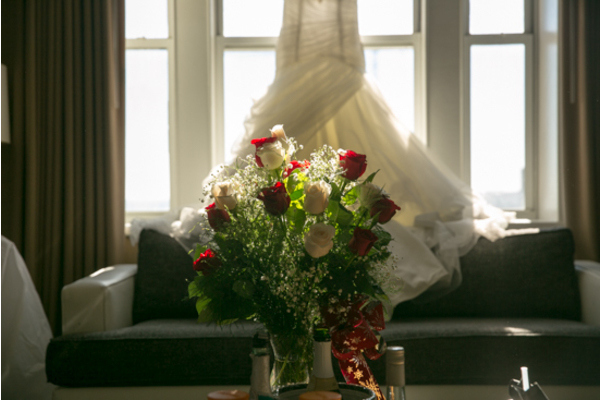 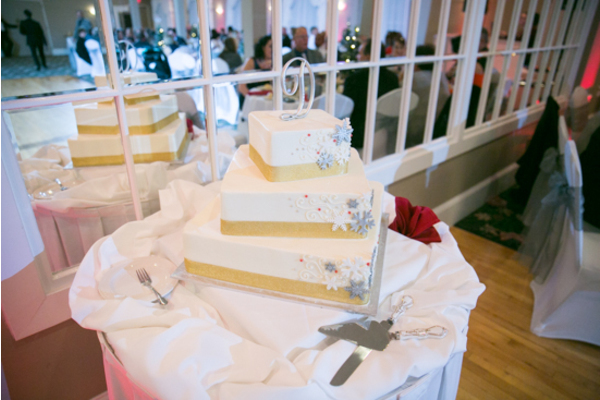 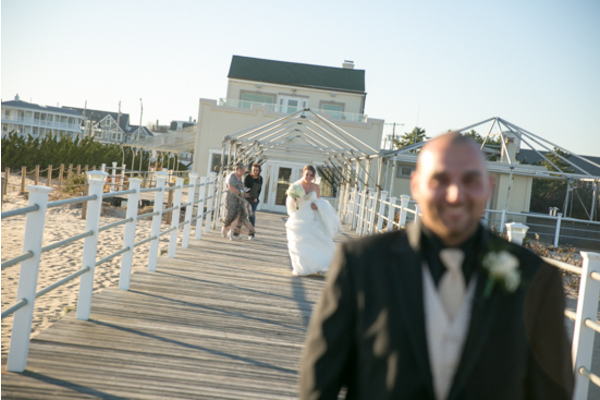 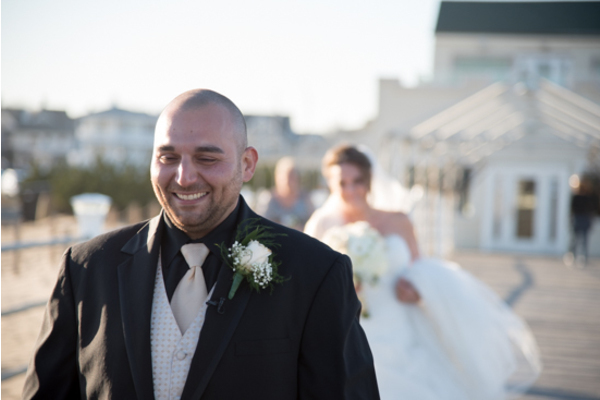 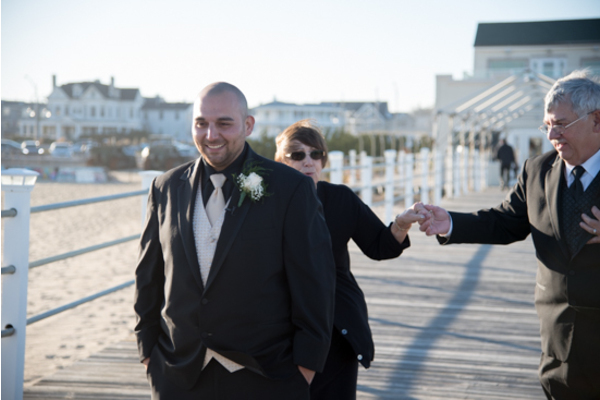 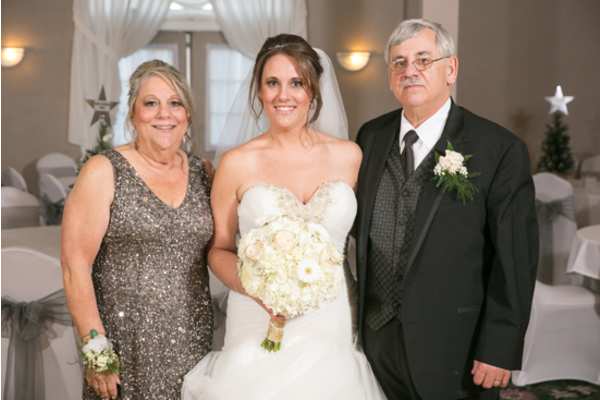 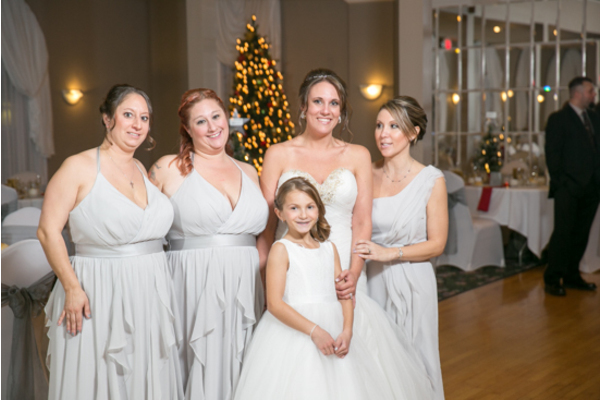 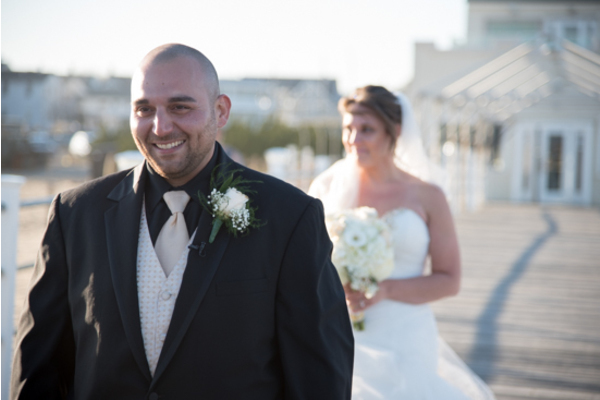 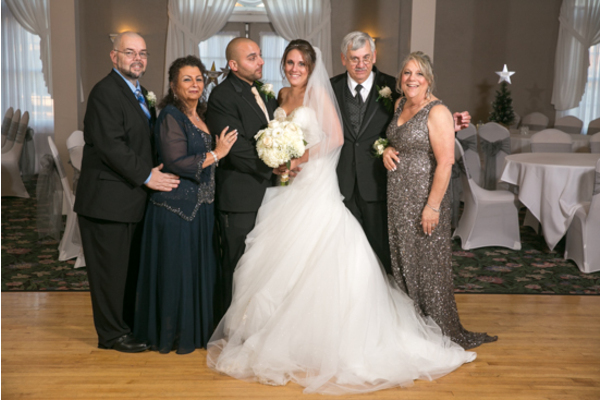 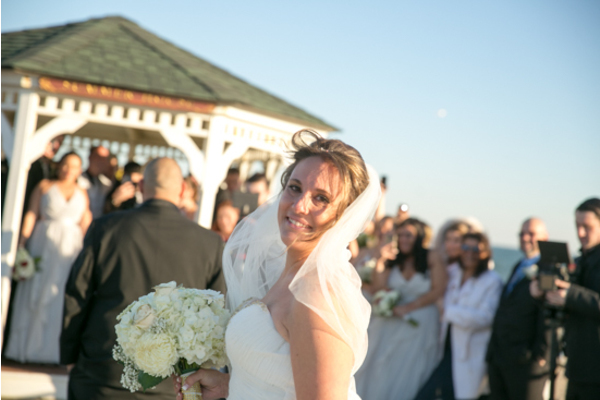 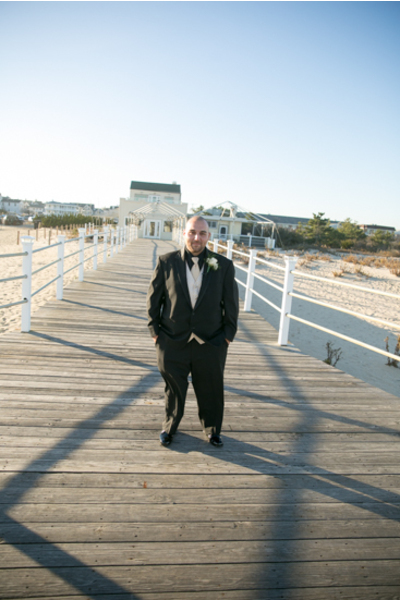 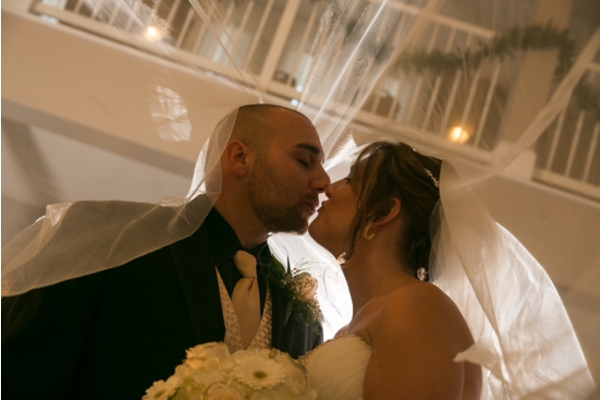 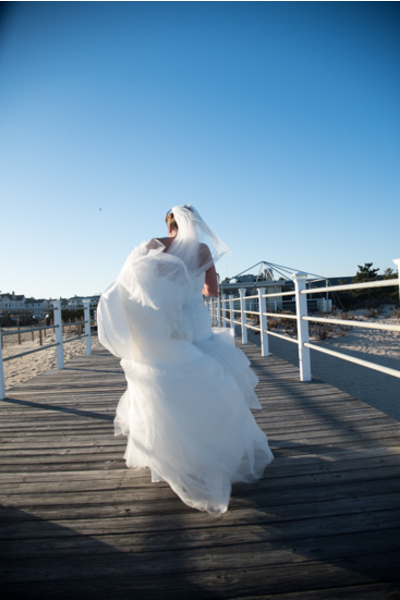 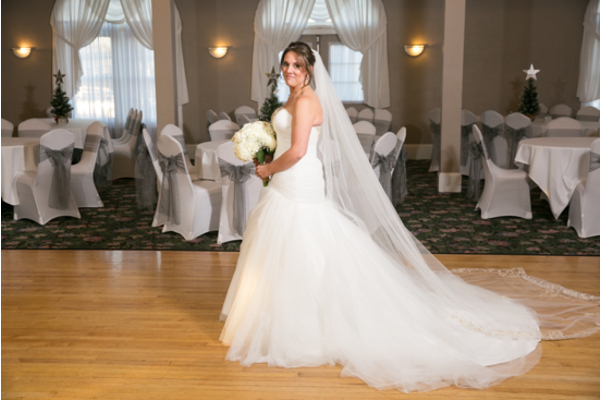 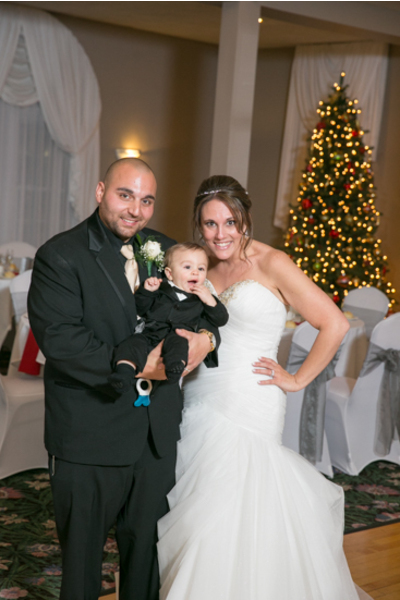 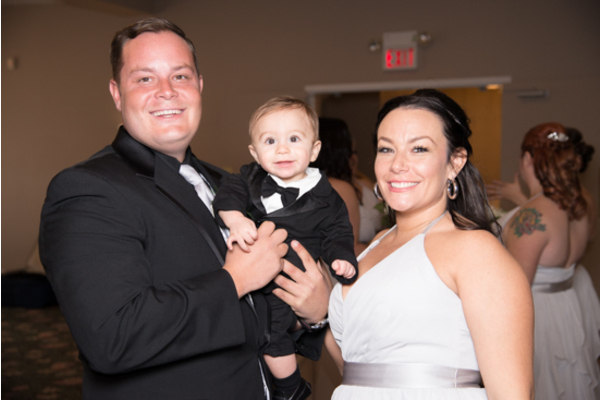 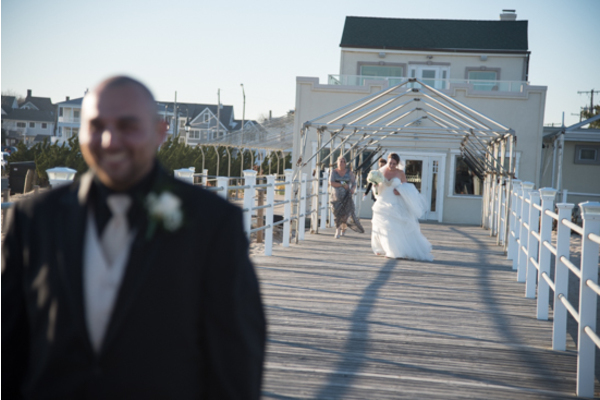 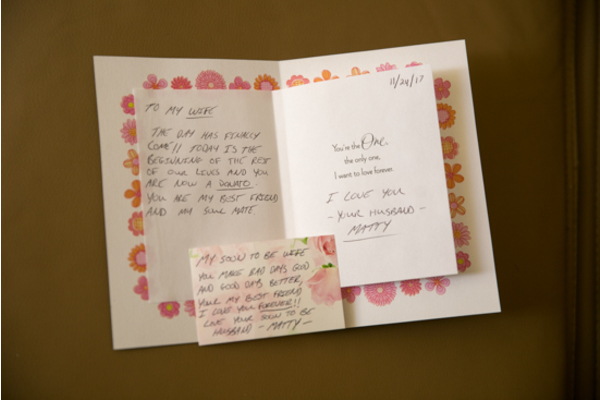 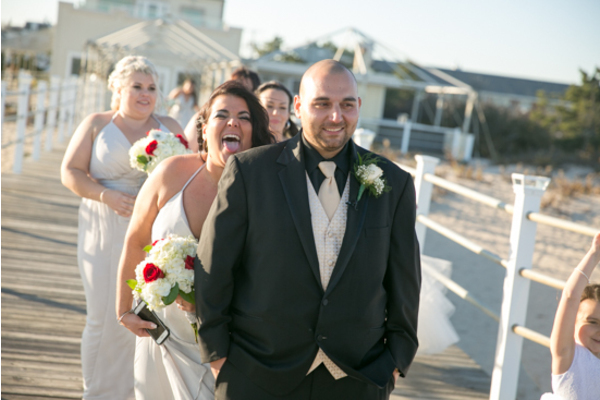 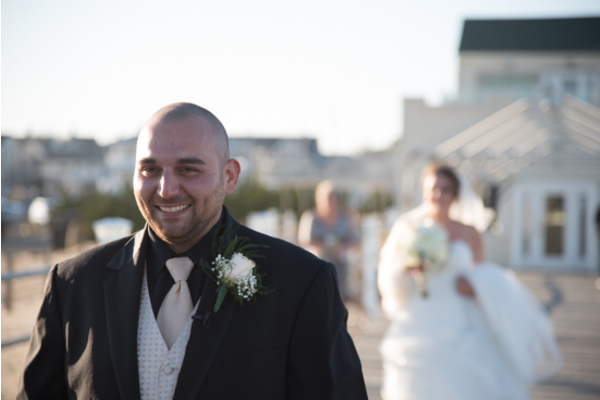 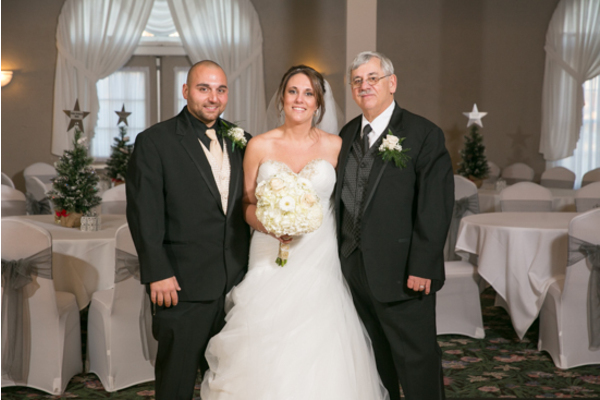 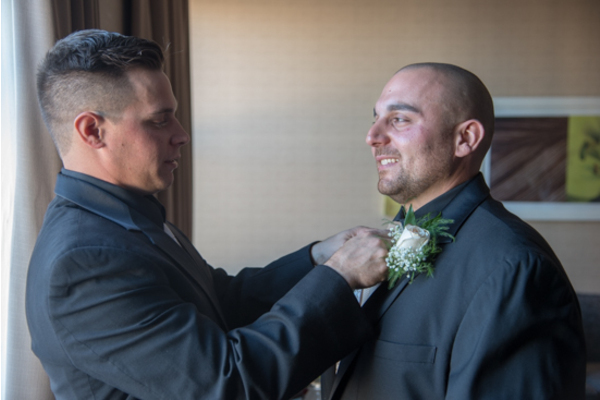 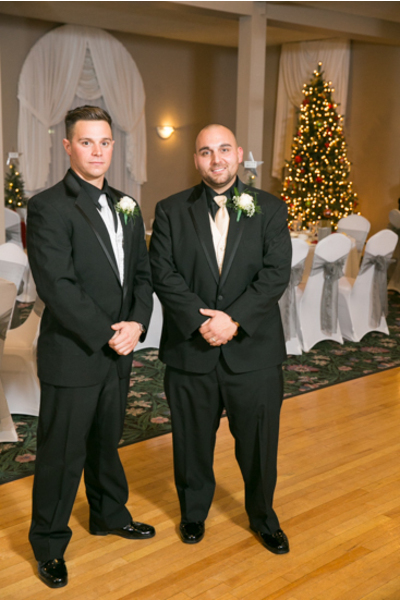 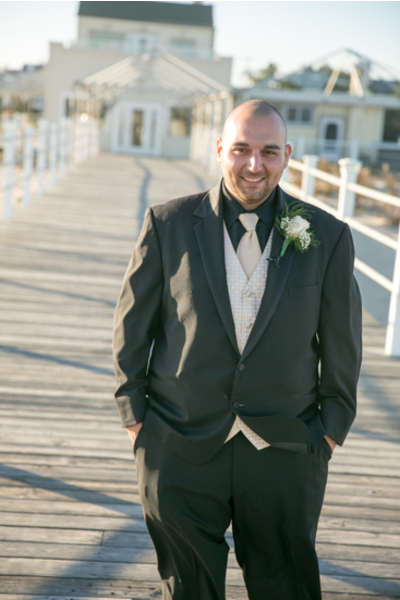 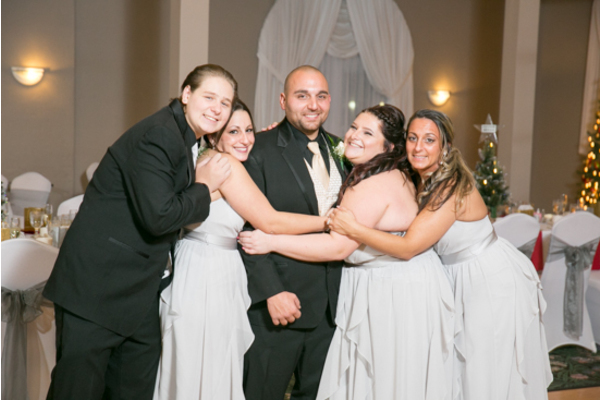 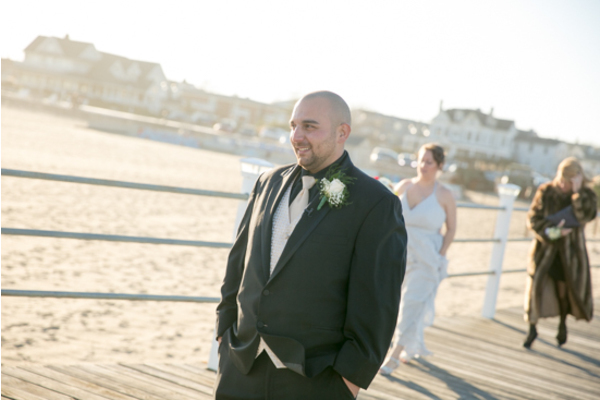 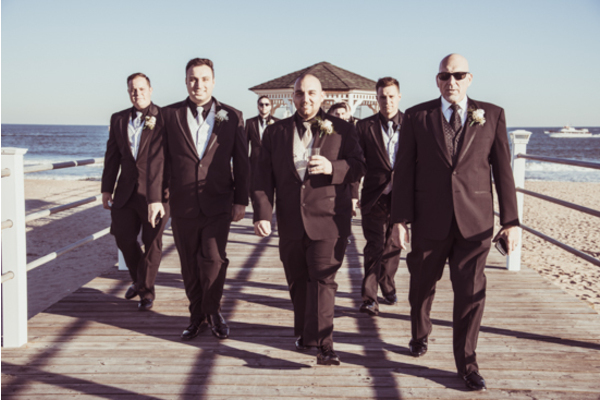 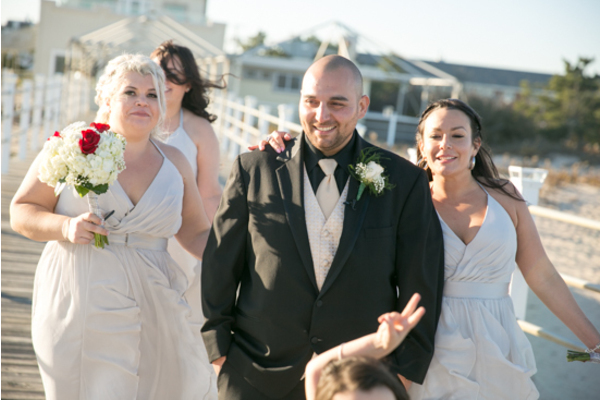 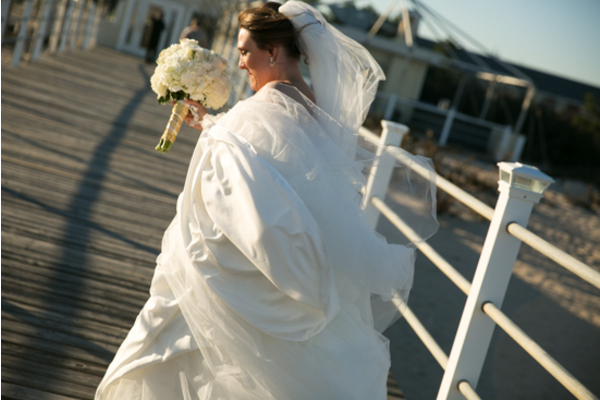 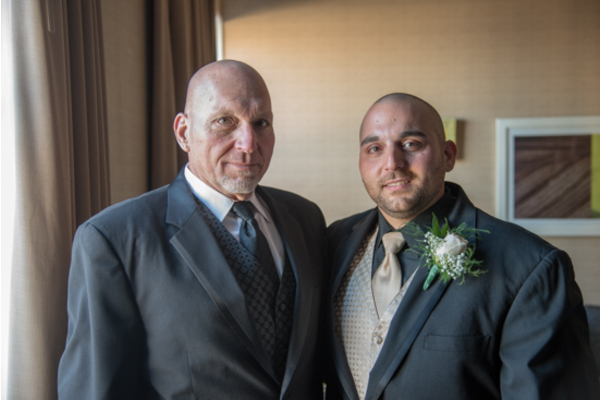 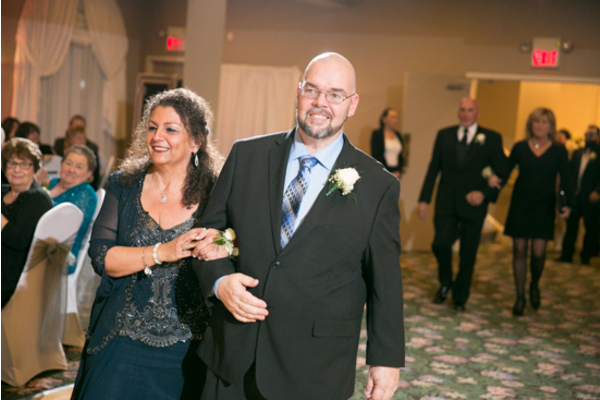 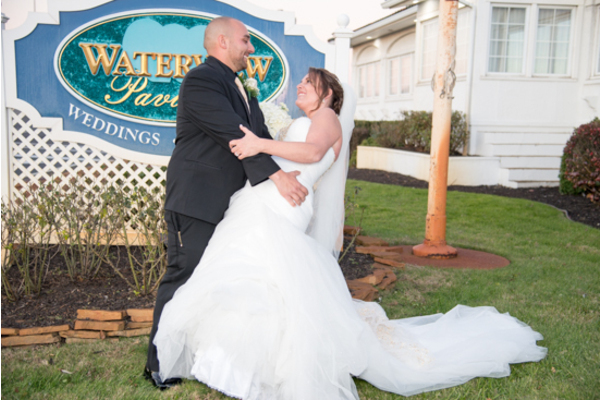 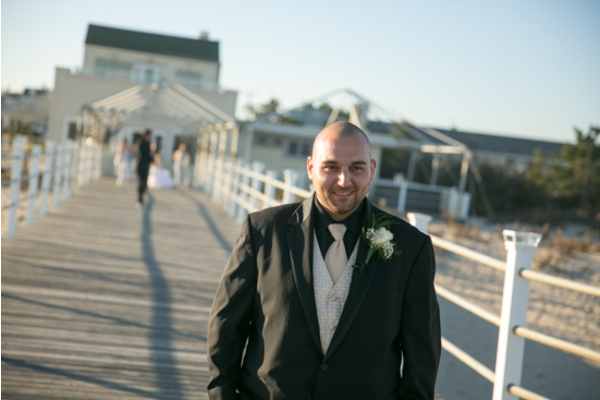 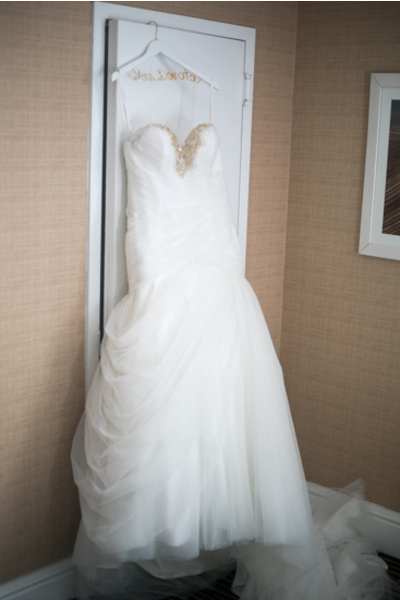 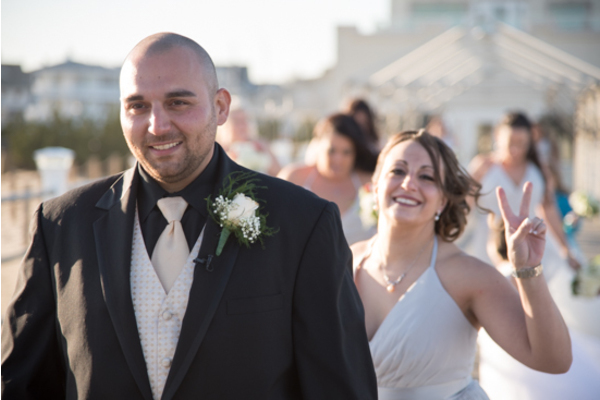 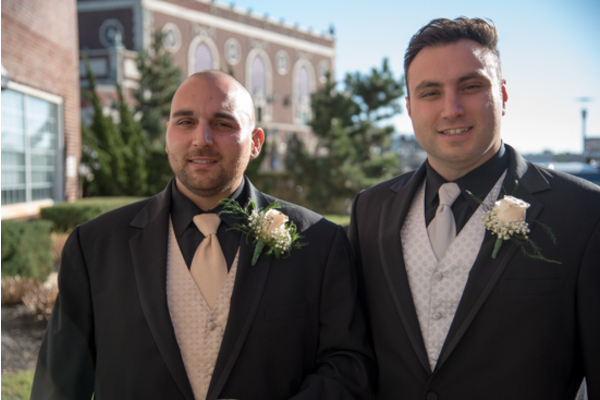 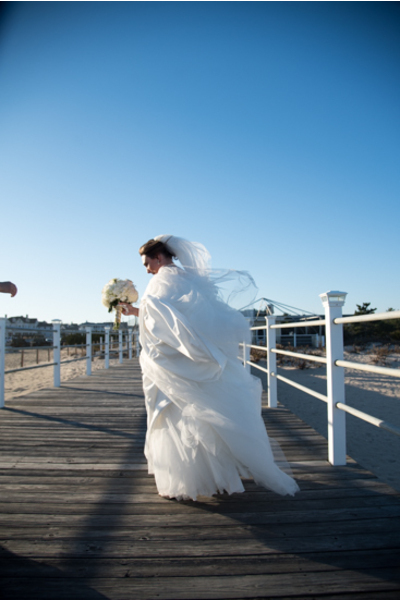 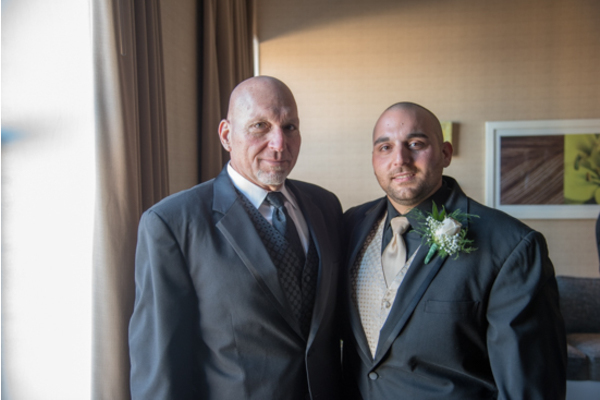 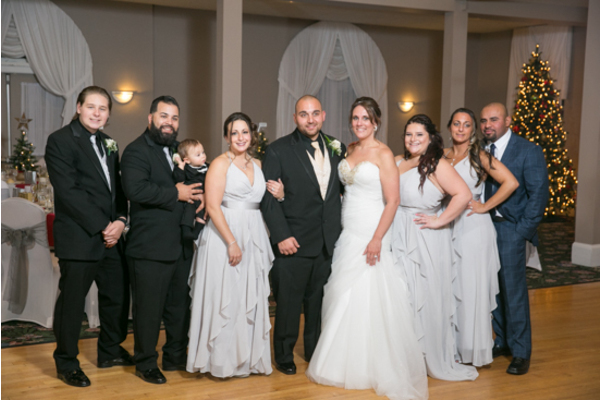 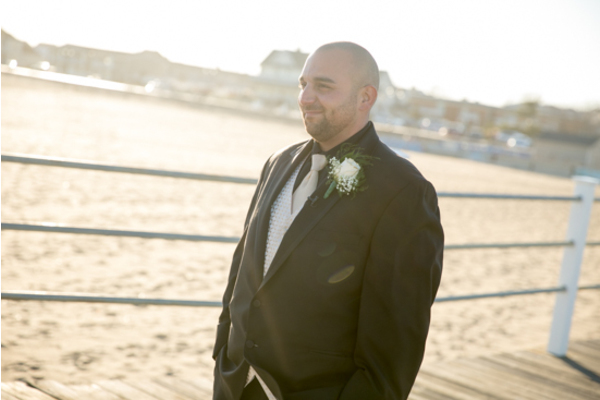 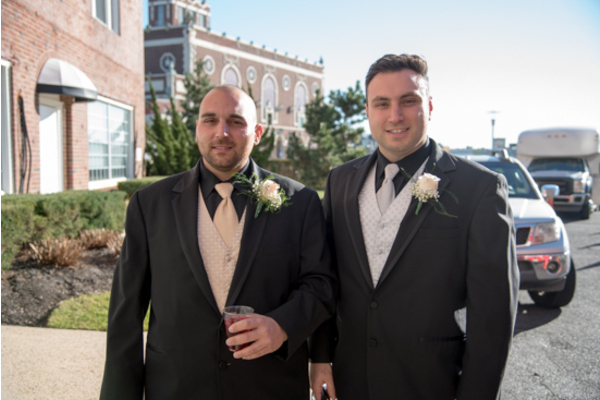 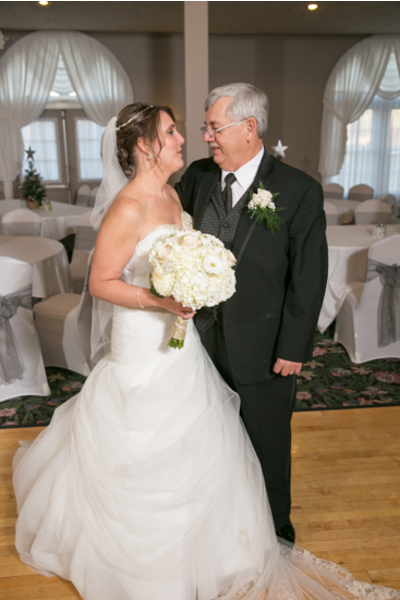 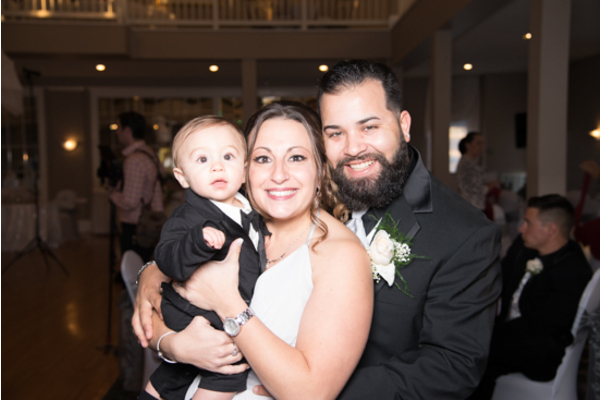 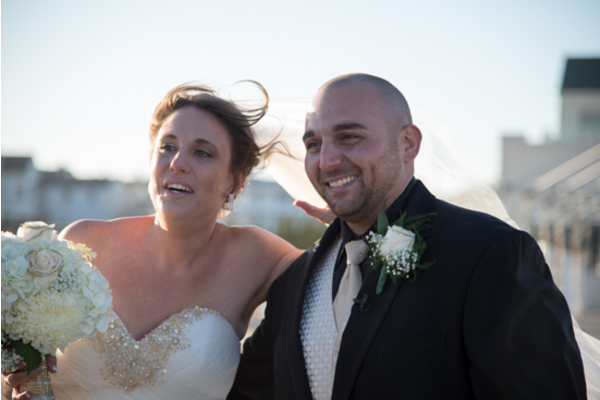 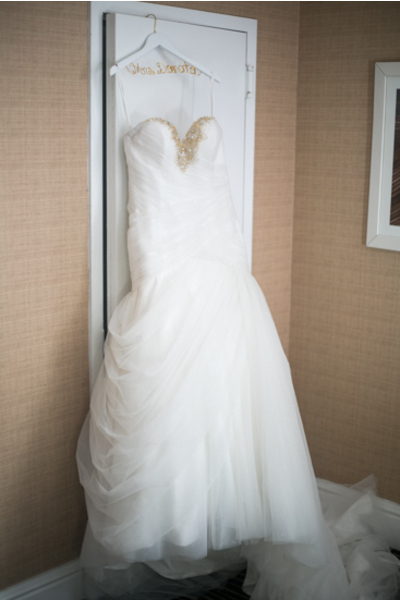 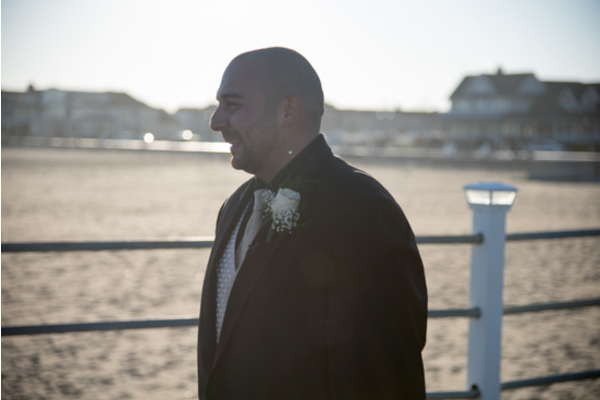 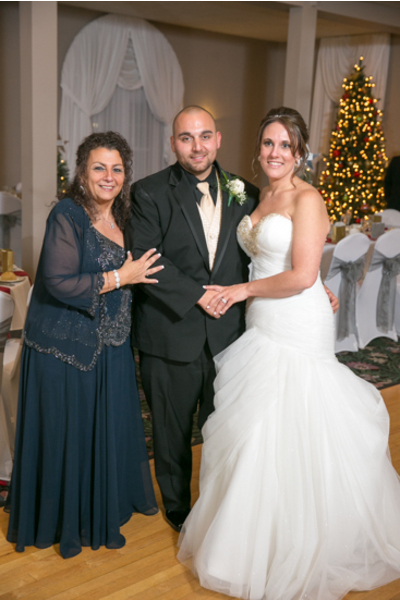 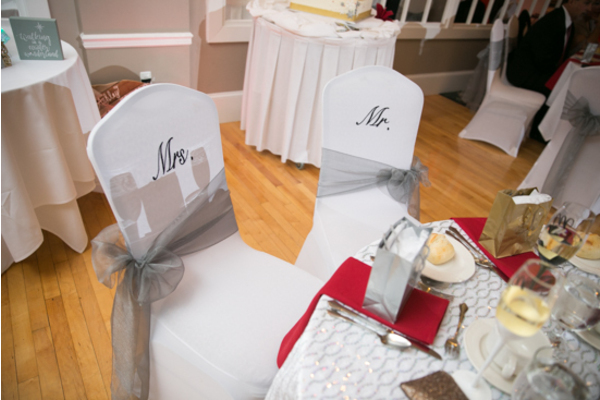 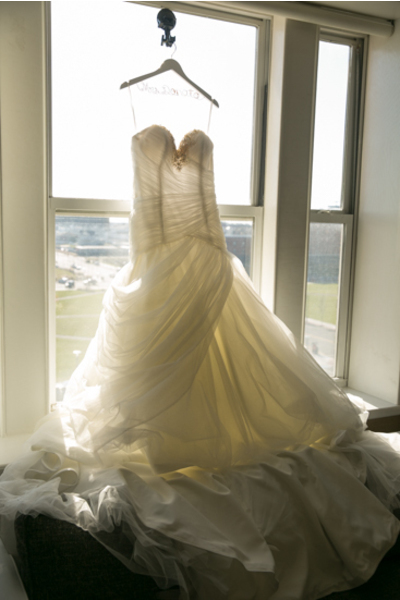 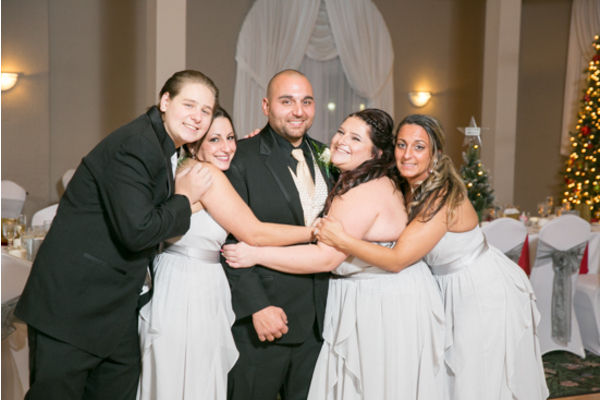 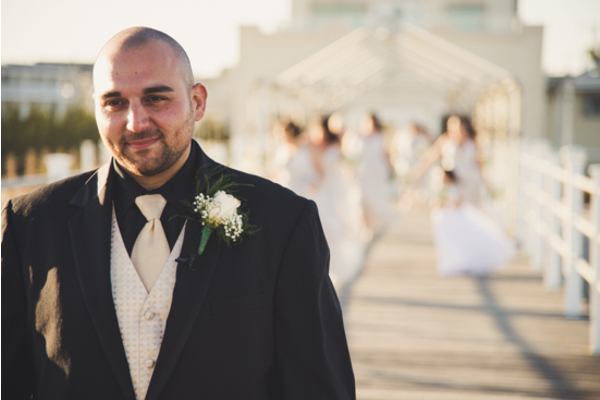 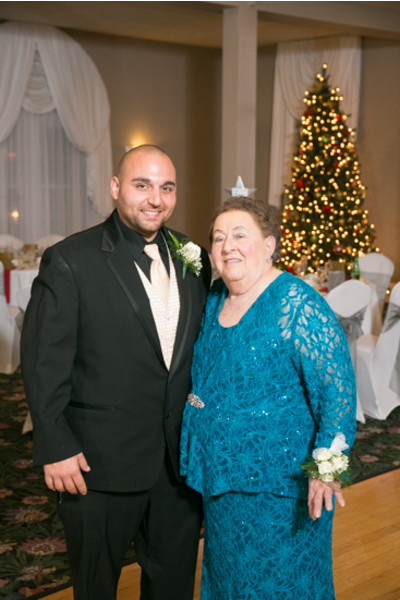 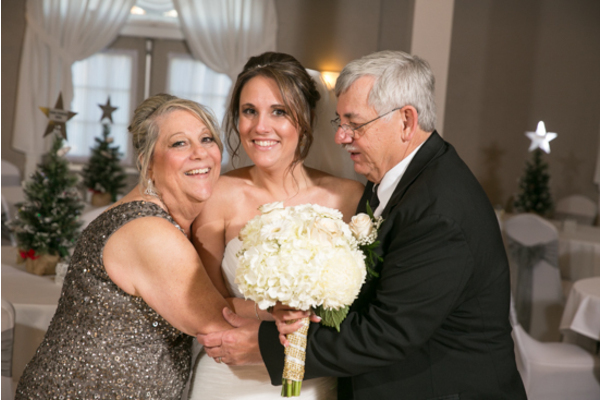 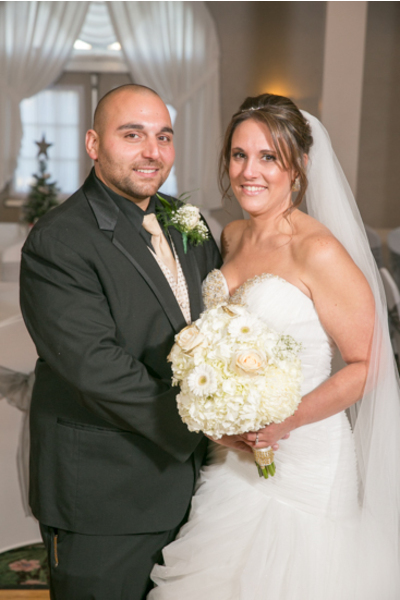 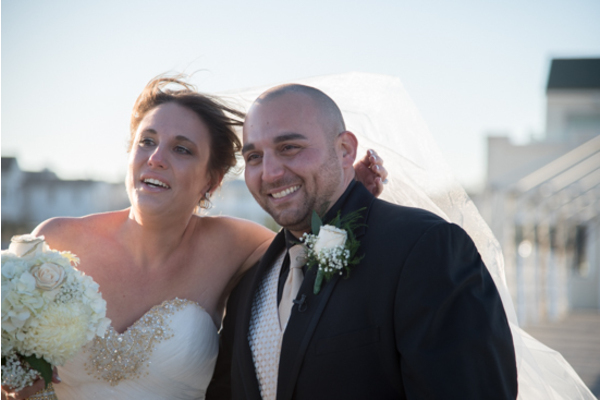 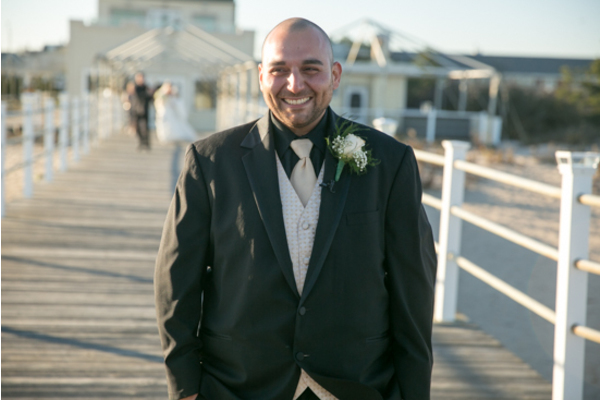 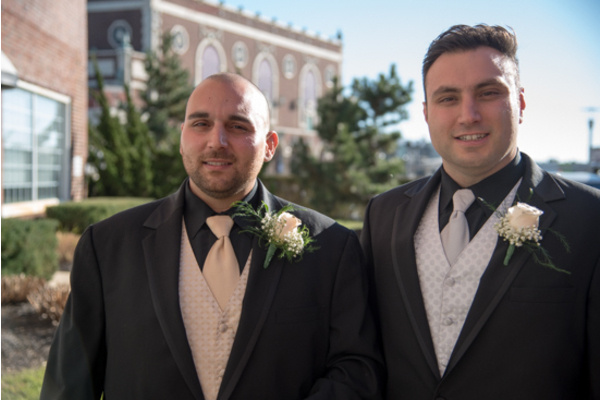 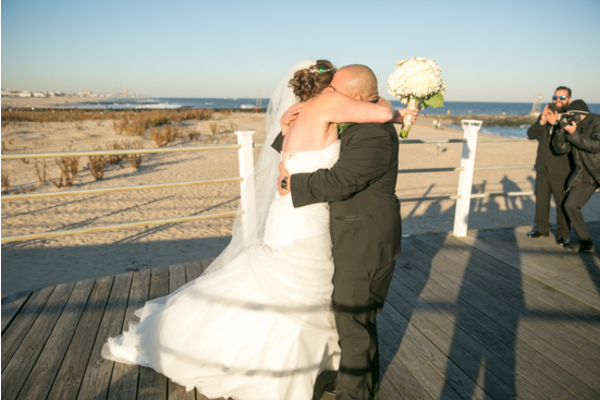 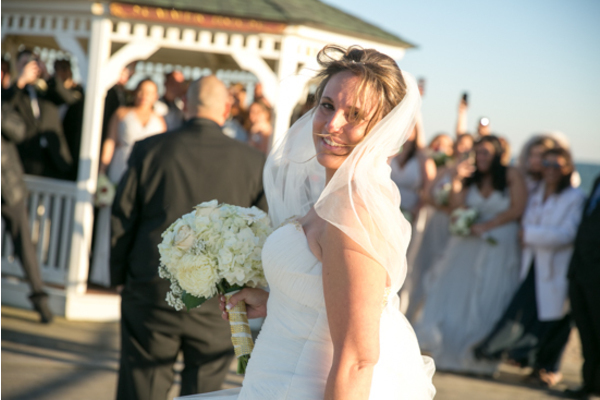 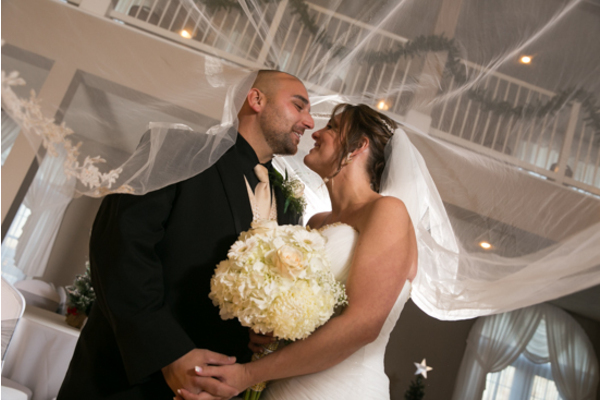 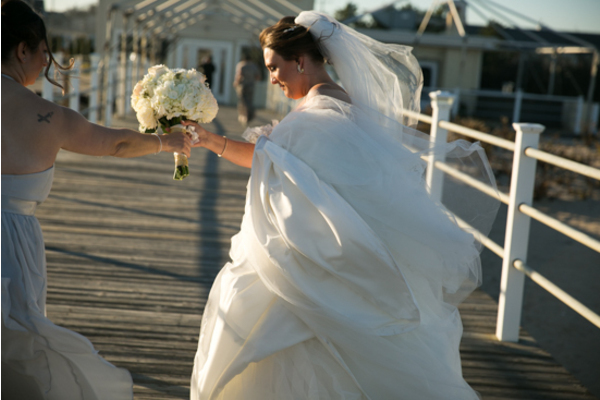 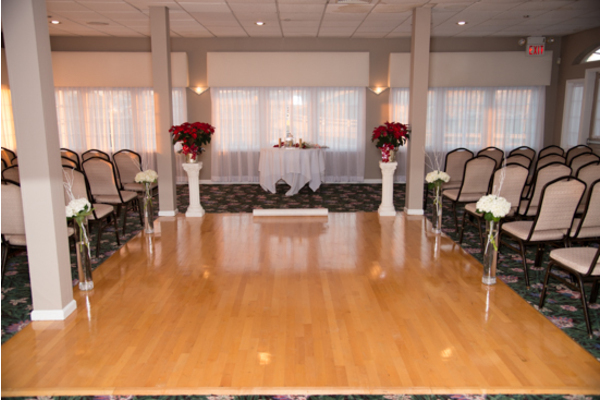 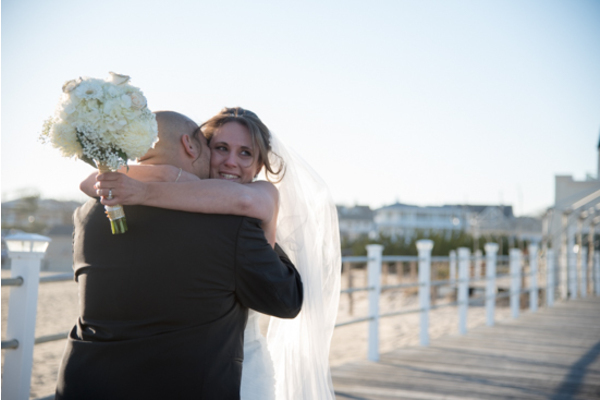 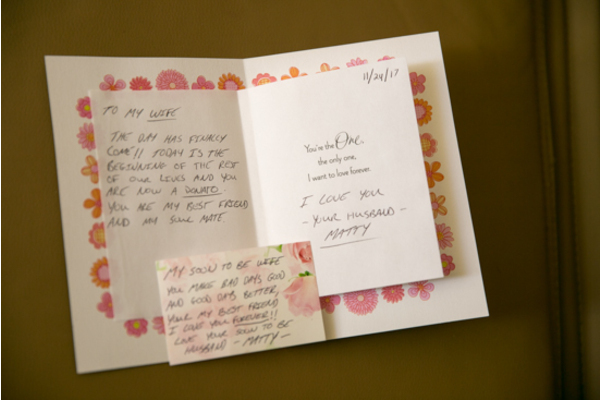 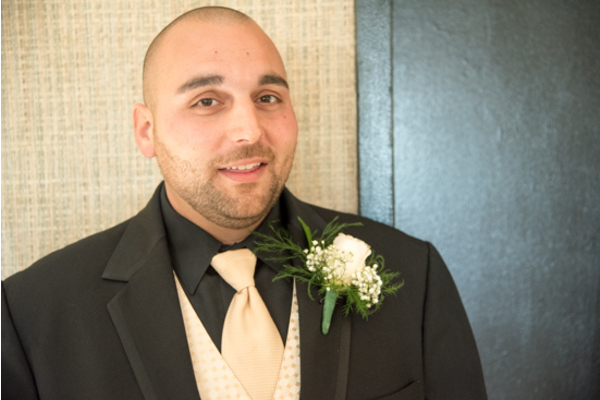 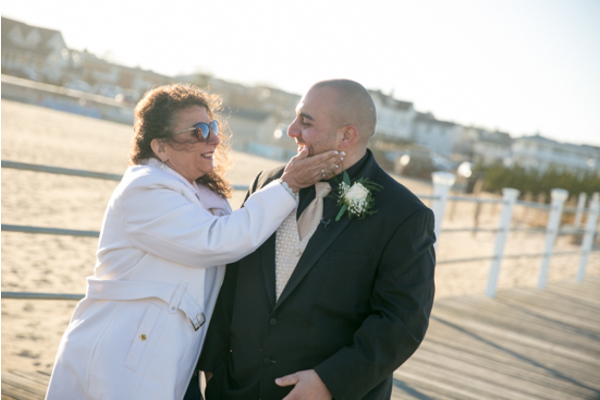 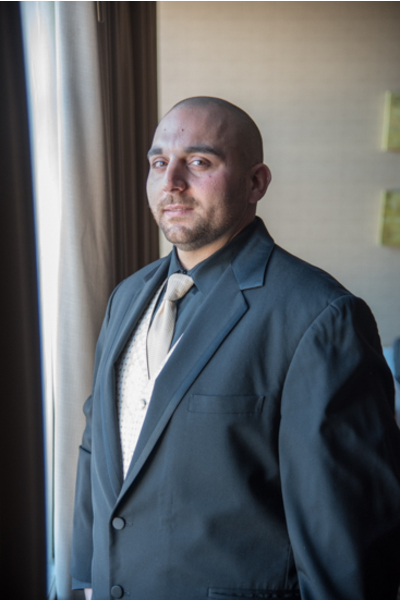 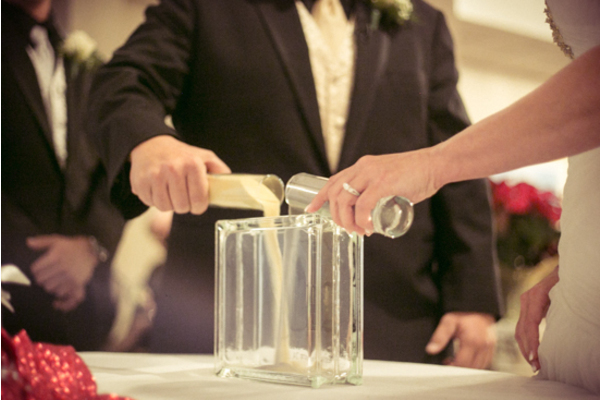 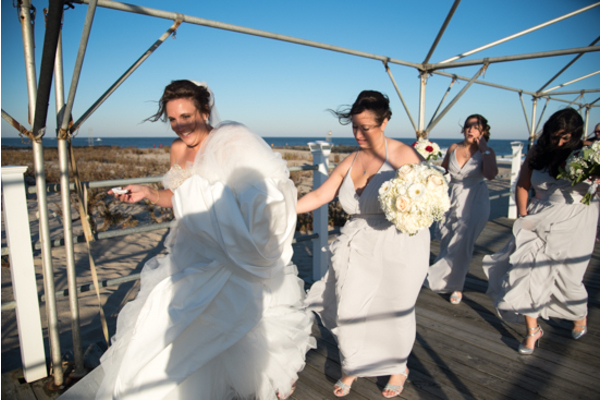 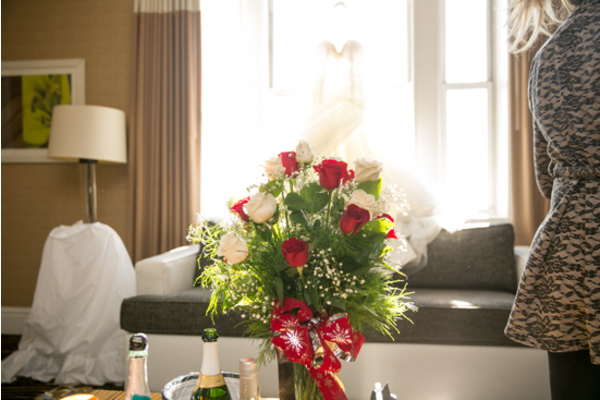 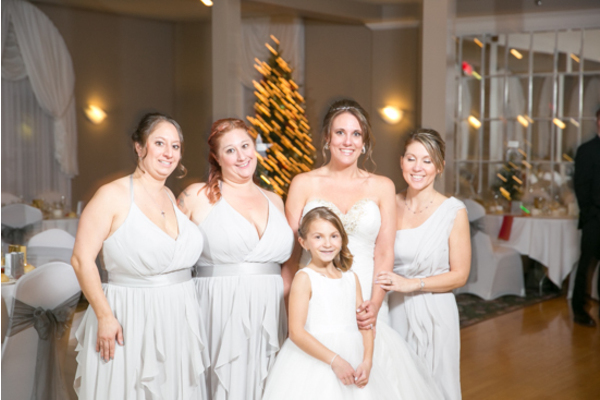 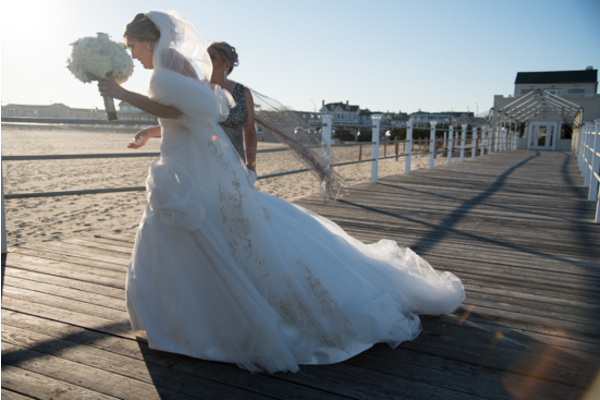 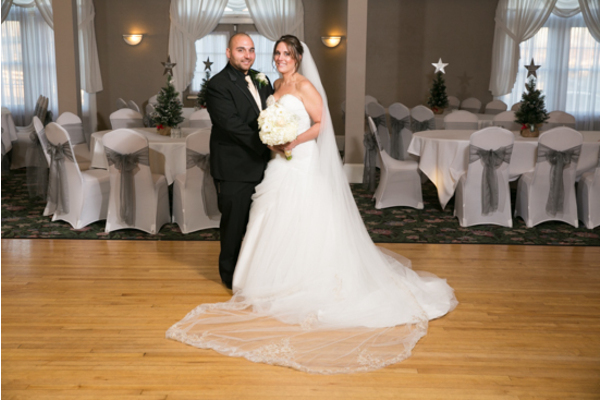 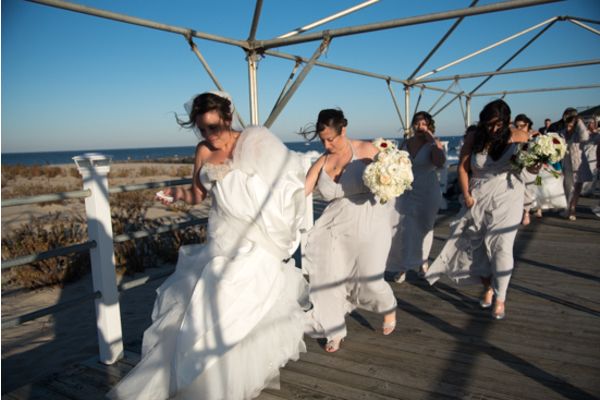 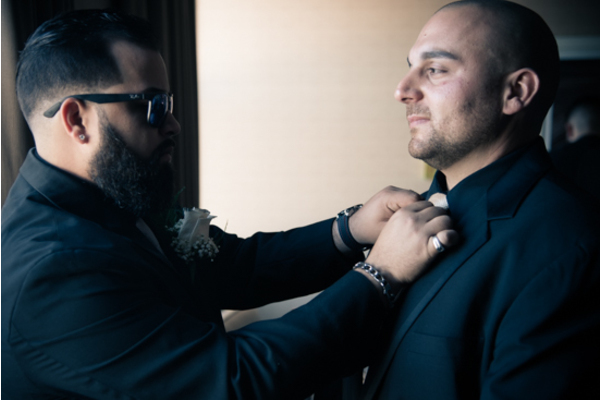 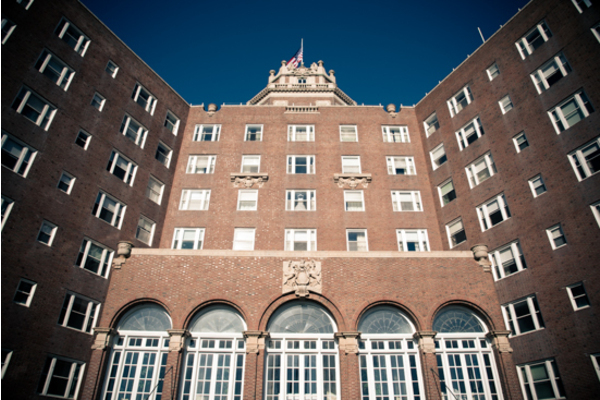 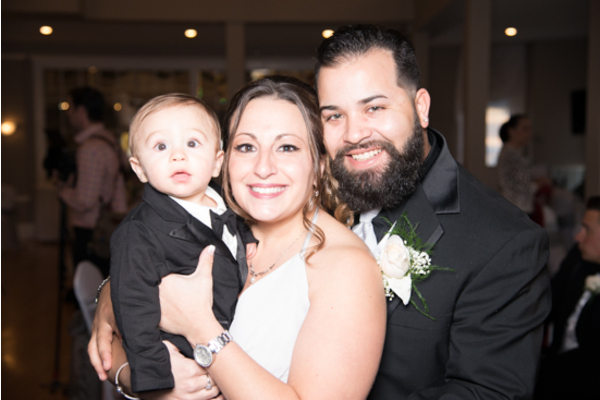 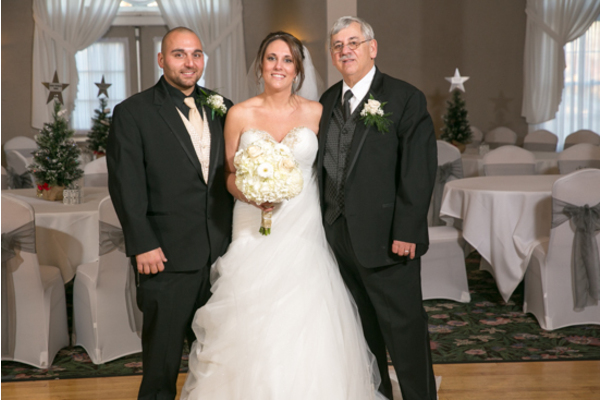 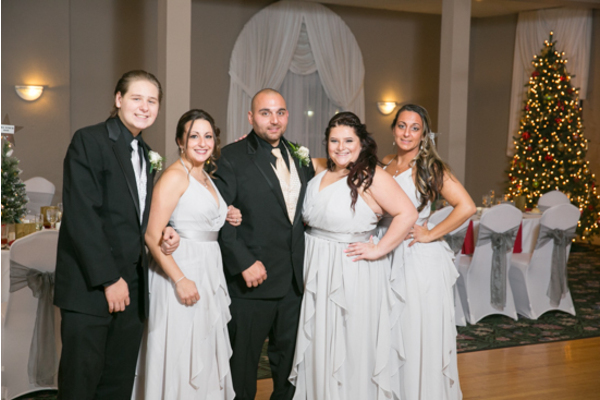 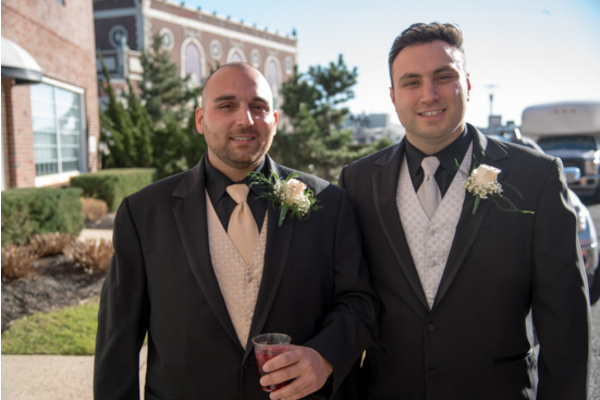 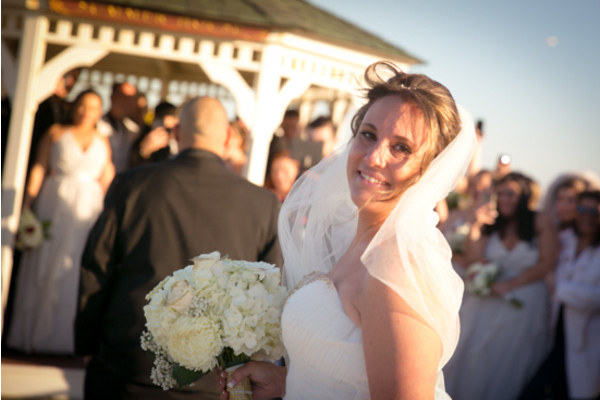 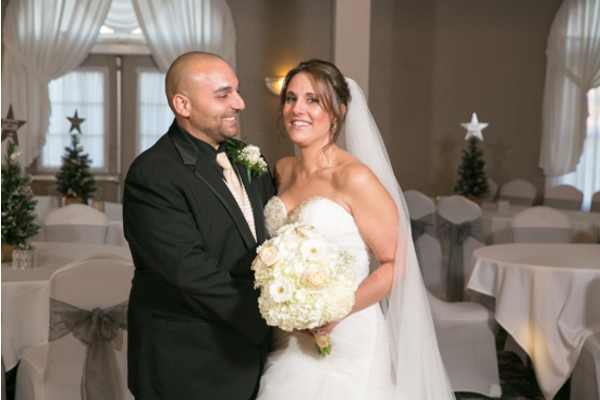 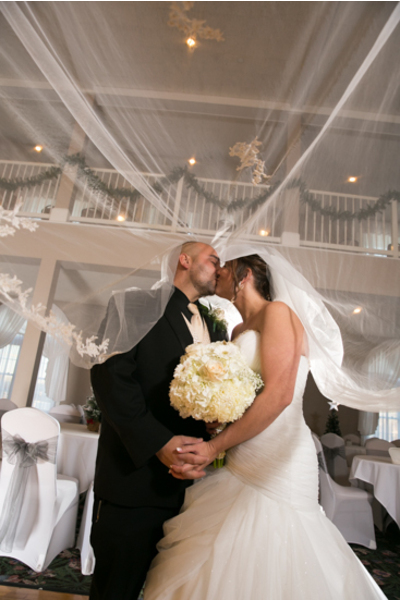 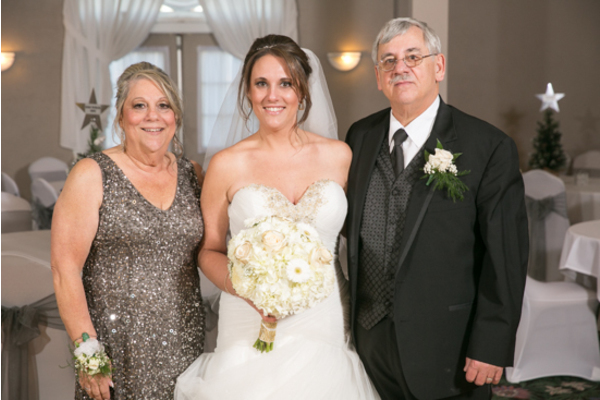 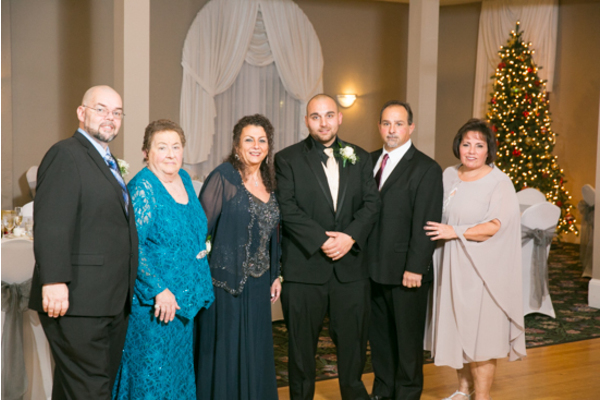 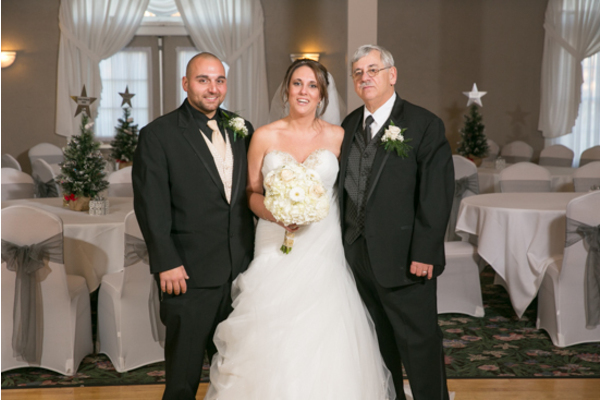 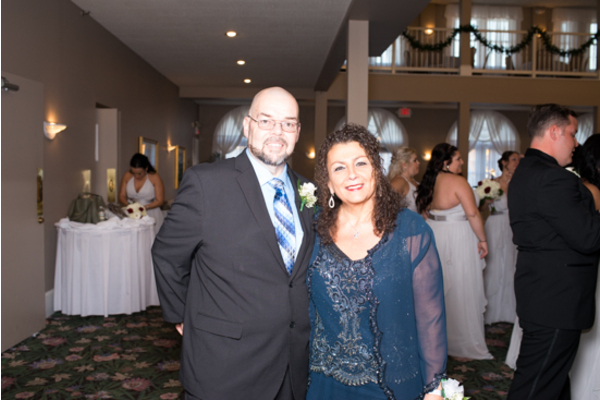 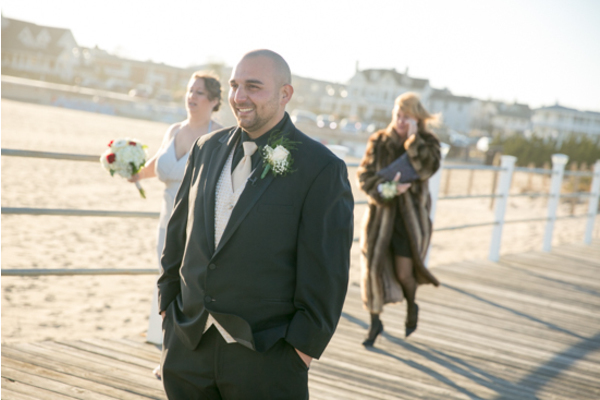 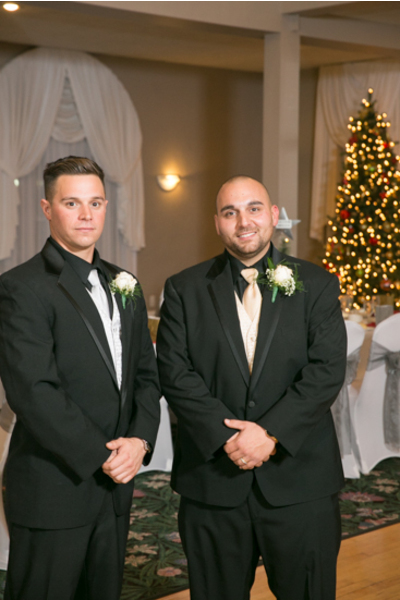 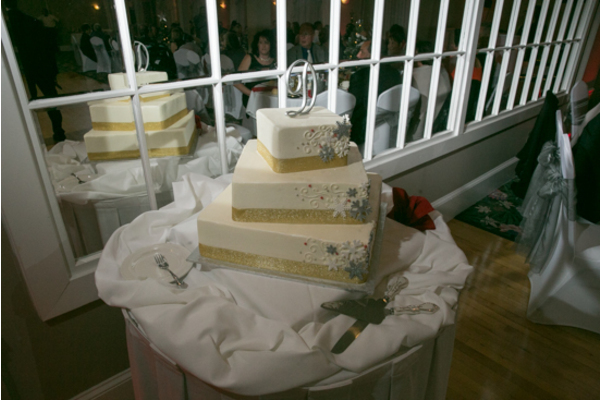 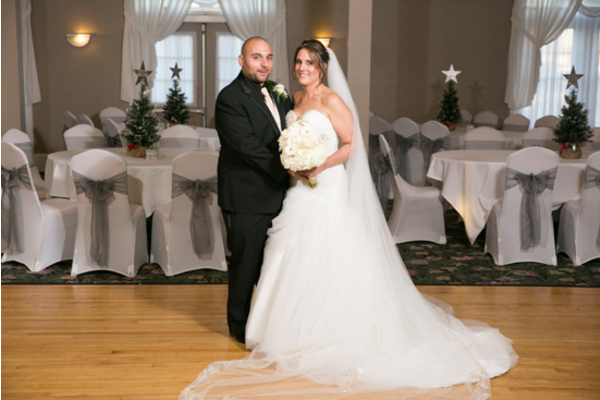 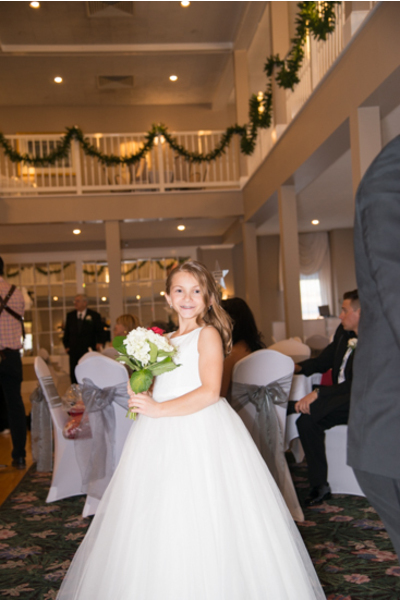 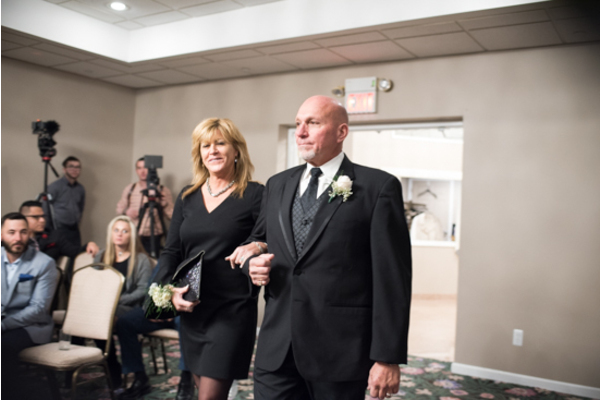 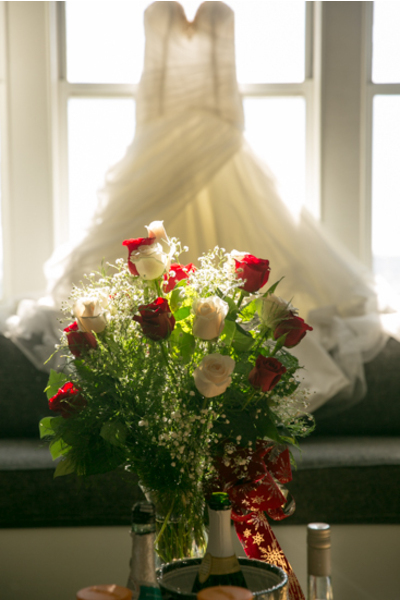 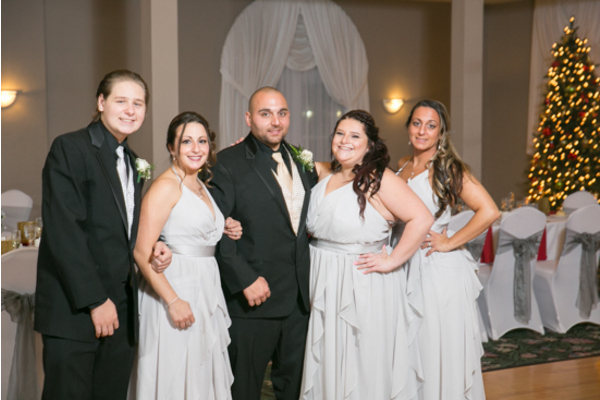 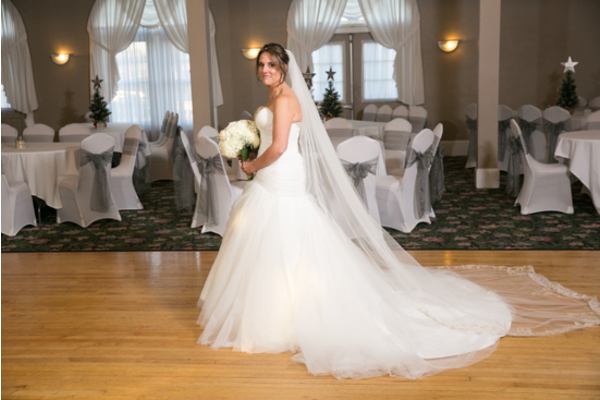 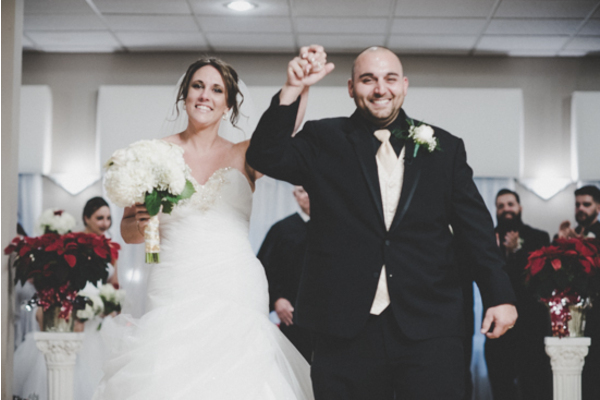 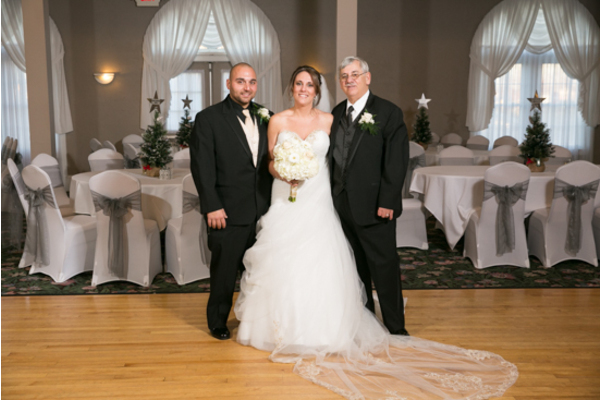 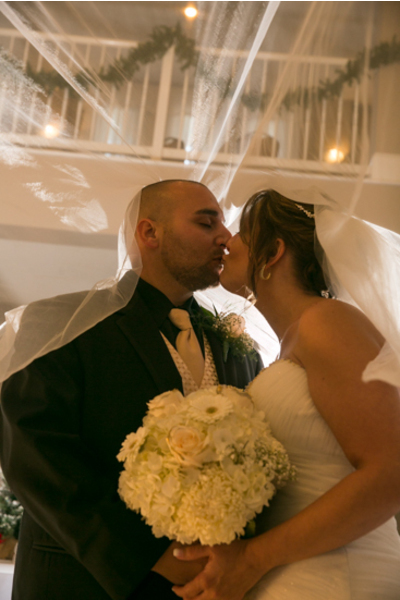 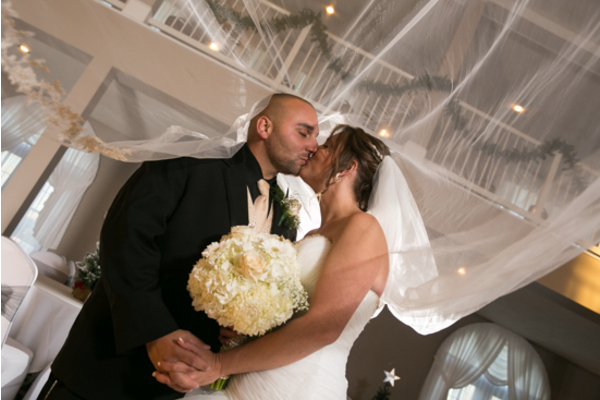 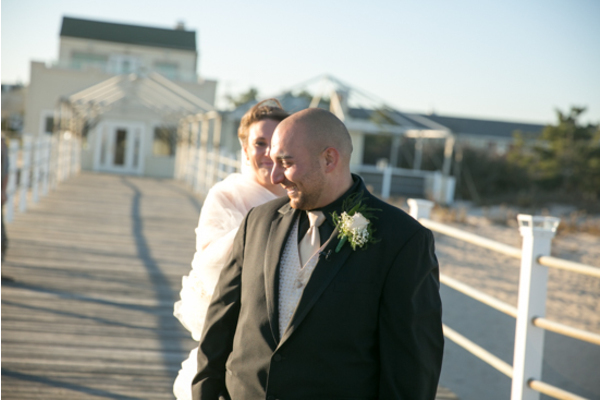 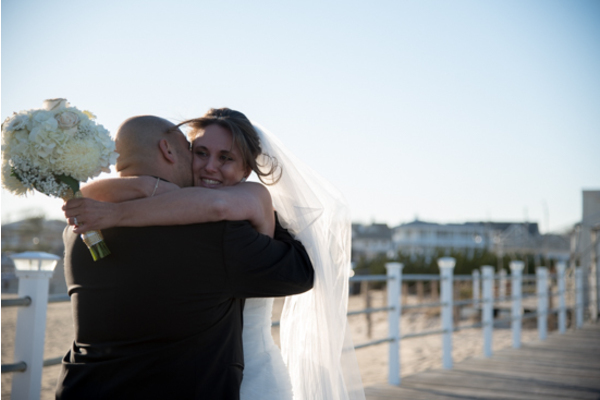 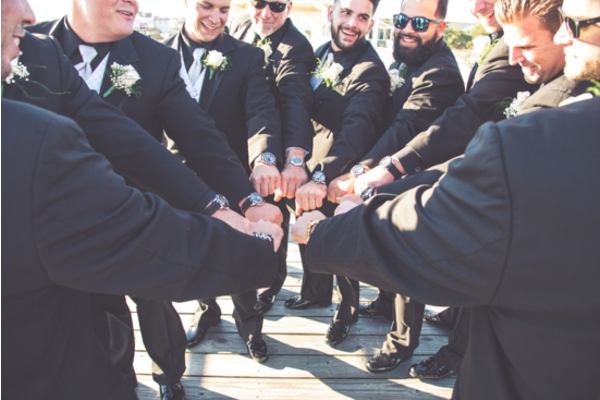 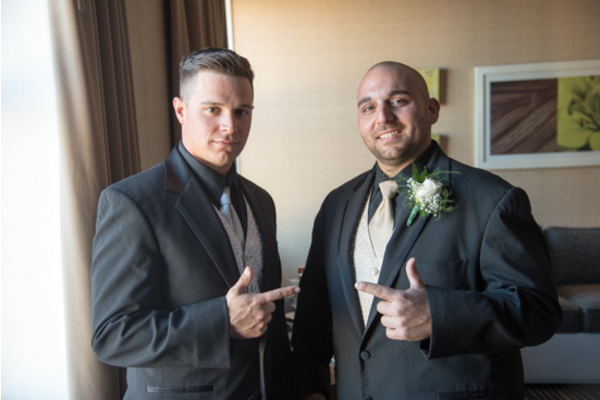 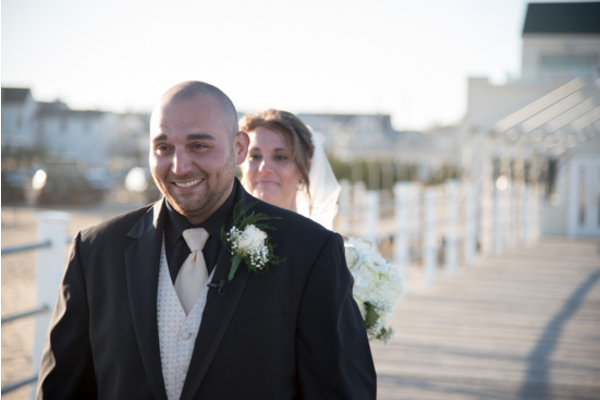 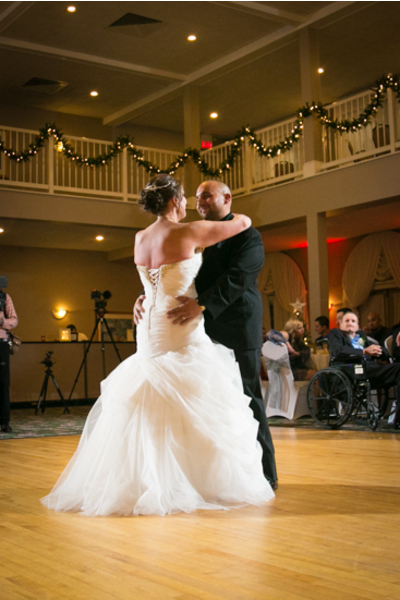 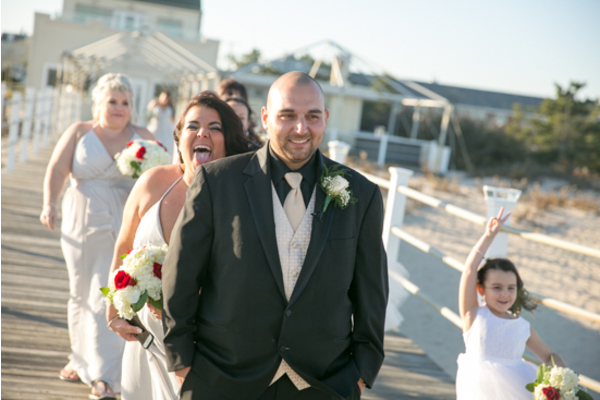 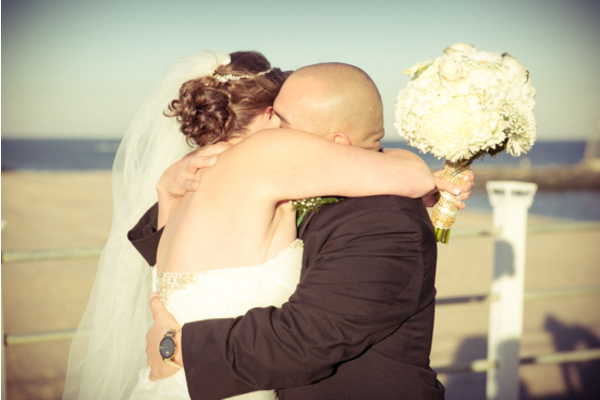 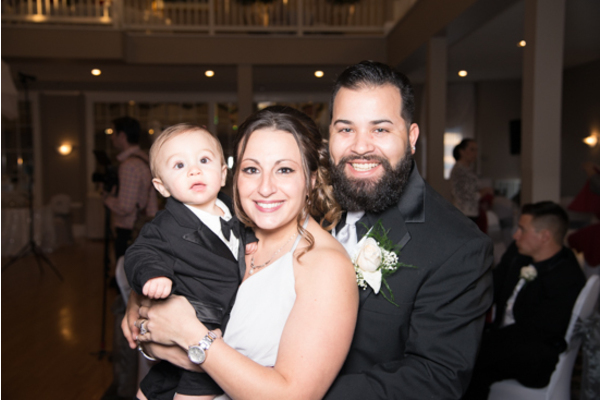 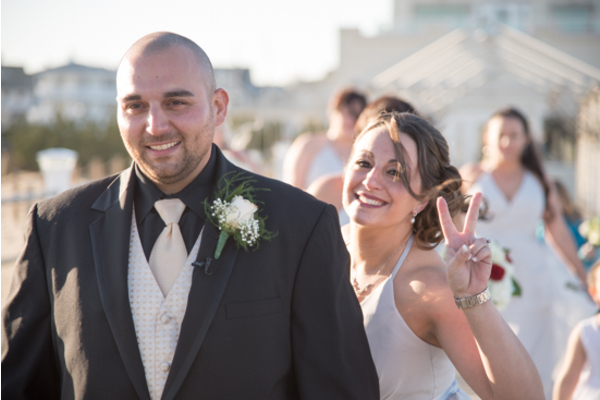 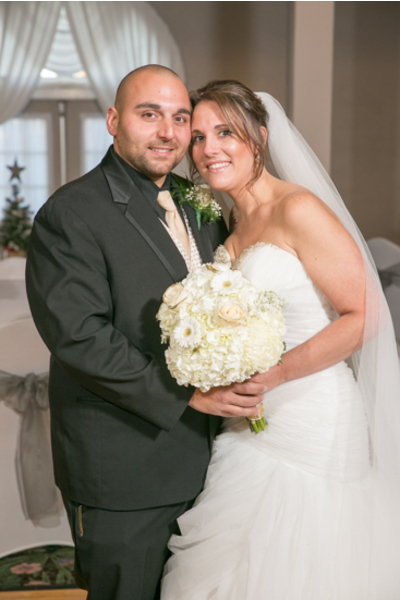 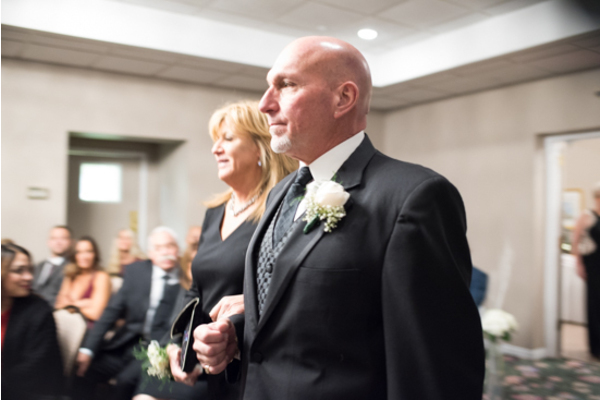 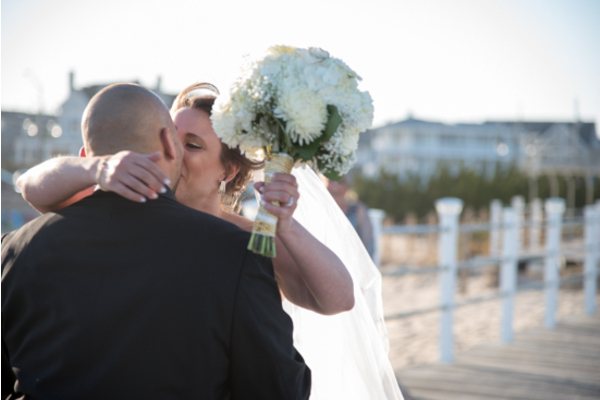 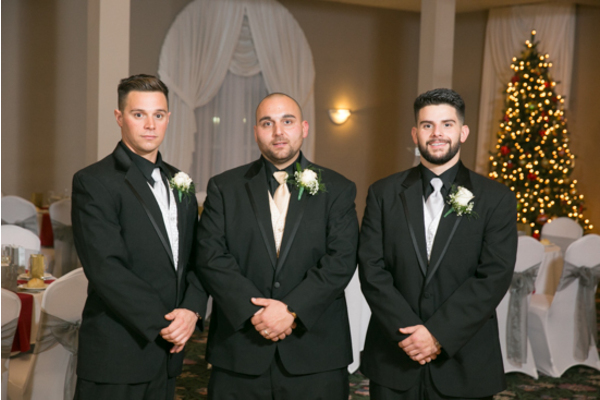 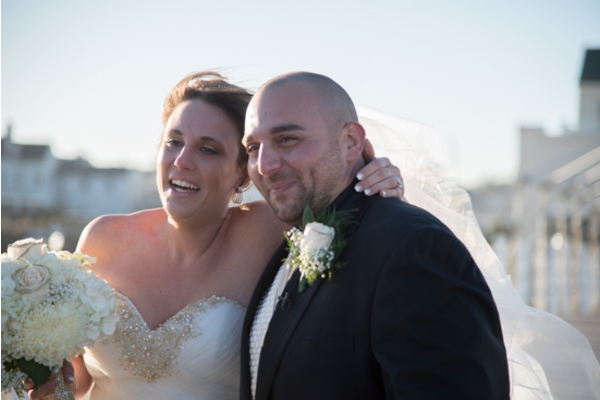 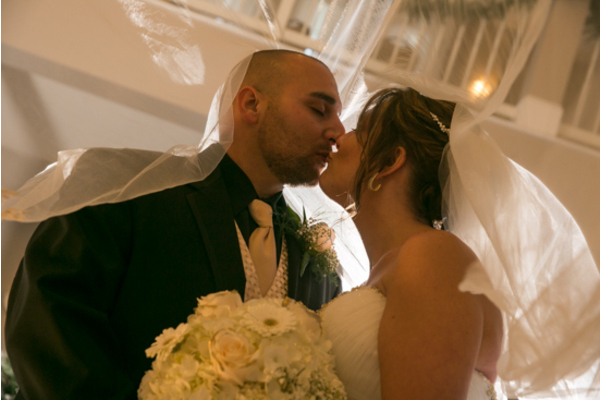 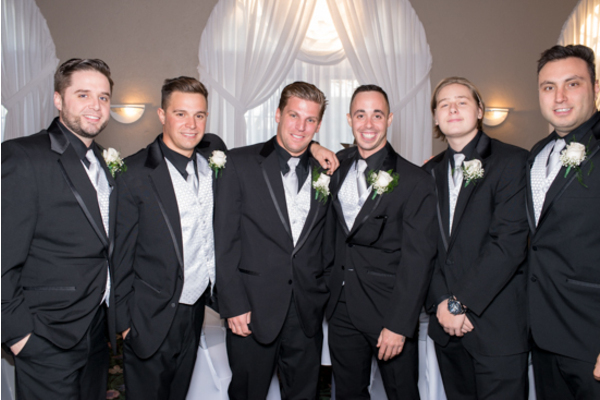 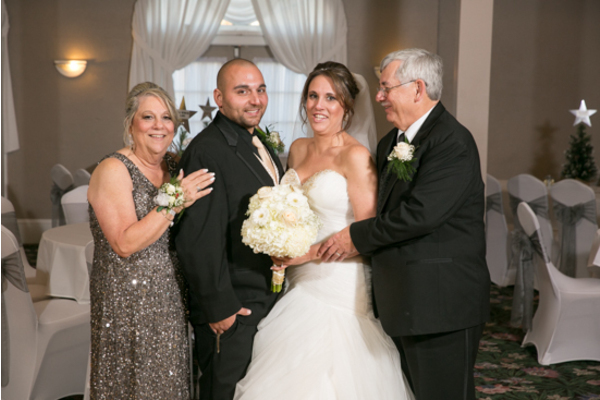 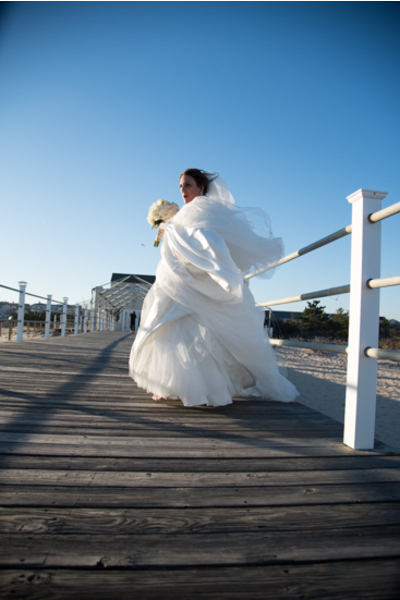 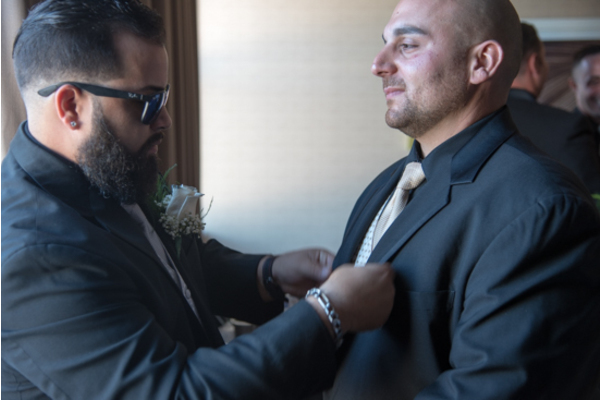 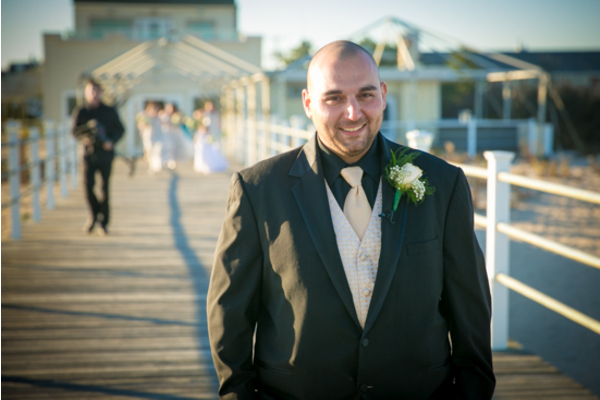 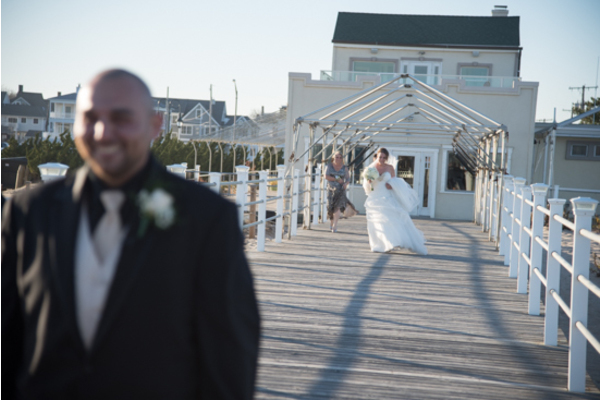 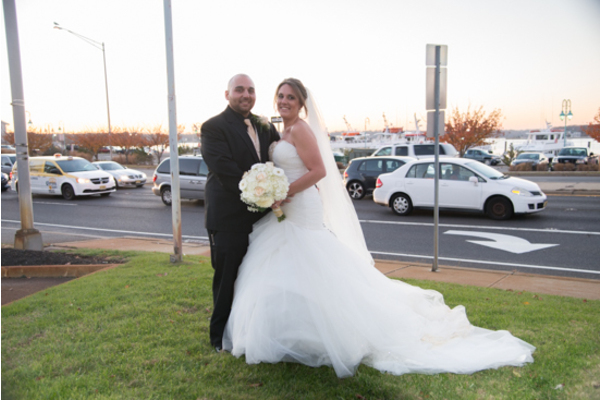 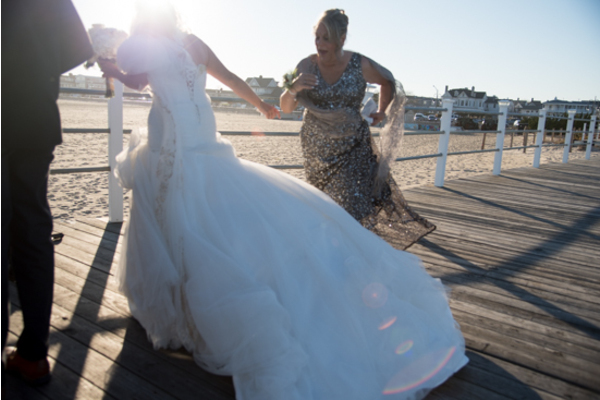 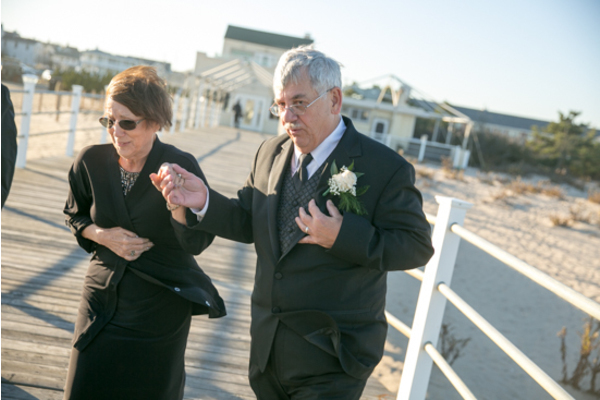 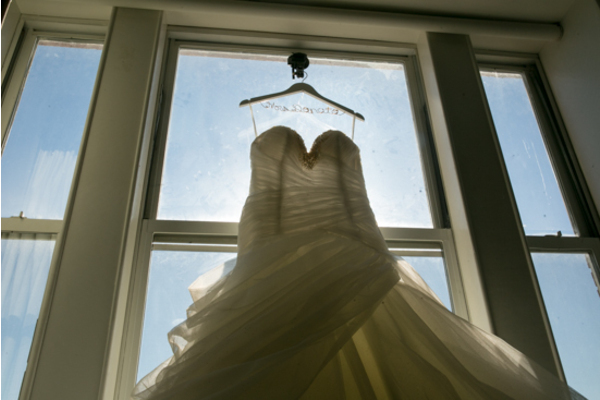 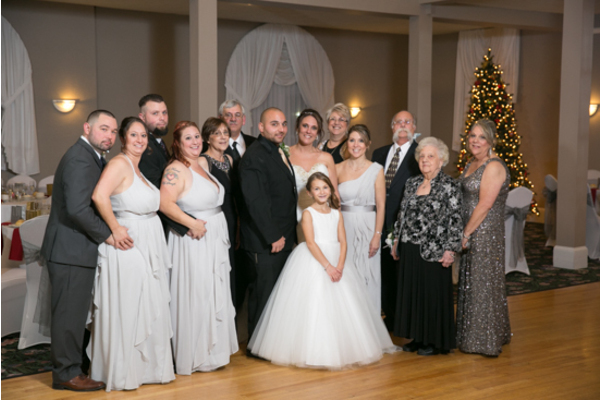 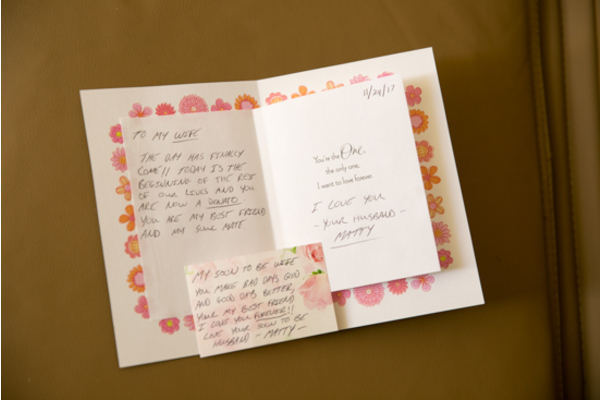 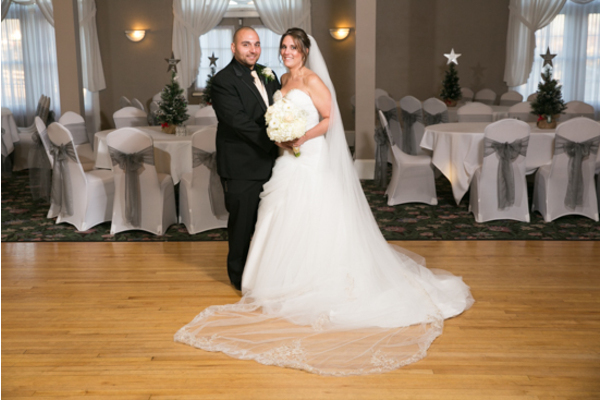 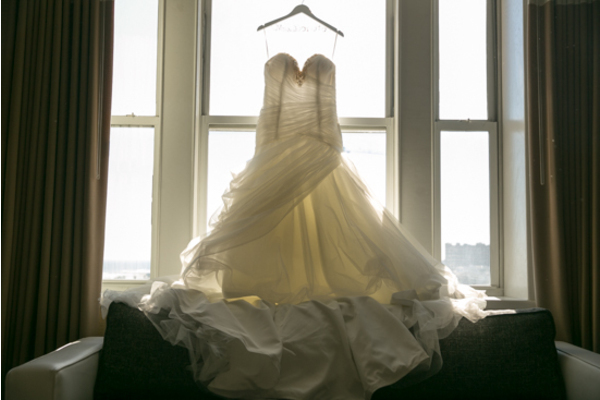 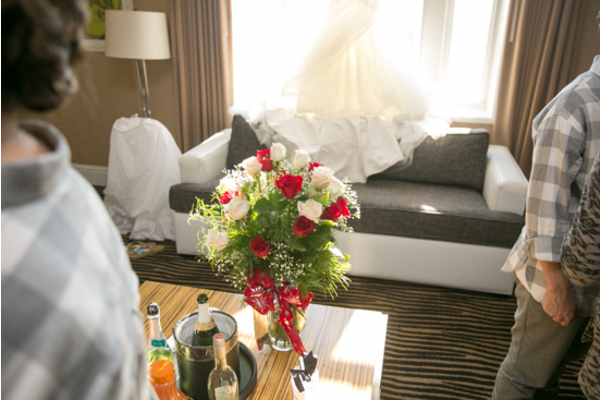 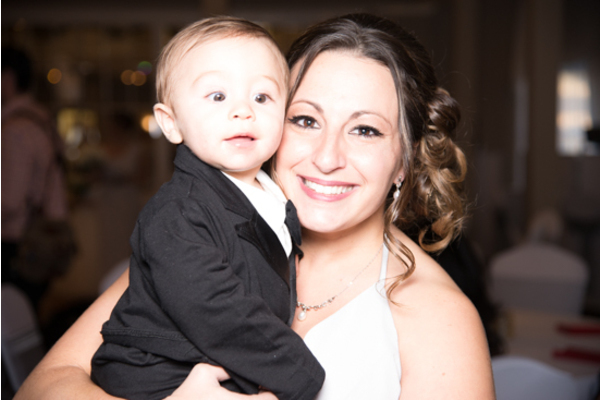 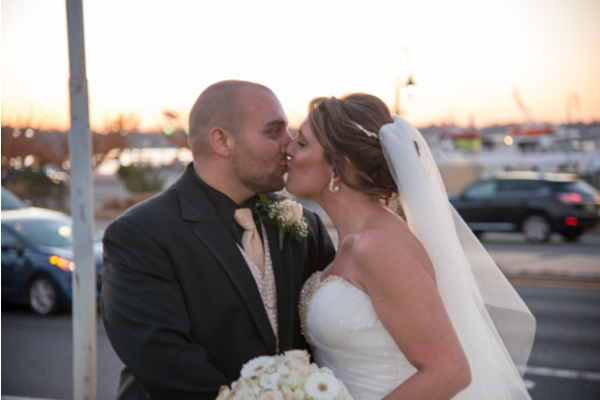 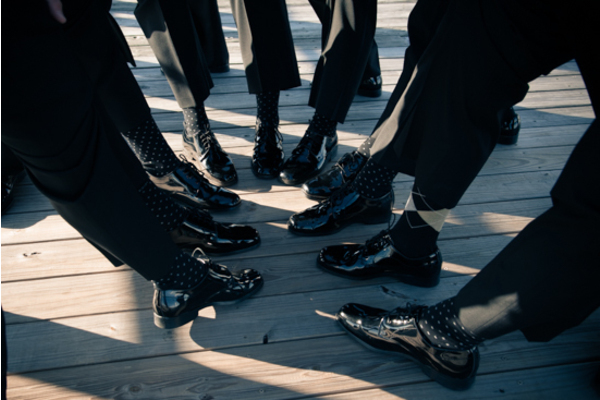 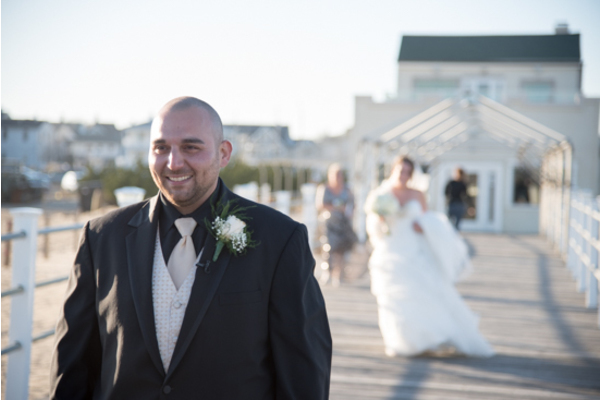 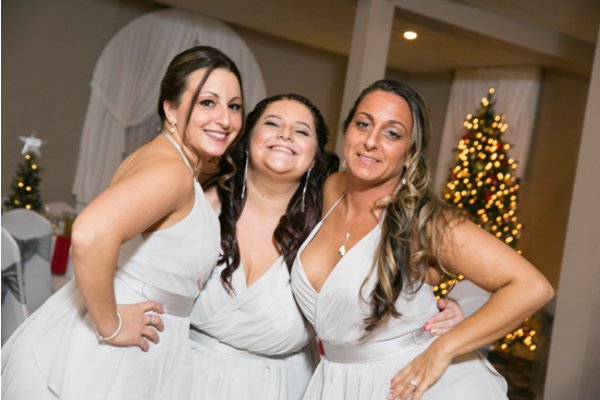 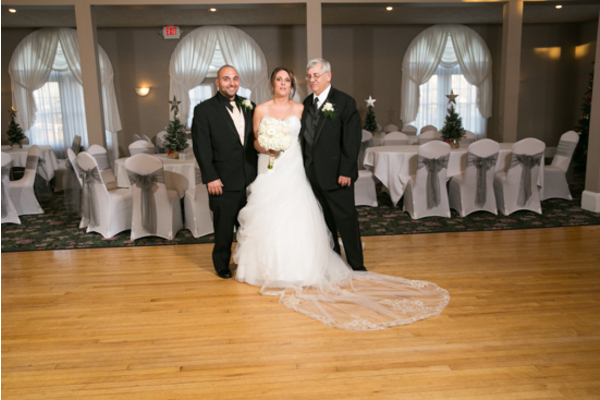 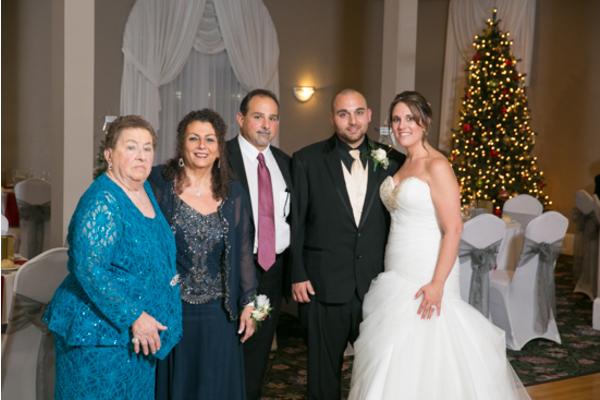 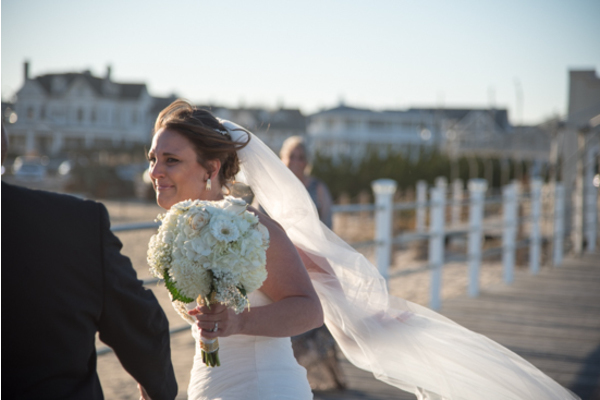 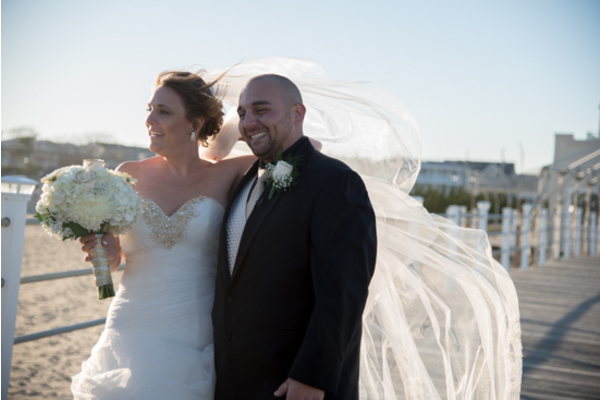 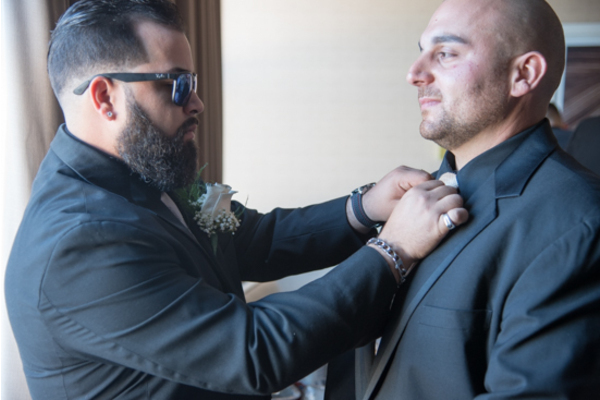 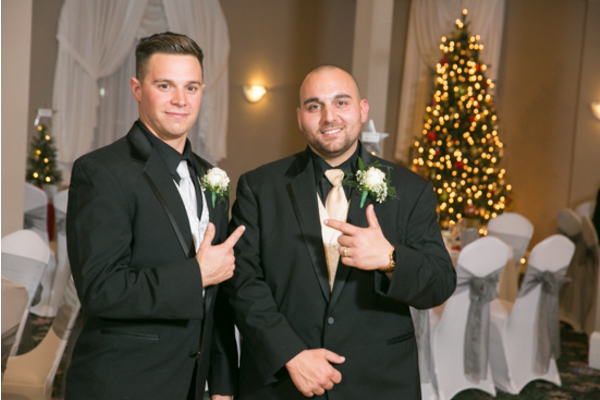 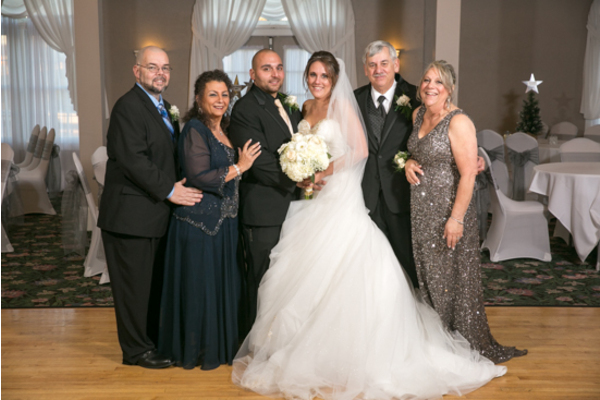 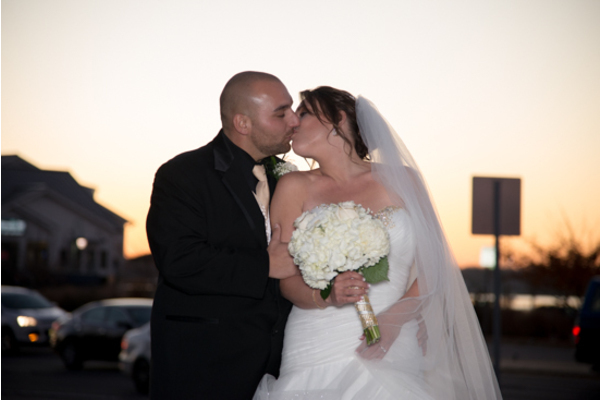 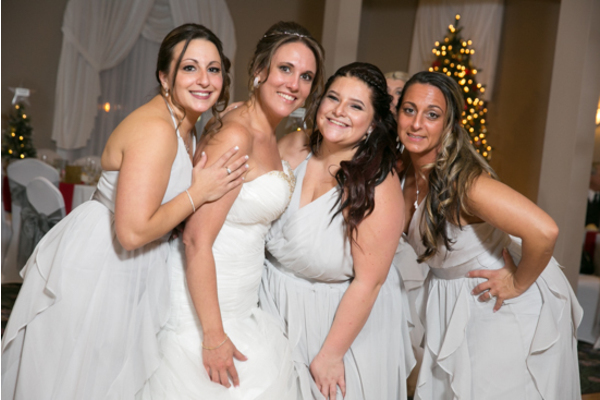 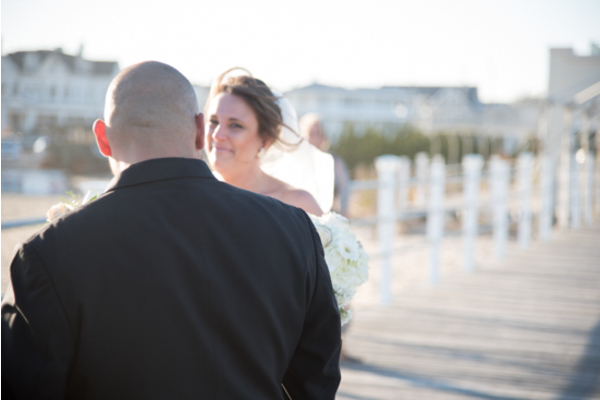 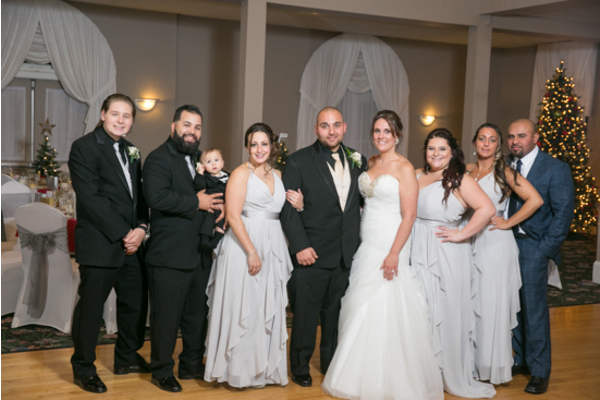 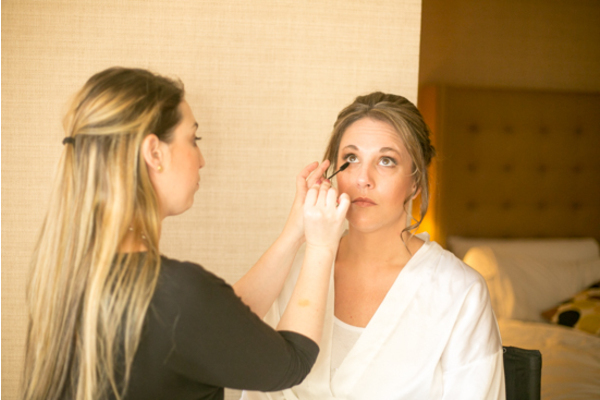 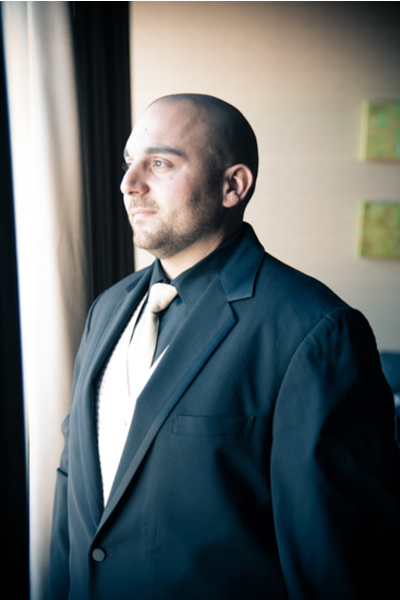 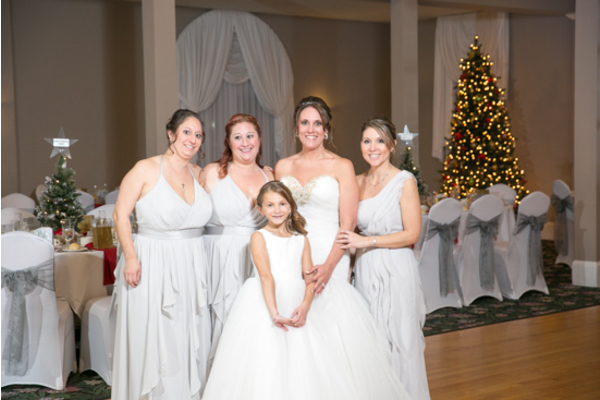 Their wedding took place at the lovely Waterview Pavilion located in Belmar, NJ. 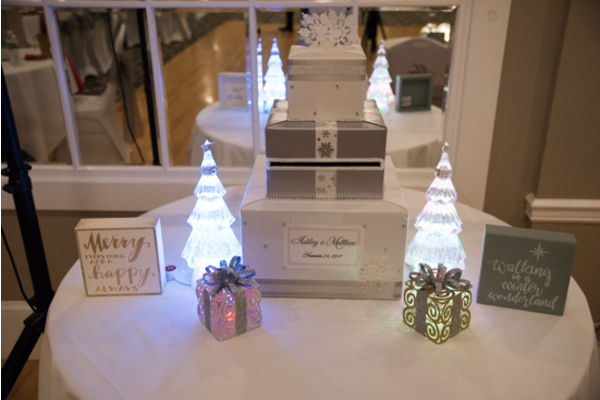 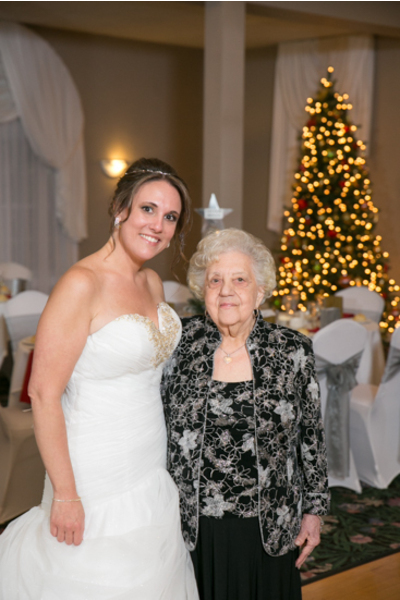 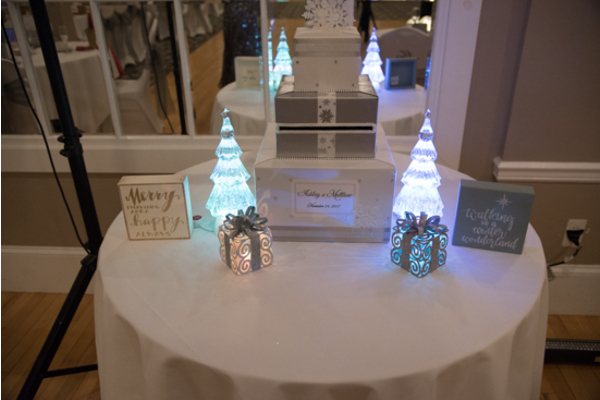 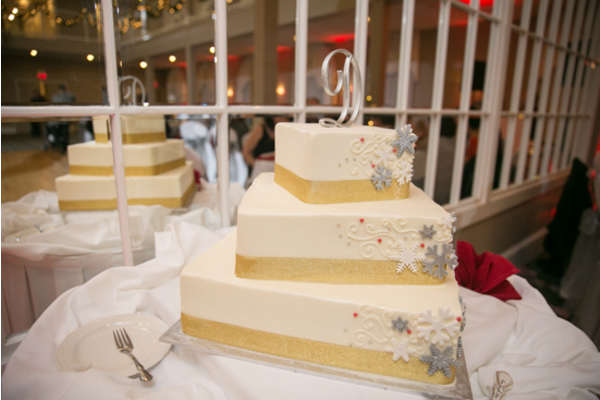 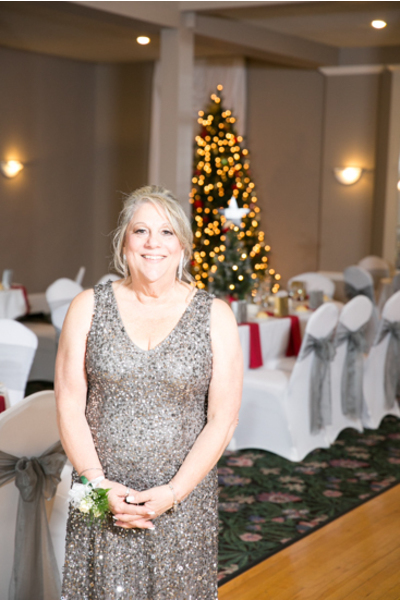 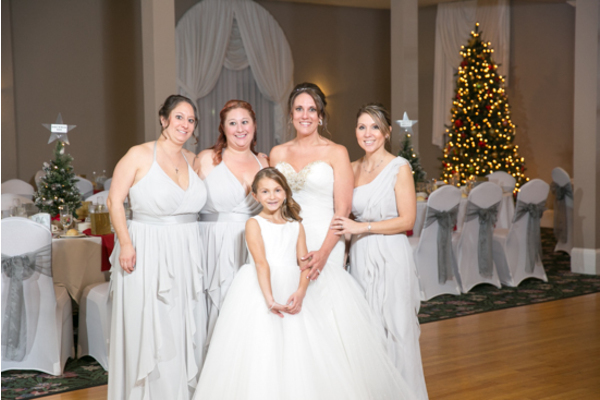 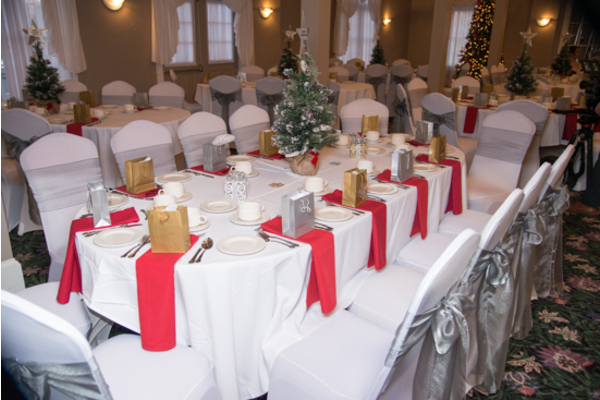 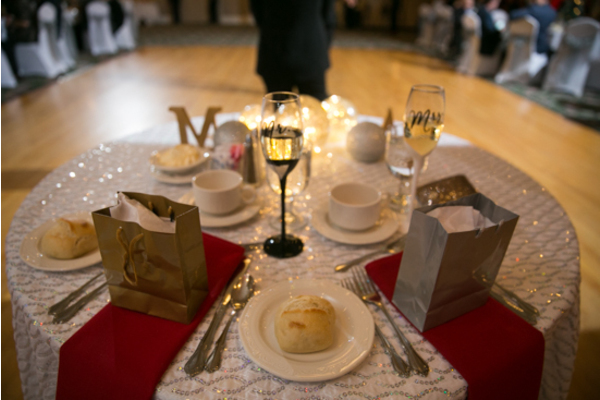 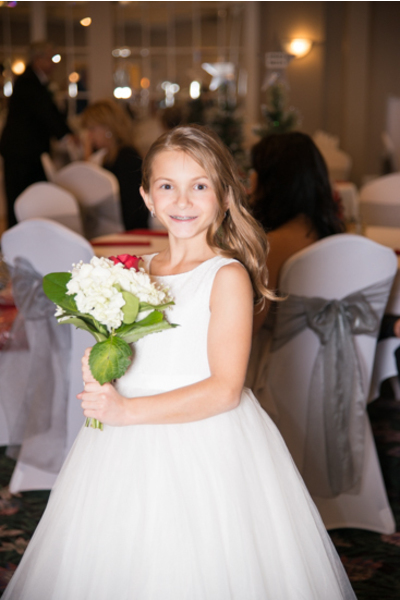 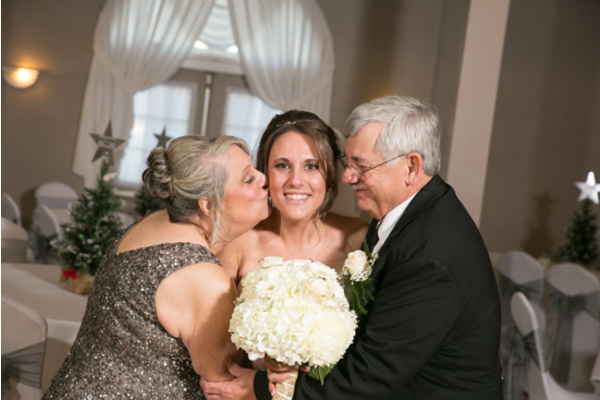 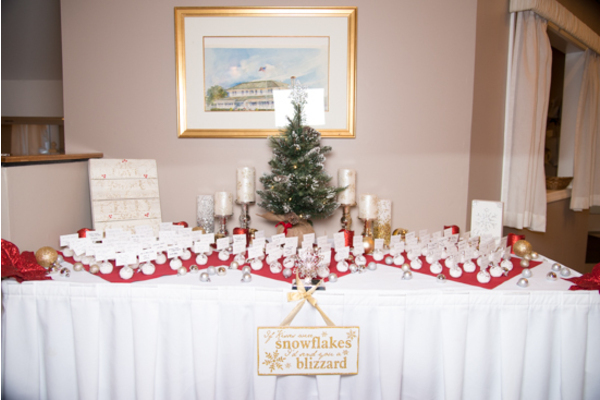 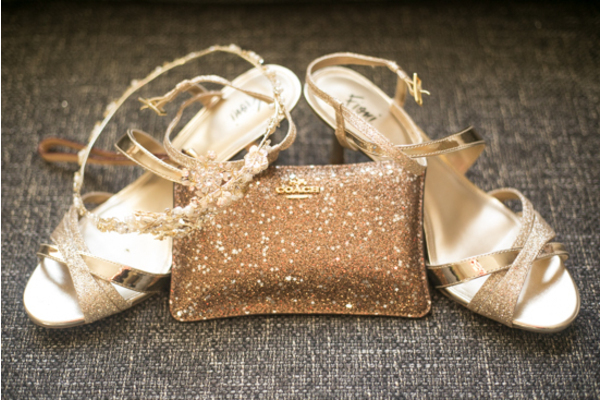 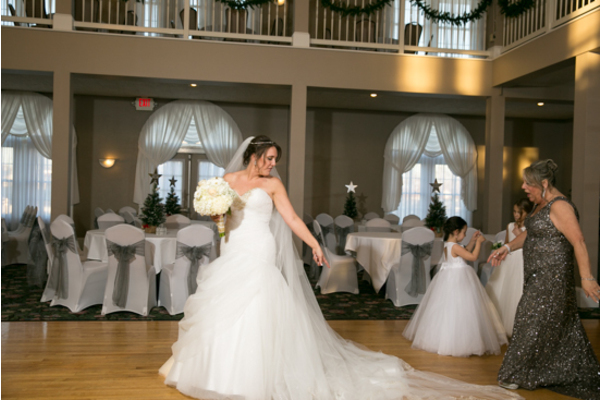 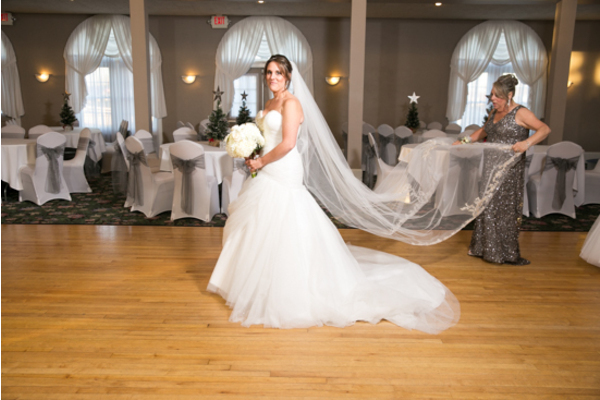 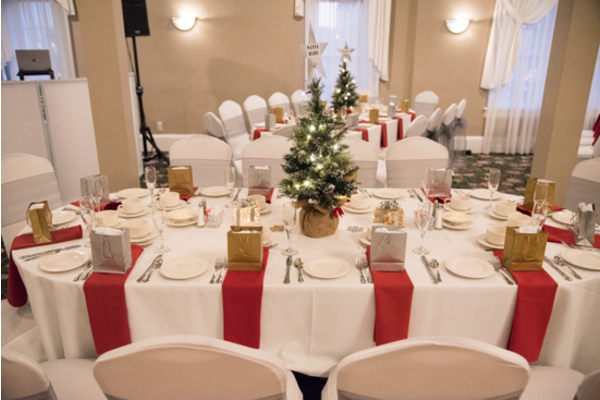 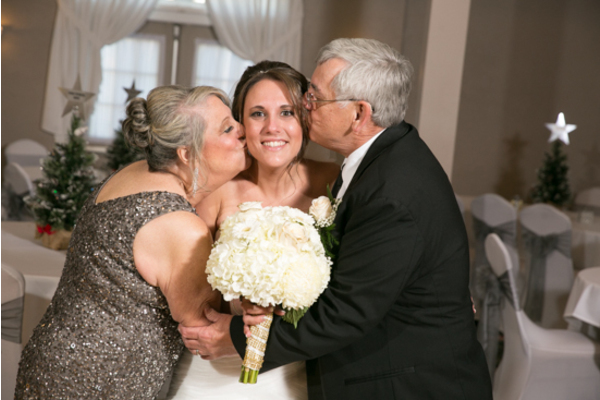 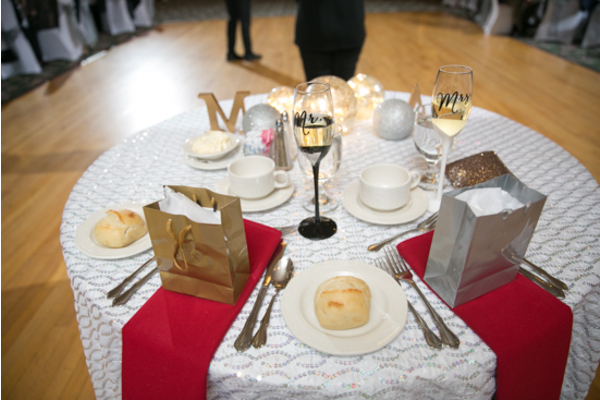 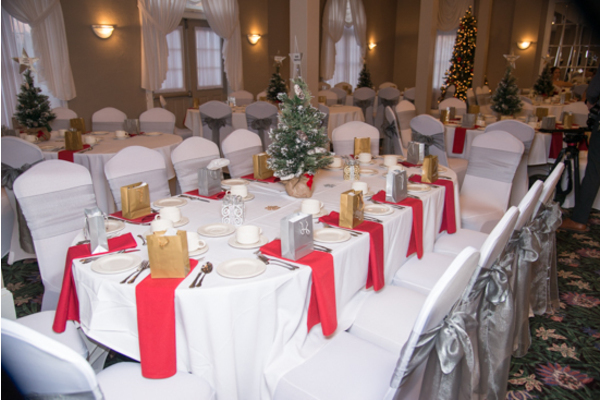 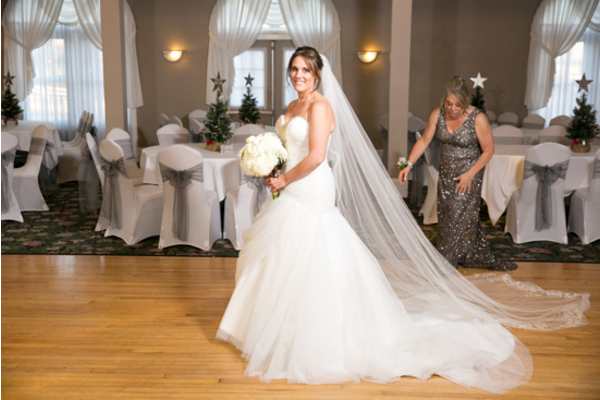 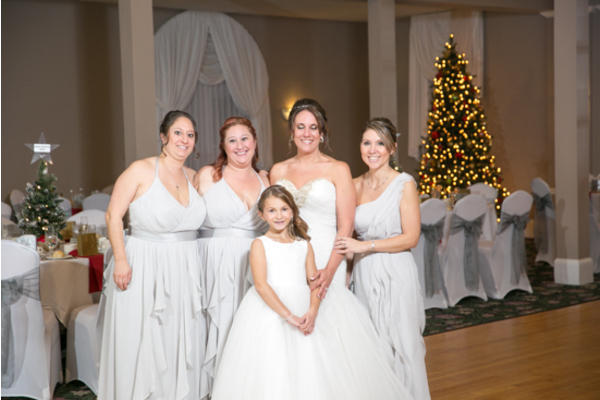 Ashley and Matt’s Christmas and winter inspired wedding was the perfect touch of holiday magic! 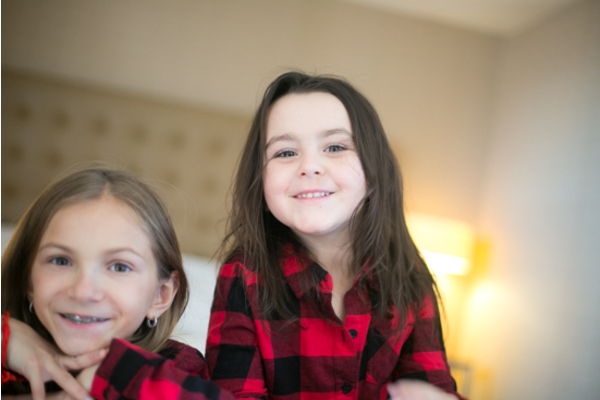 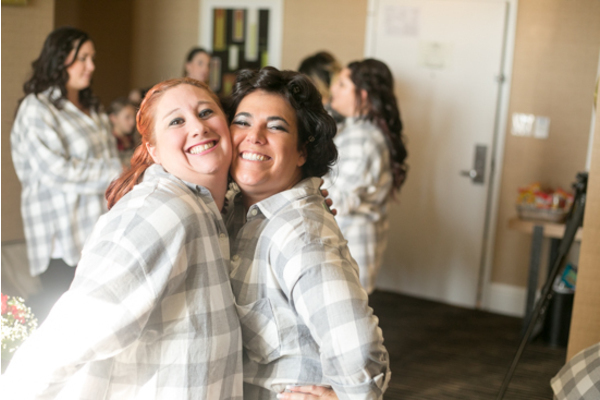 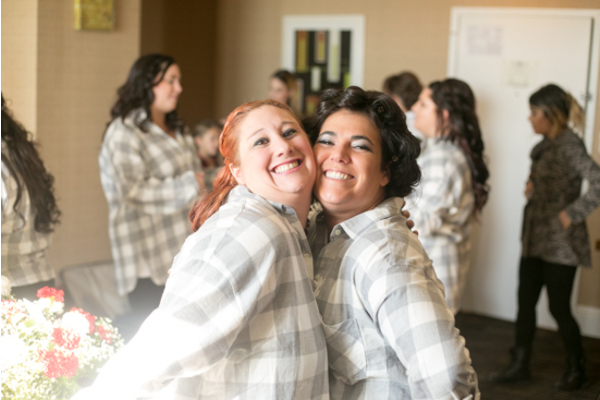 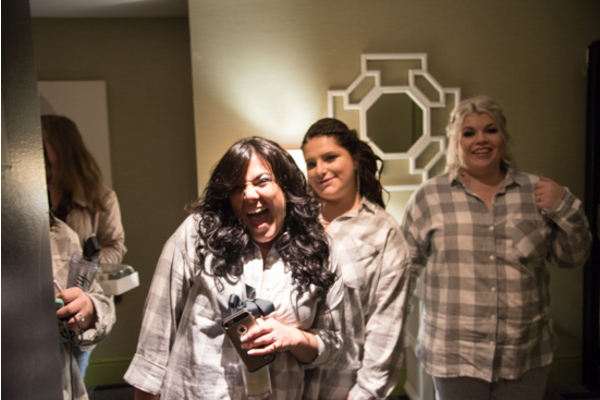 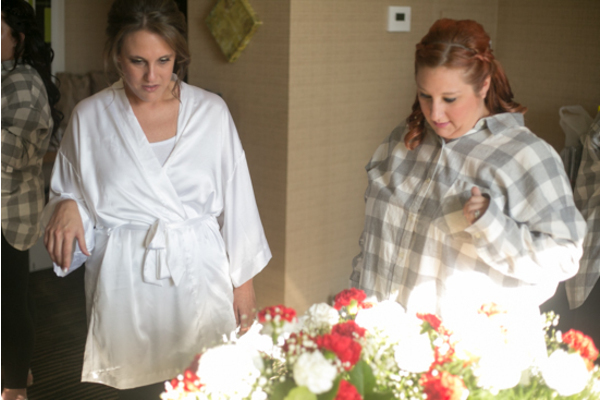 Ashley and her bridesmaids were preparing for the big day ahead wearing comfy flannels. 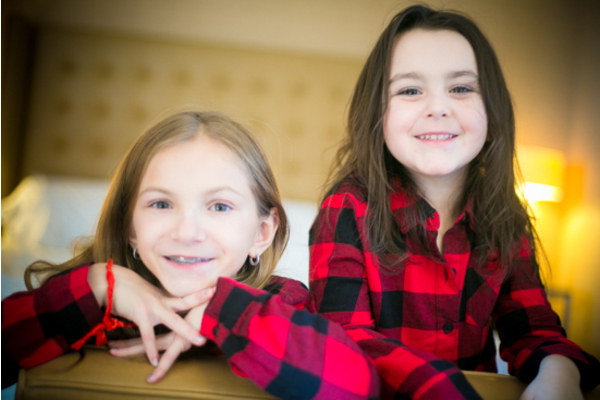 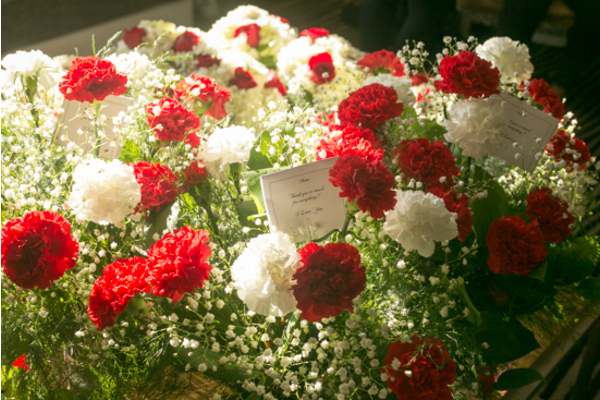 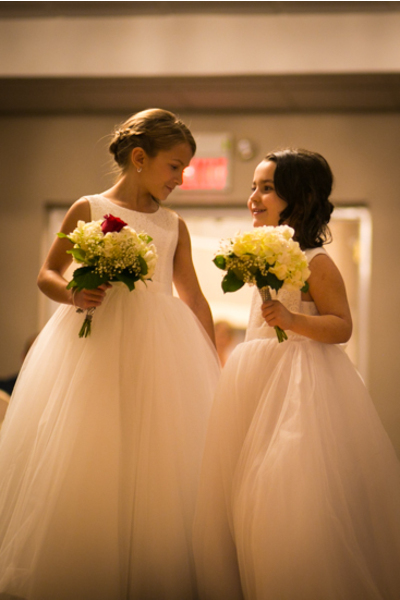 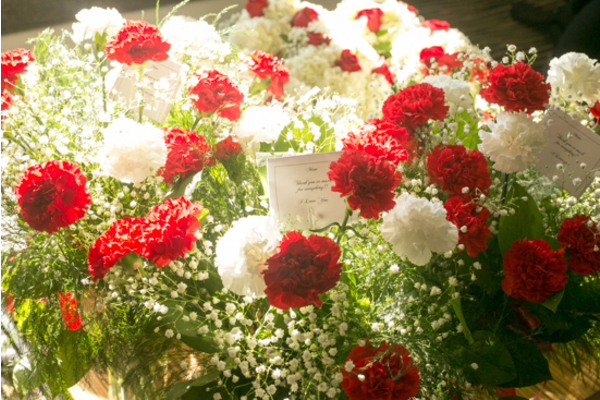 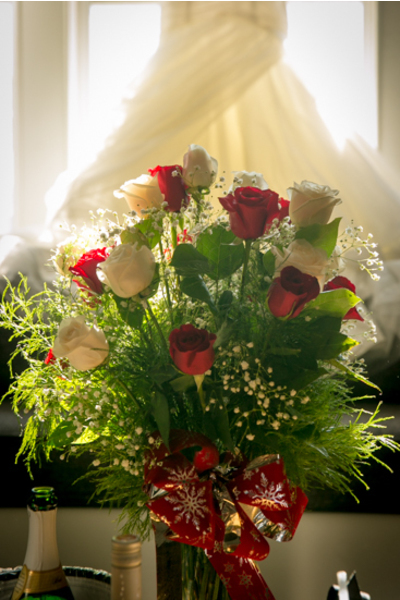 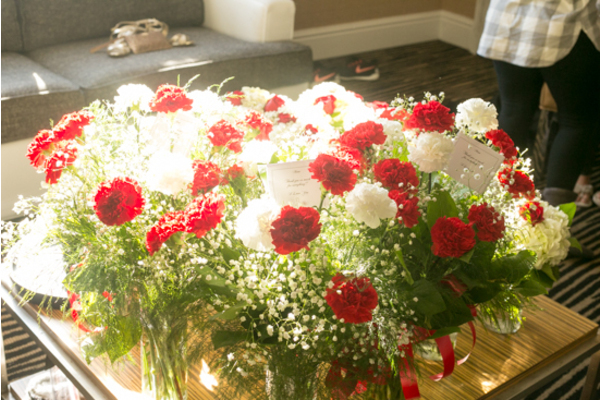 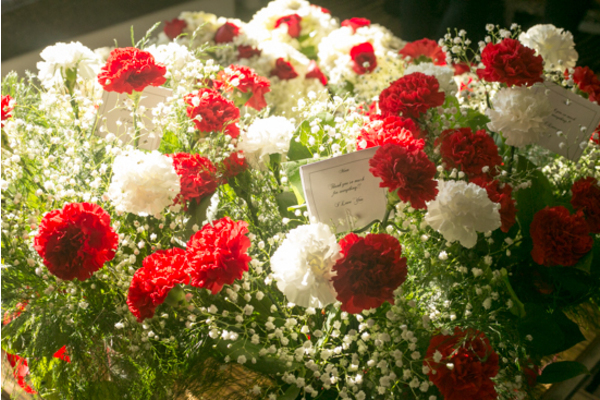 The girls posed next to red roses, baby’s breath, and more gorgeous bouquets of white flowers. 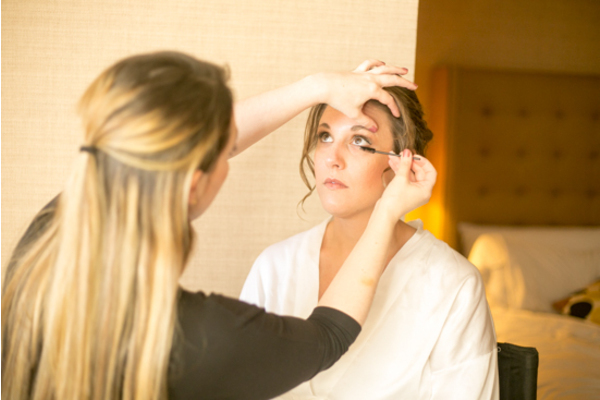 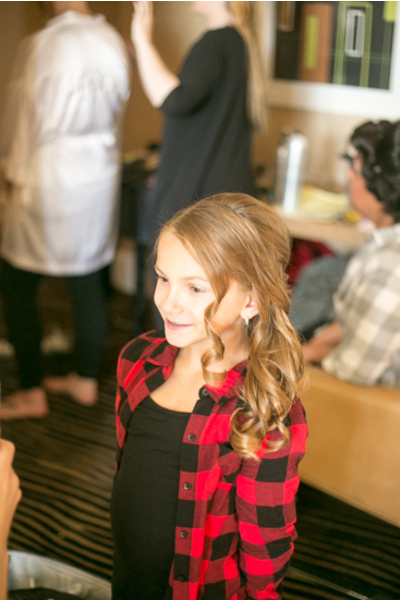 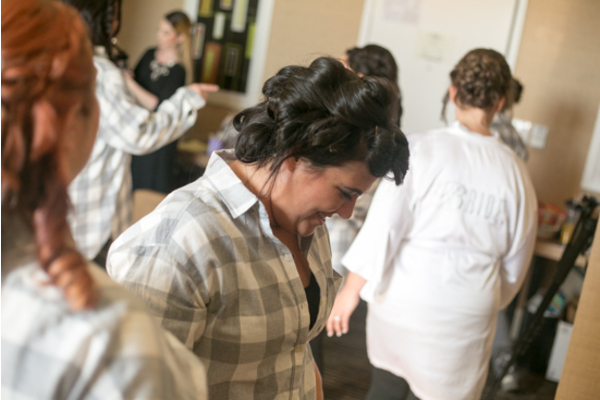 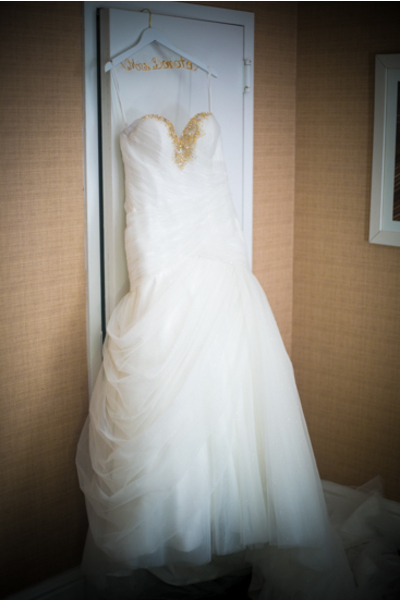 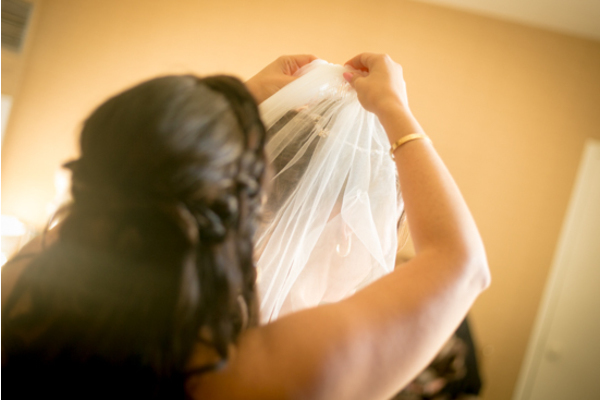 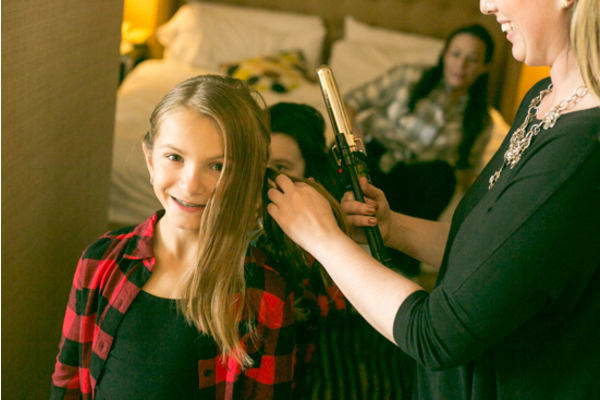 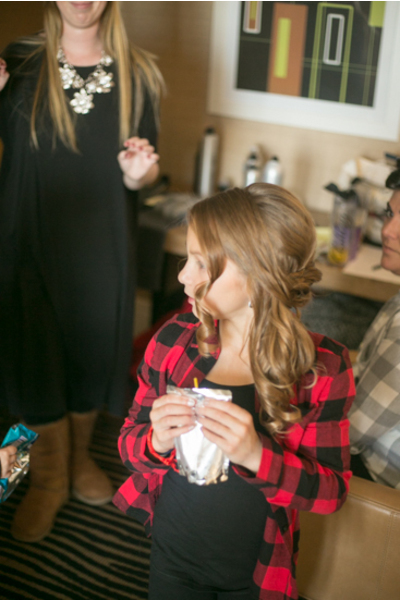 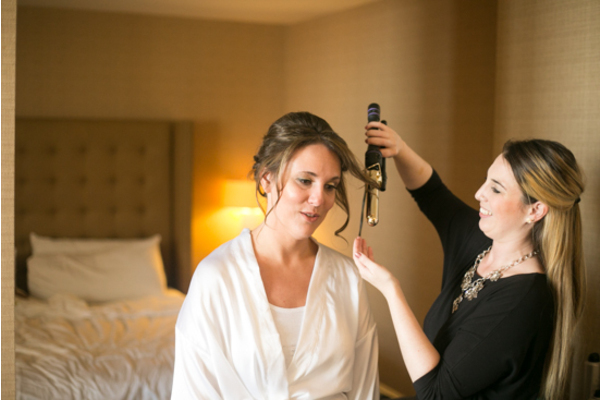 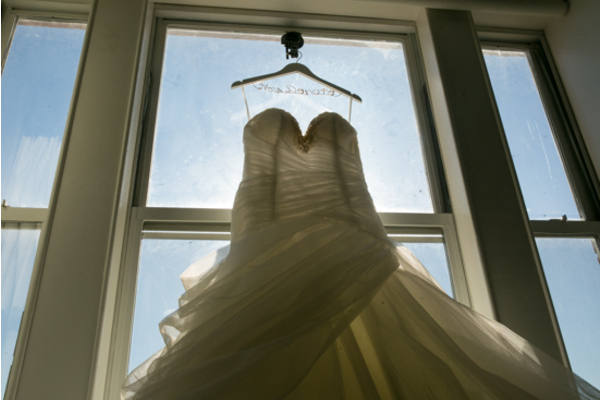 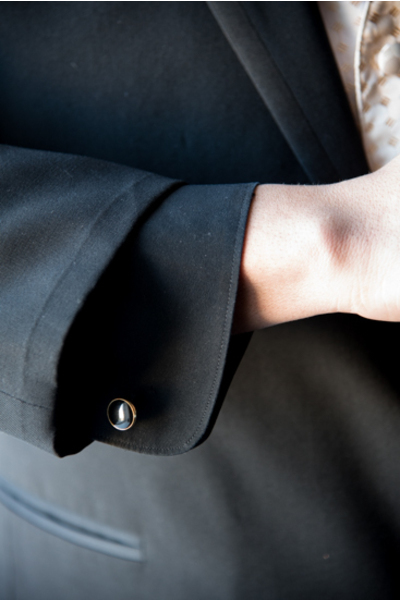 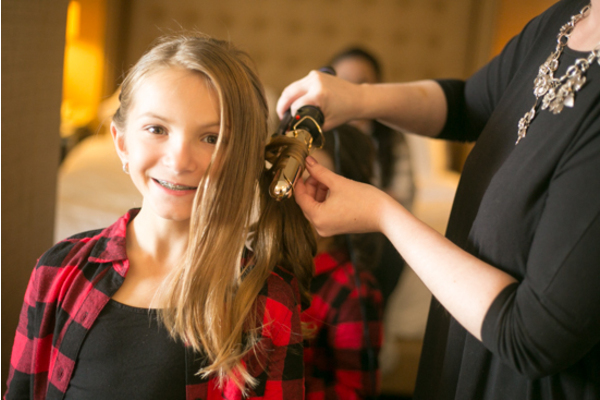 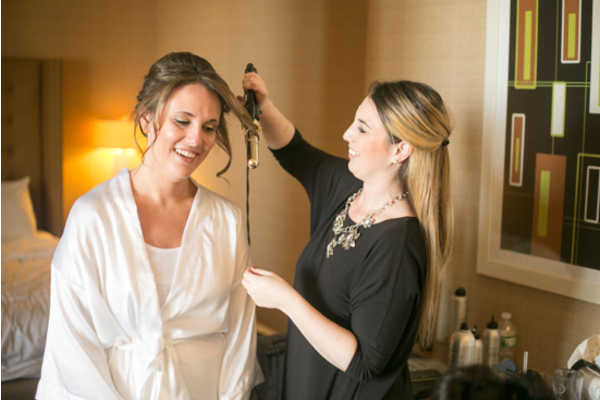 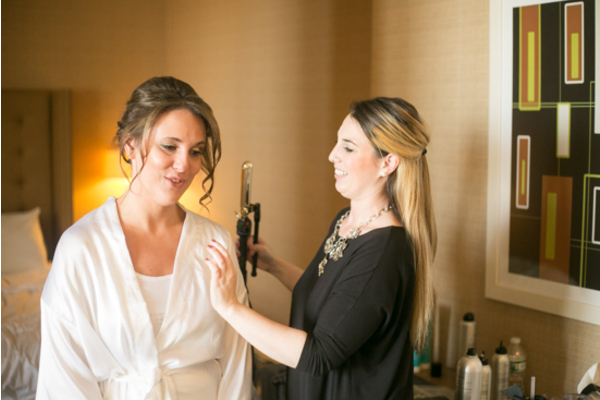 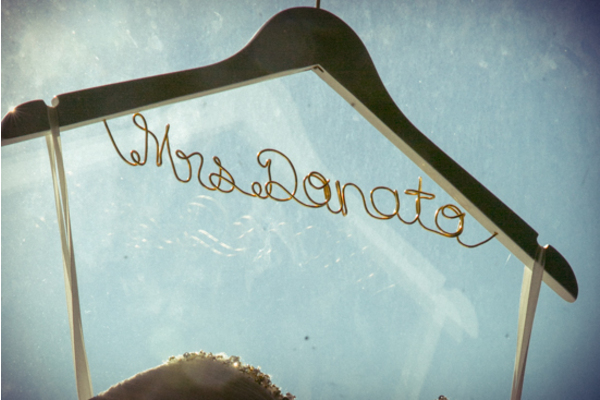 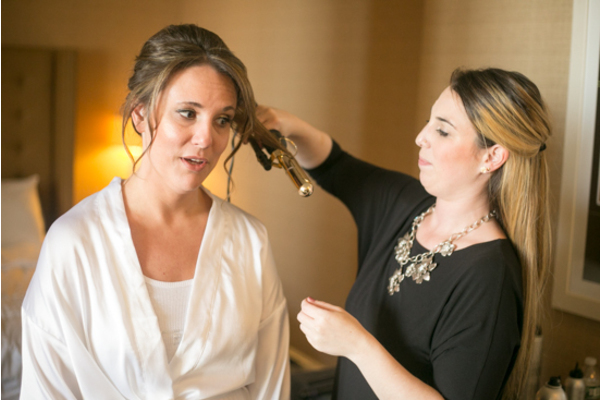 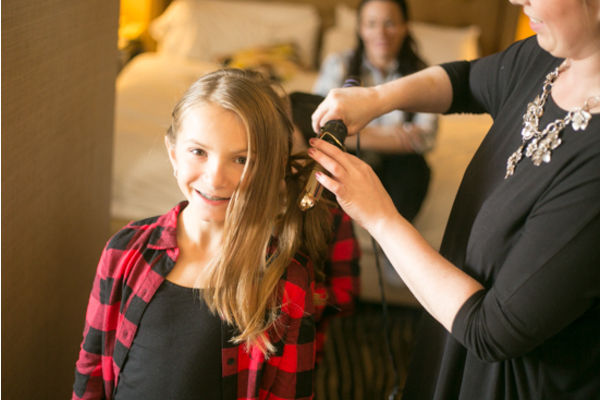 As the finishing touches were finally added to her hair and makeup, Ashley proudly held up a dress hanger that read, “Mrs. 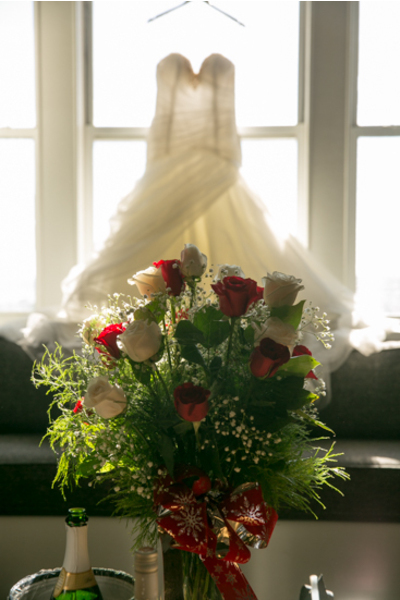 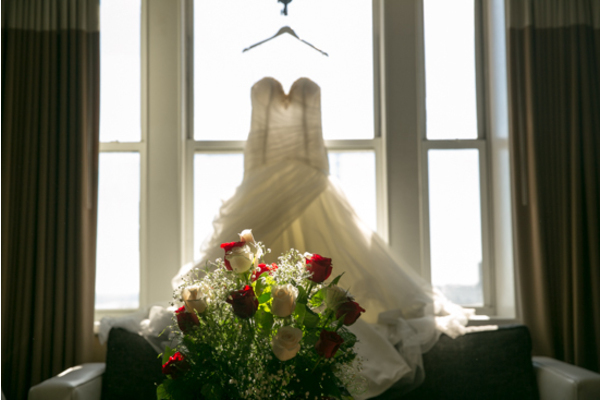 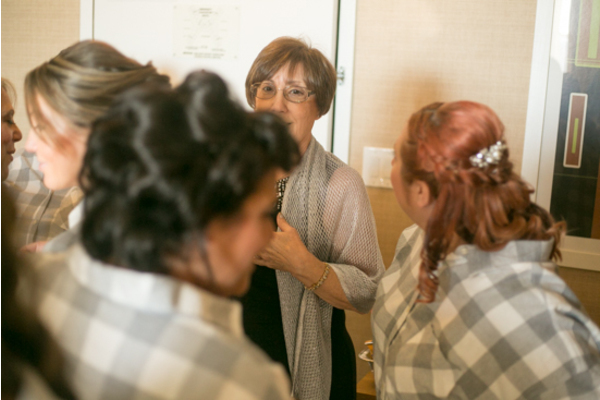 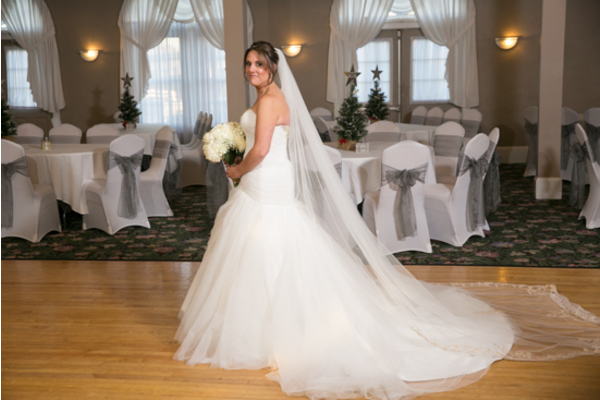 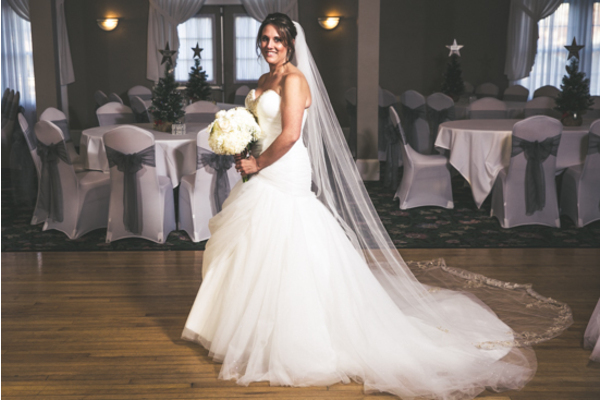 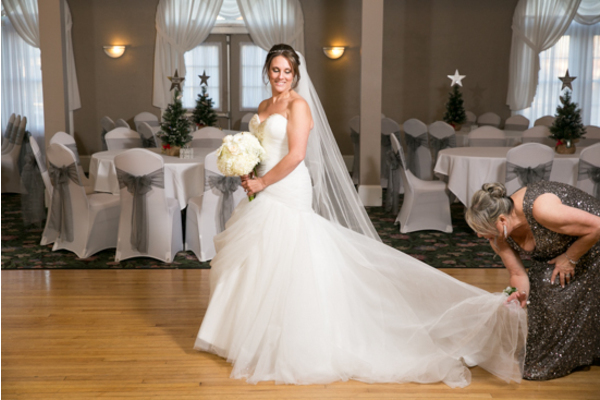 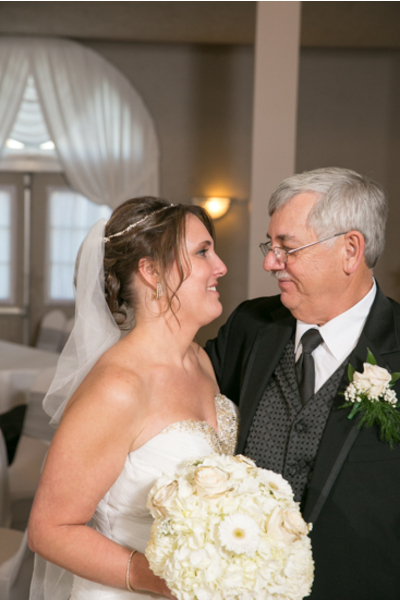 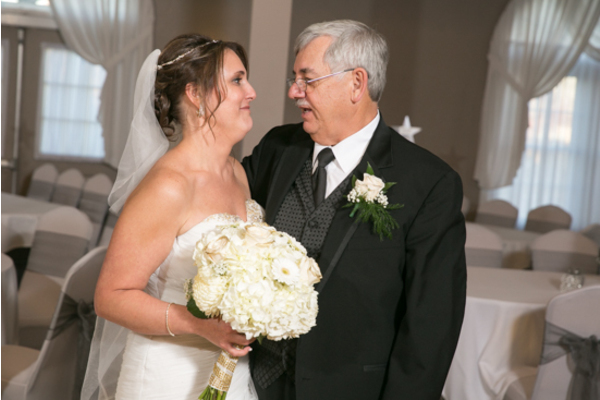 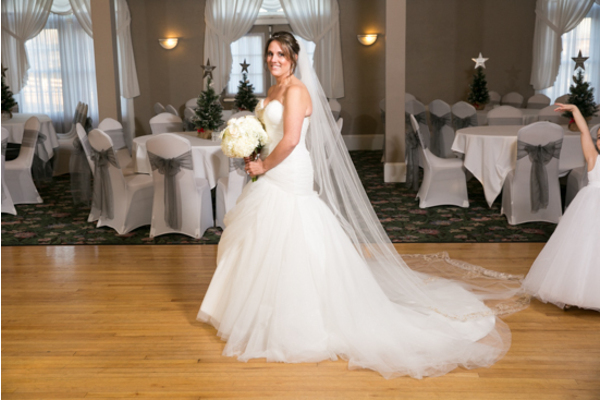 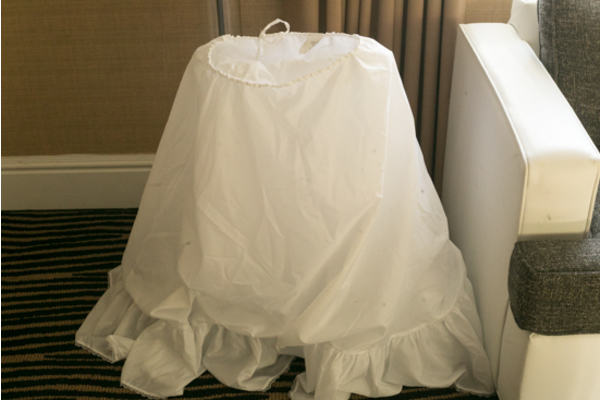 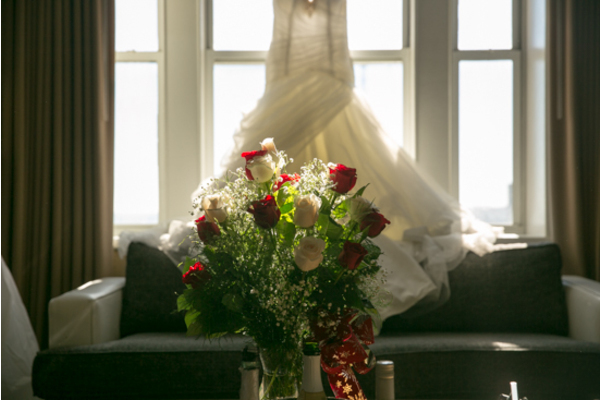 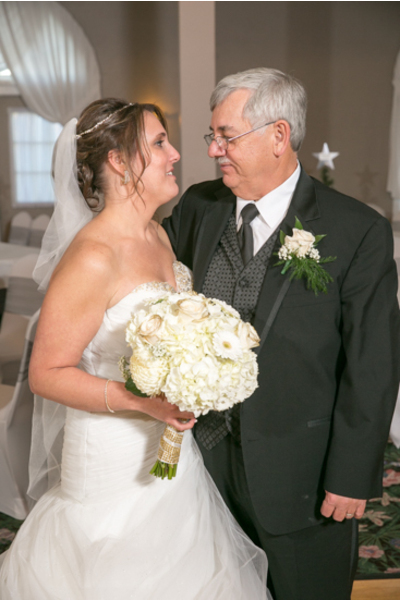 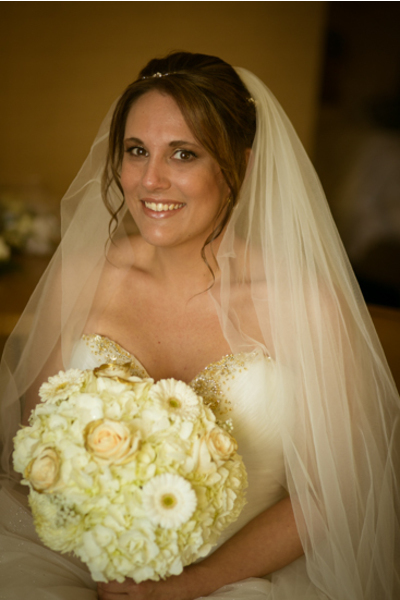 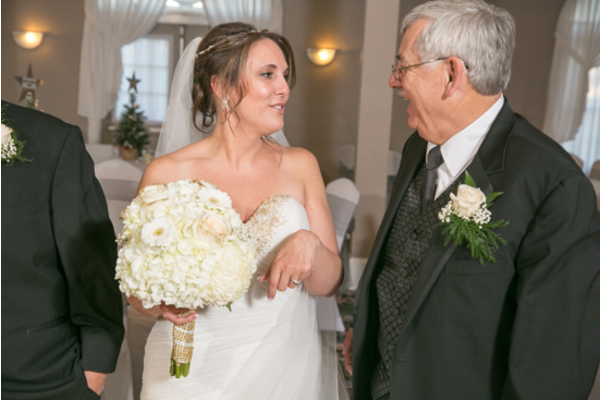 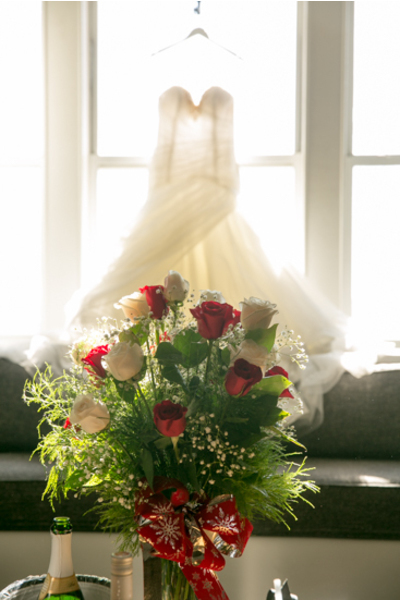 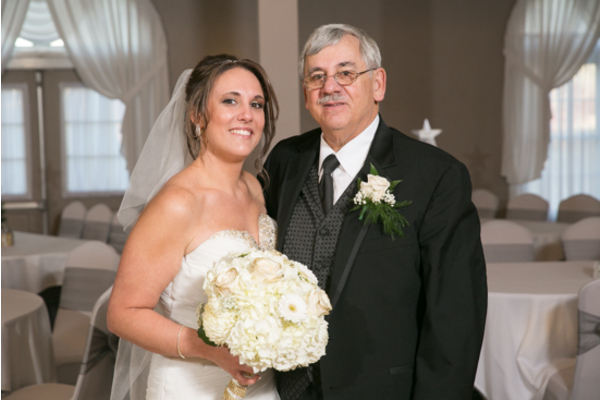 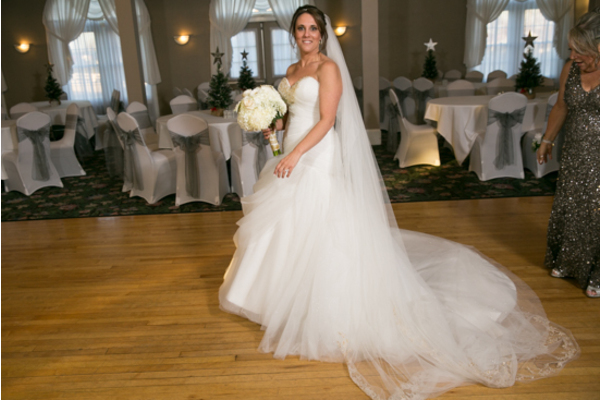 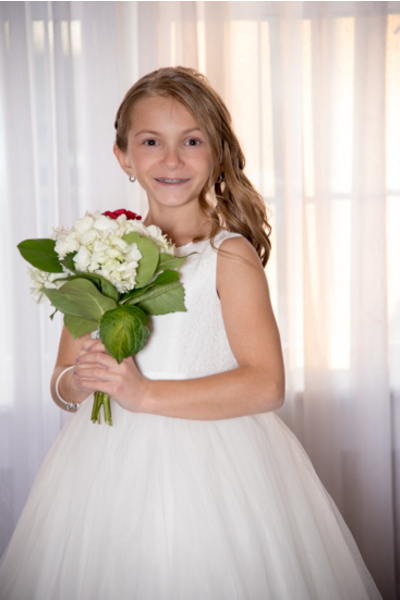 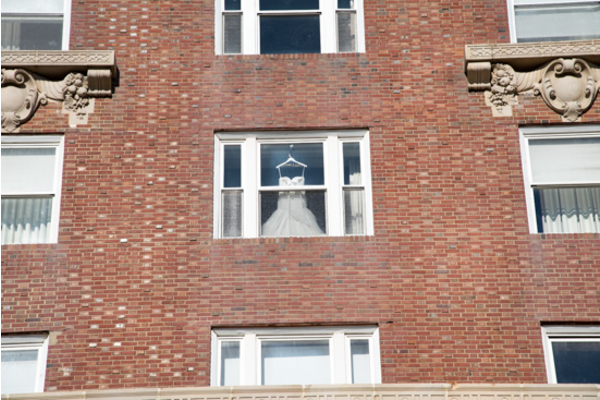 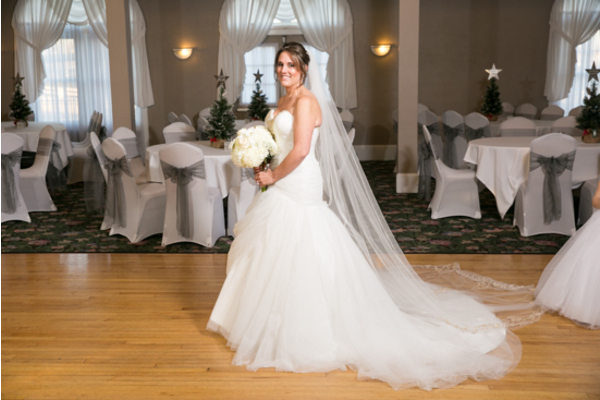 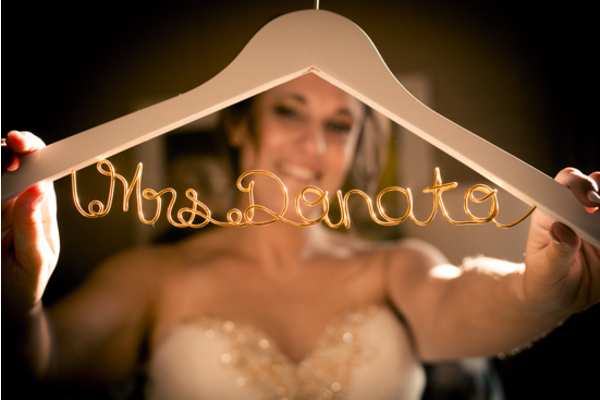 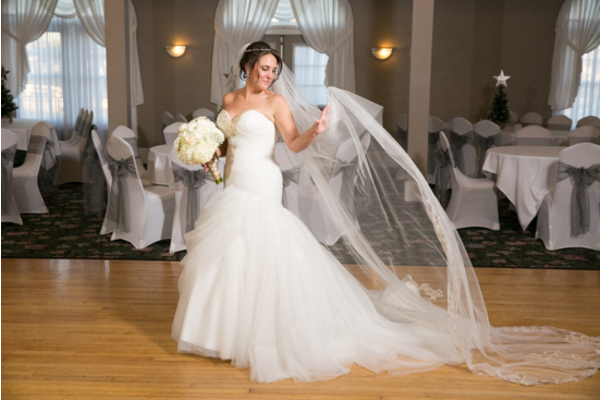 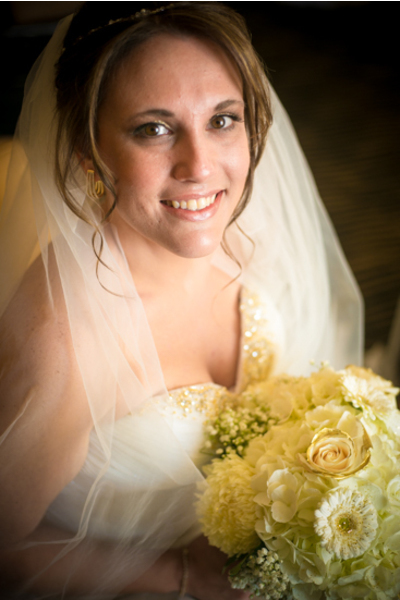 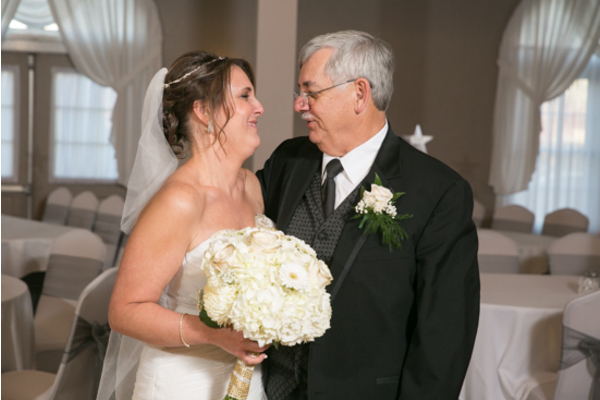 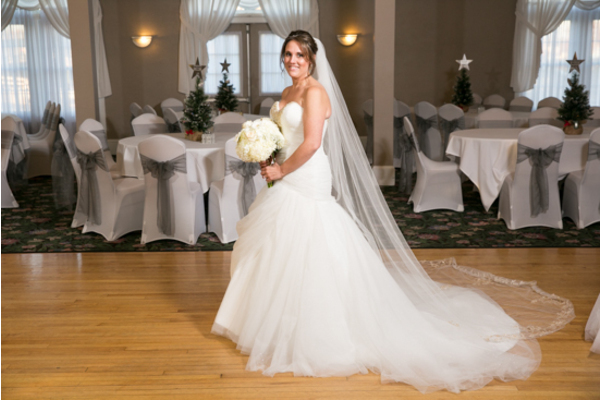 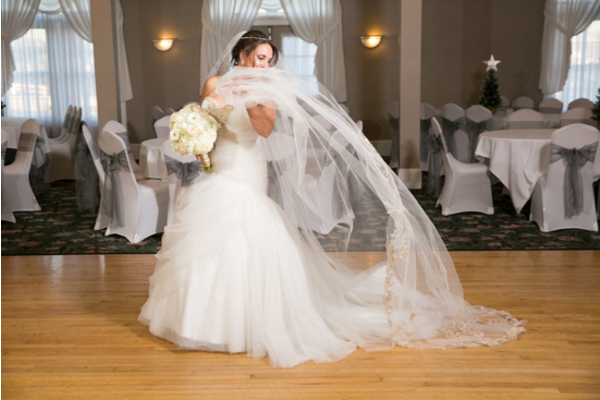 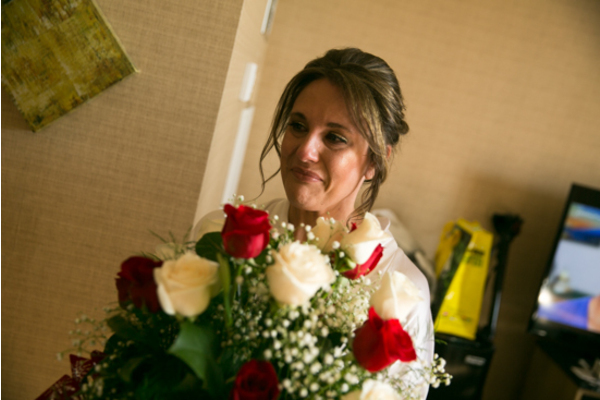 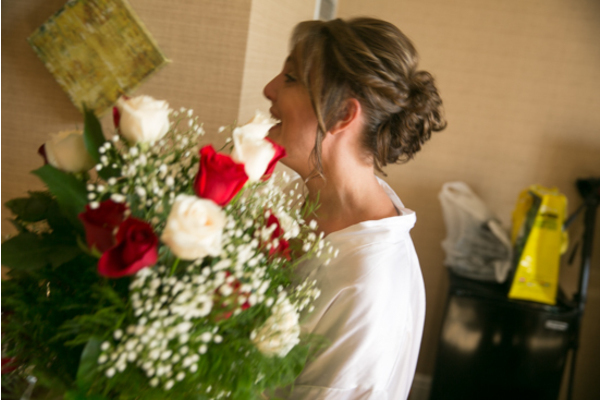 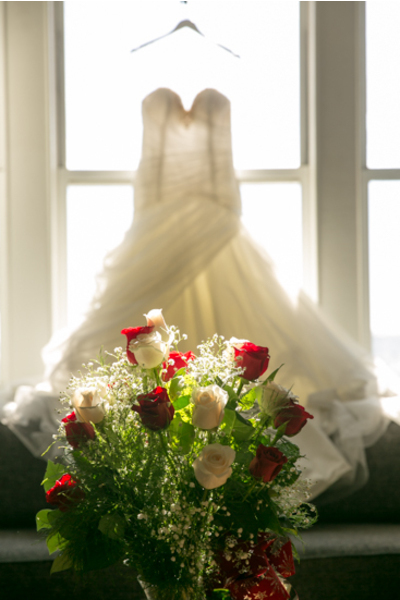 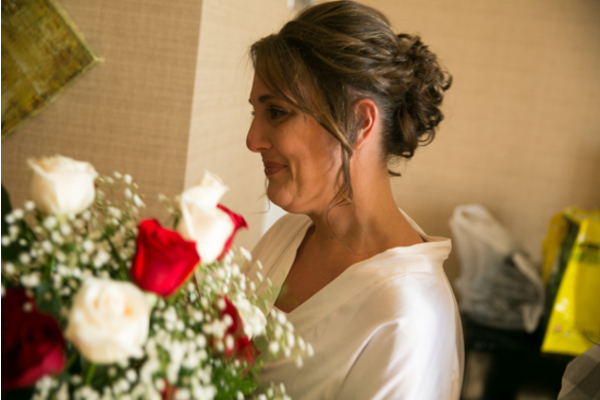 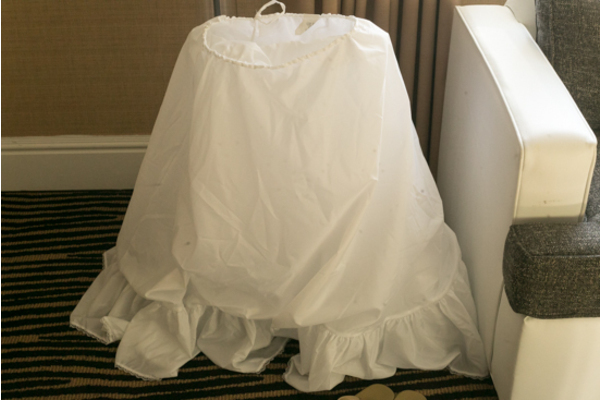 Donata.” The beautiful bride put on her veil and smiled bright holding her simple and elegant white flower bouquet. 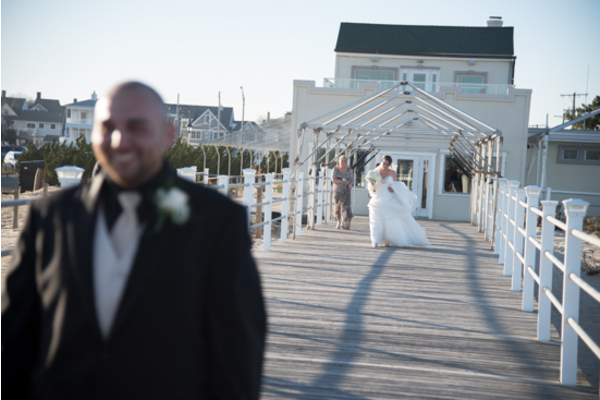 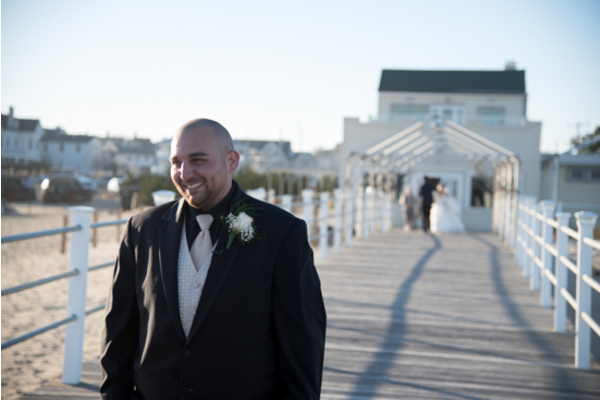 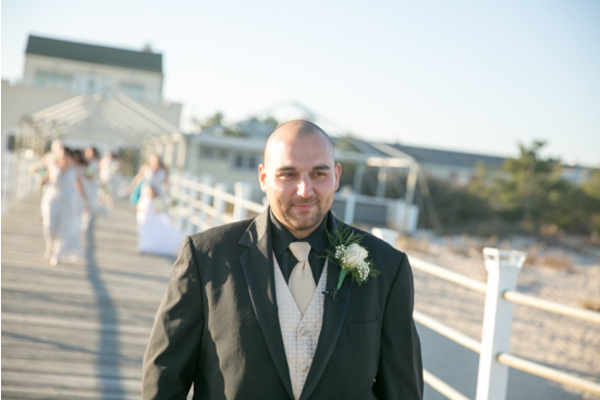 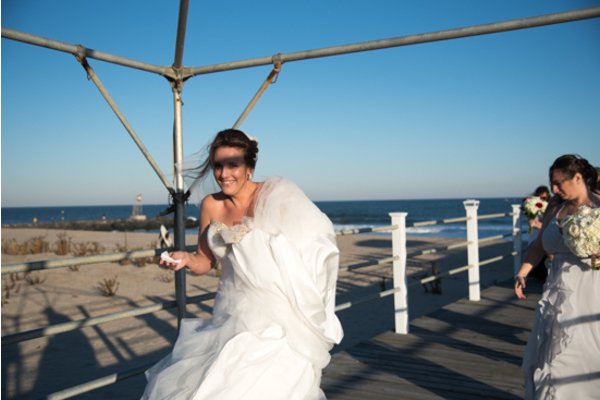 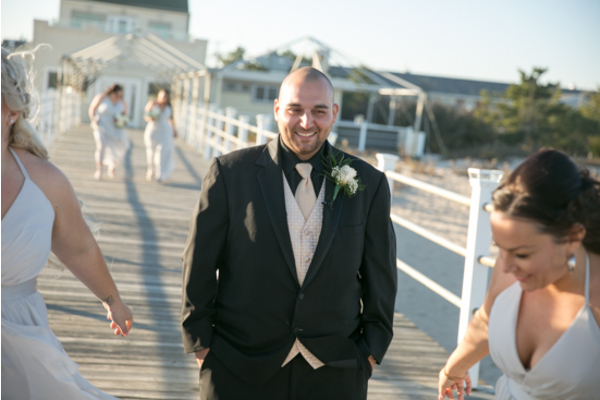 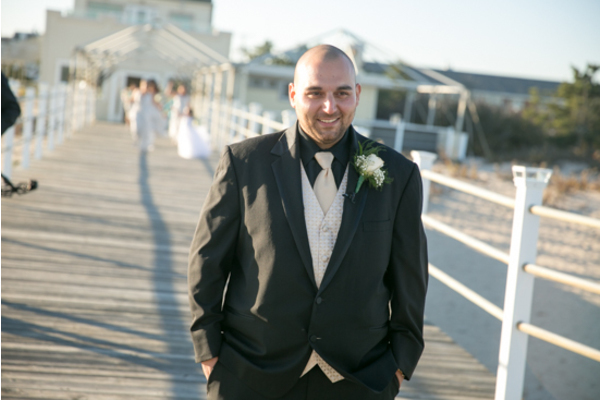 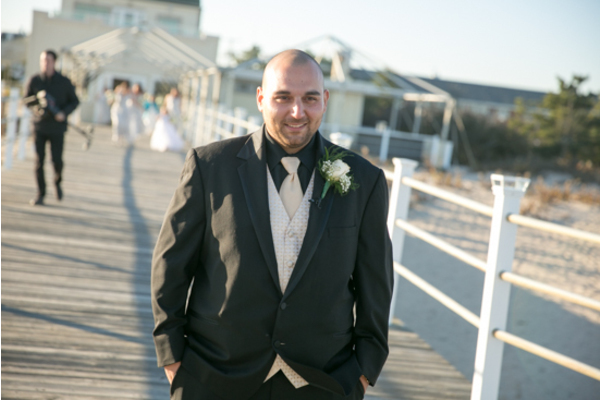 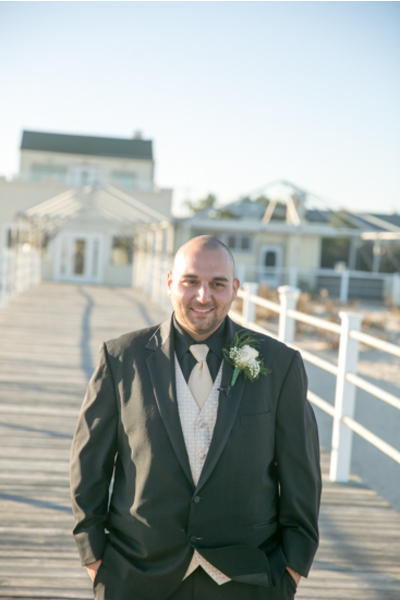 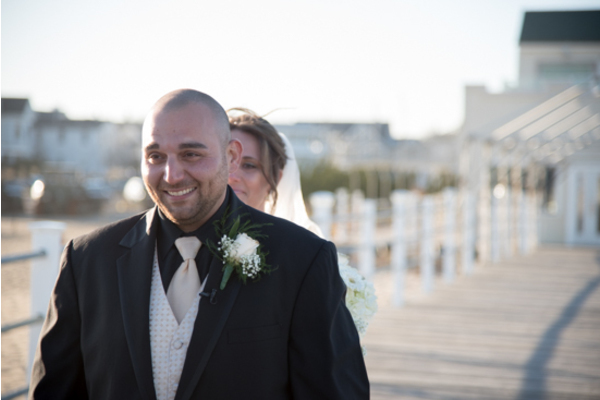 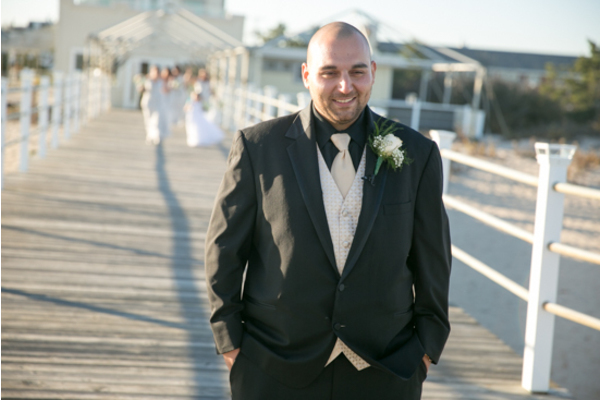 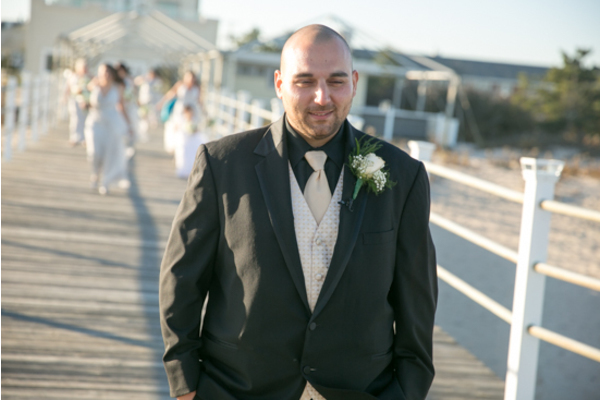 As Ashley was making her way outdoors, Matt was waiting on the beach pier to see how angelic his bride looks! 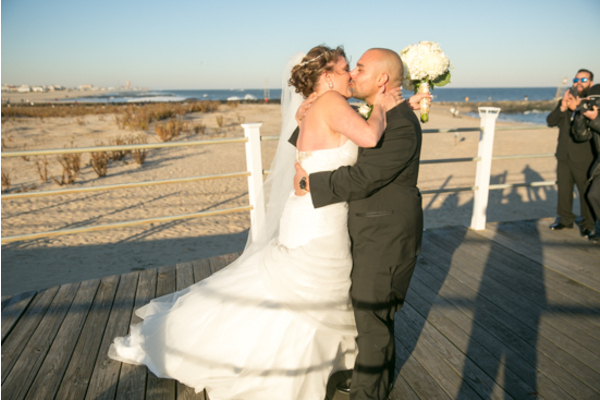 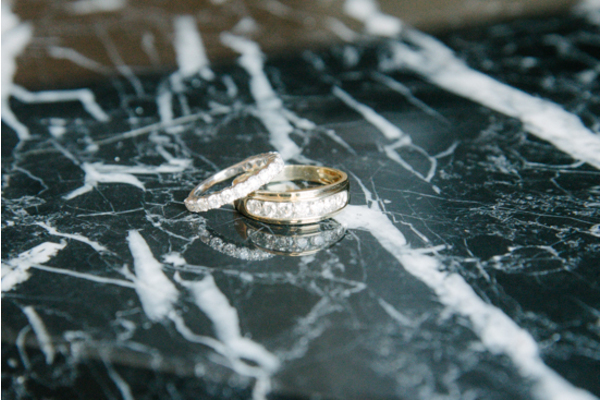 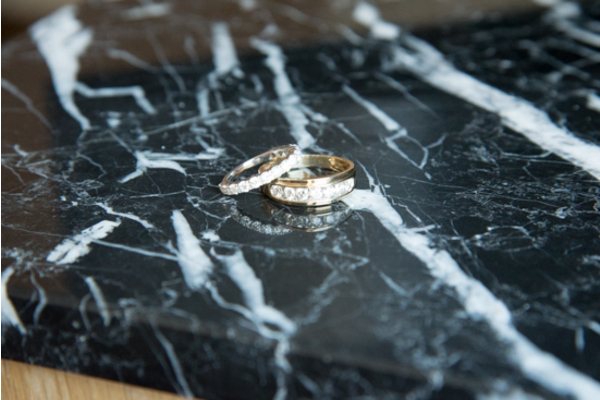 With sandy toes and salty kisses, these two were soon to be Mr. and Mrs! 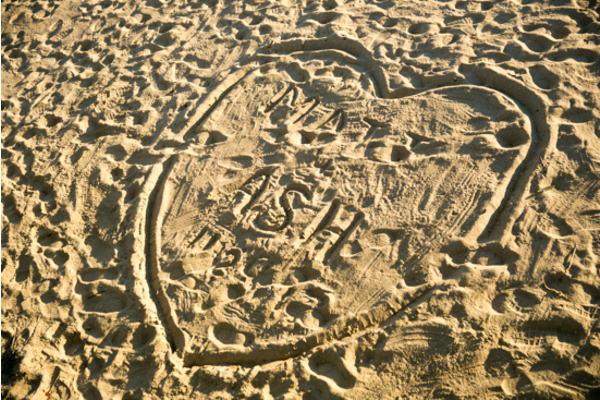 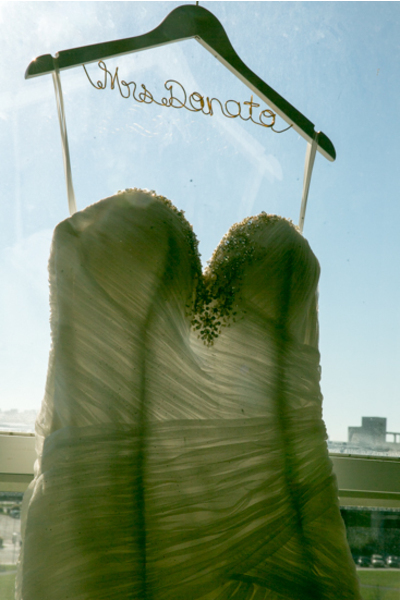 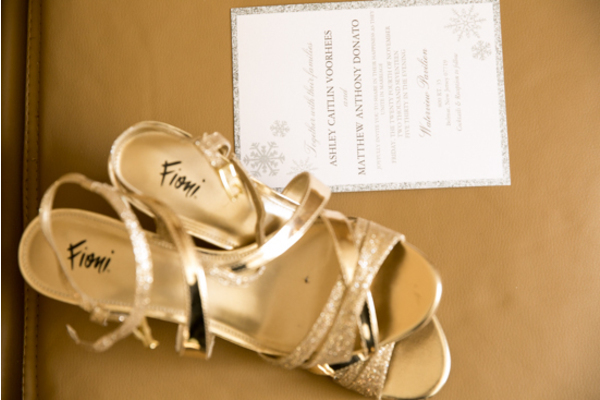 Our NJ Wedding Photographer creatively was able to snap a picture of Ashley and Matt’s name written in the sand. 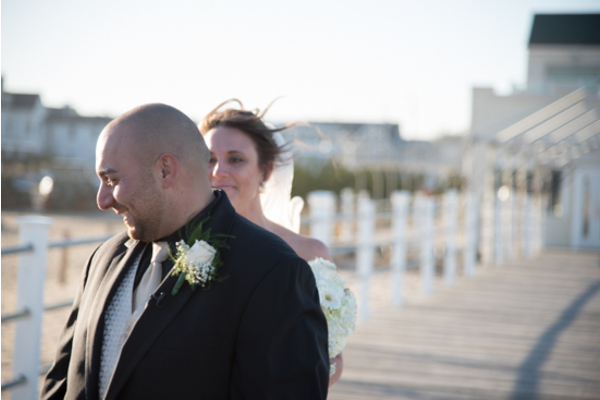 The sun was shining as bright as the smiles on this beautiful couple’s face during the portrait session. 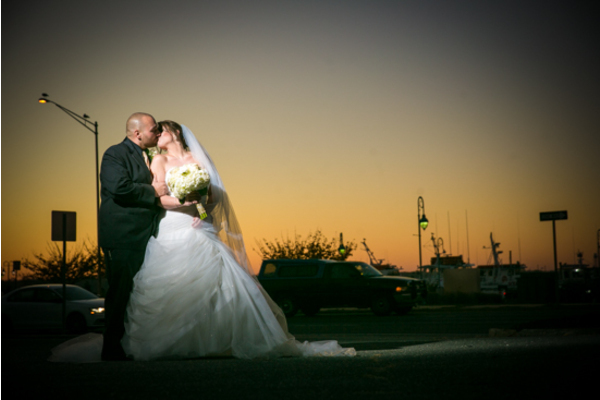 These lovebirds also posed for a picture beside the venue’s sign underneath the orange sunset. 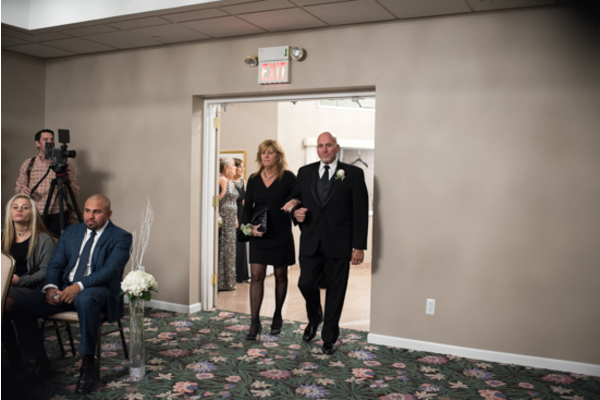 Guests made their way inside for the special ceremony to celebrate Ashley and Matt. 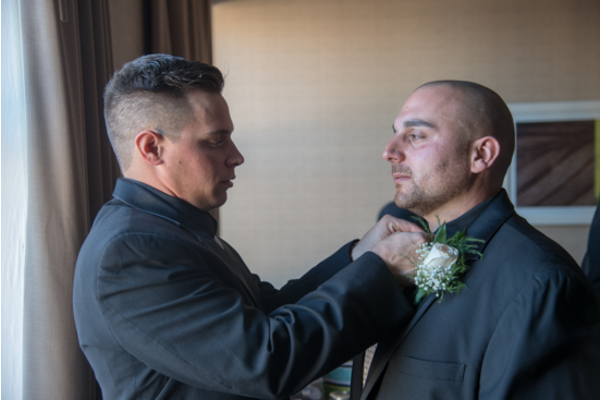 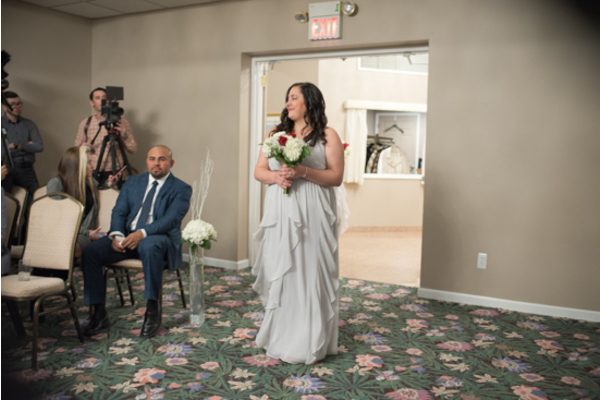 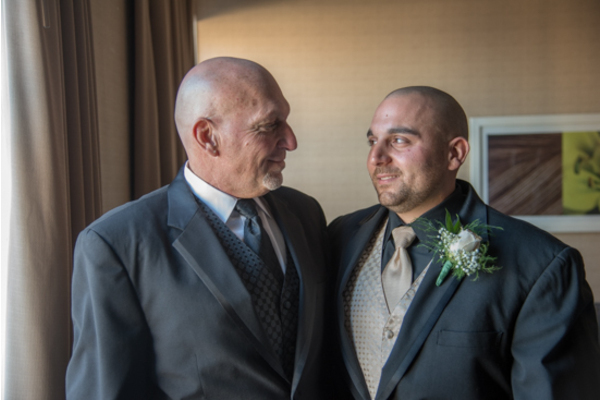 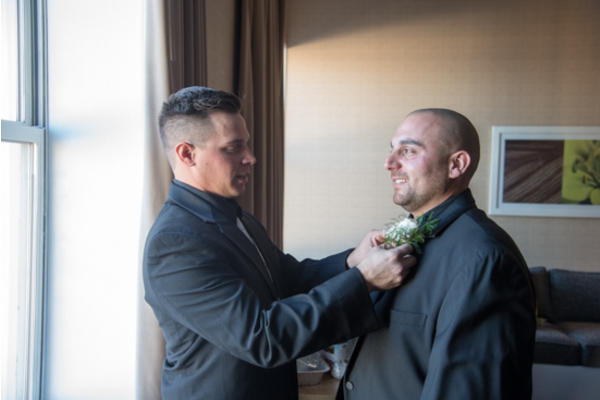 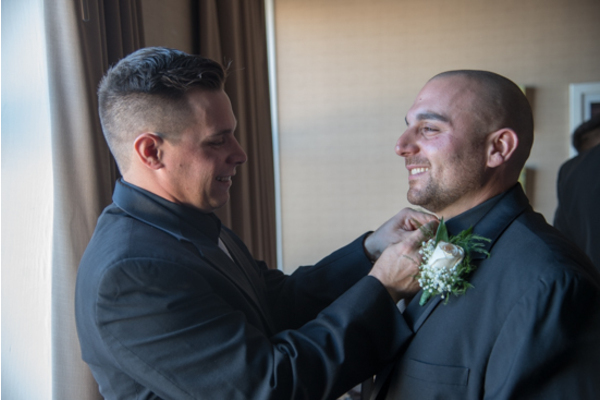 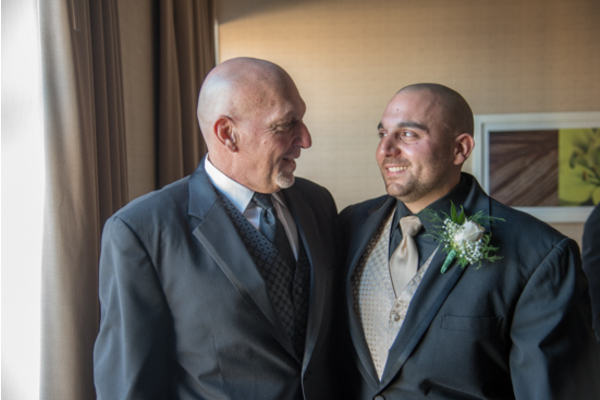 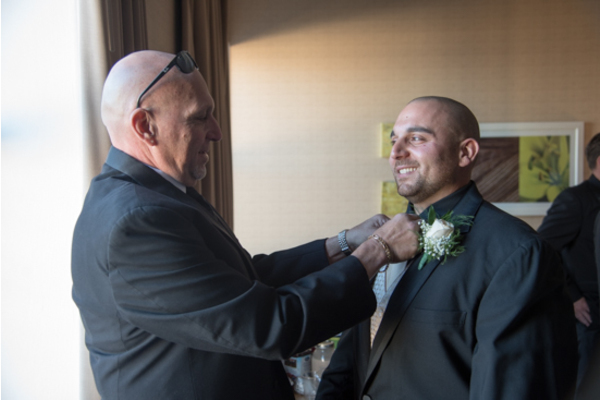 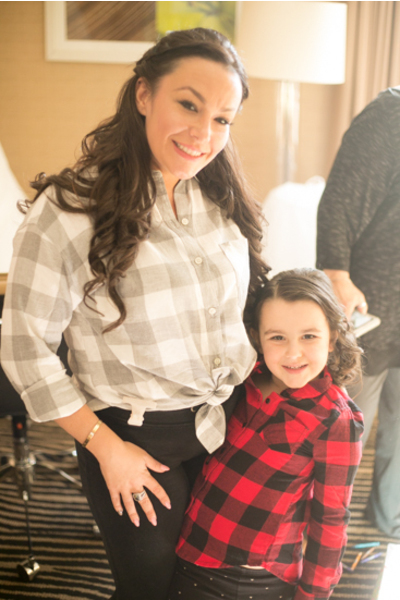 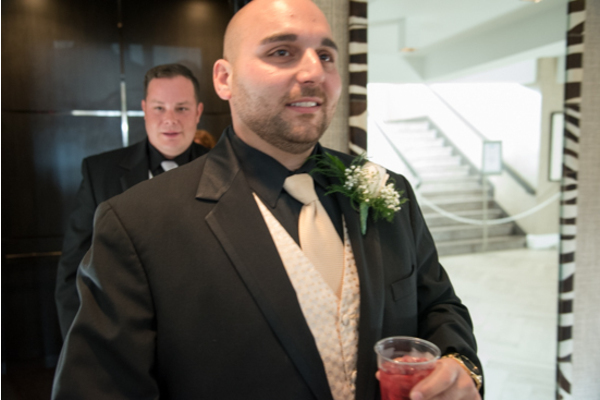 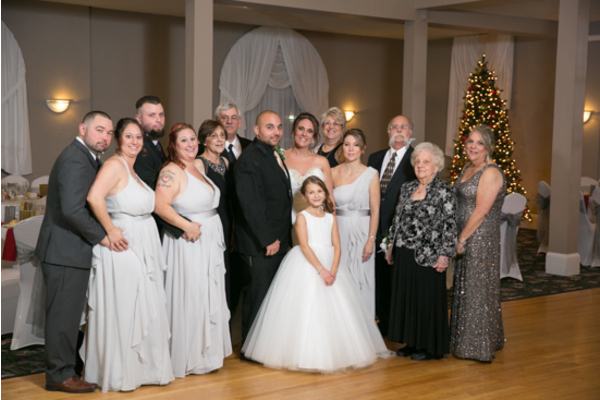 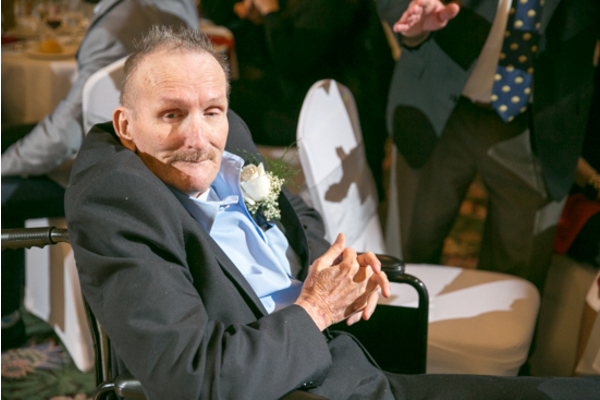 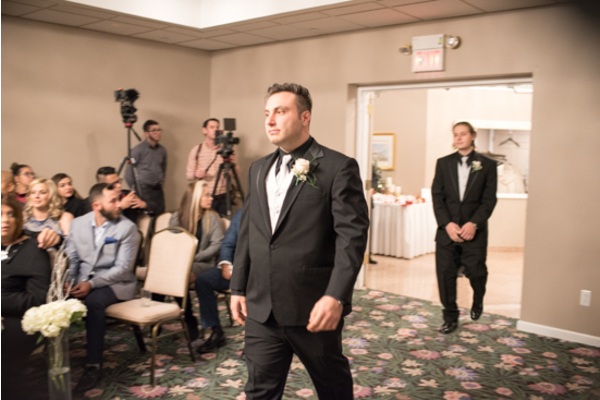 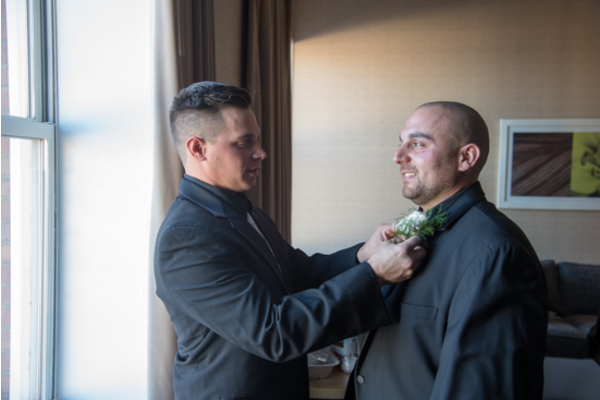 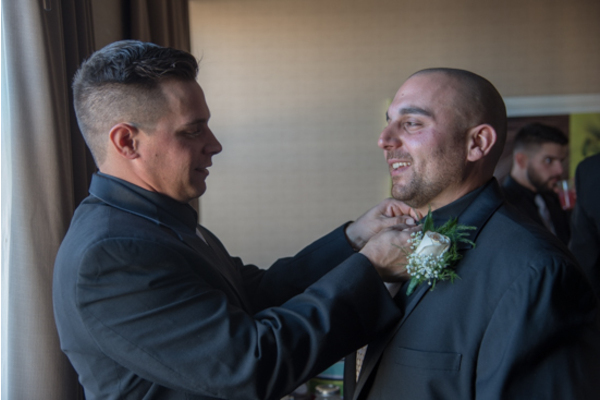 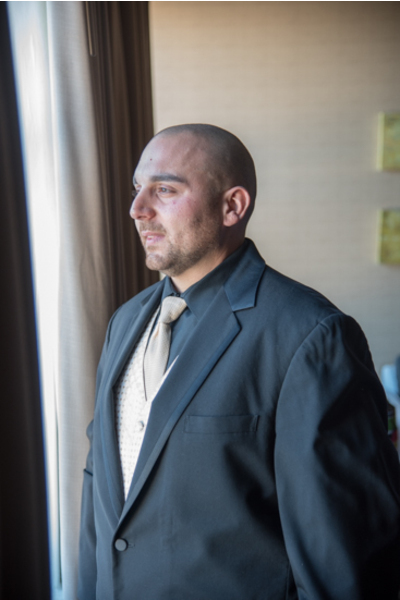 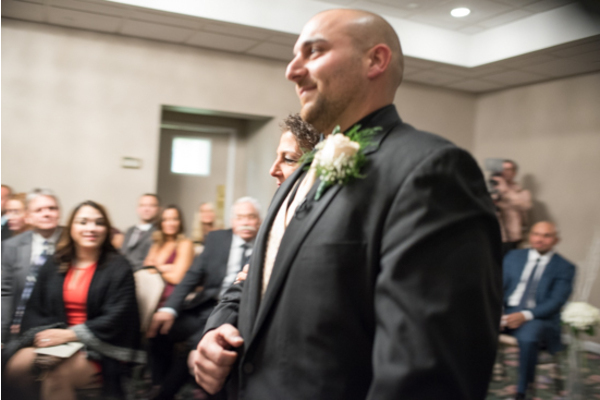 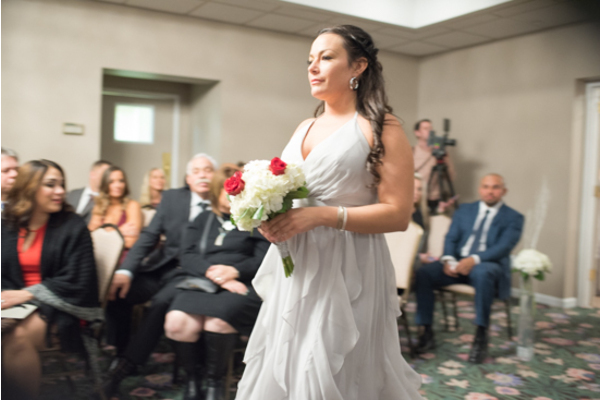 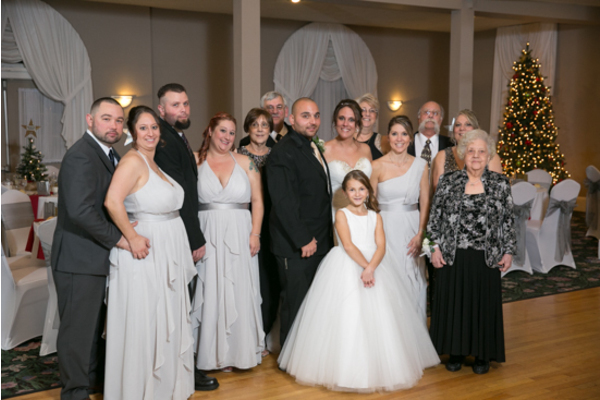 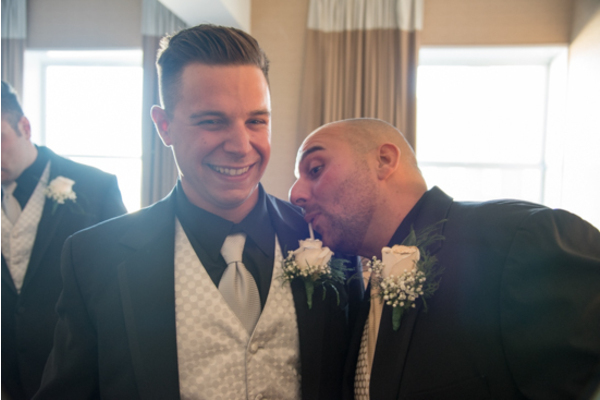 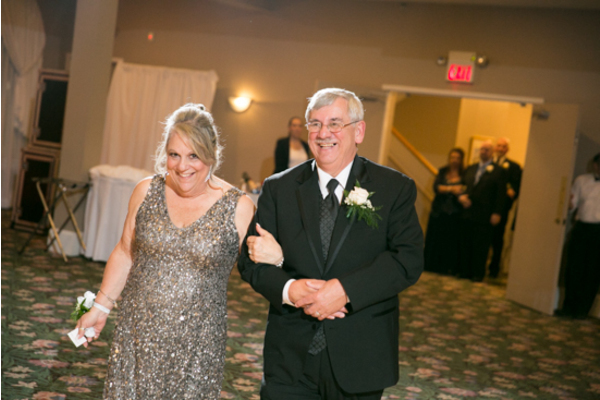 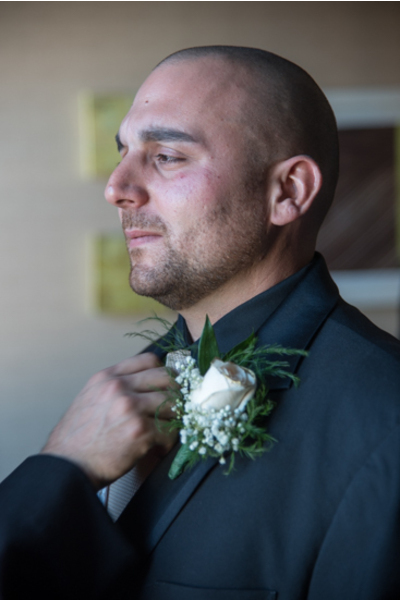 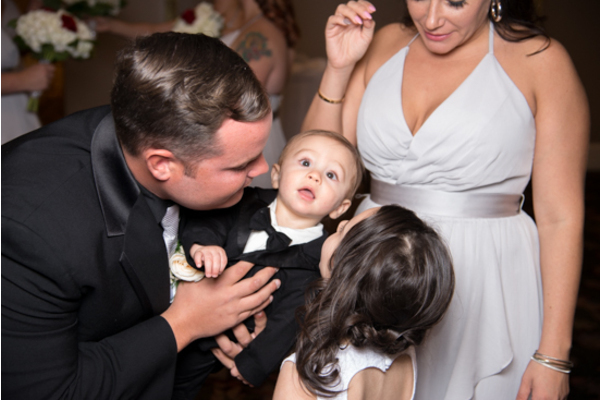 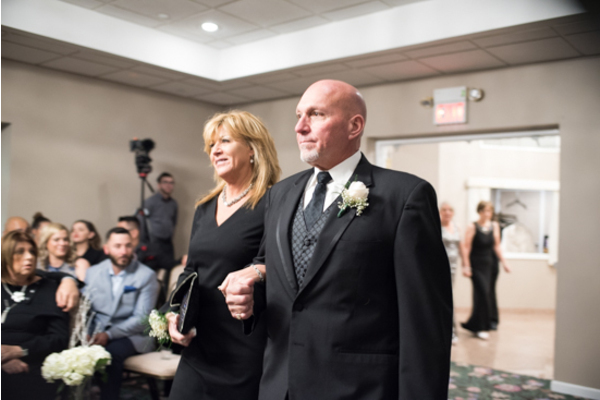 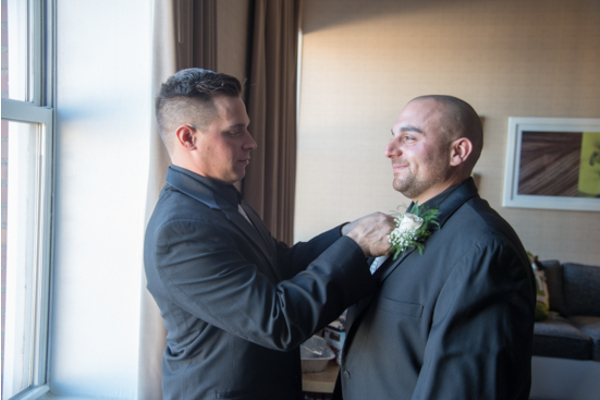 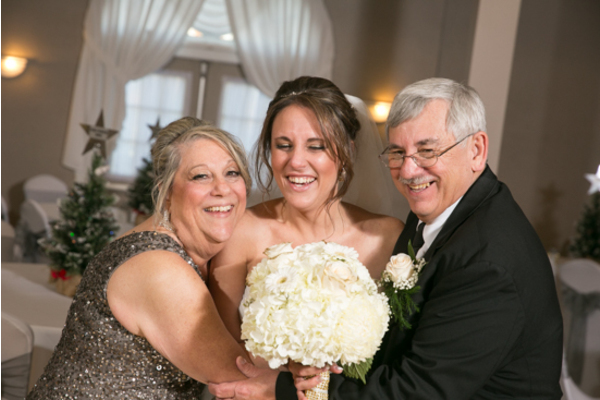 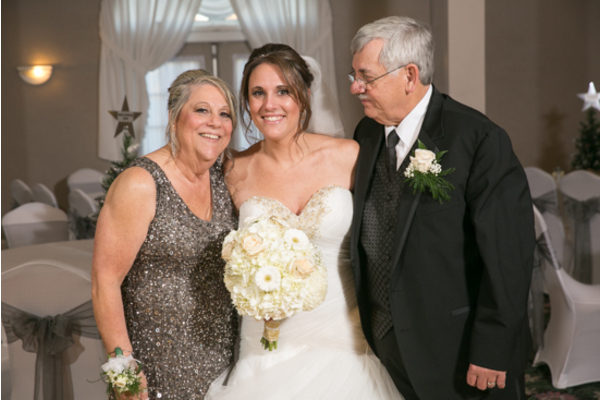 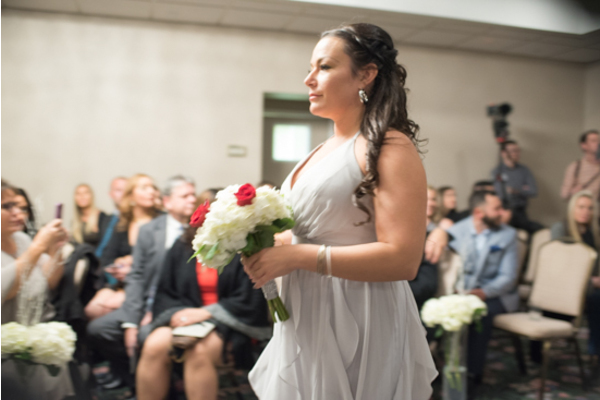 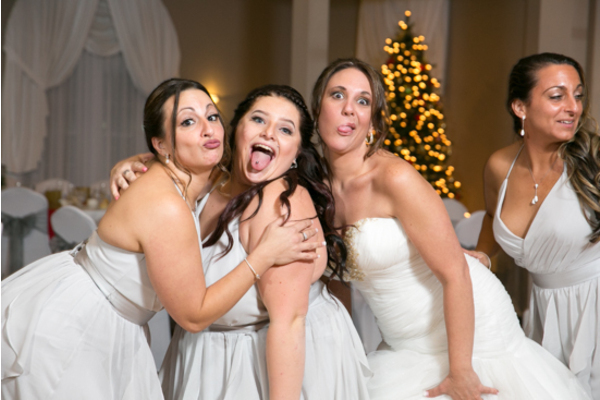 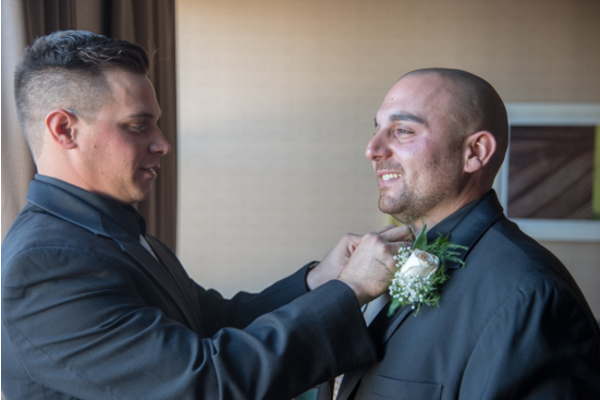 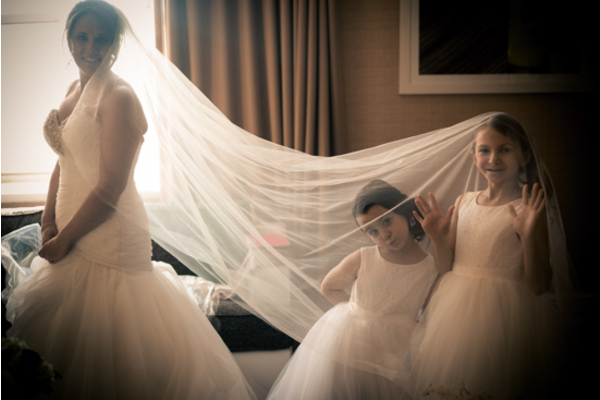 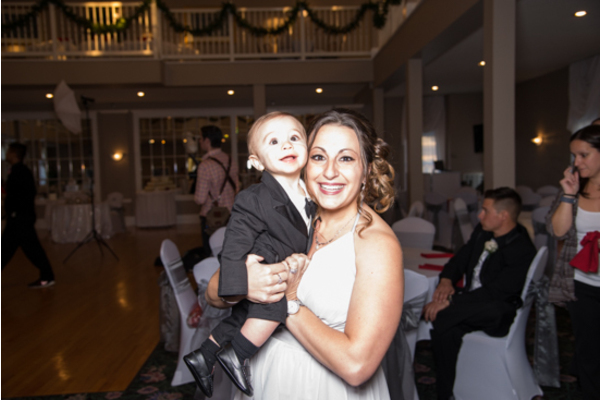 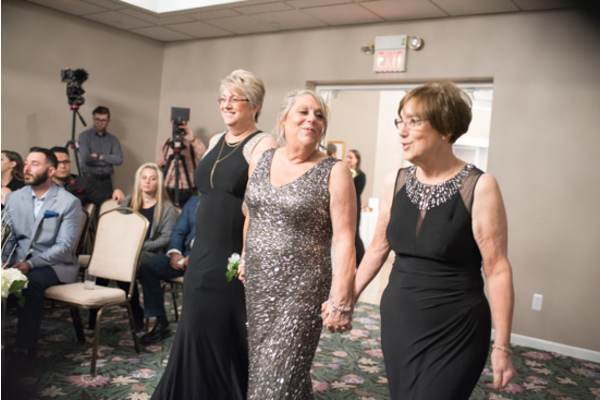 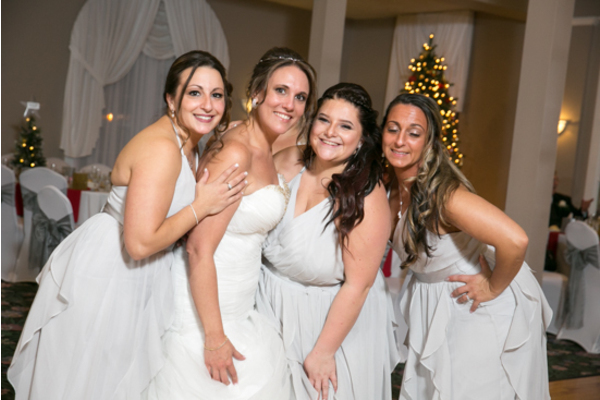 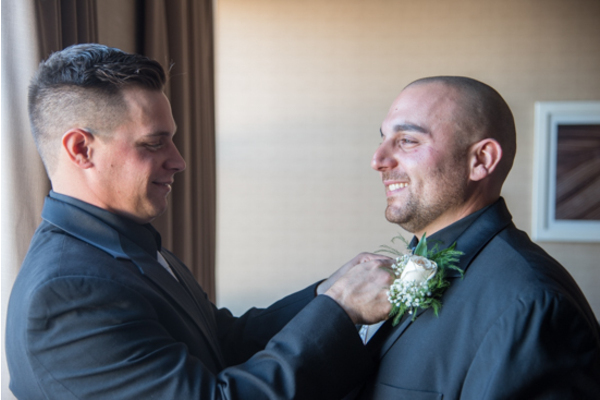 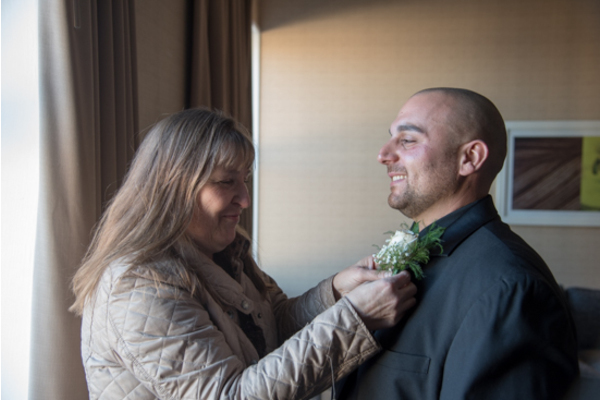 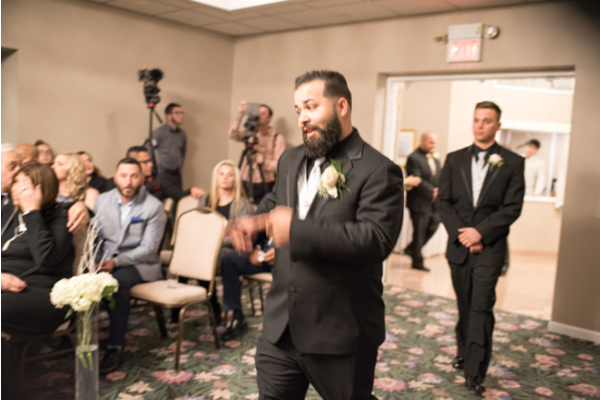 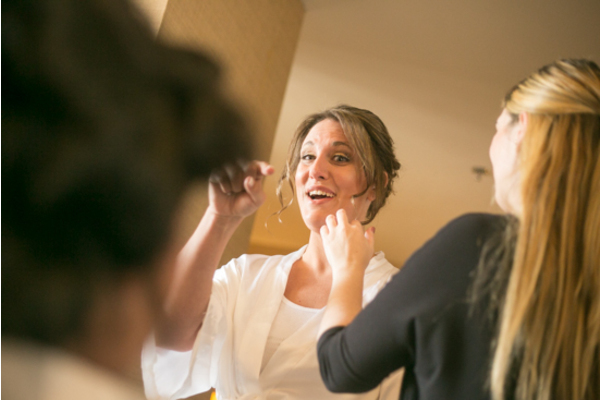 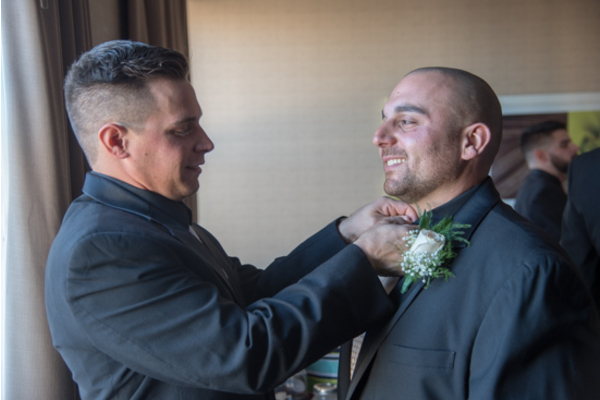 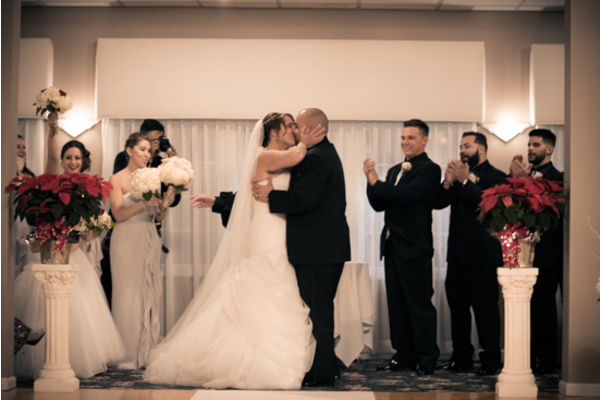 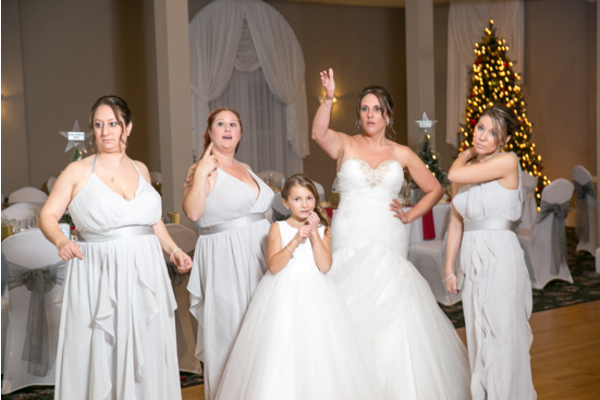 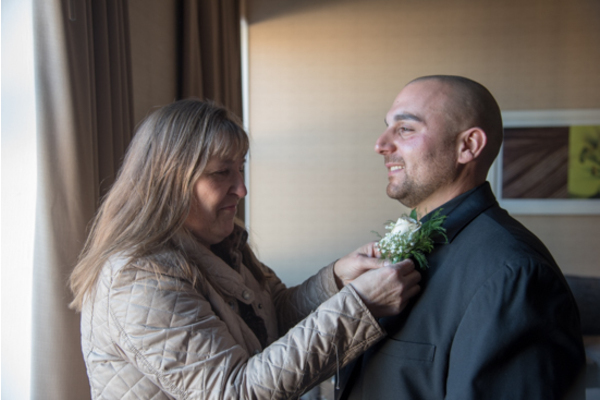 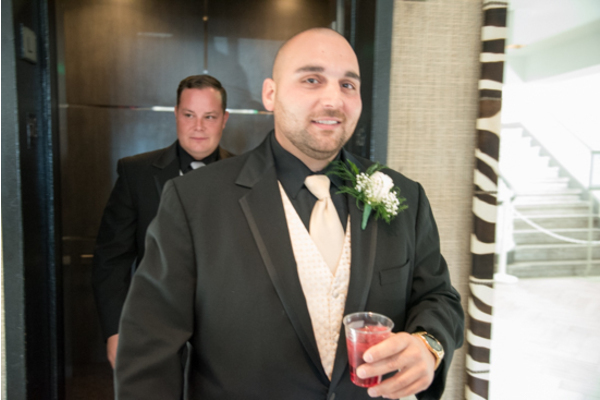 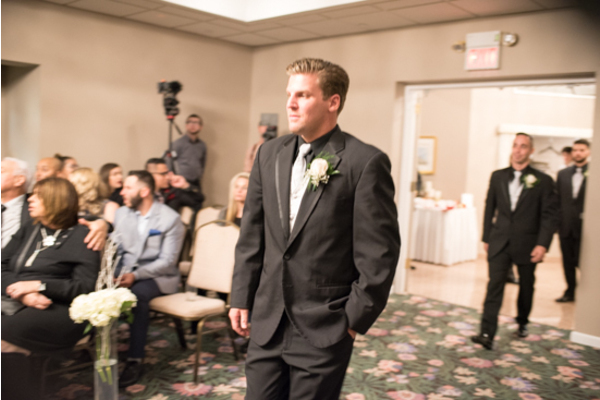 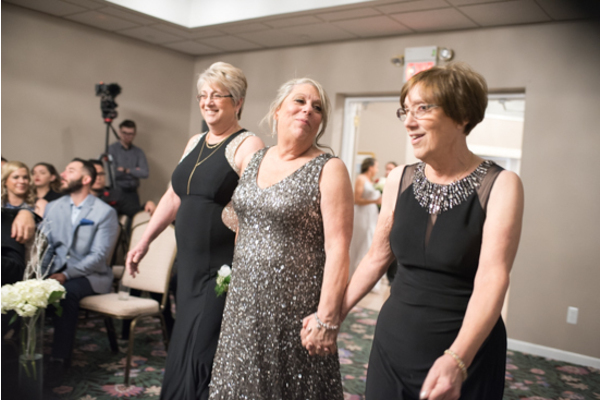 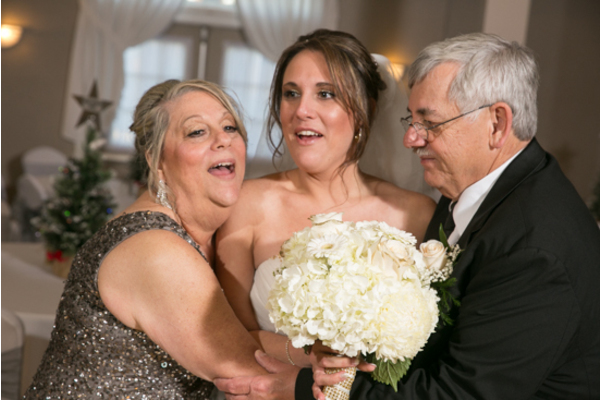 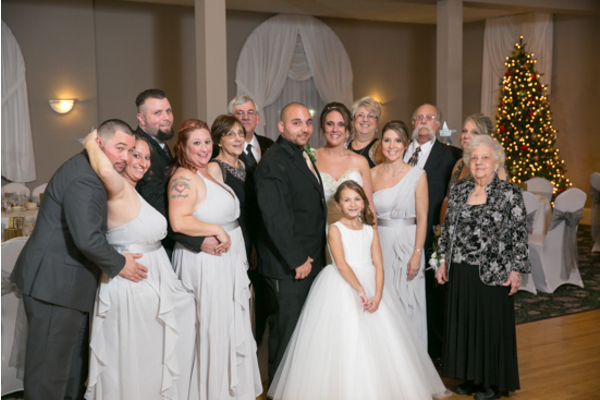 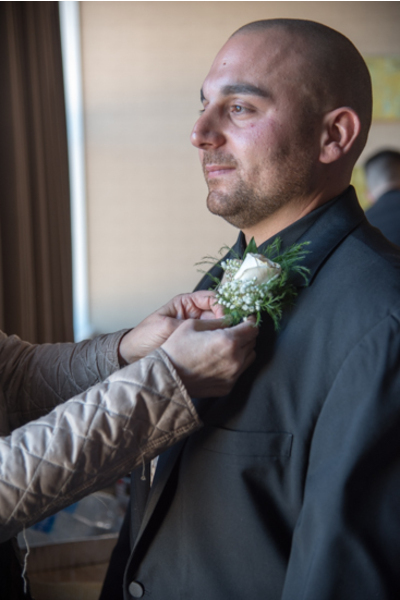 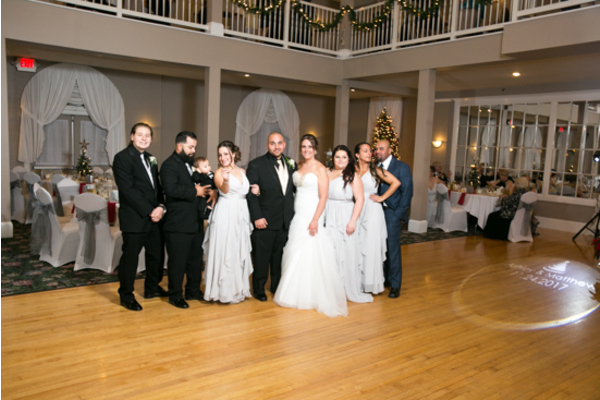 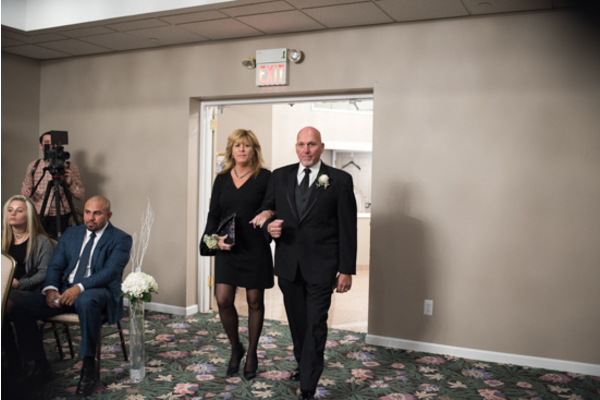 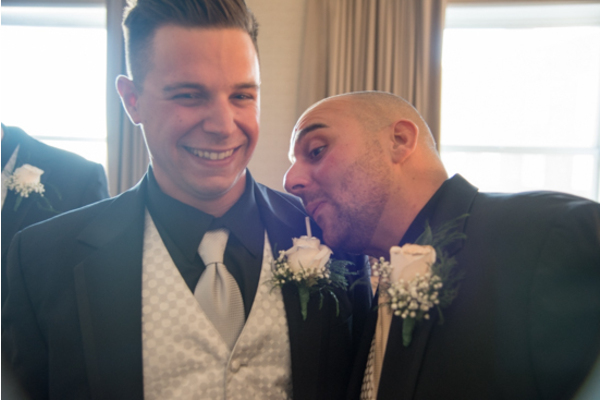 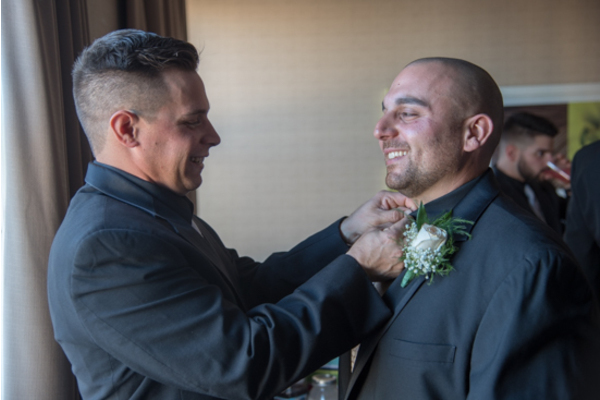 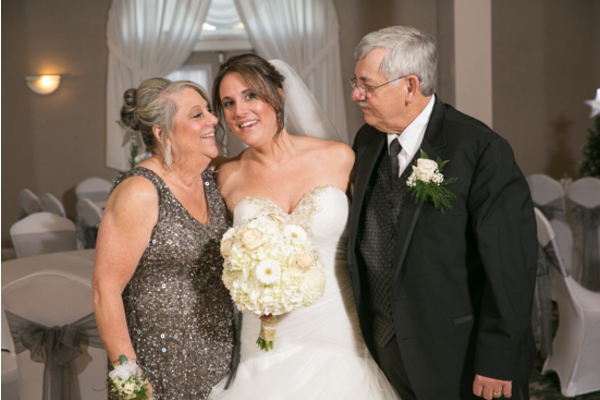 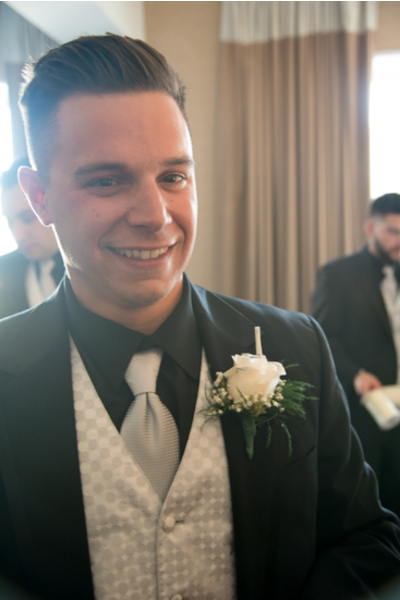 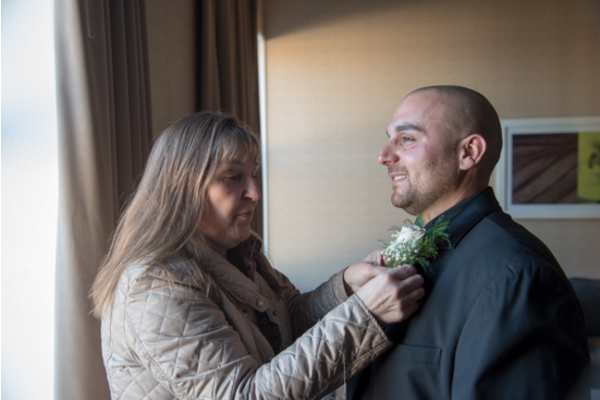 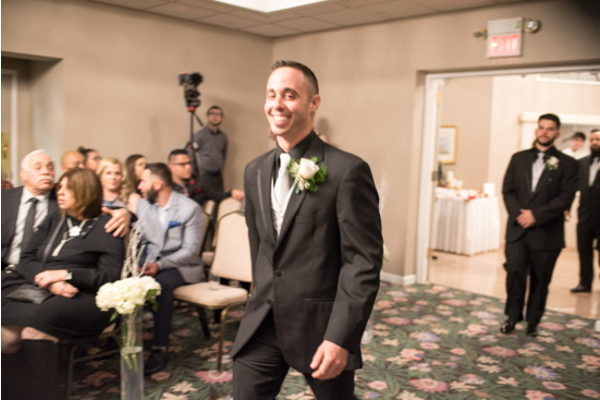 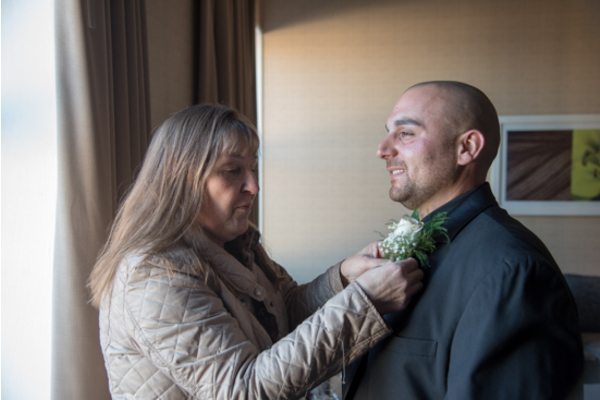 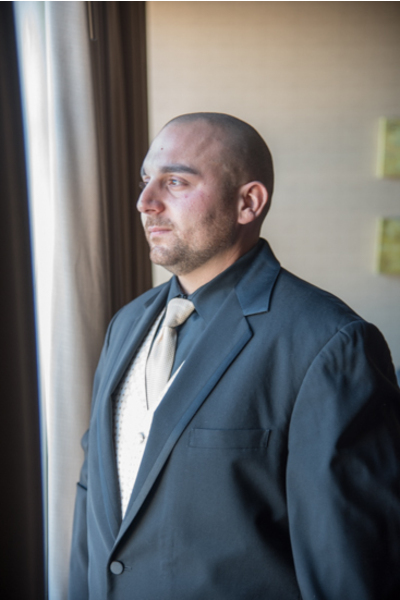 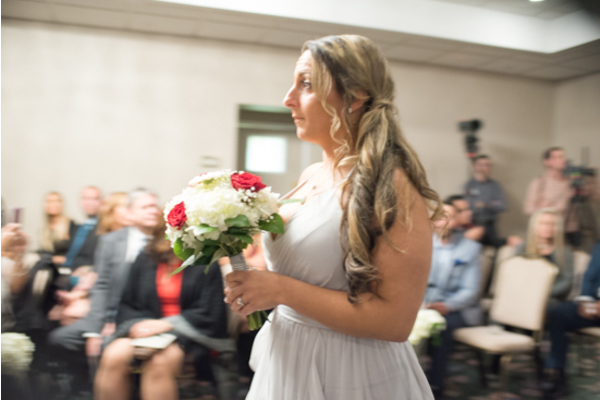 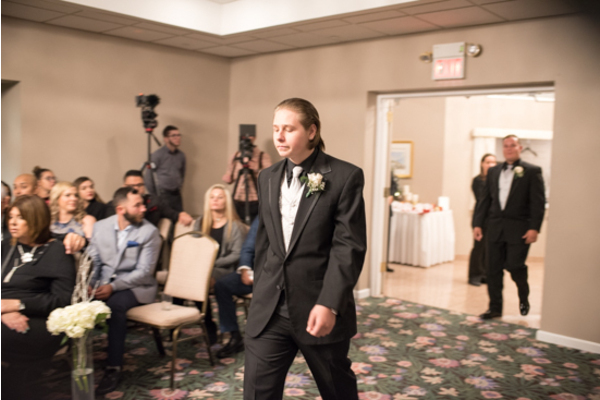 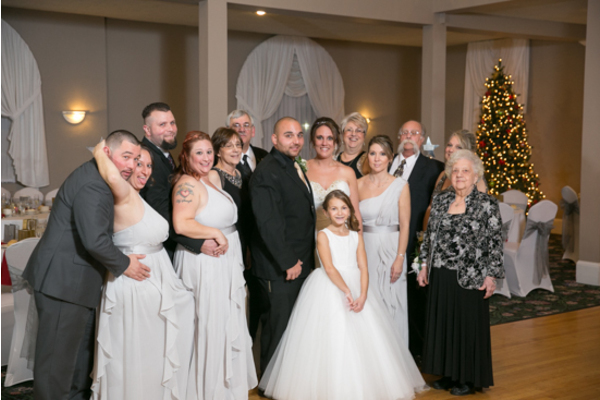 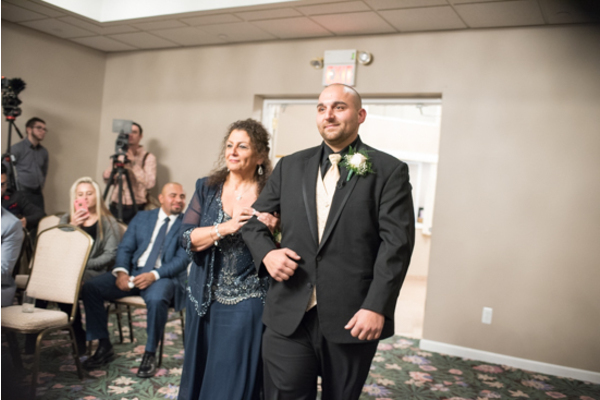 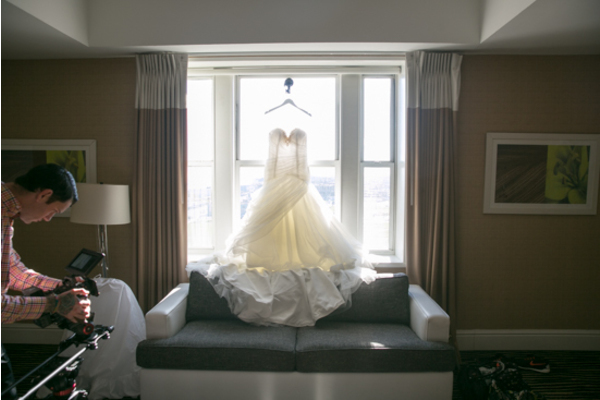 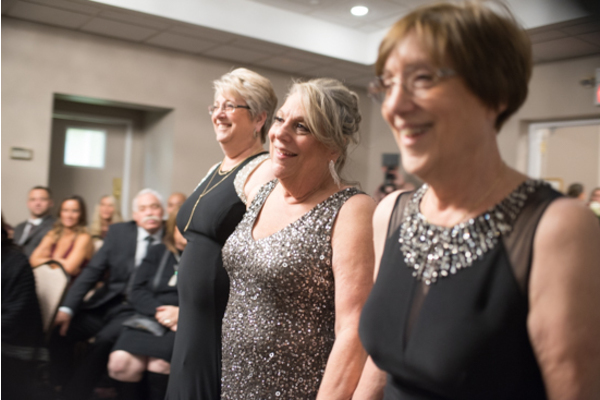 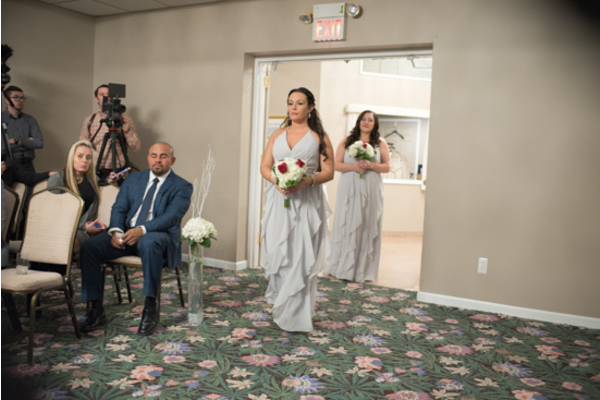 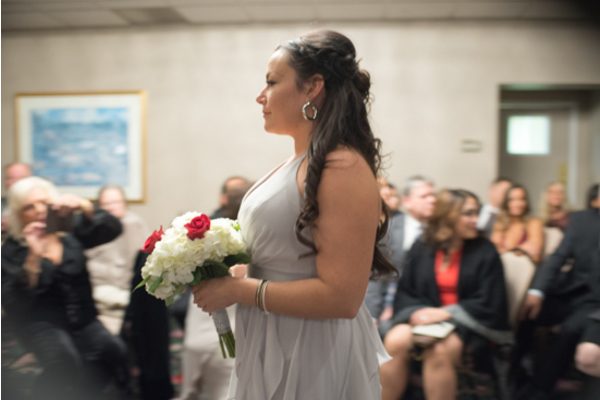 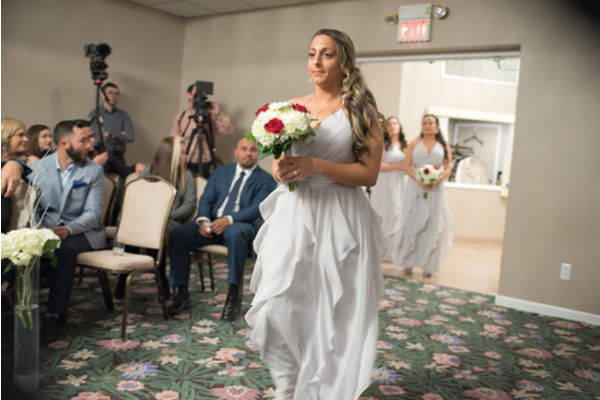 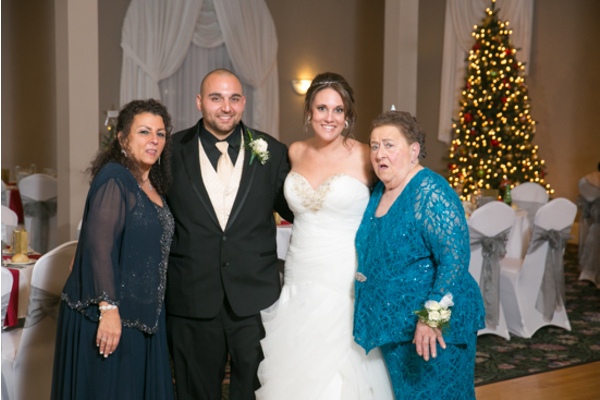 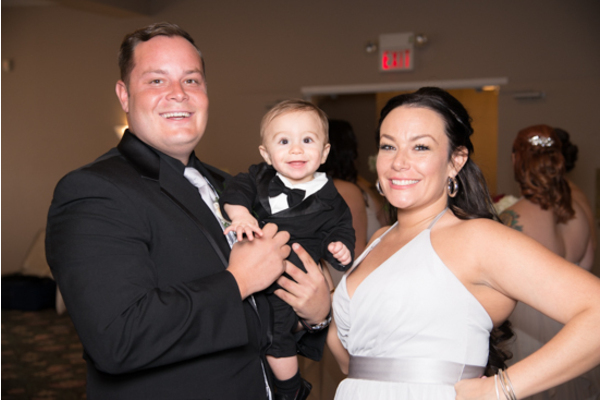 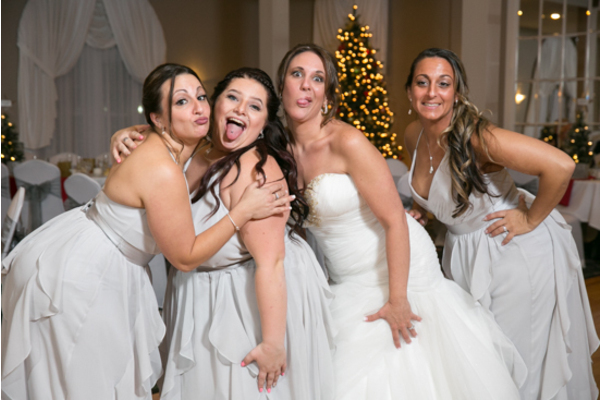 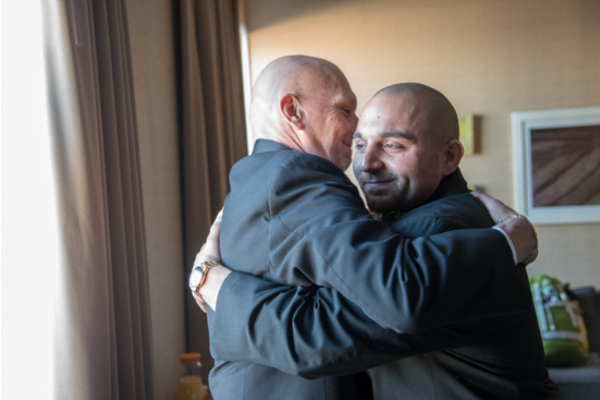 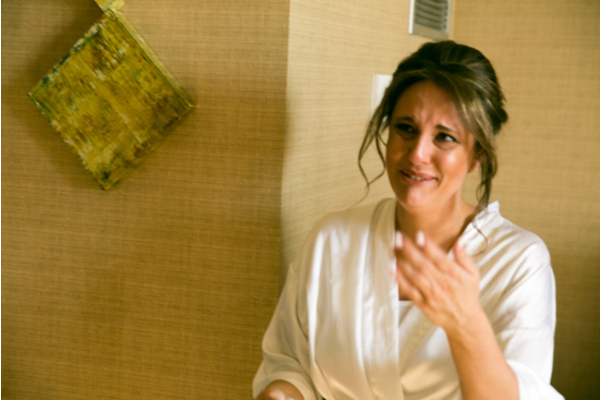 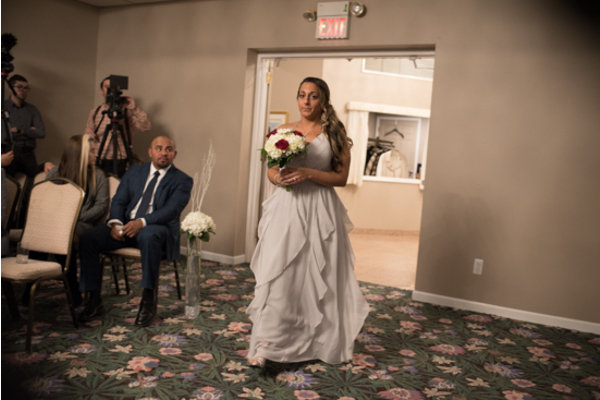 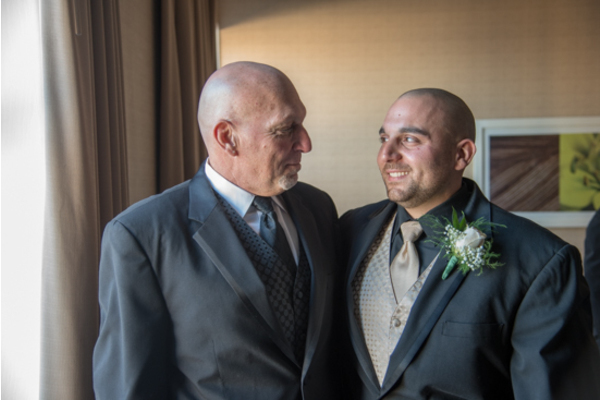 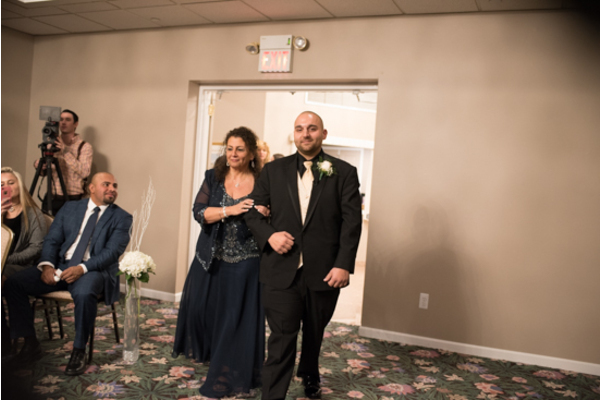 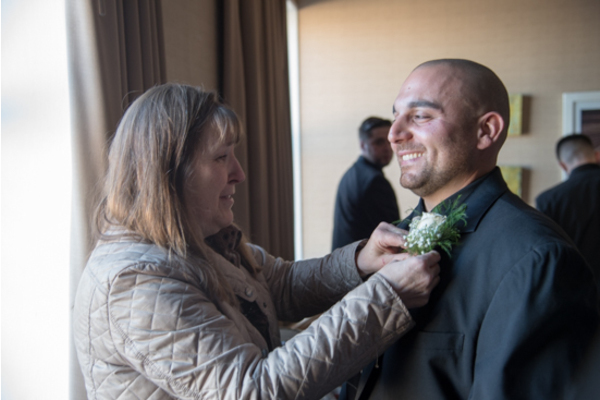 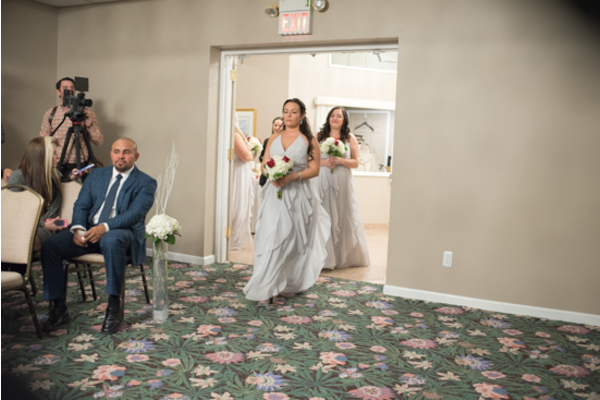 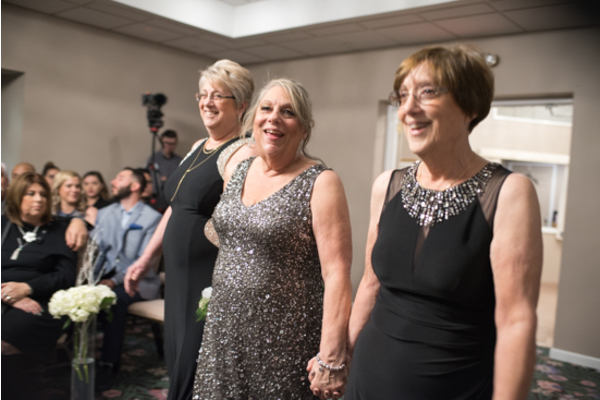 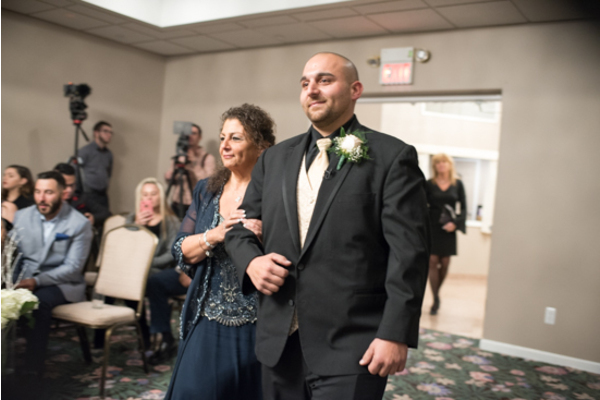 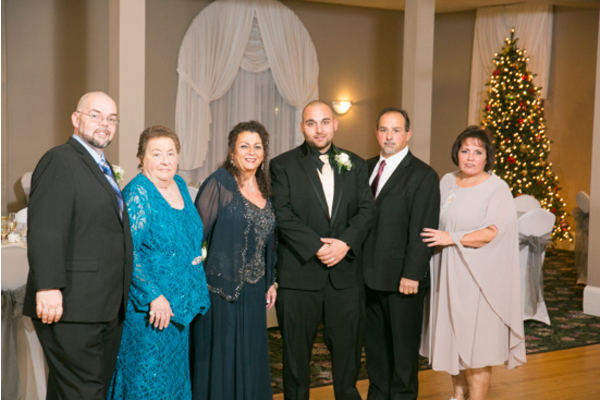 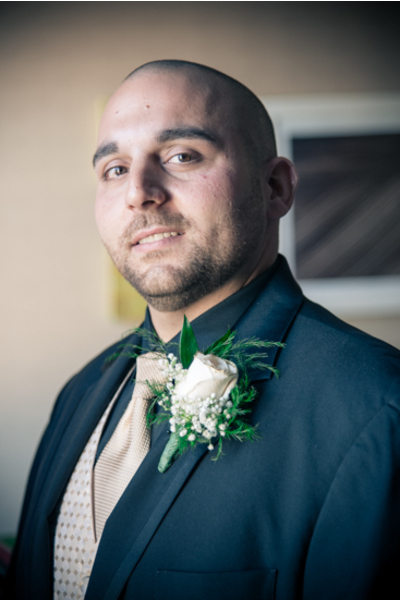 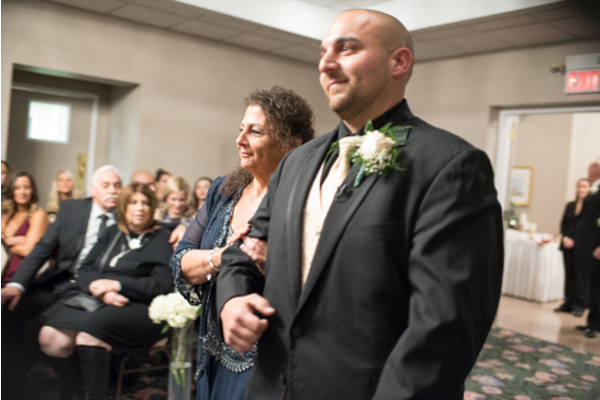 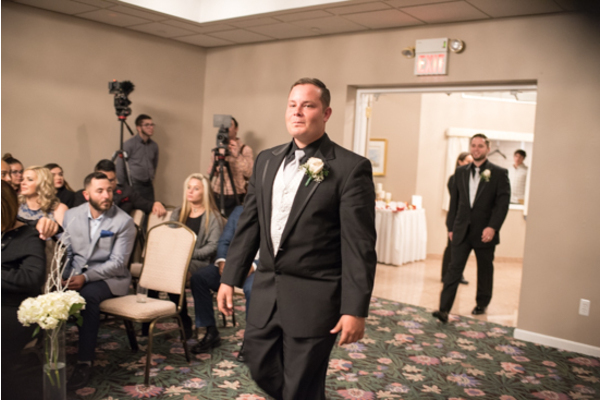 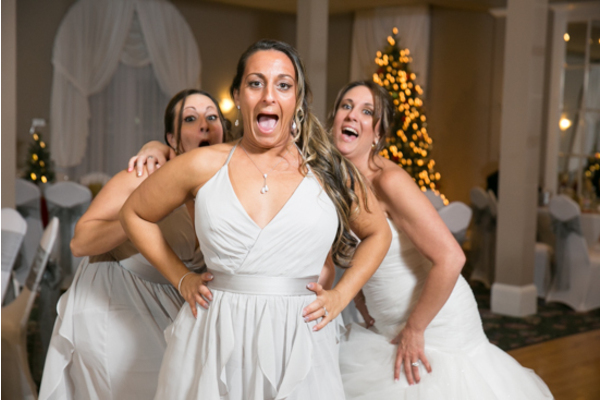 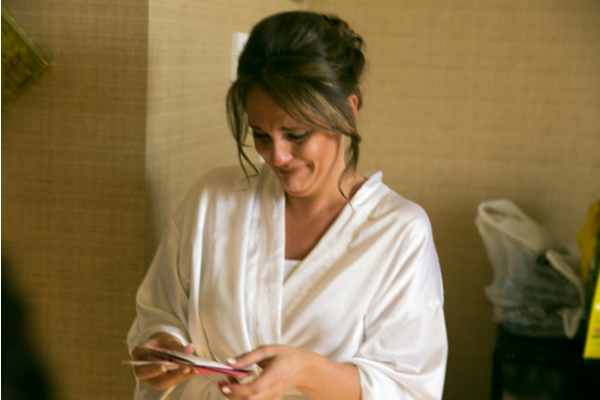 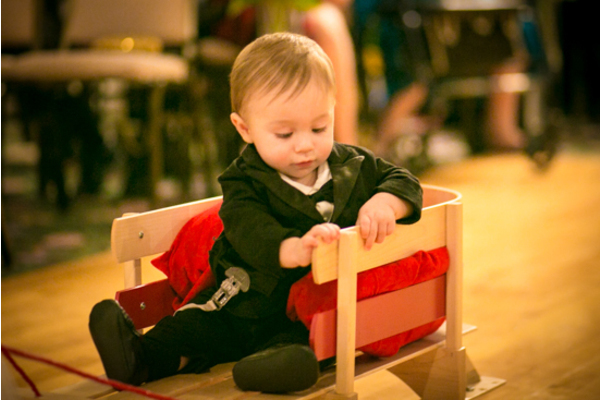 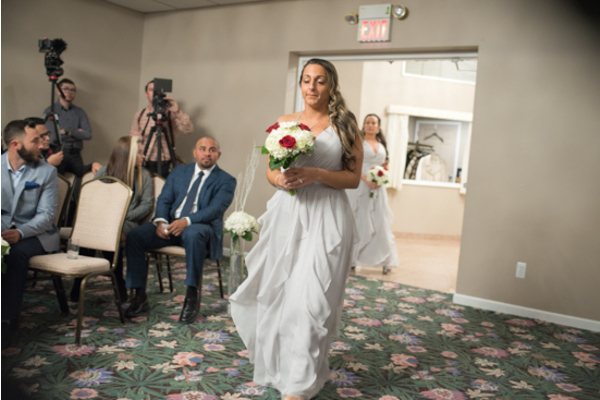 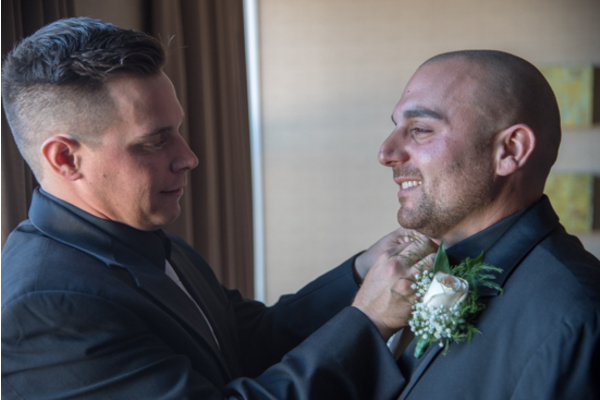 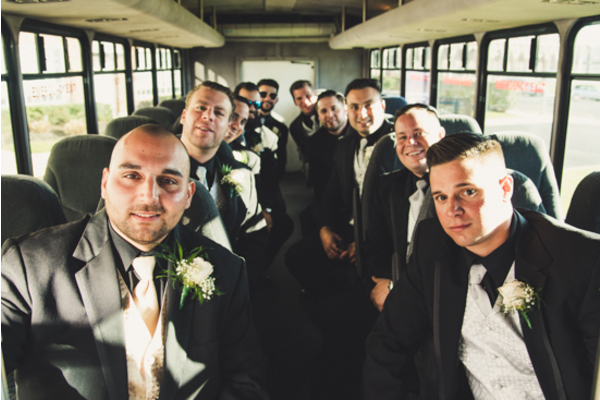 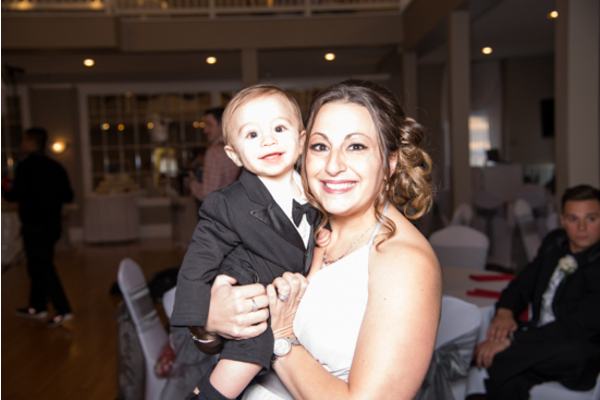 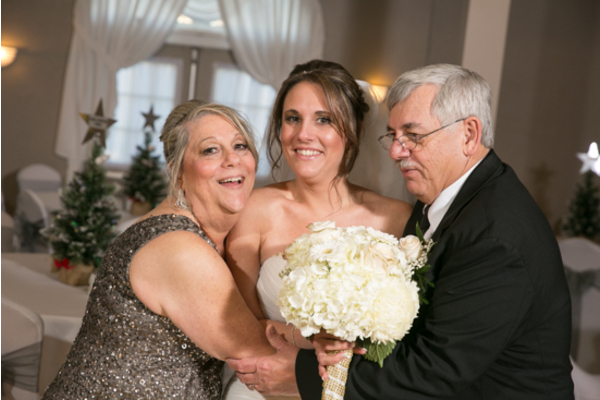 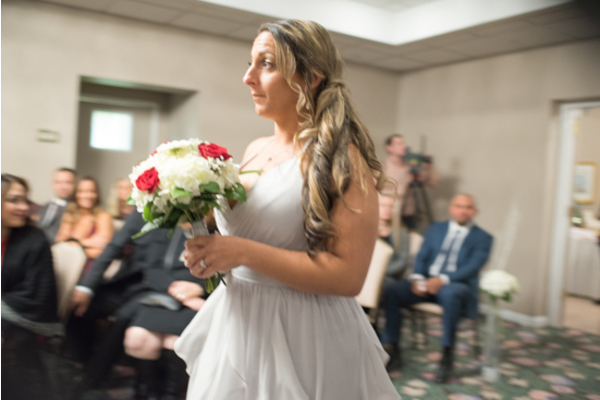 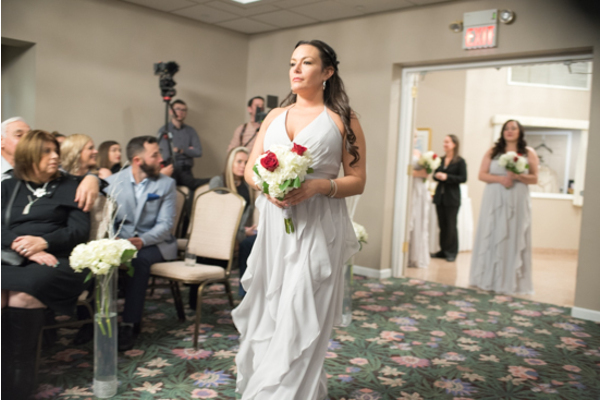 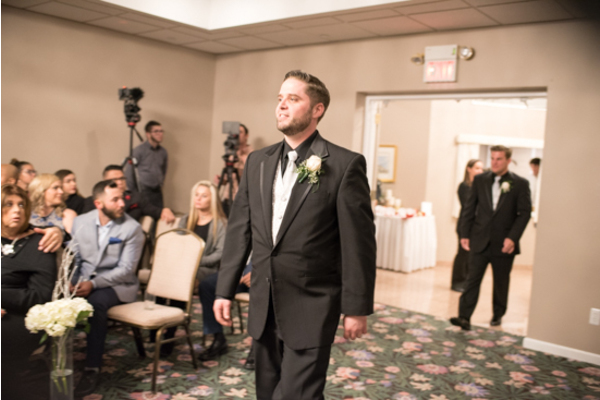 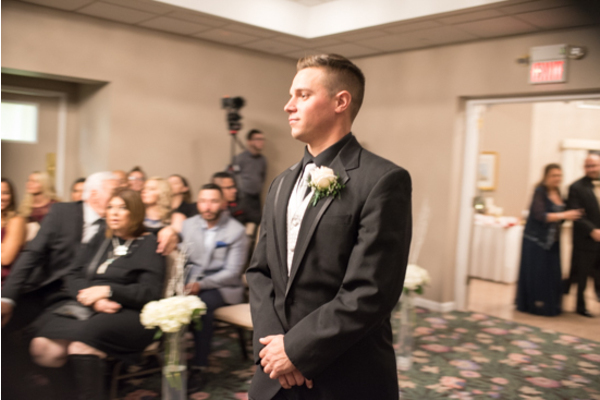 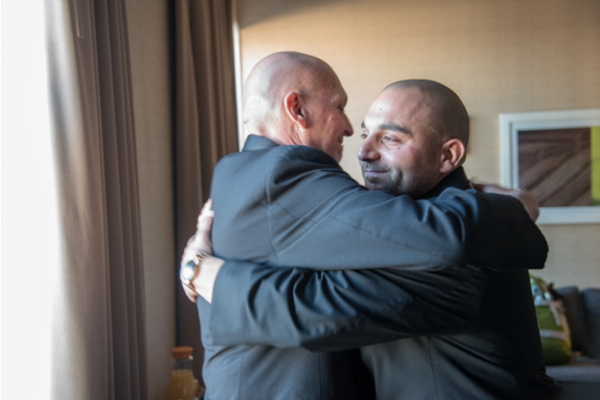 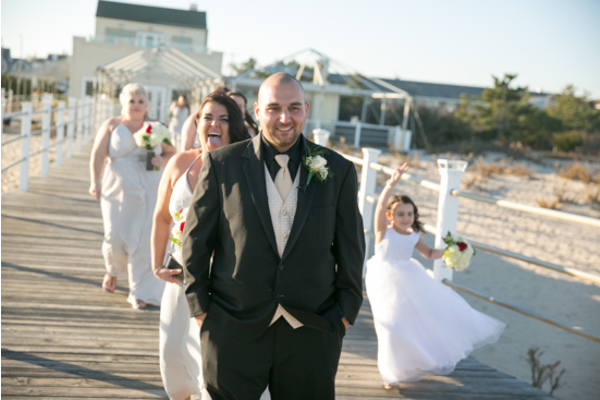 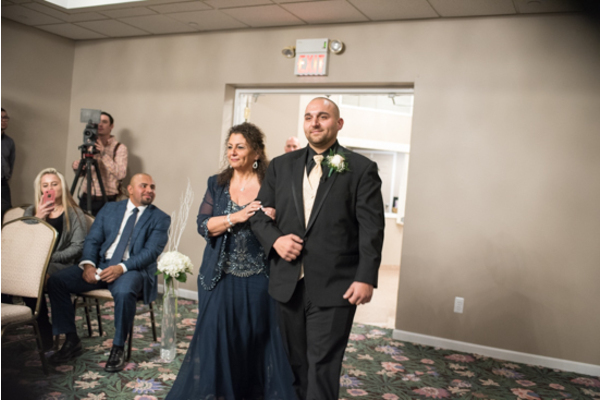 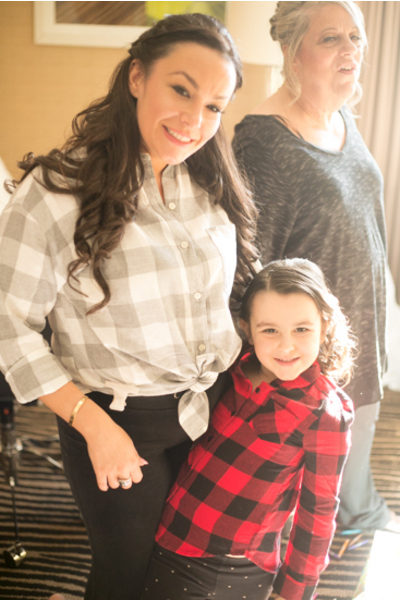 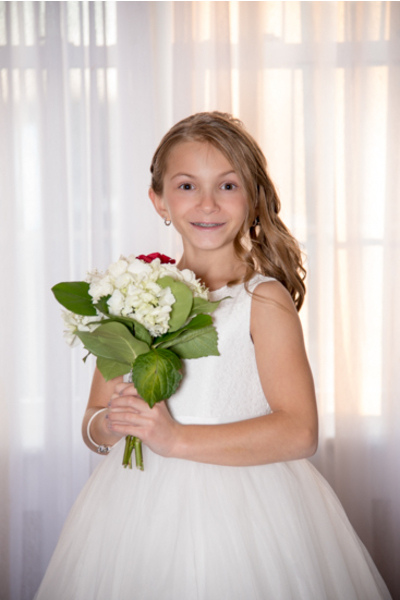 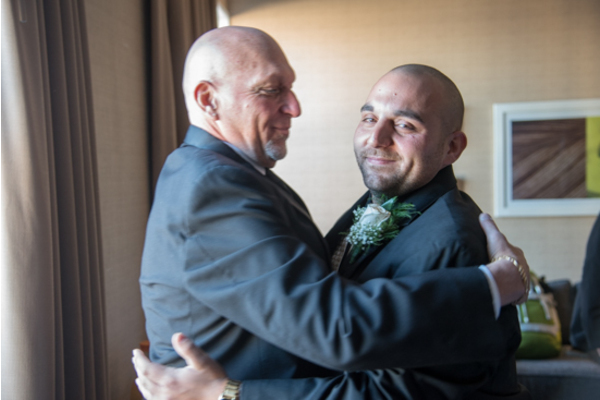 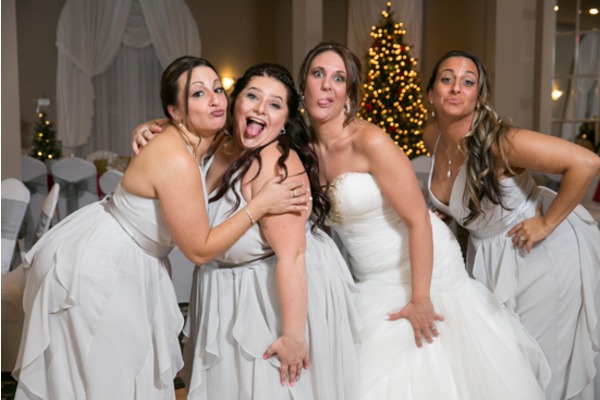 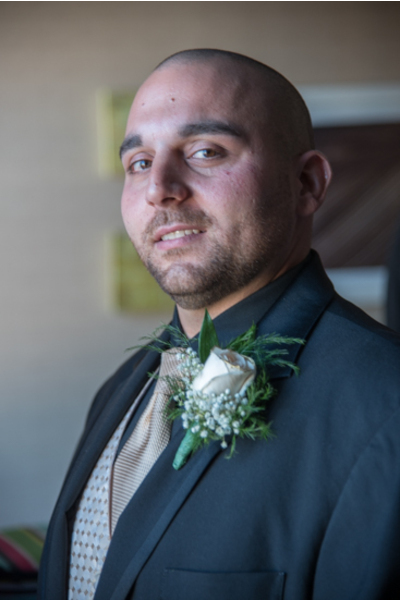 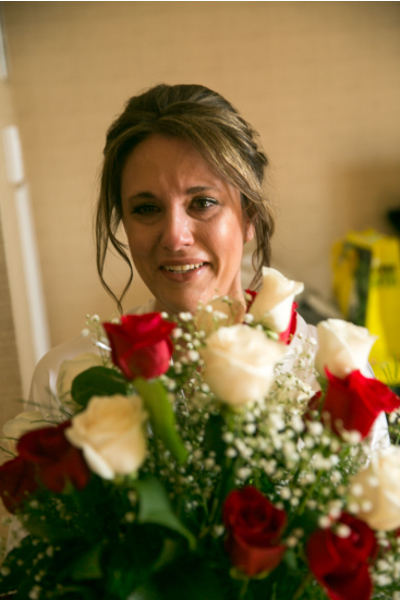 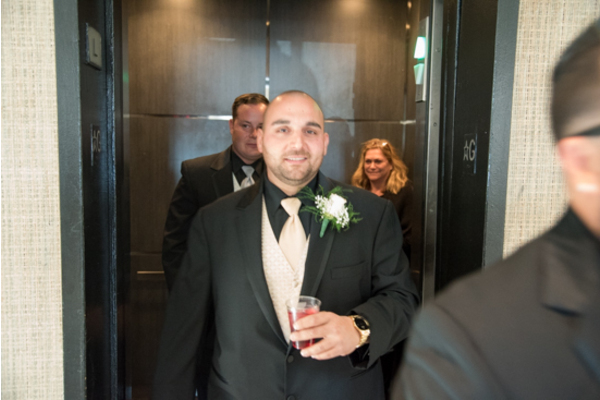 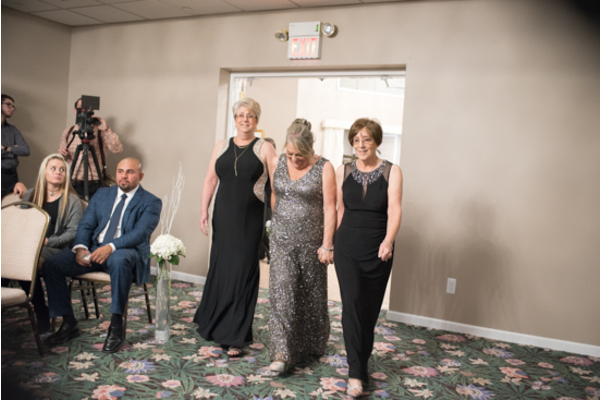 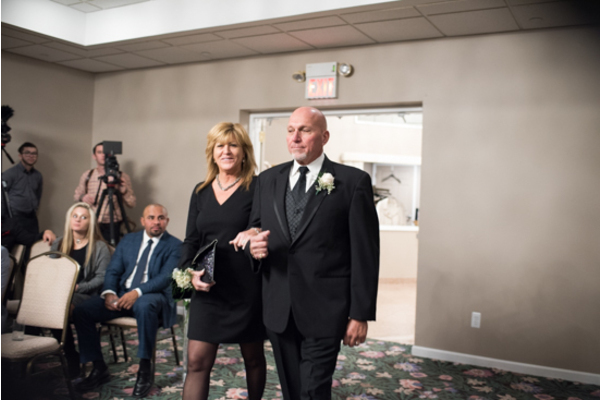 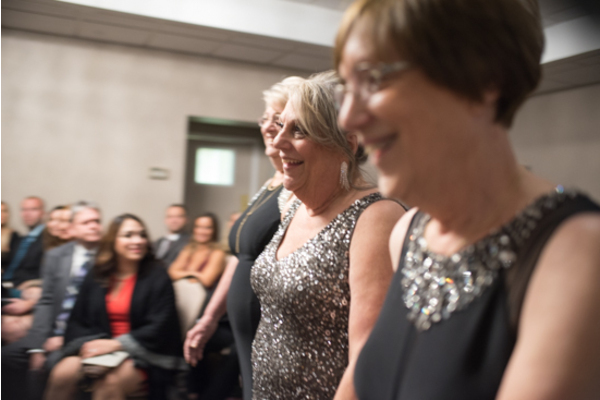 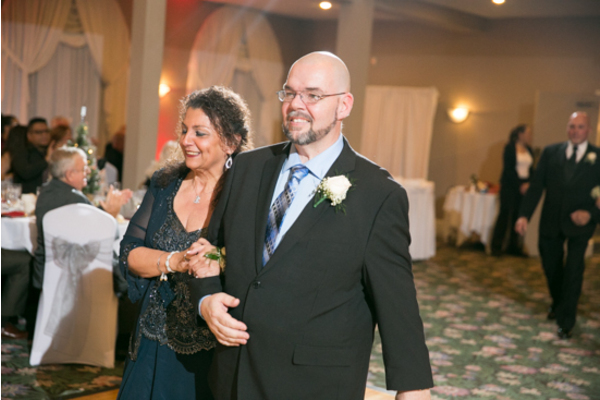 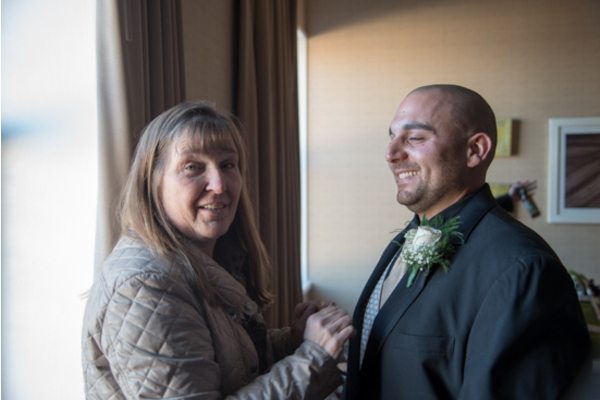 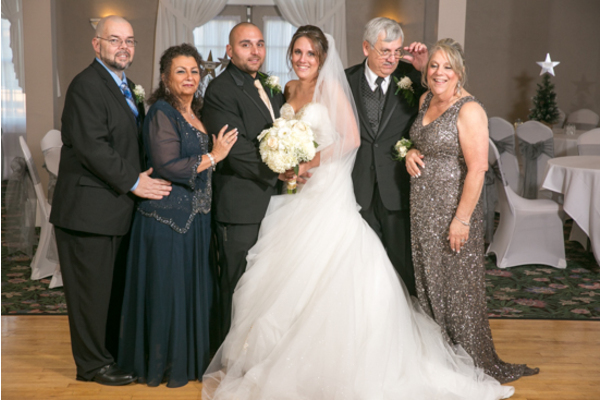 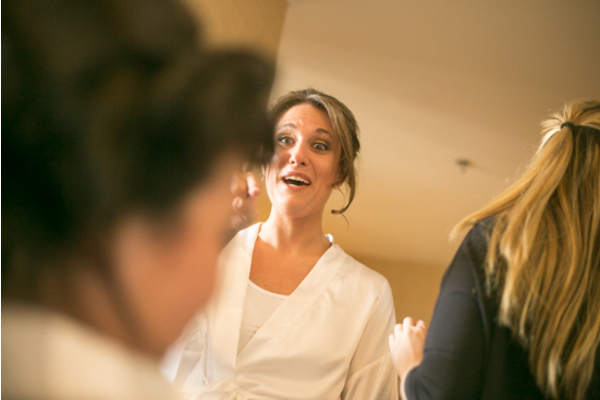 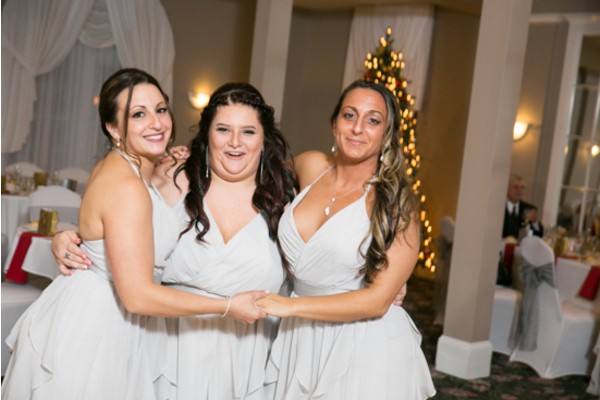 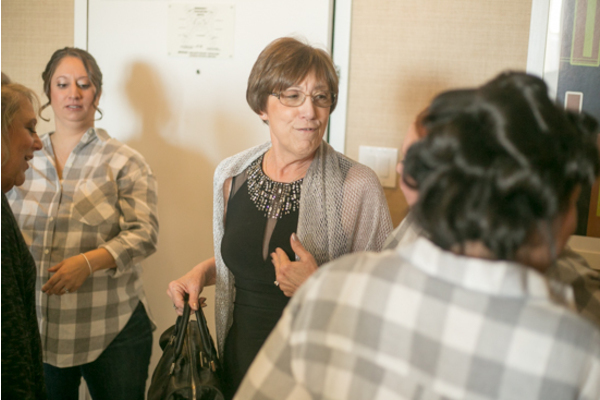 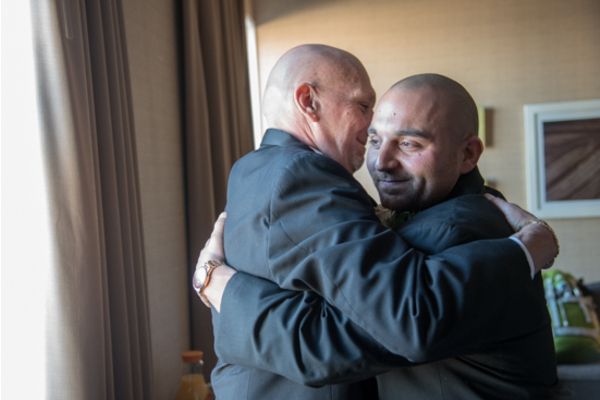 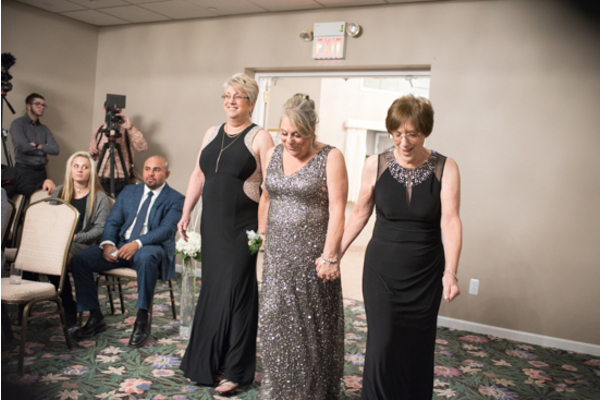 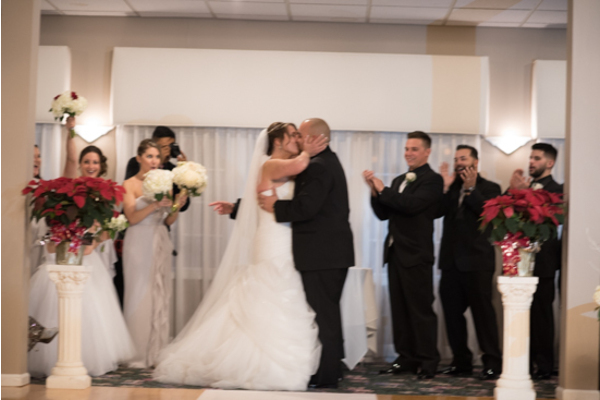 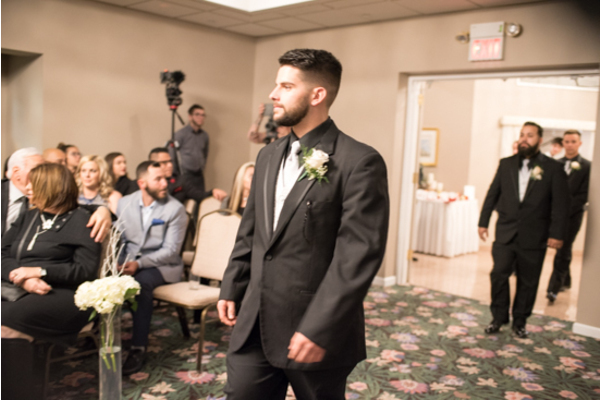 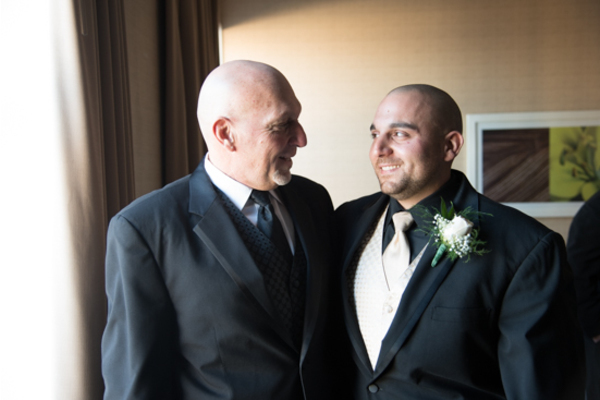 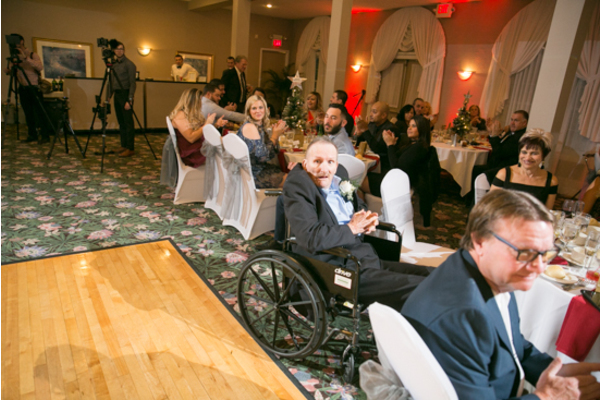 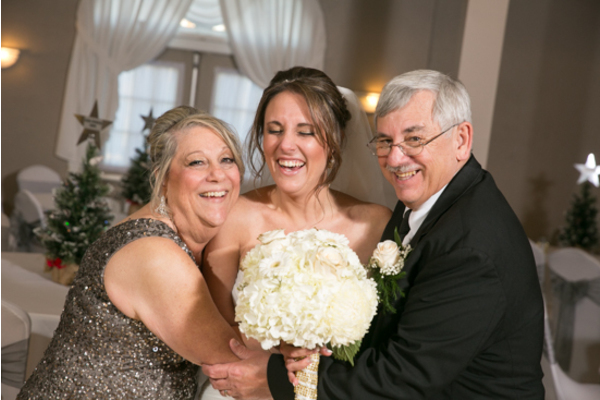 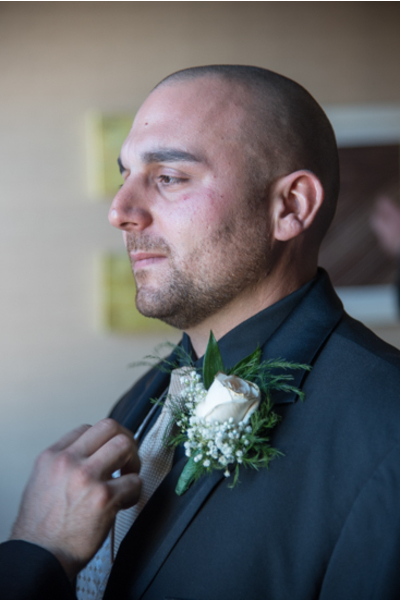 The joyful emotion from everyone in the room was captured by our talented NJ Wedding Photographer. 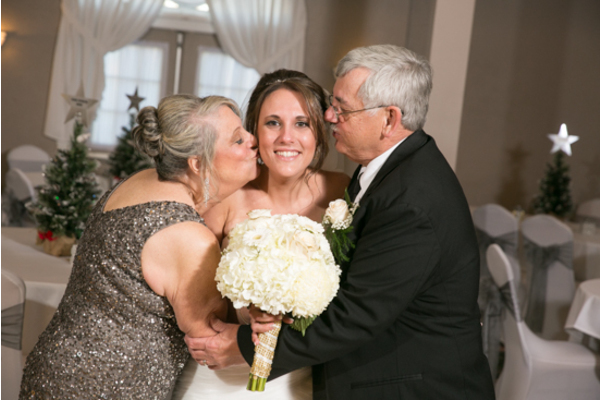 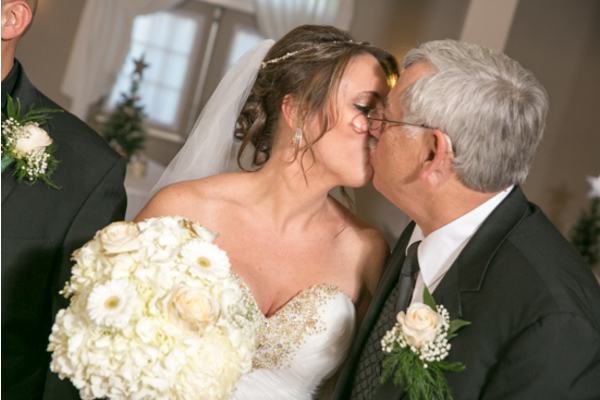 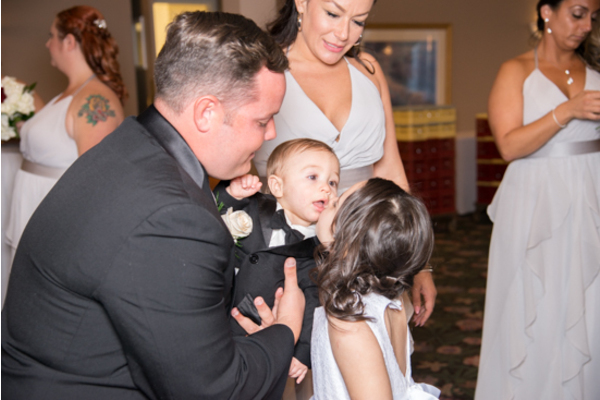 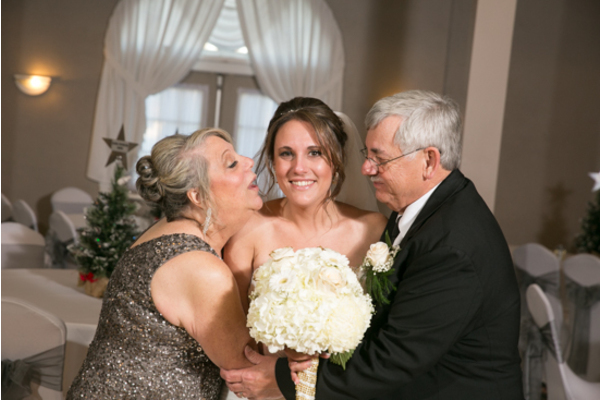 Joseph kissed his bride and guests were led in to enjoy the rest of the night at the reception! 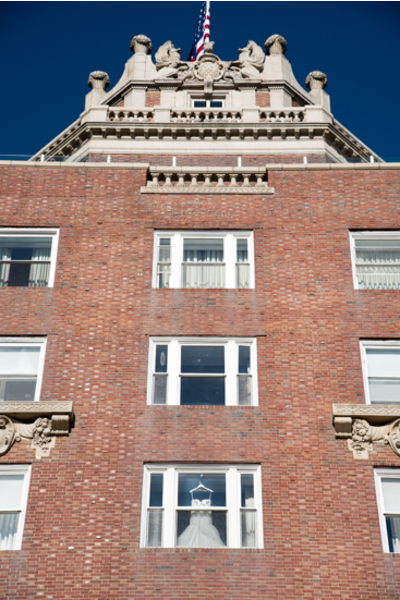 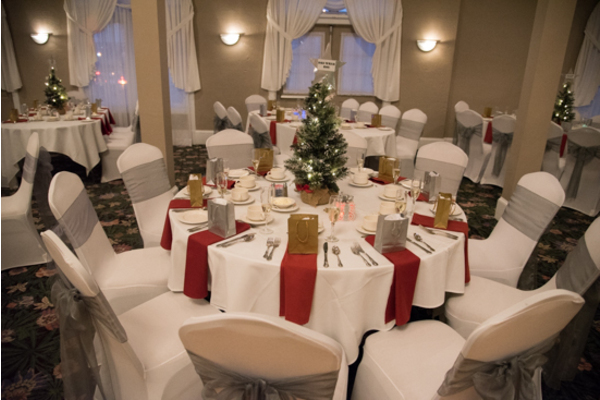 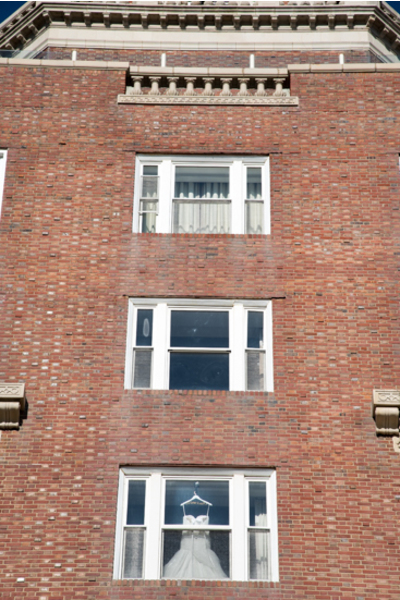 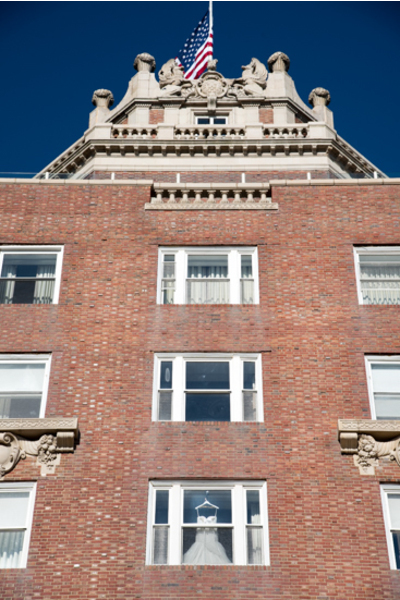 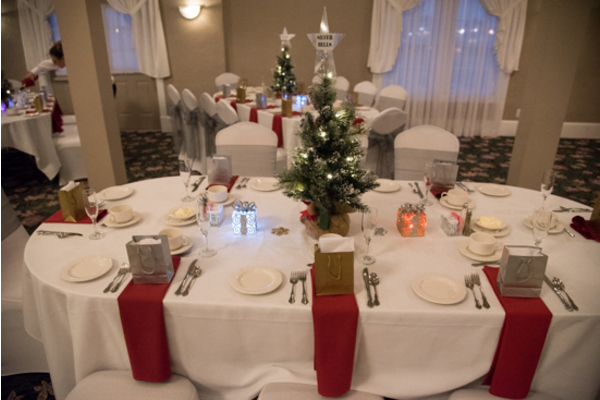 The room was decorated with Christmas lights, trees, and all of the beautiful colors of the holiday season. 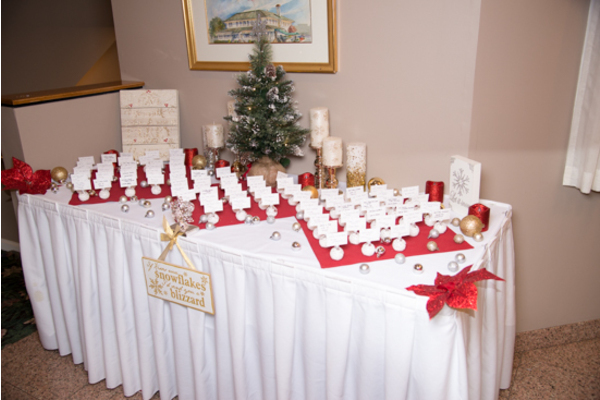 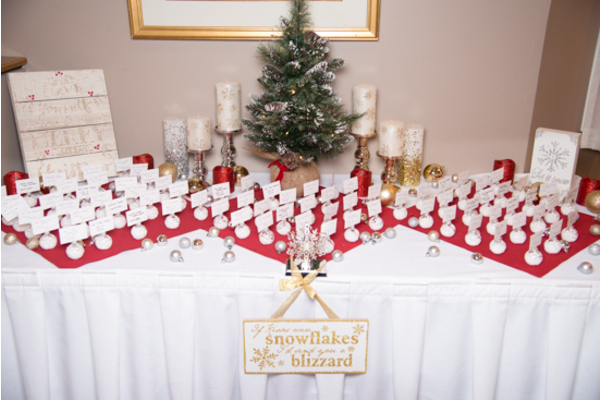 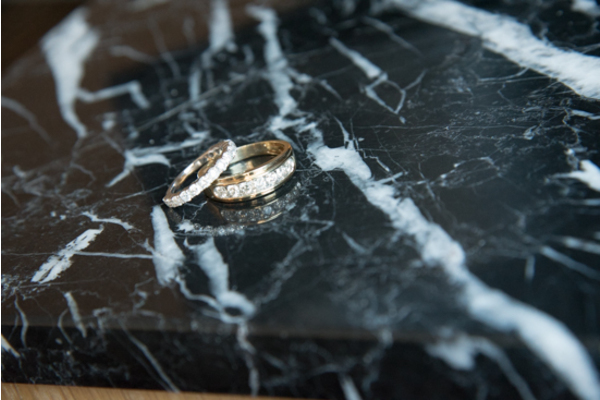 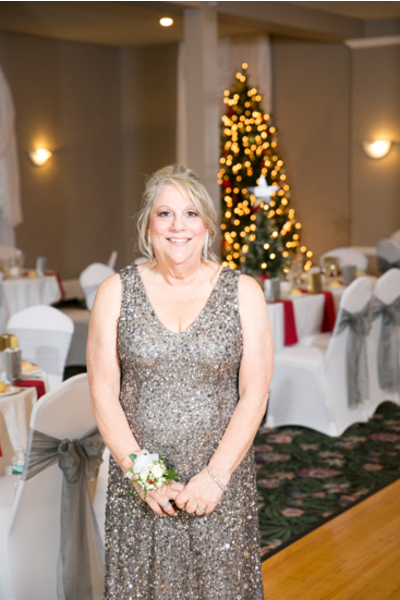 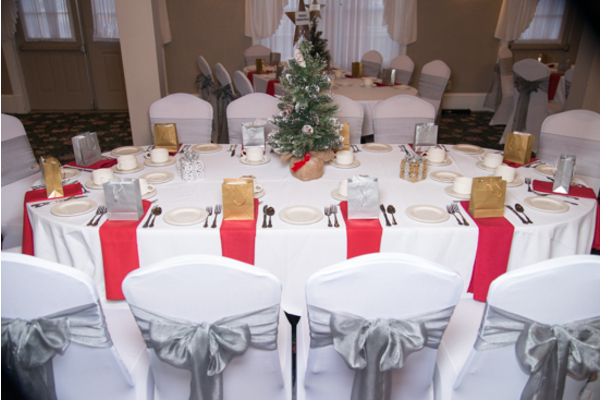 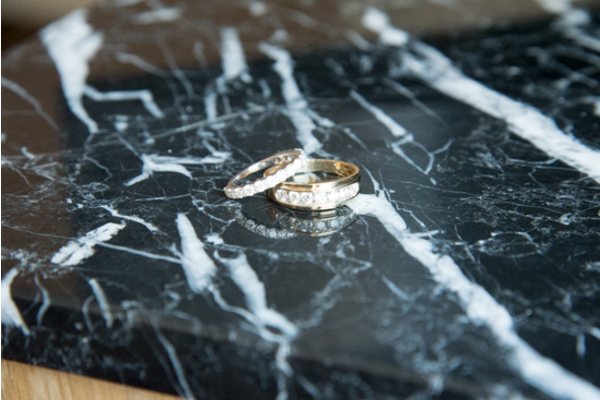 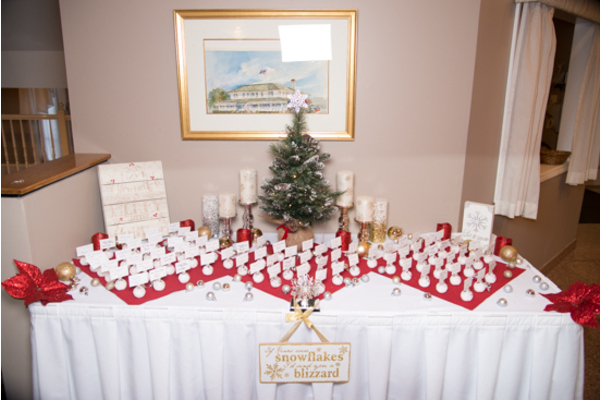 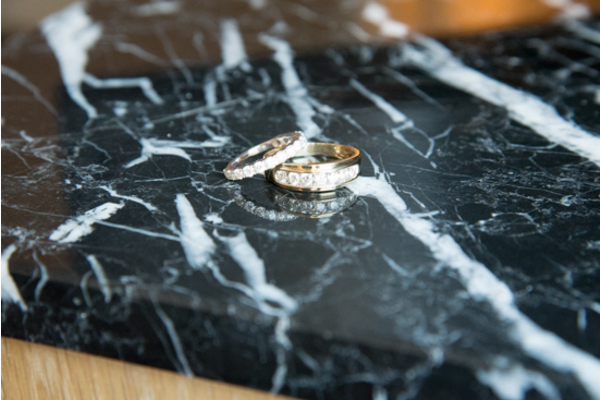 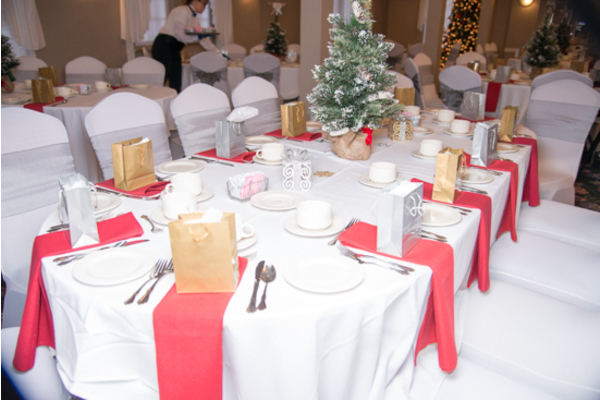 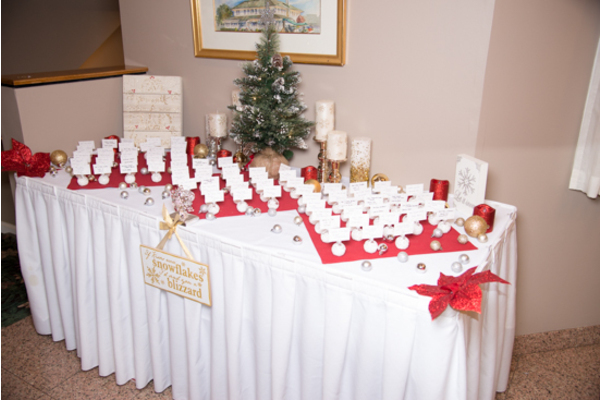 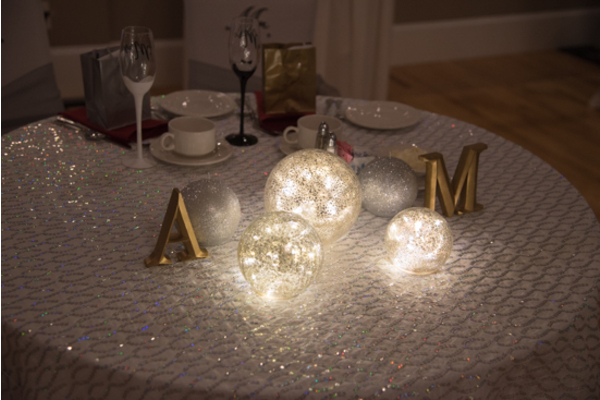 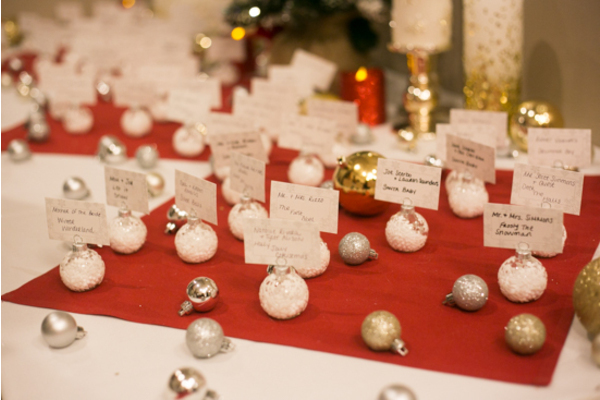 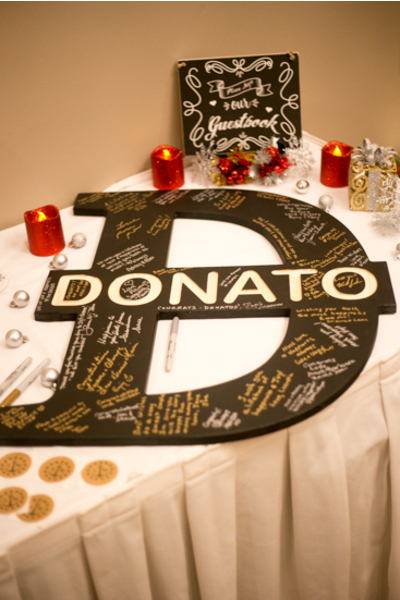 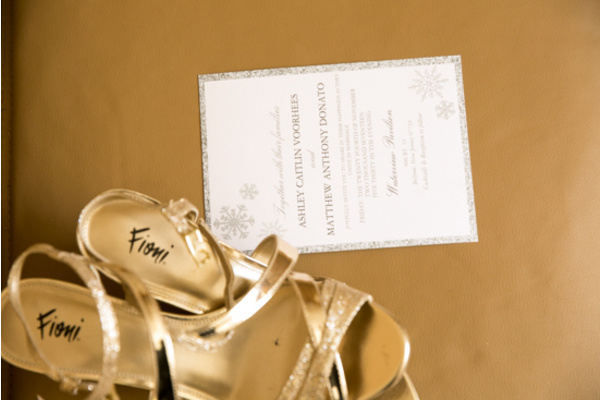 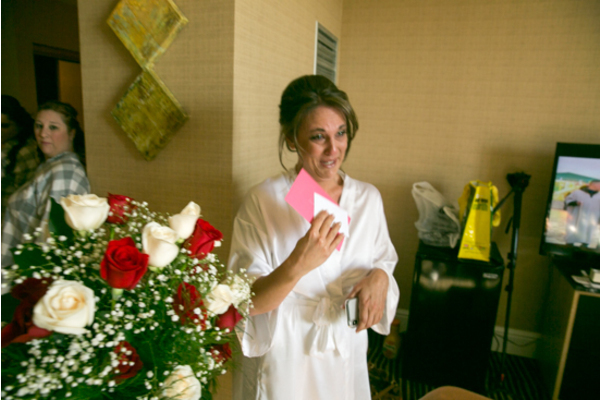 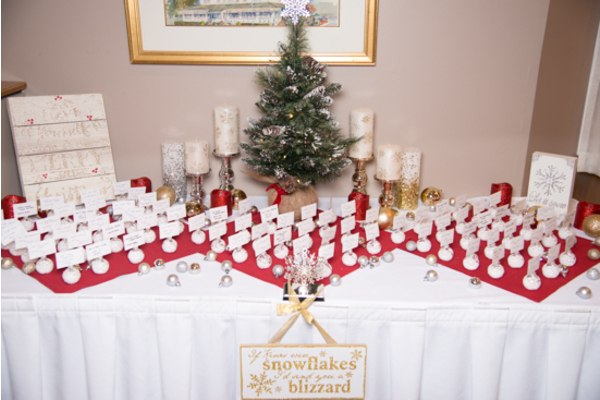 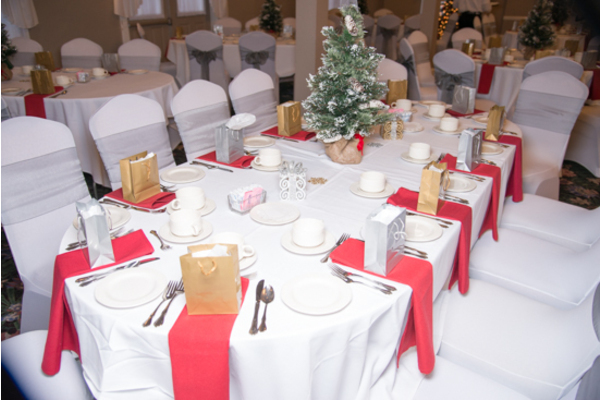 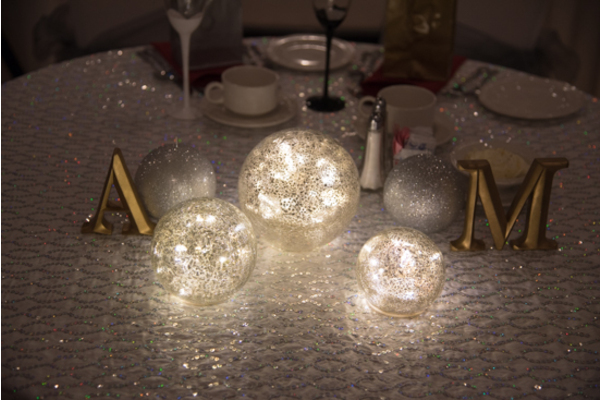 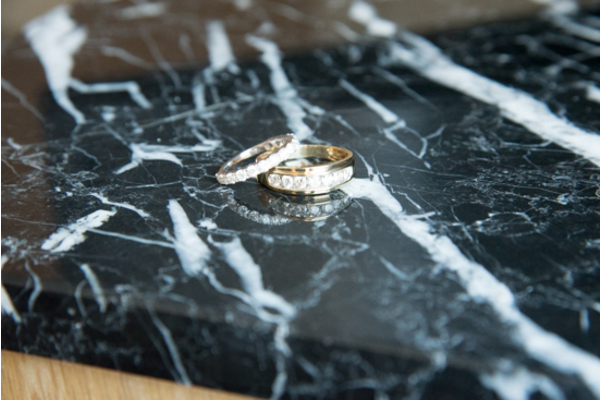 Each guest picked up silver and gold ornaments that read their table numbers. 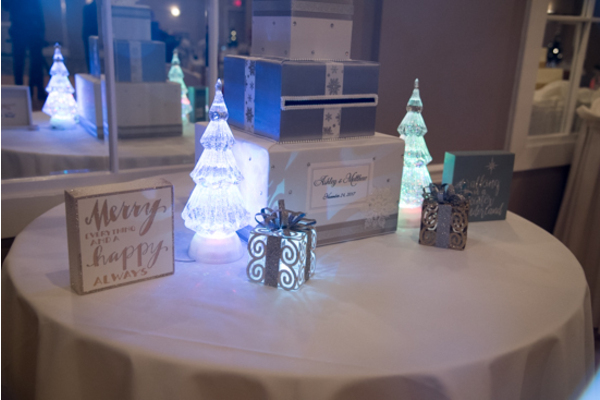 The Christmas lights were a charming touch to every photograph from the night! 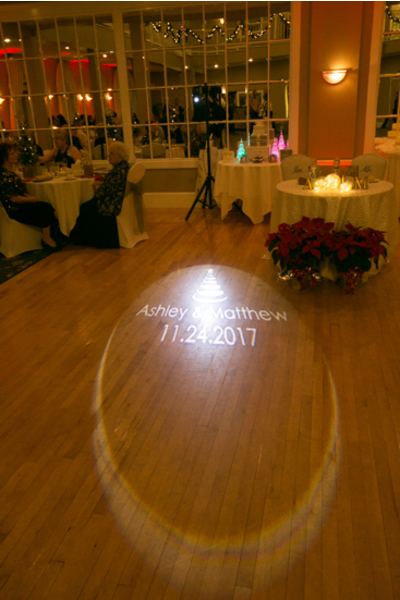 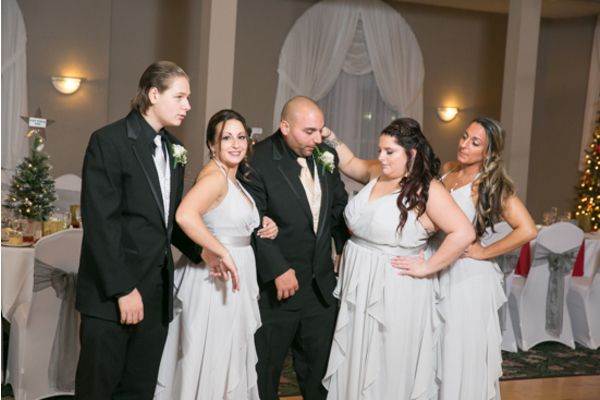 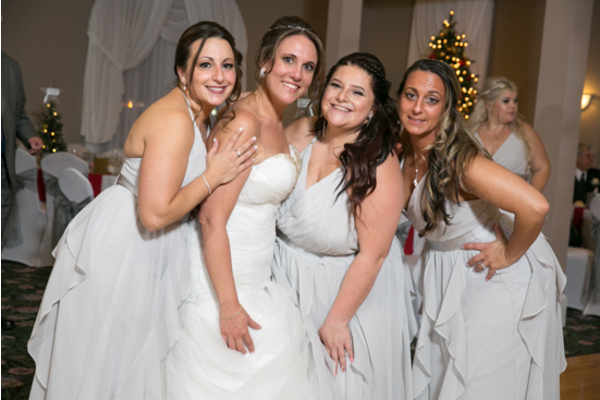 Our NJ Wedding DJ got everyone up off their feet and dancing to celebrate the next chapter for Ashley and Matt. 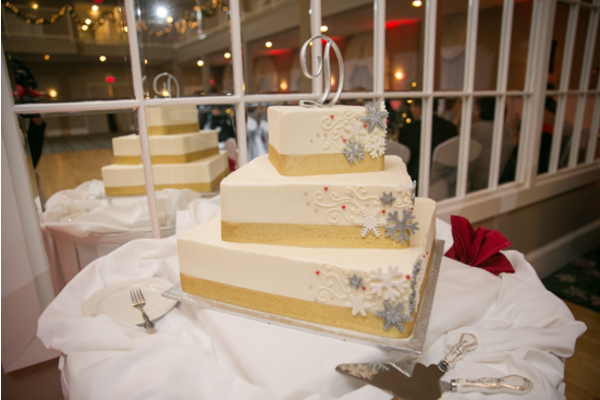 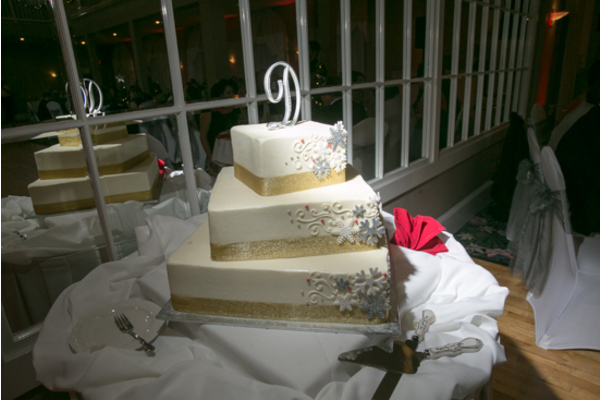 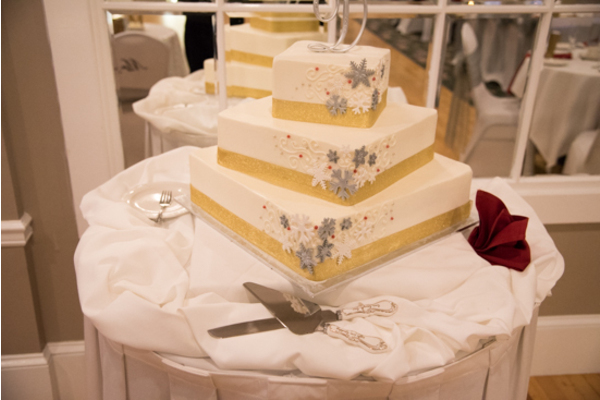 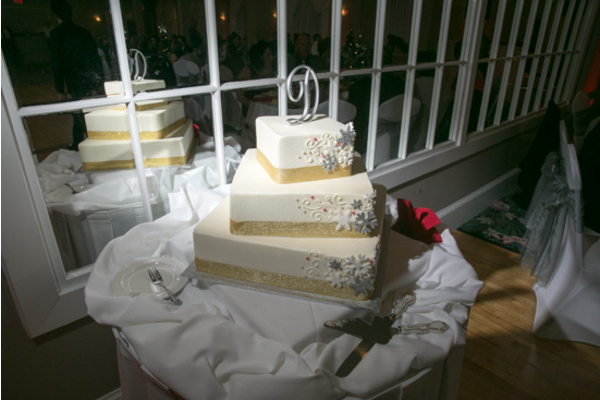 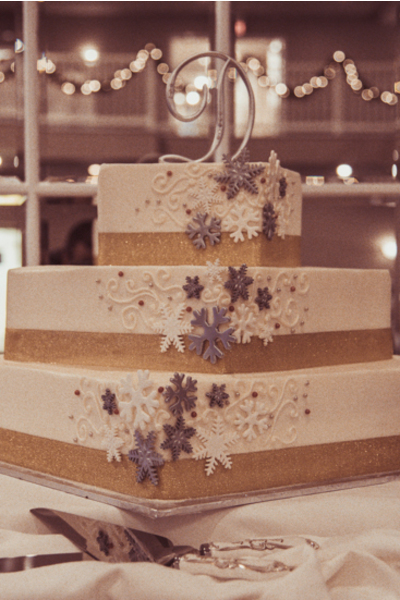 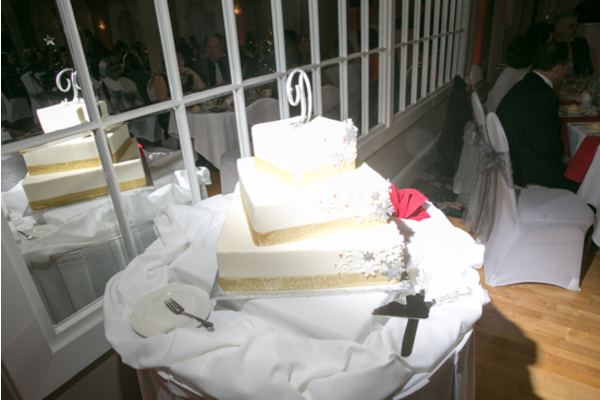 The night came to an end with Ashley and Matt cutting into their snowflake wedding cake! 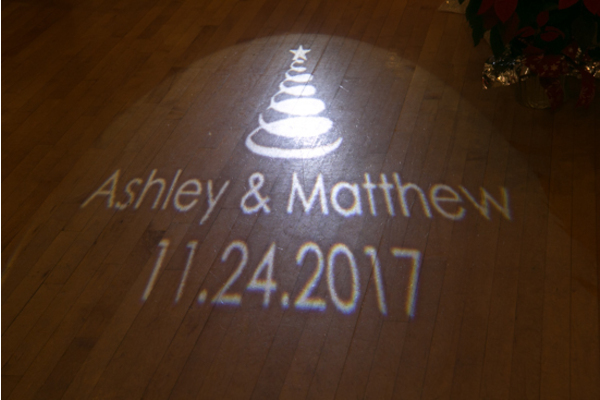 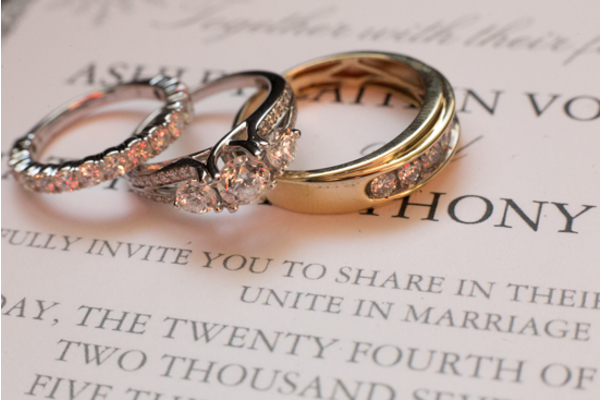 Congratulations, again, to Ashley and Matt. 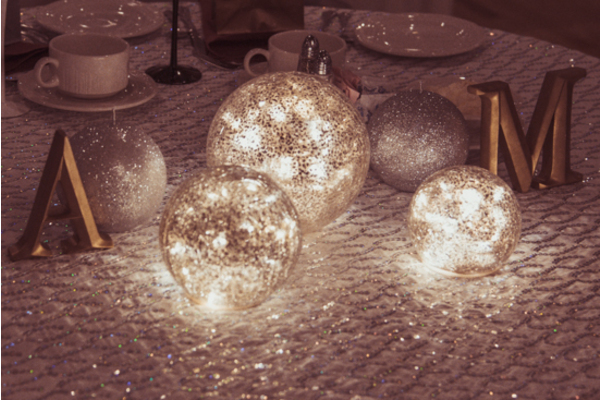 Here’s to the joy and magic of Christmas all year round for the both of you!